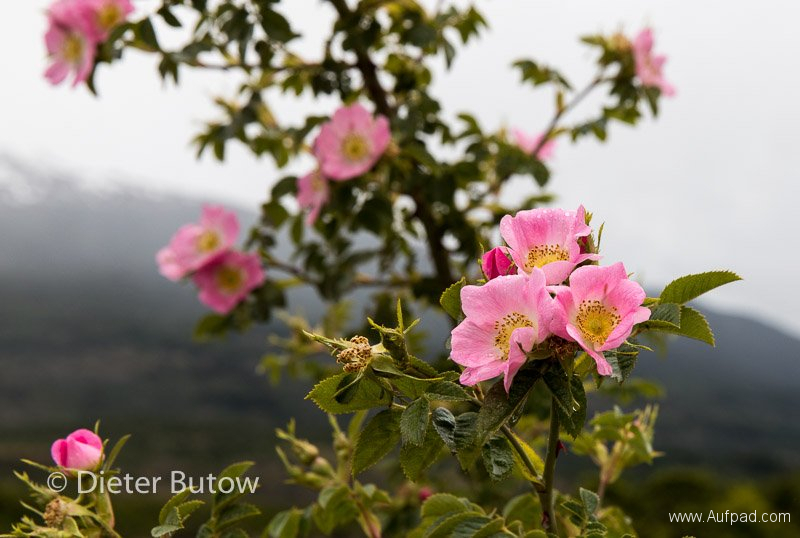 We started early, keen to get better photos of Cerro Castillo –but the mist and rain foiled our attempt. 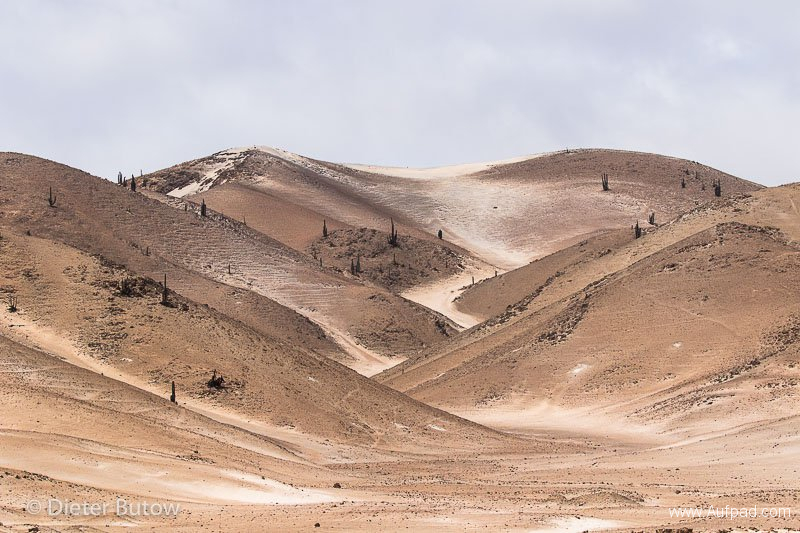 We continued further down Ruta 7, past Volcano Hudson (2500m), a lot of damage to the trees from the last eruption was evident. 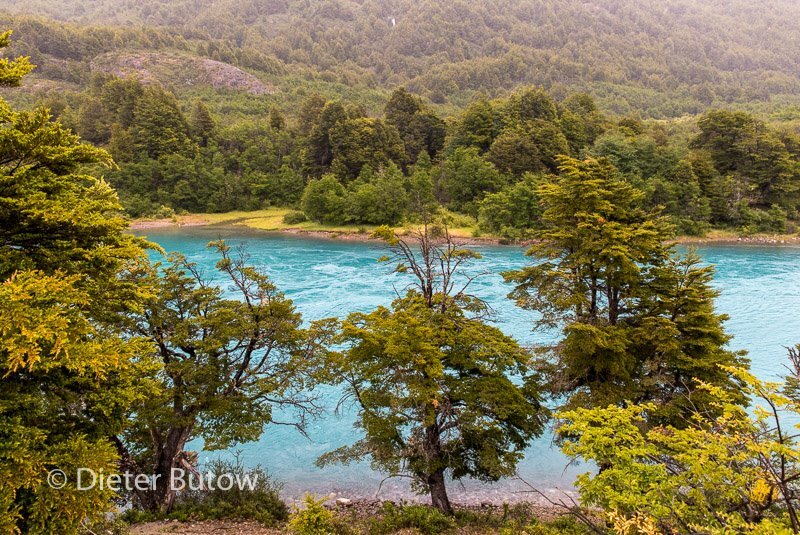 Rio Murta was beautiful, Lago General Carrera further on presented itself in a turquoise colour enhanced by the grey clouds and rain. 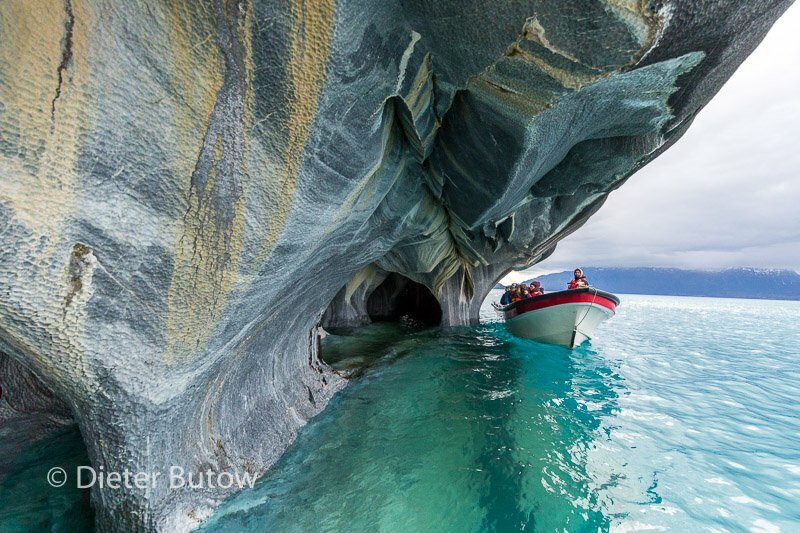 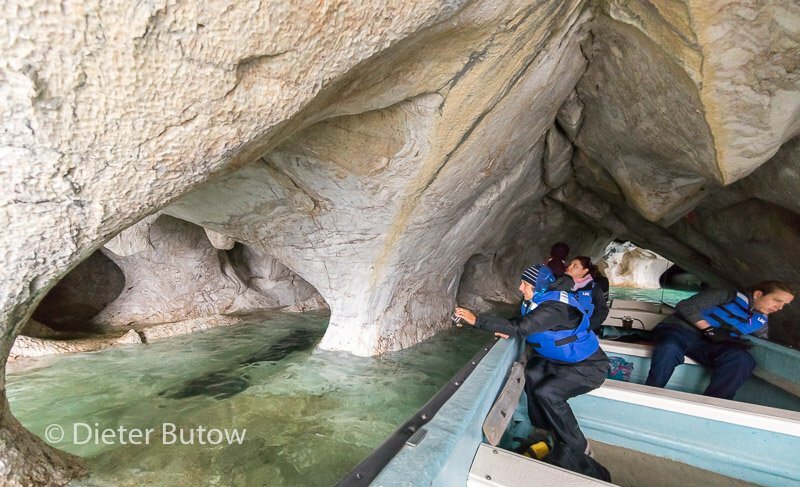 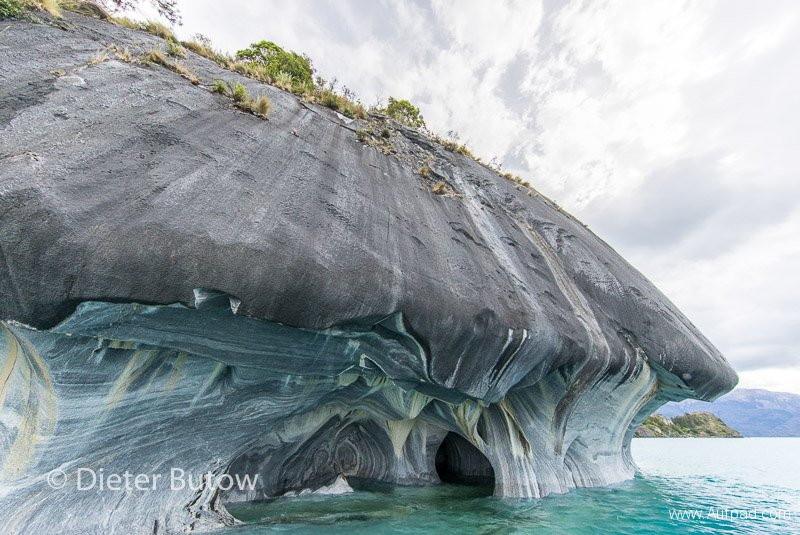 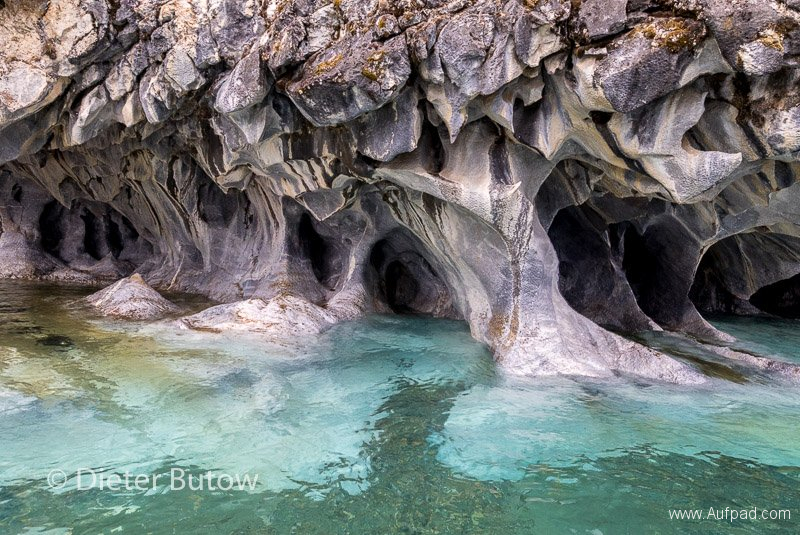 We crossed at Puerto Murta and ended at Puerto Sanchez – one place from which tours to the marble caves can be done by boat. However, Pto Sanchez was quiet and deserted, the route scenic, but we drove back to see what tours and camping we could find at Tranquilo, a little village making its living from the marble caves. 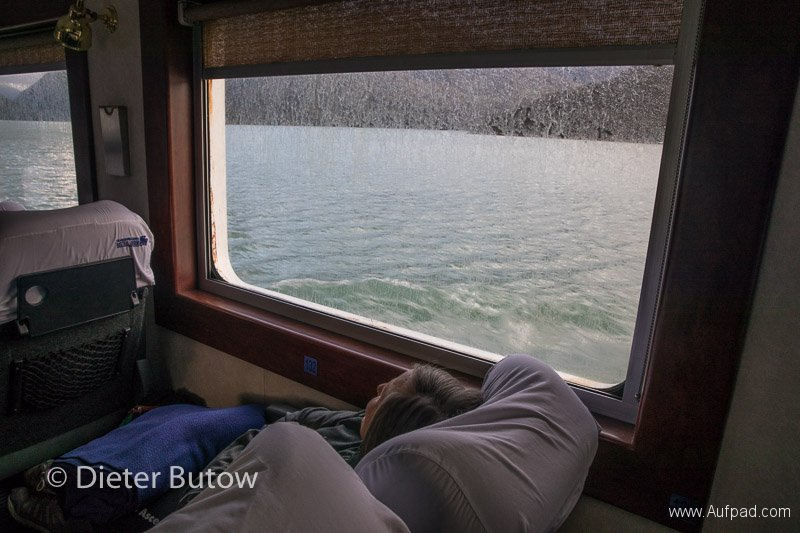 For the night we camped at Camping Pudu on Lago Gen.Carrera for P8000 pP and we booked a boat tour for the next morning for P10000 pP and hoped for acceptable weather. 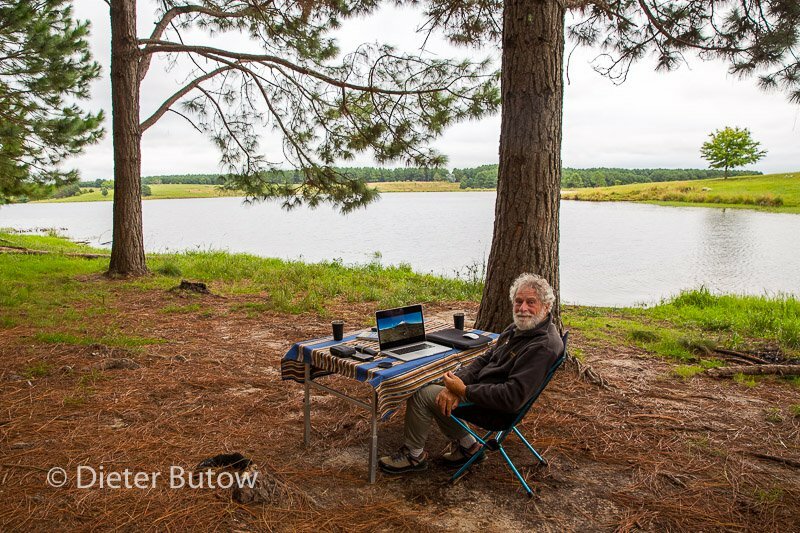 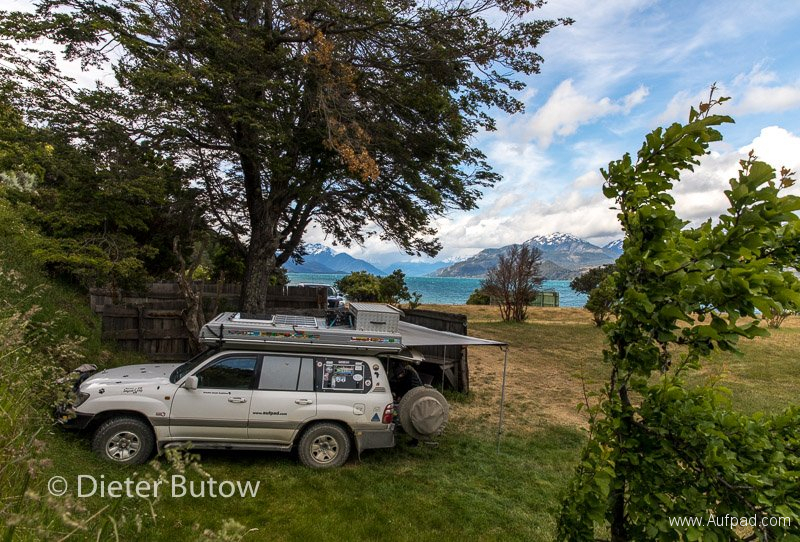 At the campsite there were decent shelters from the incessant winds and intermittent rain as well as good ablutions – we opened the awning and enjoyed a good glass of wine with our camping neighbor –Eric from Utah – the cold evening persuaded us to creep in early. 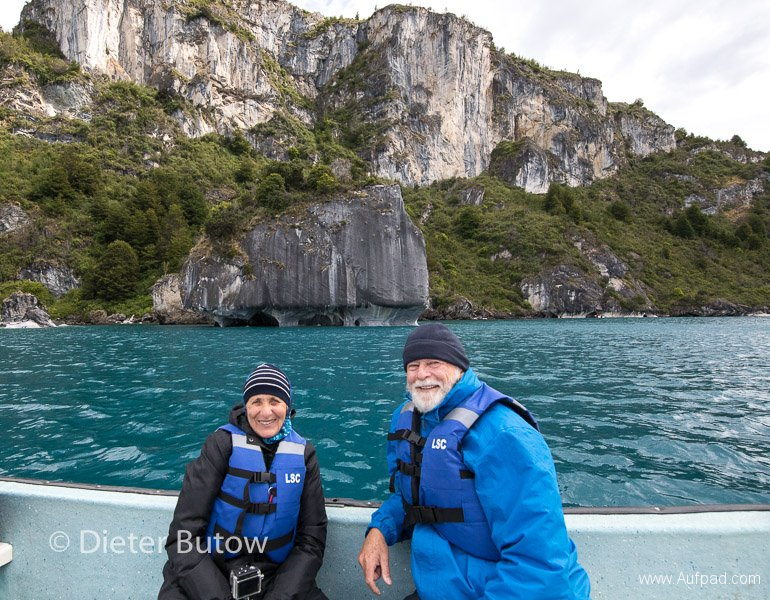 At 9:00am the next morning we left by boat with guide Daniel and captain Ignatius and two other tourists towards the Catedrales de Marmol and the Cavernas, an hour round trip. 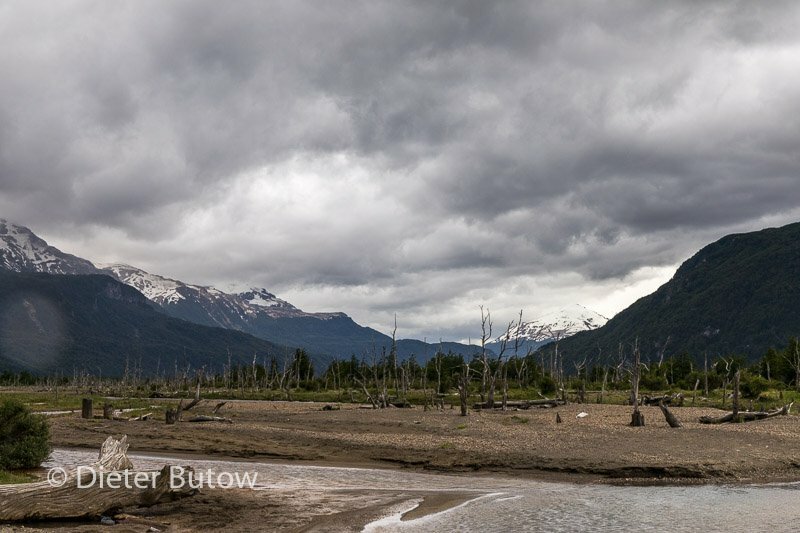 It was overcast, not sunny and we knew that photographing on this excursion would be a real challenge. Lago Carrera nevertheless was a lovely turquoise colour, in sunshine it must be extraordinary. 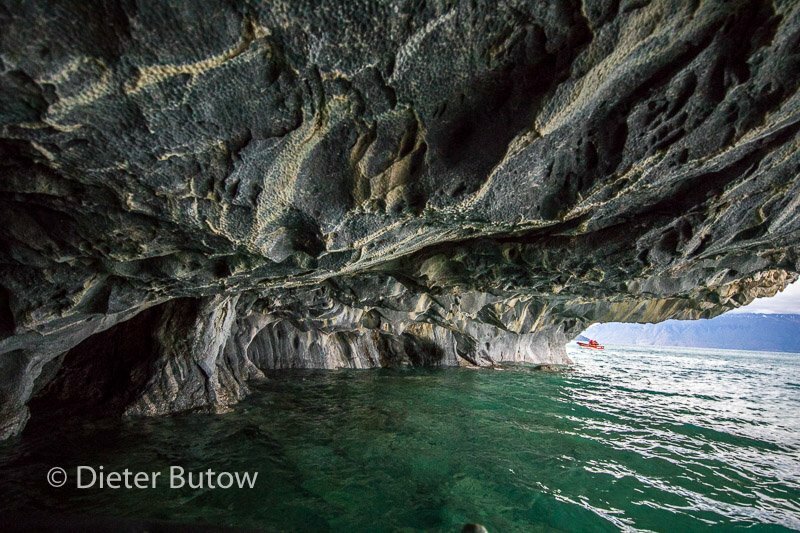 Despite the wind we found the caverns to be quite sheltered and the boat could enter some of them. 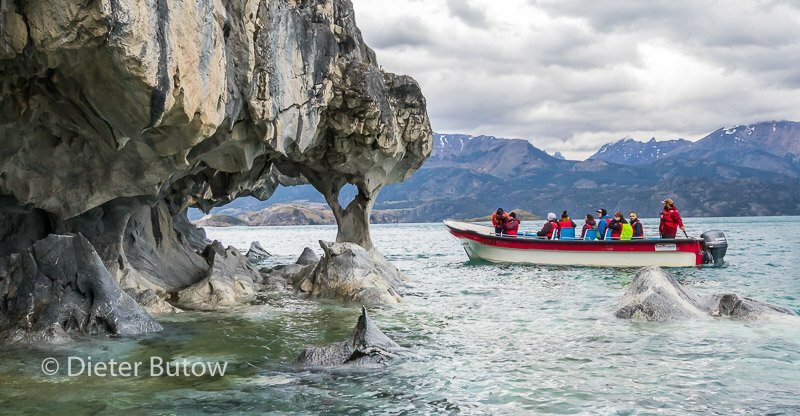 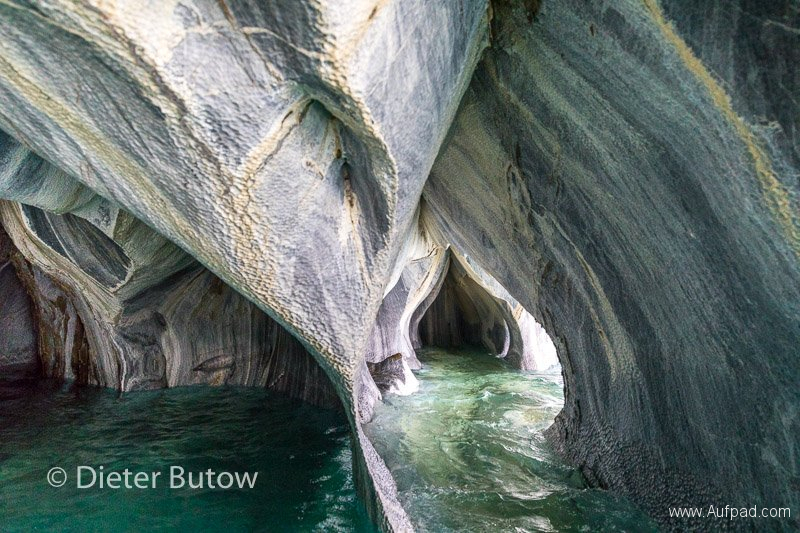 Even though the weather was a challenge we found this excursion very worthwhile doing – only afterwards we found out that a 2 hour trip was also possible giving more time to photographers (we also learned that to photograph the caves is better in winter when the lago’s level is lower). 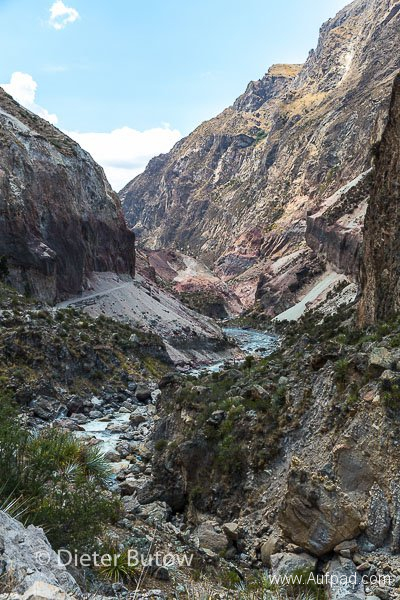 Next stop was the Valle Exploradores with a glacier that used to come right down to the road. 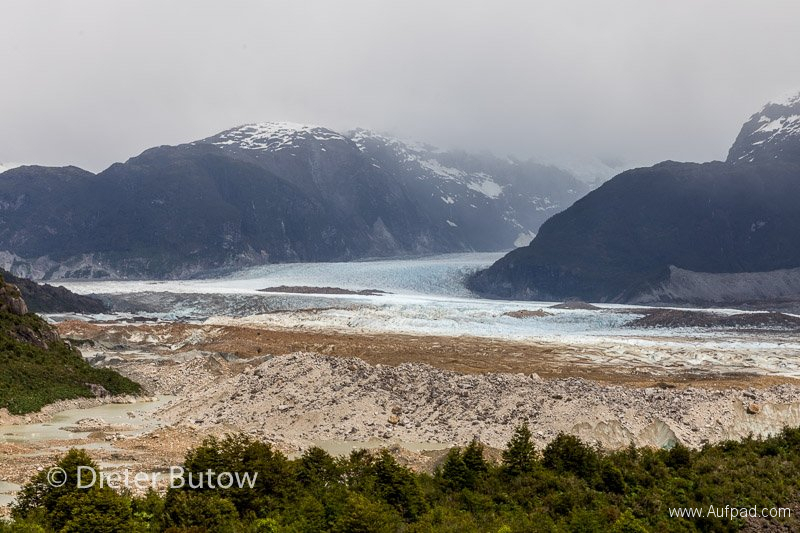 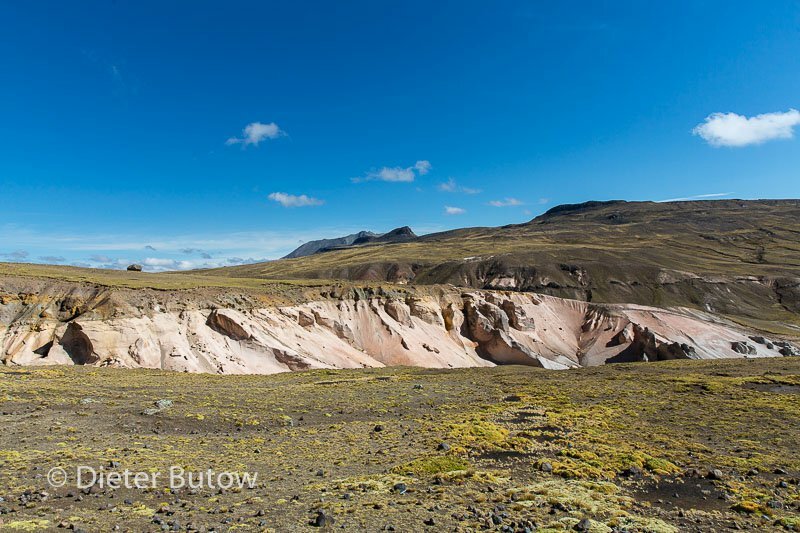 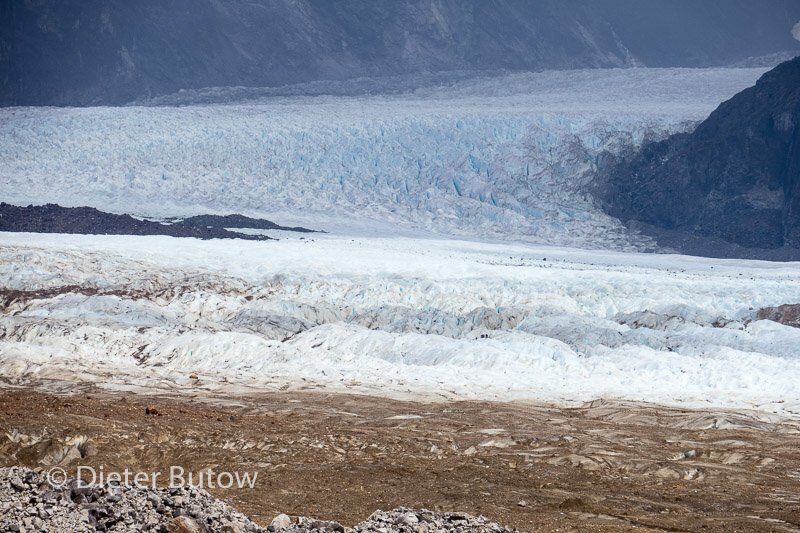 By now it has receded a few km inland and we trailed up to the viewpoint to have a look, getting a good idea of the rocks, gravel and grit that a glacier pushes up. 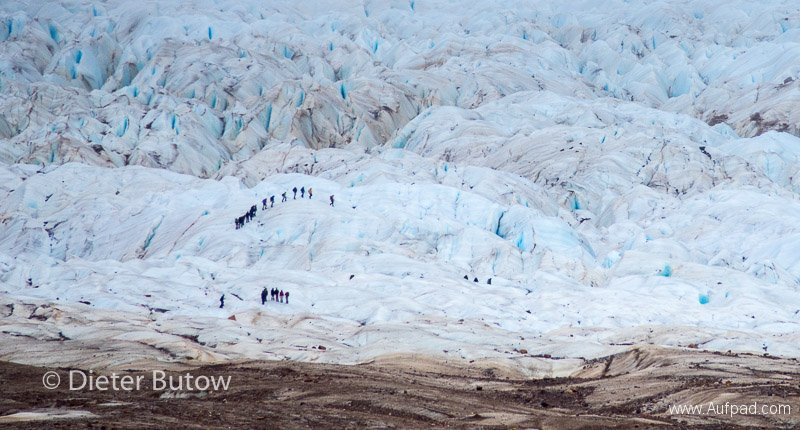 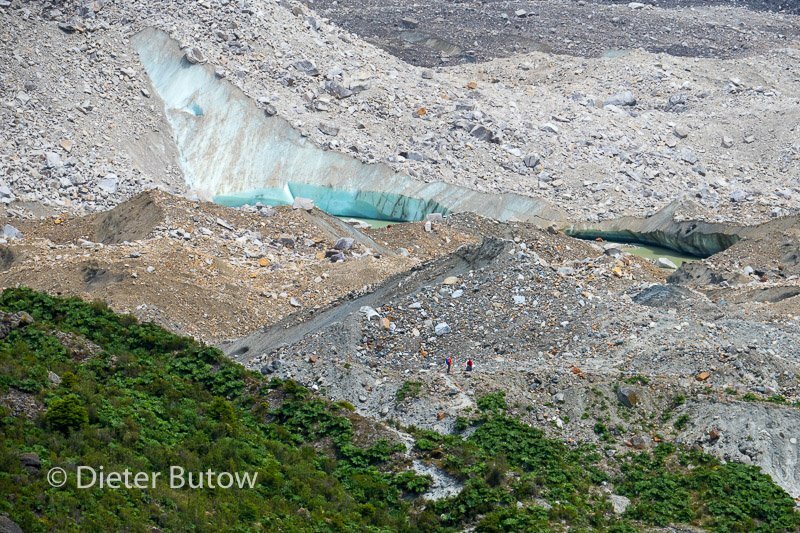 With guided tours it is possible to walk into the glacier. 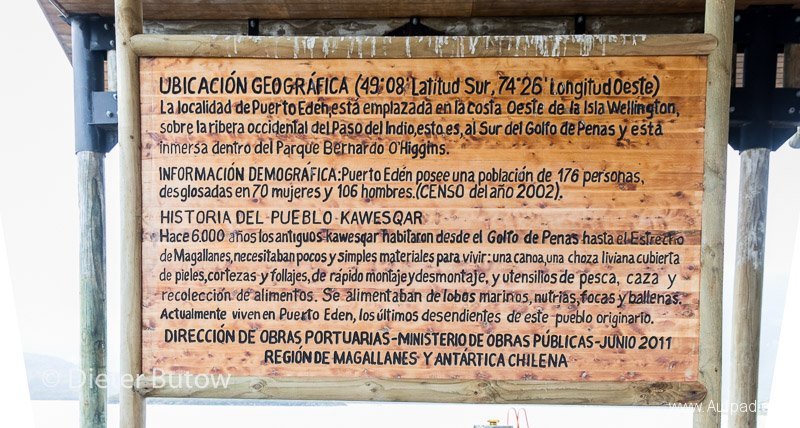 About 8km before Glaciar Exploradores we had lunch at the Hostal Campo Alacaluf established by the German couple Thomas and Katrin with their little daughter Daniela some 20 years ago – this was unexpected in such a remote place. 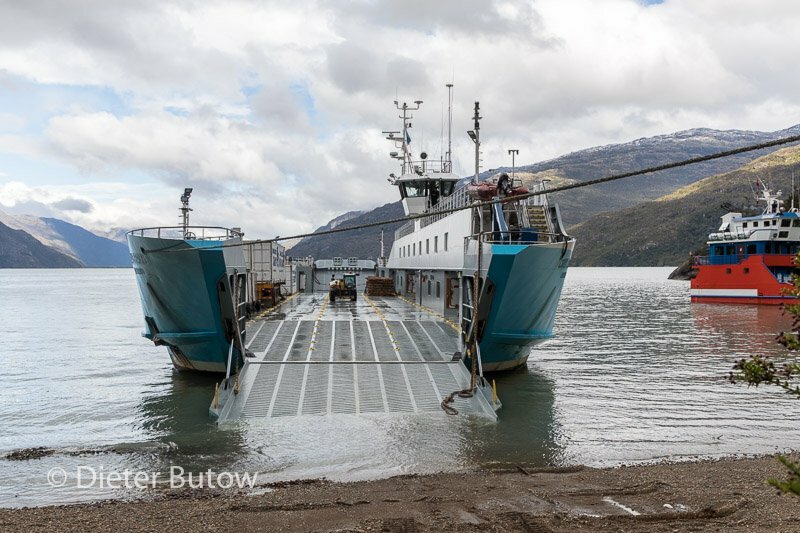 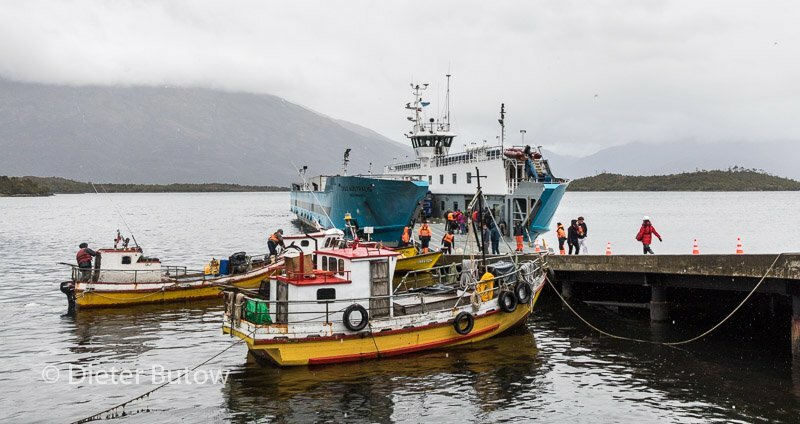 According to Katrin it is possible to drive further on to the town Bahia Exploradores and to catch a smaller boat from there to visit Glacier San Rafael – these must have been the boats we had seen on our trip to the glaciar a few days before. 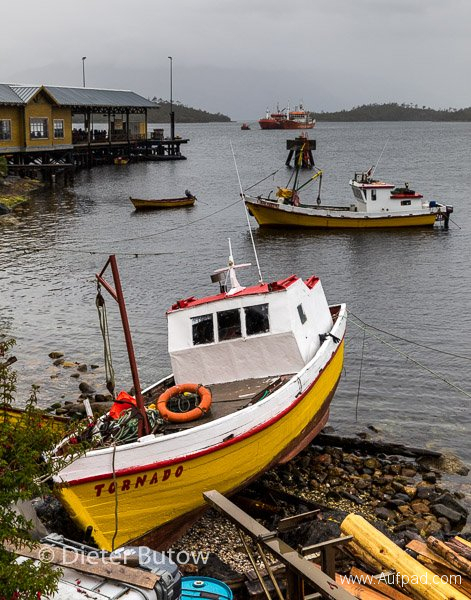 Booking can only be done 24hrs ahead from Puerto Tranquilo and not at the Bahia (costs do not seem to be that much lower than the expensive catamaran we had taken, but we could not confirm actual rates). 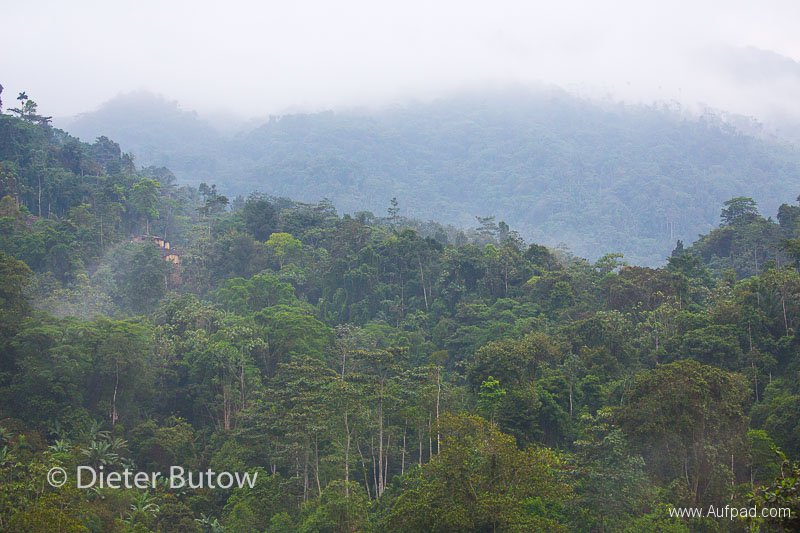 We spend the night again at camping Pudu. Our route took us along Lago Bertrand to Puerto Bertrand, the origin of Rio Baker. 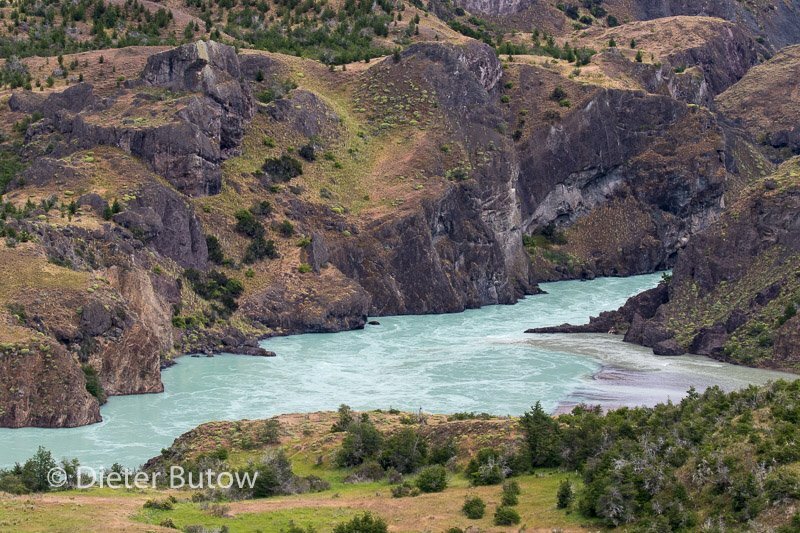 This must be the bluest river in the world. Flowing out of Lago Bertrand, the Rio Baker carries 900m3/sec of clear, turquoise-blue water until it drops down a small waterfall ( 1km to walk to the mirador) where it joins up with the glaciar-milky Rio Nef, whereafter the colour is no longer that dramatic, but the landscape is. 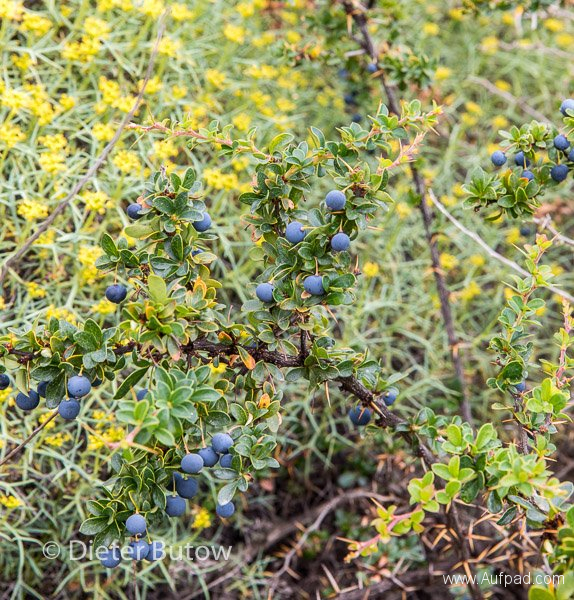 Along the way we enjoyed the edible Calafate berries that were ripe and sweet this time of the year. 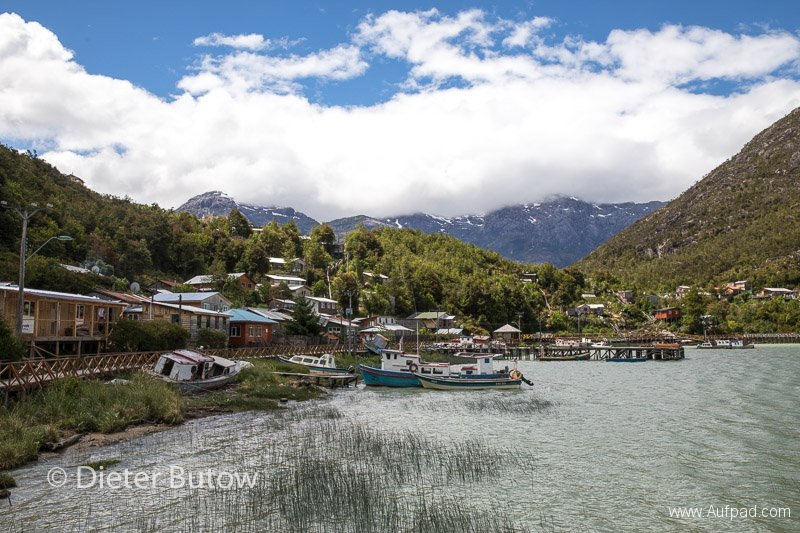 In Cochrane we ended up having a very good lunch at Doña Ada together with Reinhard Schneider and a colleague from the German embassy in Santiago, whom we already had met the previous day. The fillet steak was outstanding and it was one of the rare occasions where we were asked how we would like the steak – normally it is served well-done and that is it in South America. 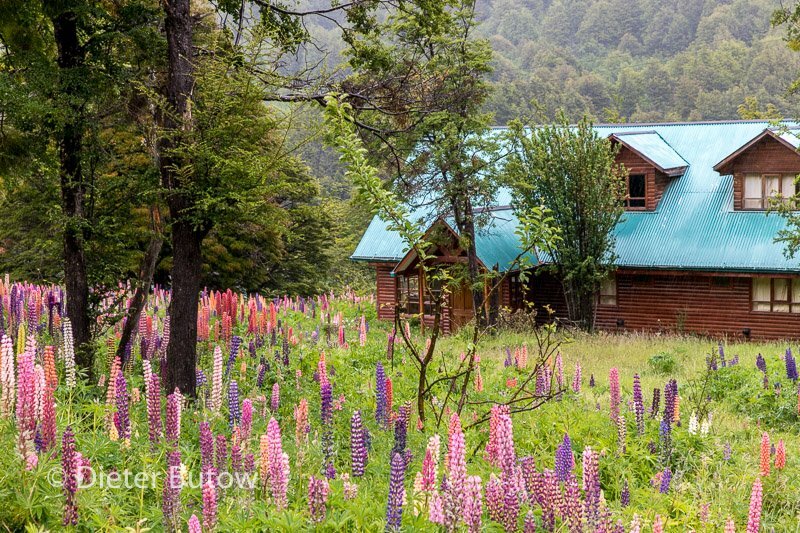 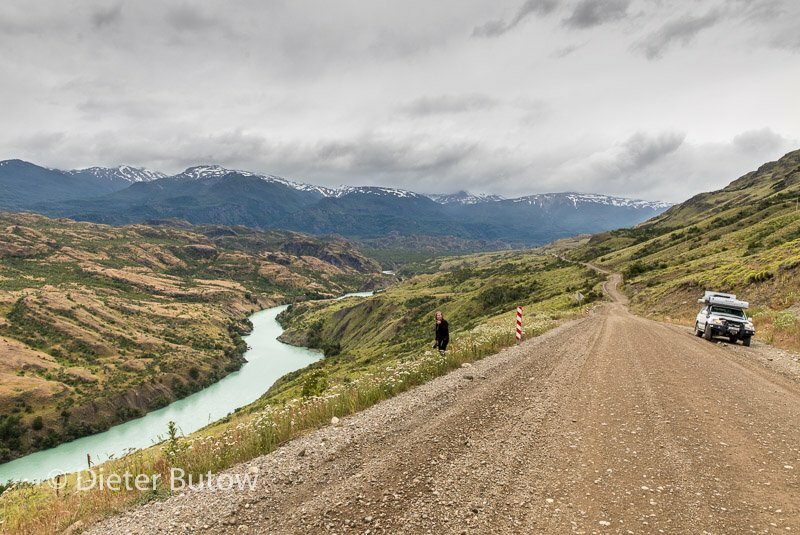 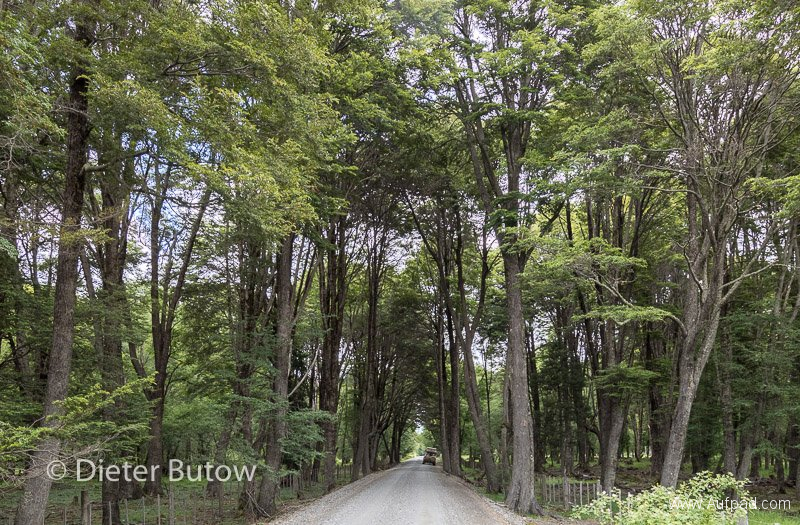 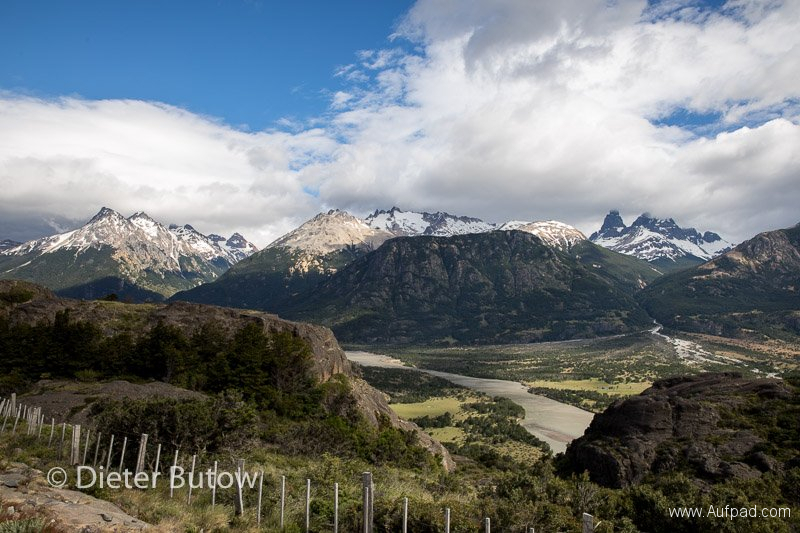 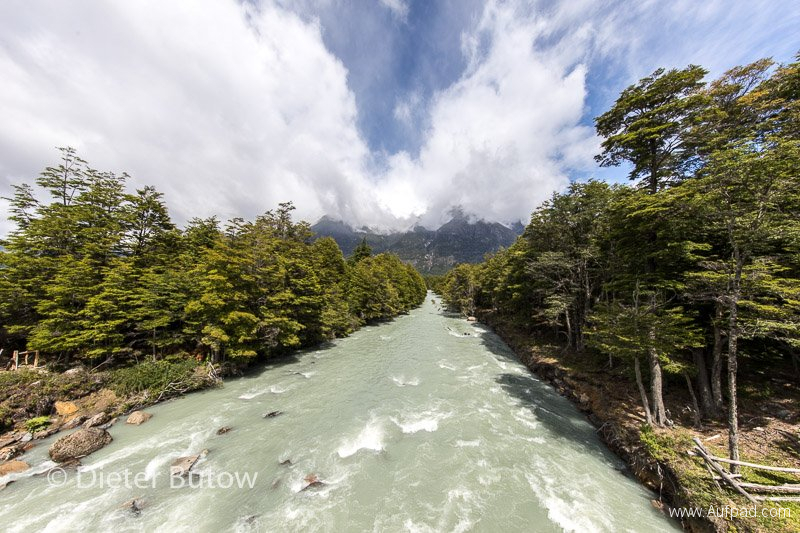 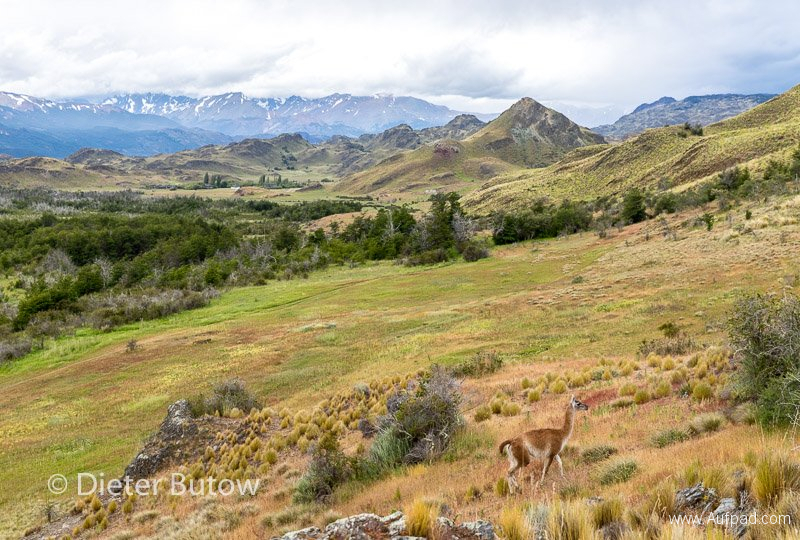 We turned back northwards to enter Parque Patagonia – another park by the Douglas Tomkins Foundation and this was where their headquarters is. 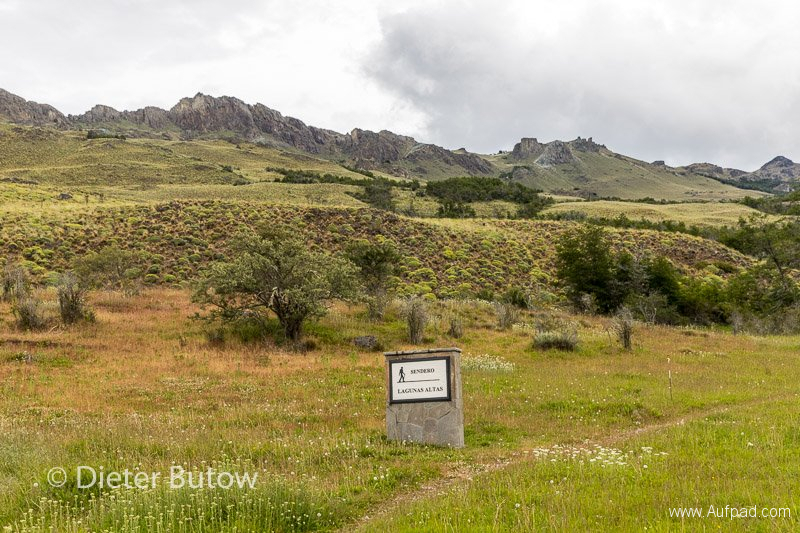 Again this park is beautifully appointed, everything in top condition and full of trails laid out and well sign-posted. 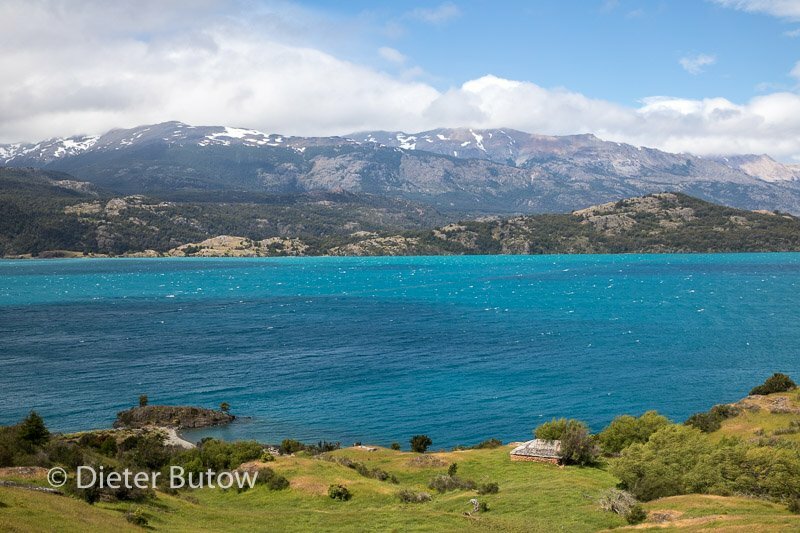 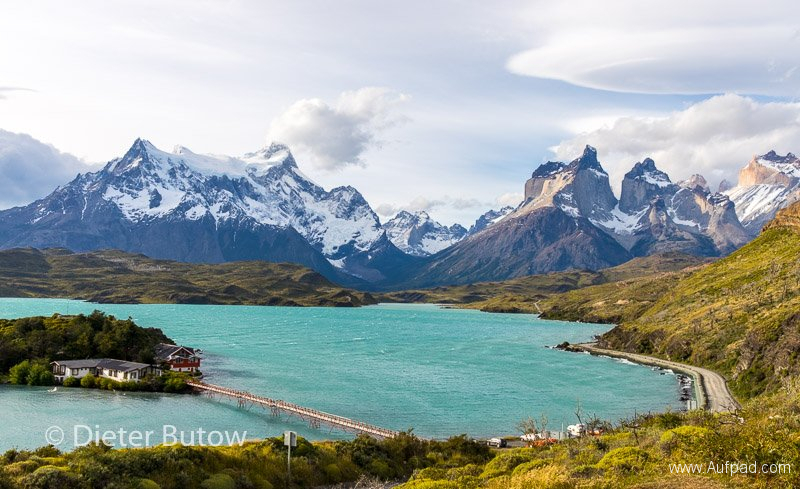 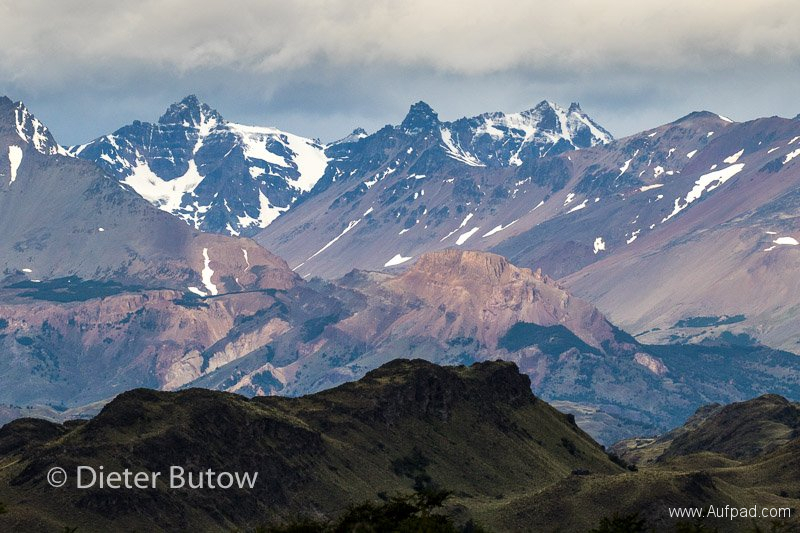 This mountainous region must be one of the most scenic Chile has to offer. 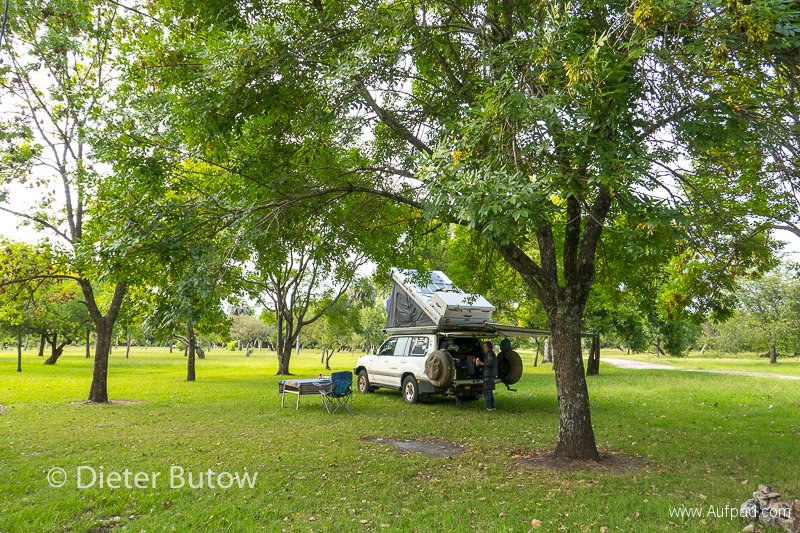 We camped on the parking area of the camping site West Winds (for tents only not vehicles), not far from the Admin buildings and hotel. 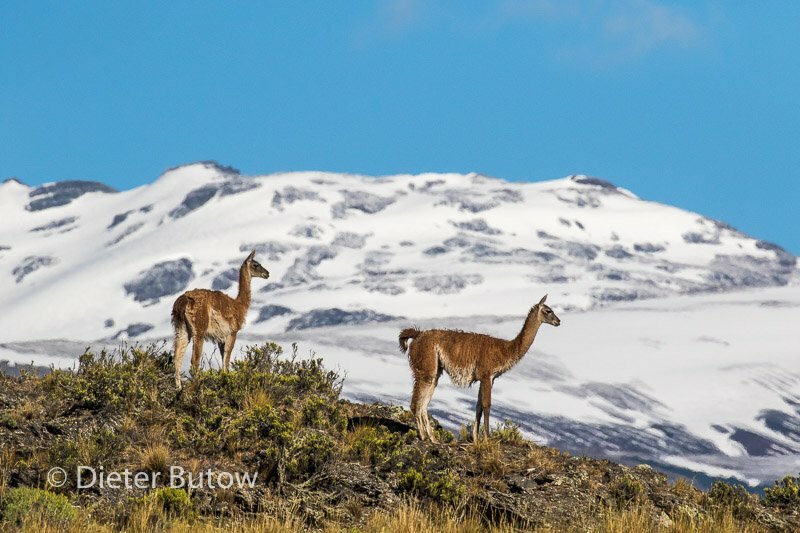 We saw plenty of guanacos, hares, parrots and Magellanic woodpeckers. 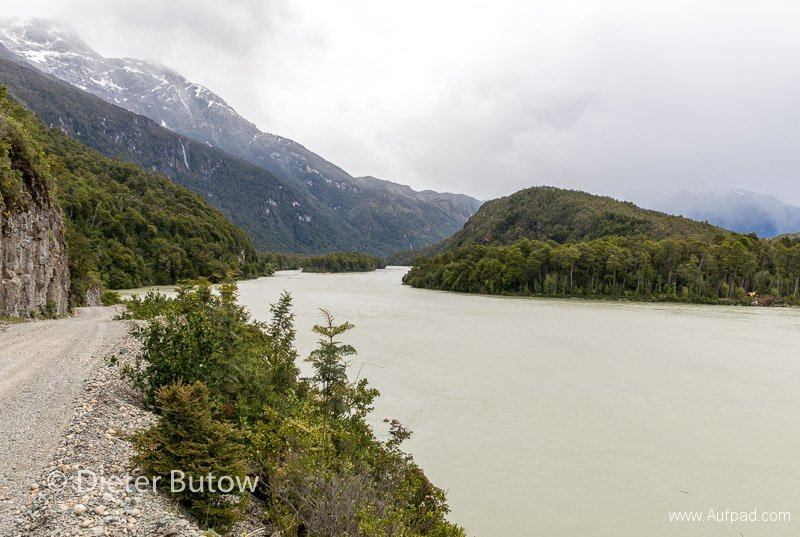 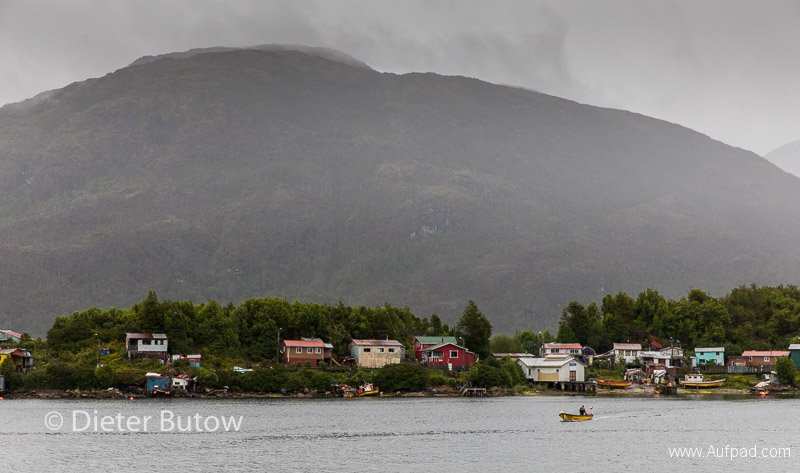 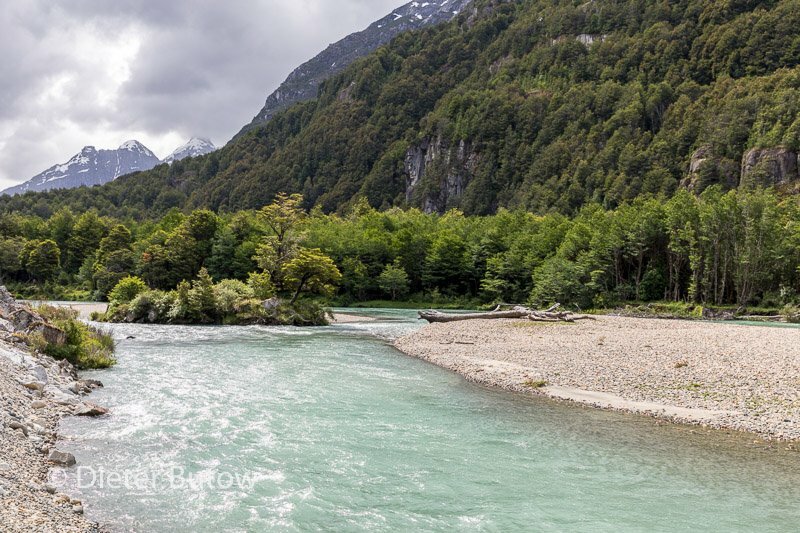 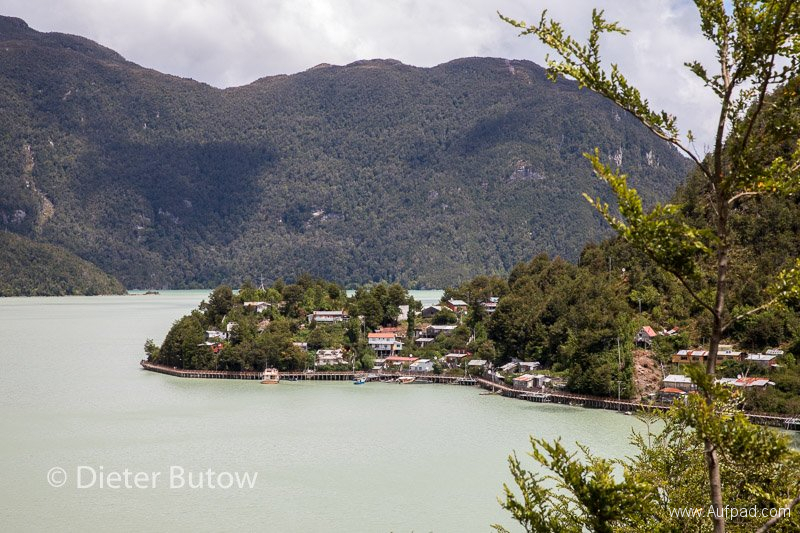 Driving further down the Carretera Austral we took a detour to the village Caleta Tortel – a town without vehicles and only wooden walkways. From here we drove to Puerto Yungay, approx. 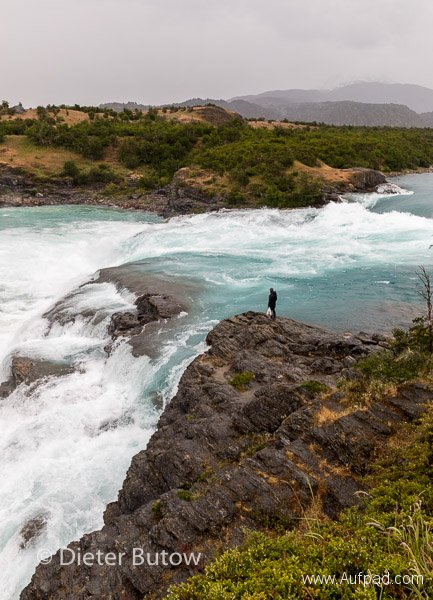 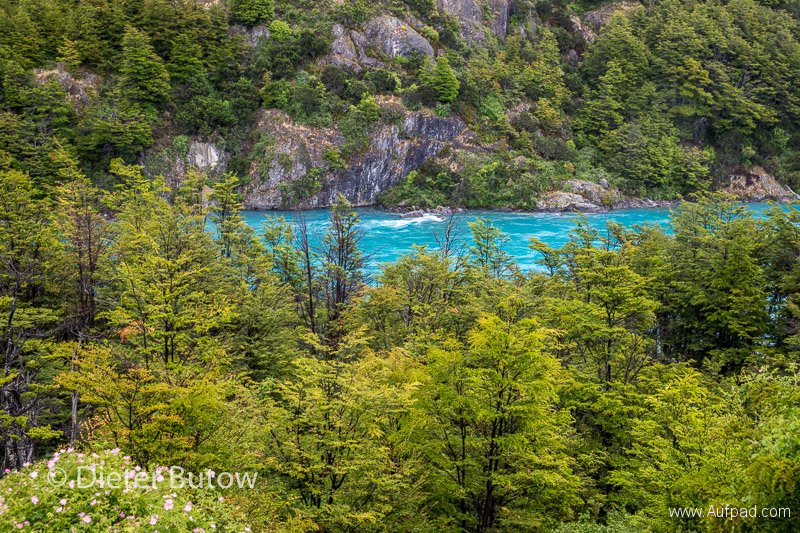 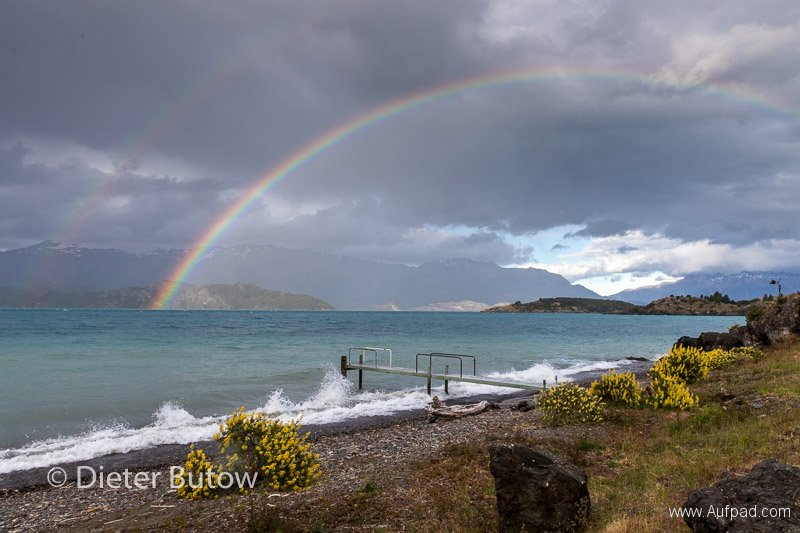 100km north of Villa O’Higgins, the end of the Carretera Austral. 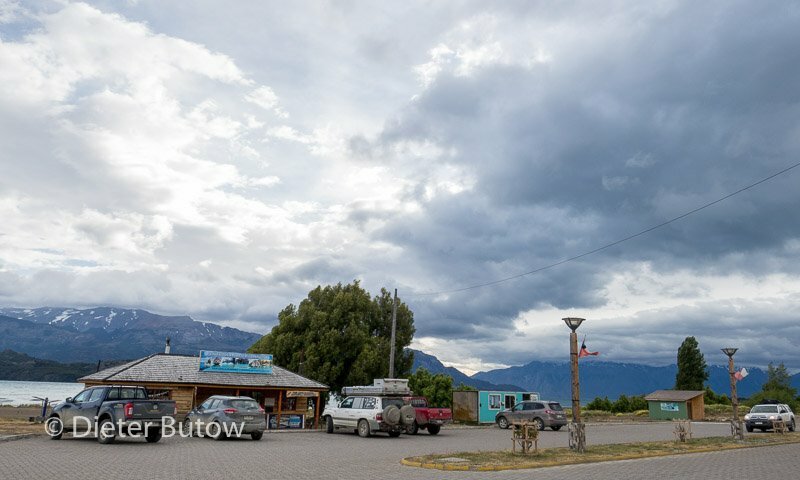 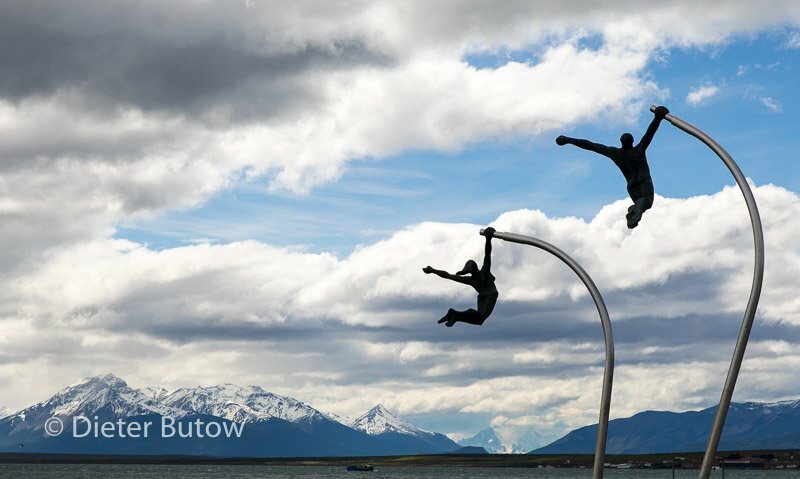 We arrived in Pto Yungay, a town of around 11 inhabitants, on time to catch the ferry to Puerto Natales that we had booked. The ferry, Crux Australis, was waiting and we left around 20:00 for its 42 hour journey. We were not too happy since the cost was double for the vehicle compared to what we had been told before – Peso 117000. 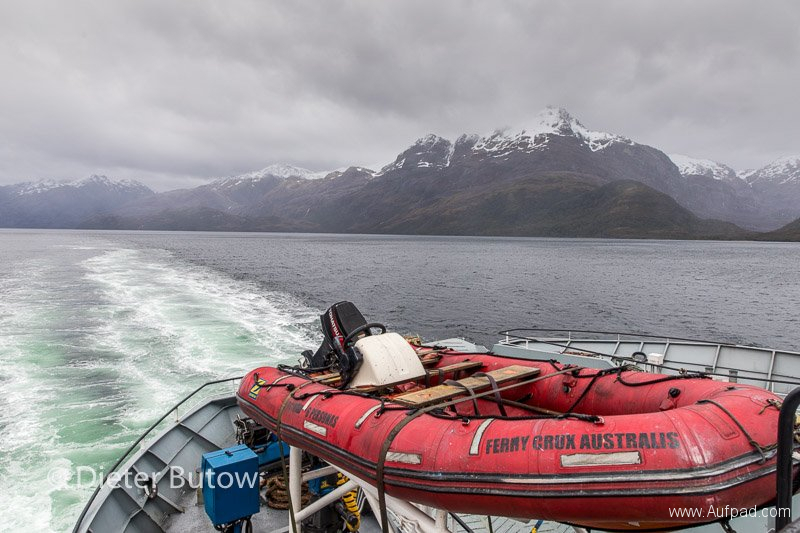 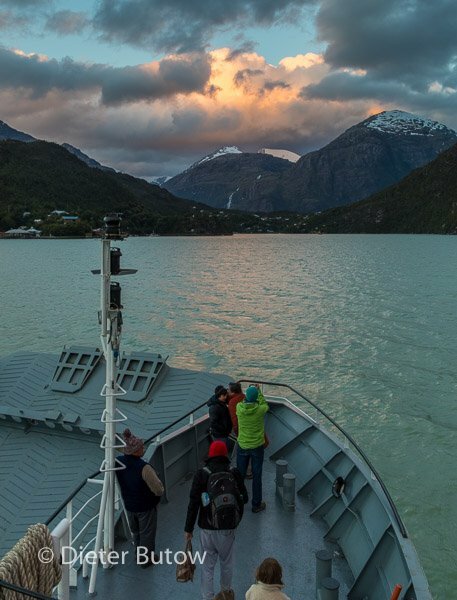 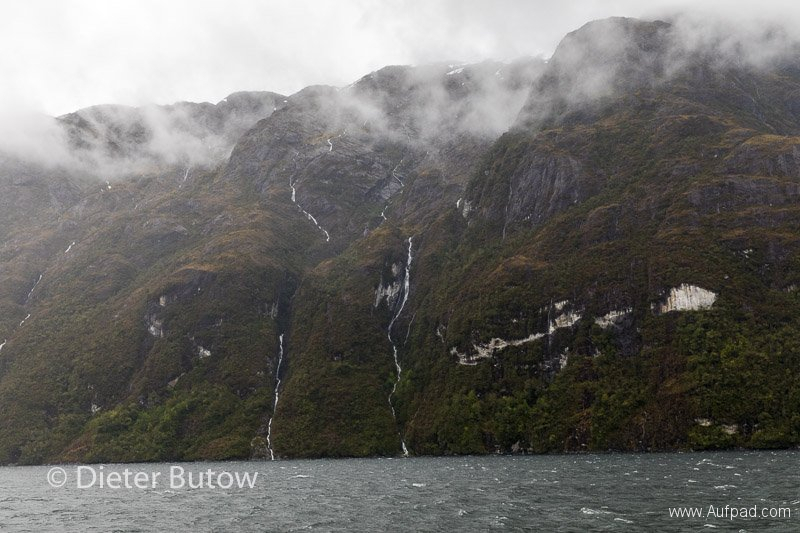 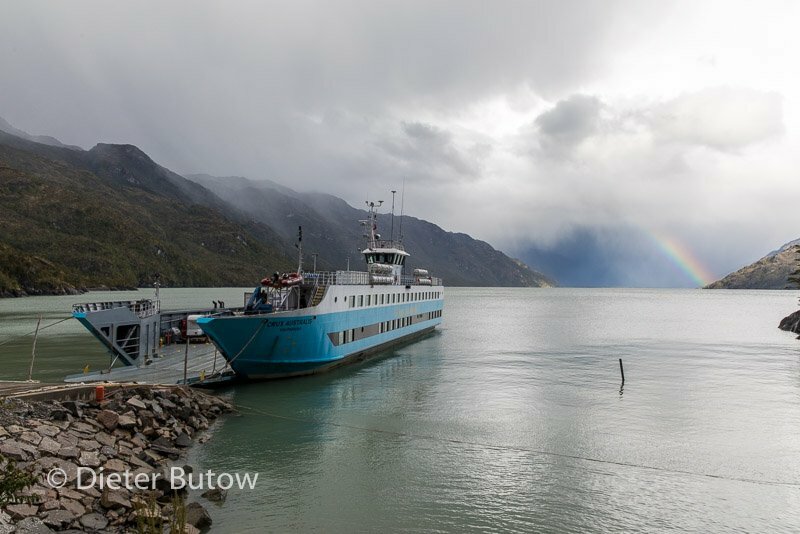 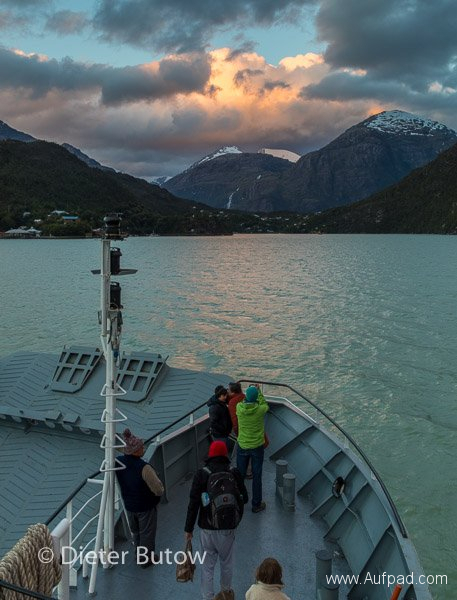 Although this ferry trip through the fjords should have been a highlight, it was spoiled by the inclement weather we had – almost continuous rain, sleet, wind and mist – we could see almost no mountains or glaciars along the route. 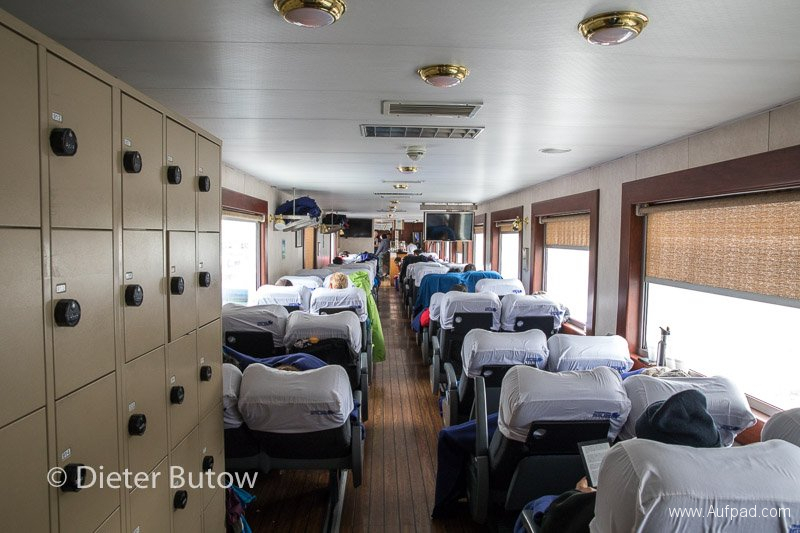 The food left much to be desired and so did the comfort of the seats which reclined for sleeping. Midday we reached Puerto Eden, a fishing village with mainly indigenous inhabitants of Indian descent, inside the massive 3.525mill ha national park Bernardo O’Higgins. 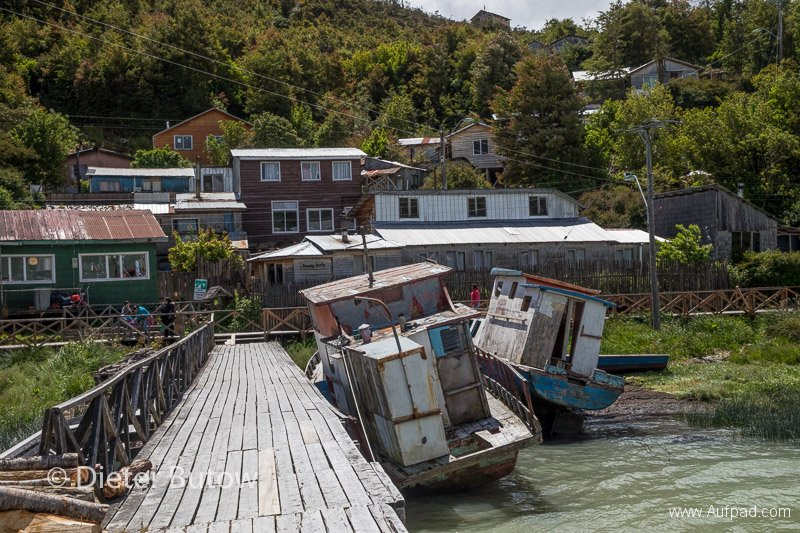 The town has virtually no vehicles or roads, mainly walkways. 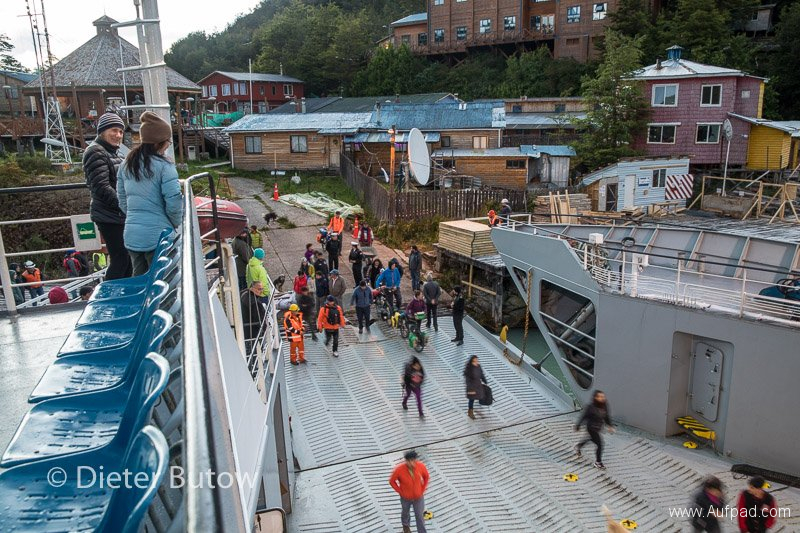 To our surprise many people boarded here to go to Puerto Natales. The channels from here were narrow, many islands inbetween, tricky to navigate in such horrible weather conditions. 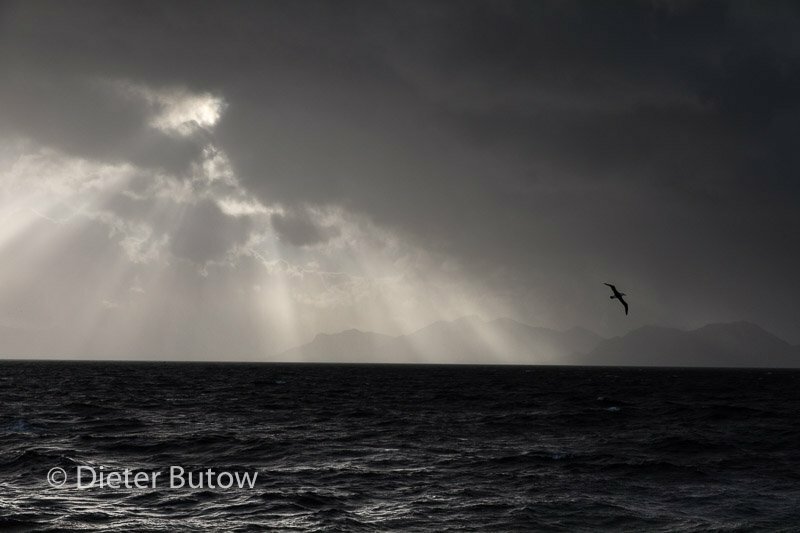 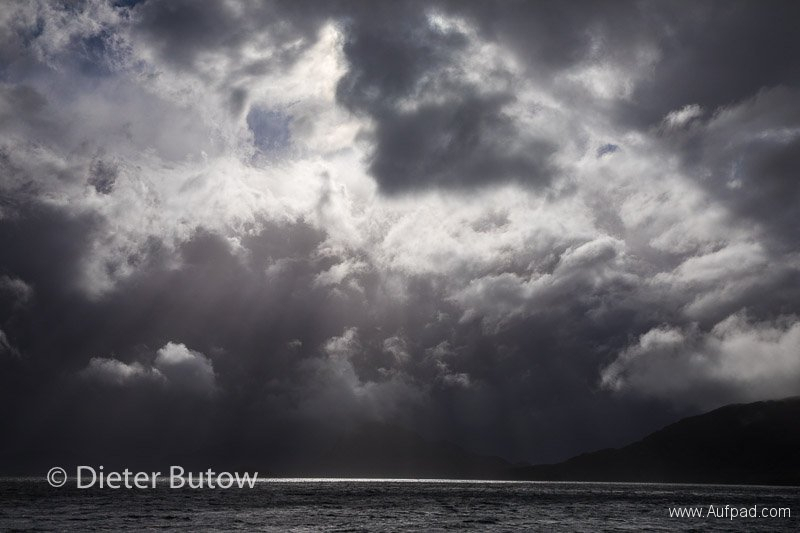 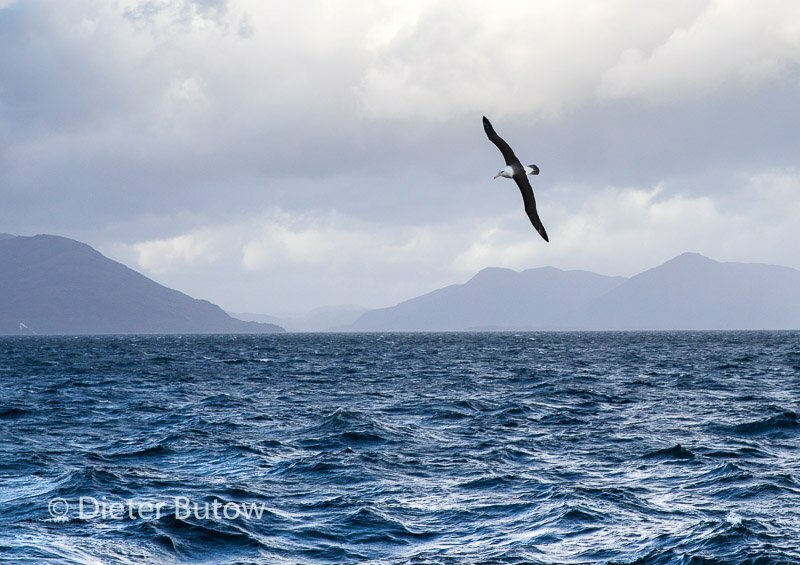 Whenever the weather gave us a few minutes respite we went on deck, saw dolphins, Skuas, Albatross and even an otter. 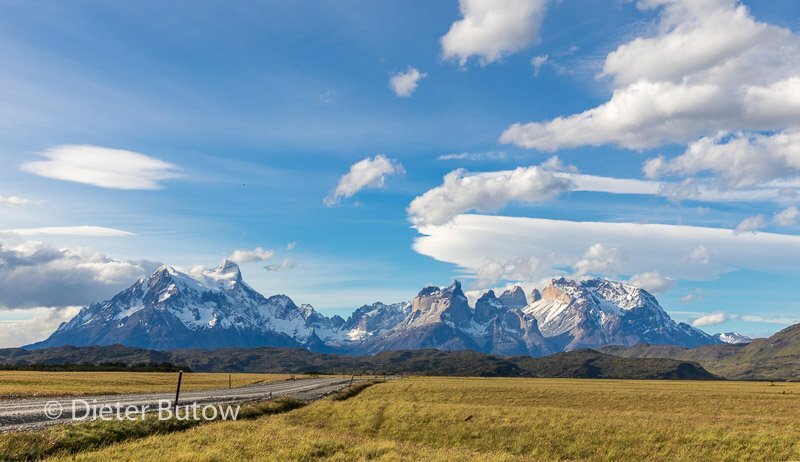 Next day around 12:30 we arrived in Puerto Natales, the weather had cleared a little and we proceeded speedily to the park Torres del Paine, as the weather predictions forecast rain for the coming weekend. 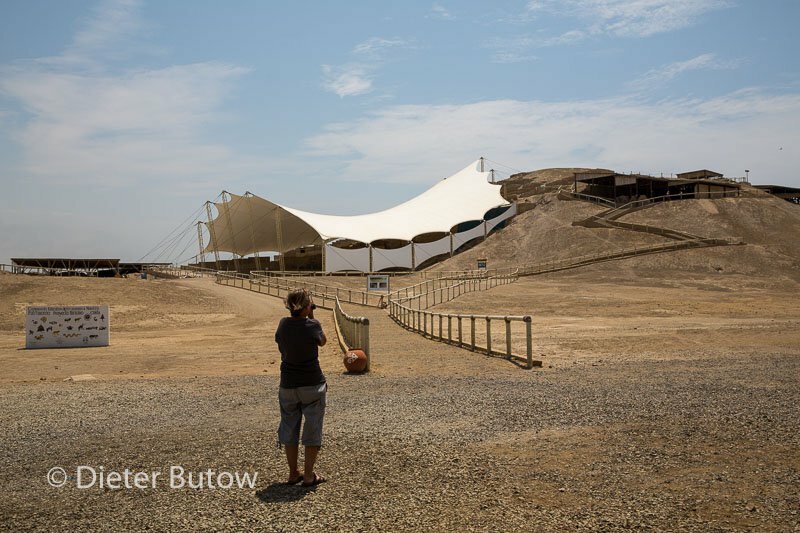 Entry was P21000pP for a 3-day period. 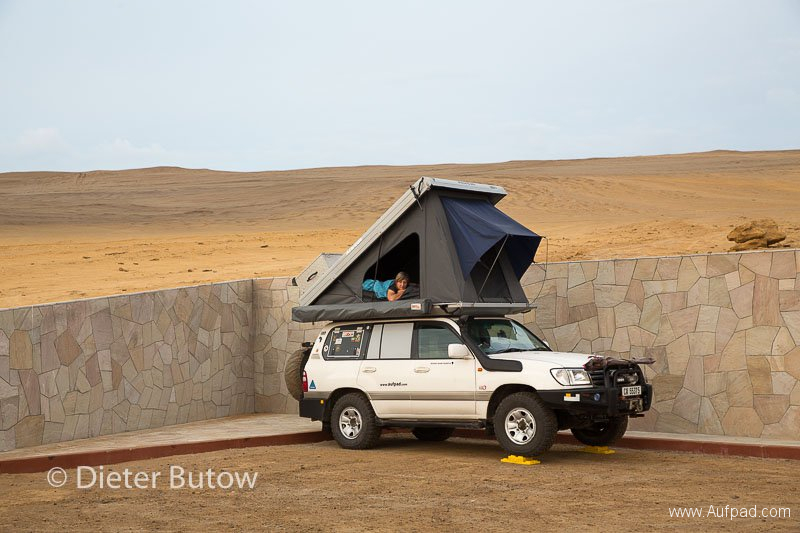 In the park are some places where overlanding vehicles can park, however without ablutions. 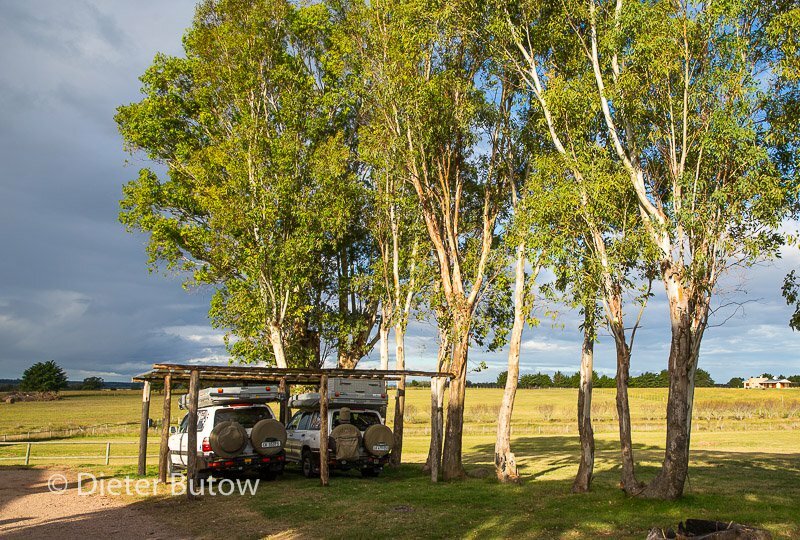 We drove through the park to the Laguna Amarga entrance and ranger station, where at least there were some toilets in walking distance. 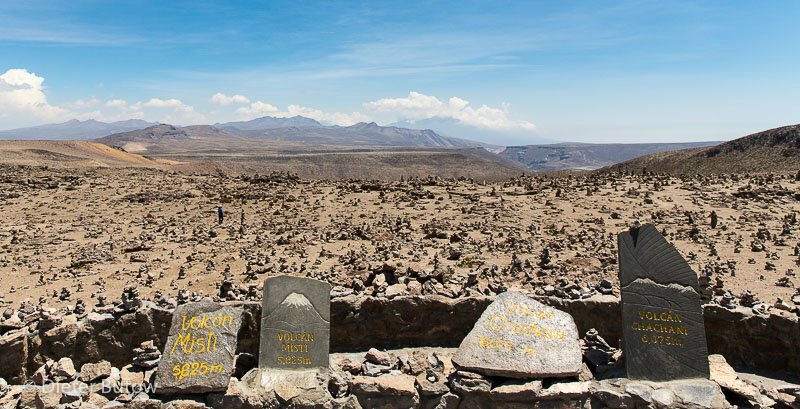 Next to us camped Rudi and Gisa from Austria, who also wanted to attempt to trail up to Base de Torres next morning if the weather would permit. 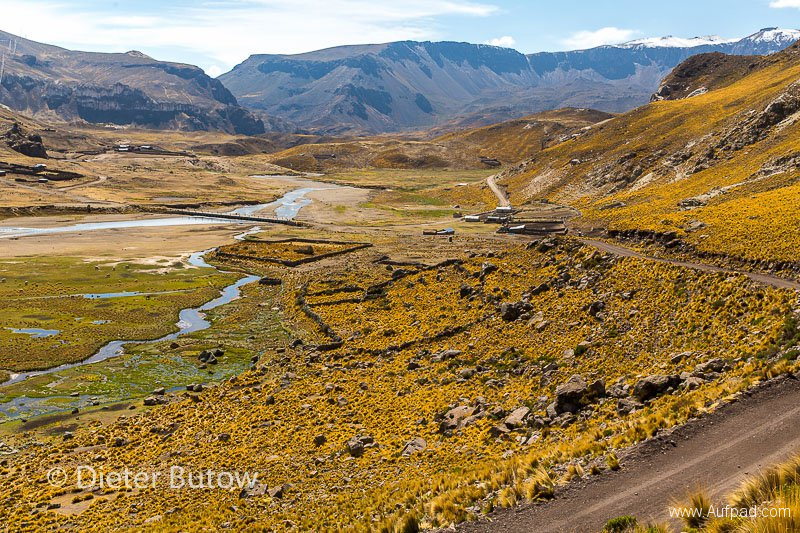 This would be in total a 20km trip with a 1km very steep section to get to the crater lake at the foot of the Torres peaks. 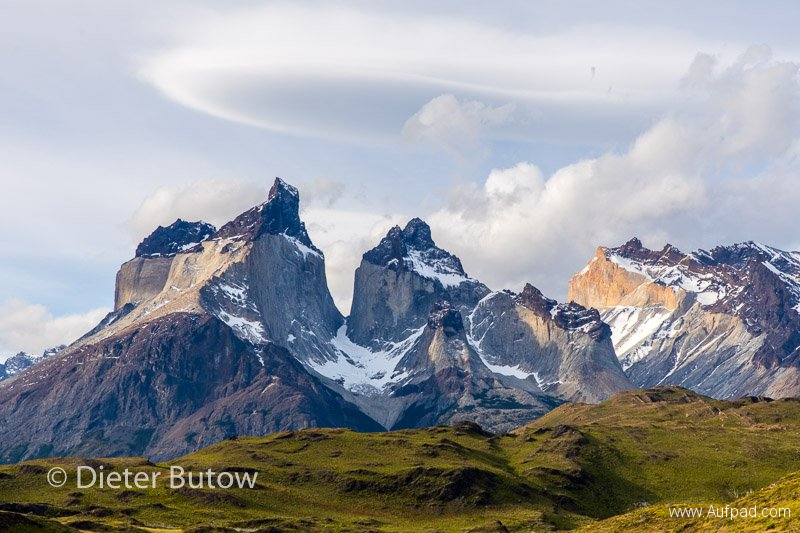 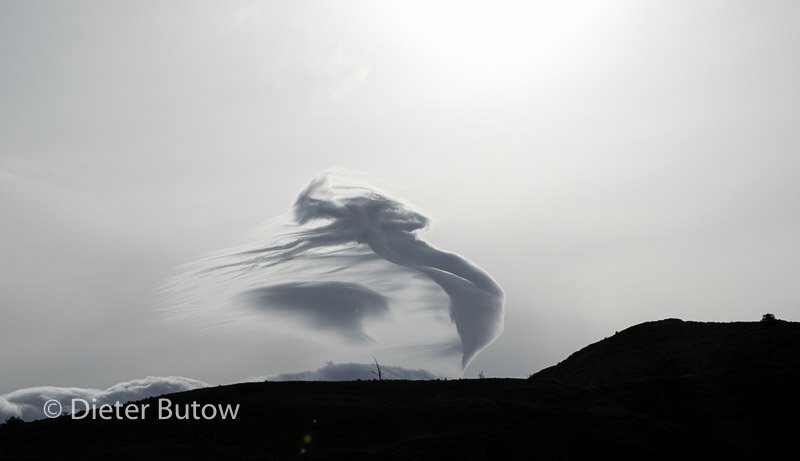 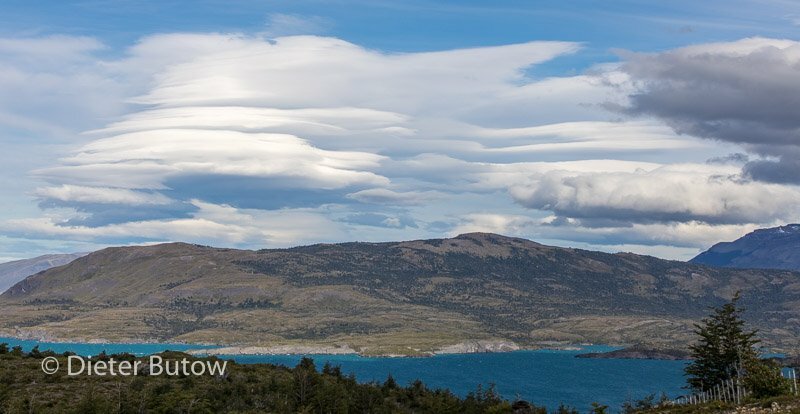 We were expecting some interesting cloud formations in Patagonia, but did not expect such crazy formations so early into our trip down to the south tip. 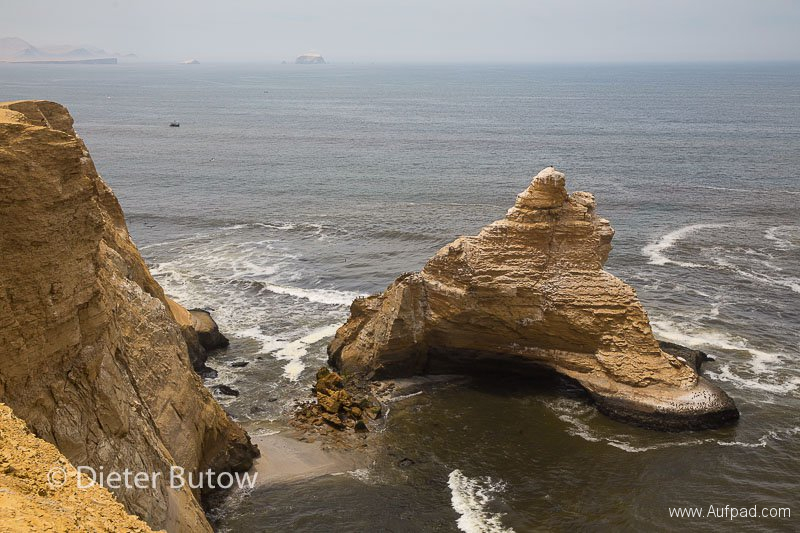 We left Fortaleza de Santa Teresa after two relaxing days and idled down the coast exploring the seaside villages. 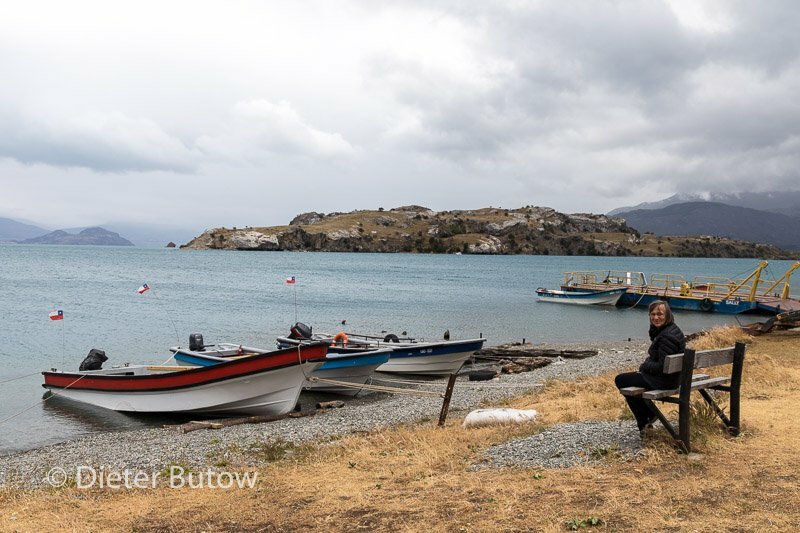 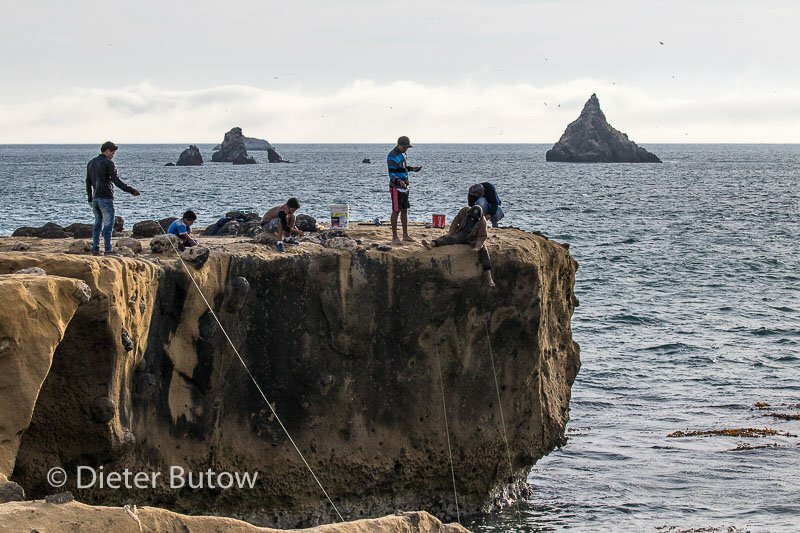 Finally we reached La Paloma where we camped at Wladimir Turiansky Camping, ablutions were not the best – nevertheless it was close to the sea and not overrun by visitors. Jetzt war es an der Zeit, gemütlich die Küstenorte Uruguay’s abzufahren. 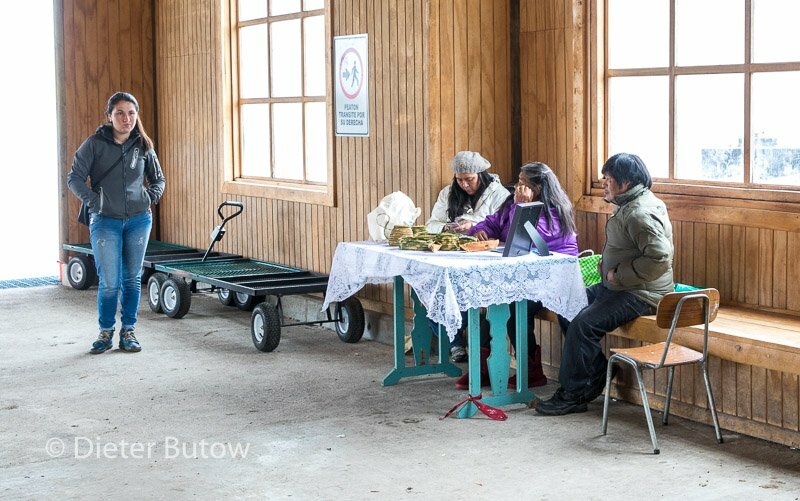 Dabei stiessen wir auf interessante Örtchen – so wie Cabo Polonia. 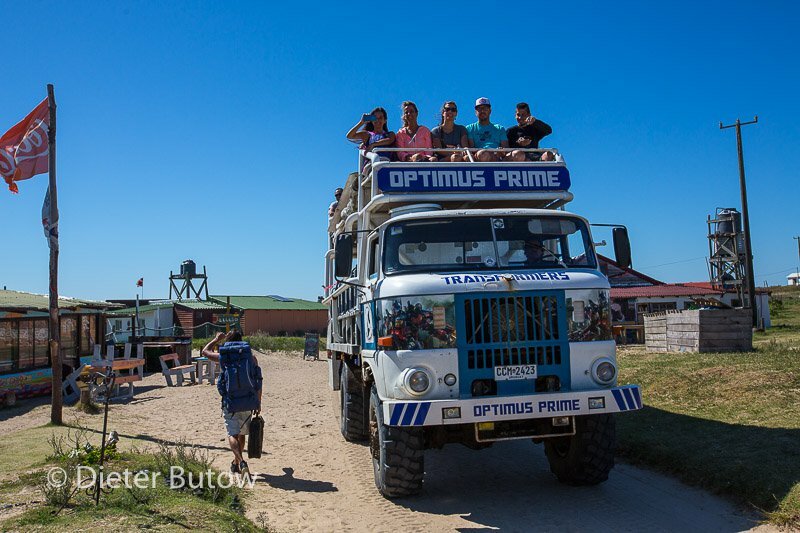 Seelisch bereiteten wir uns auf unsere Rückkehr nach Südafrika vor. 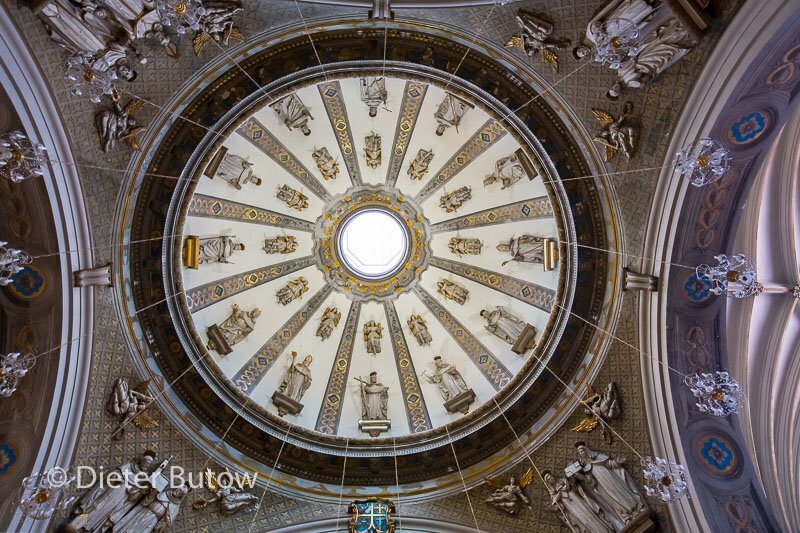 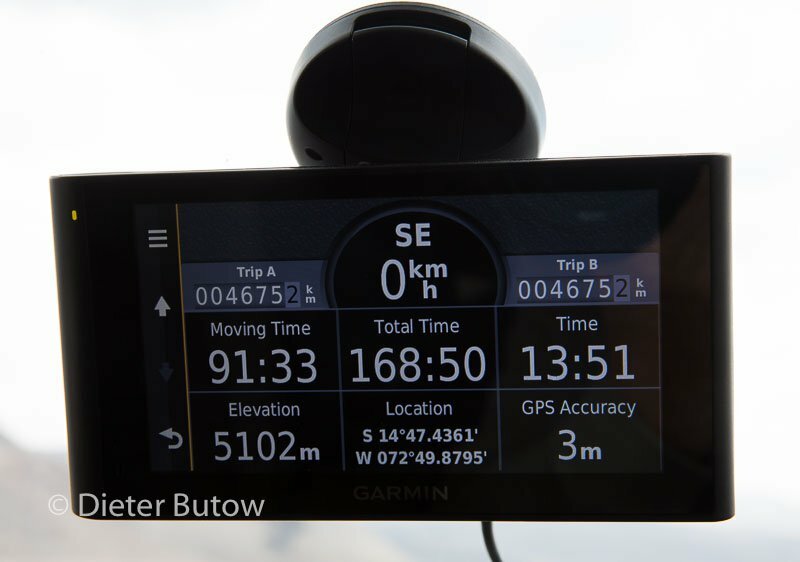 A sojurn to Cabo Polonia, we thought, would be a welcome change from self driving. 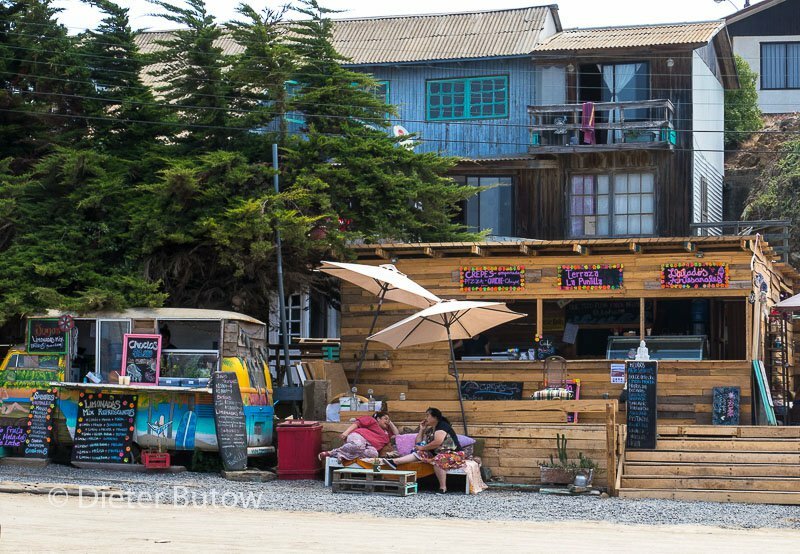 This village behind many dunes was not accessible by vehicle – this is where hippies and surfers found a refuge at the time. 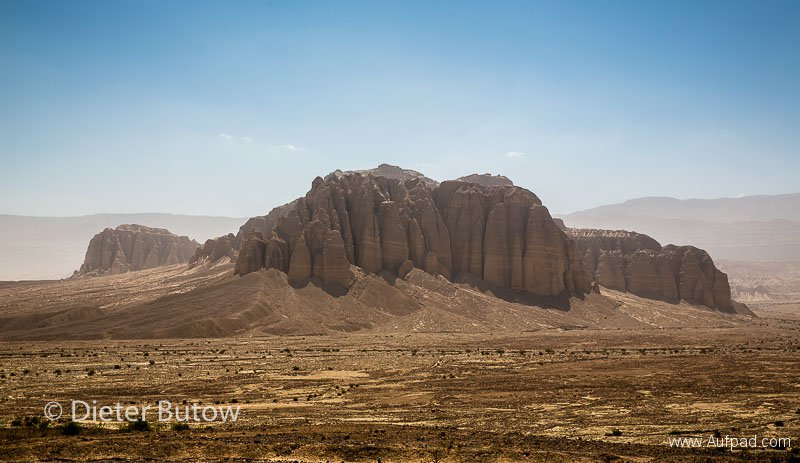 Today it has become slightly more accessible and a 4×4 truck shuttle service took us there where we enjoyed the day wandering around and photographing and relaxing. 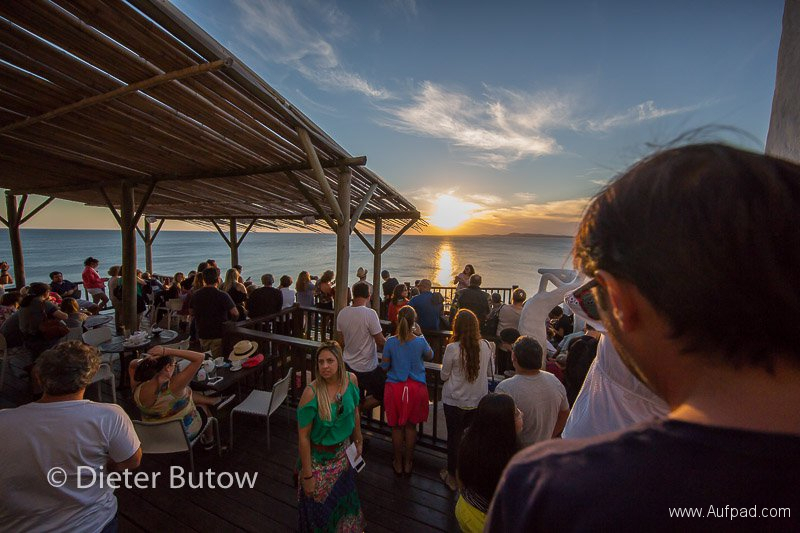 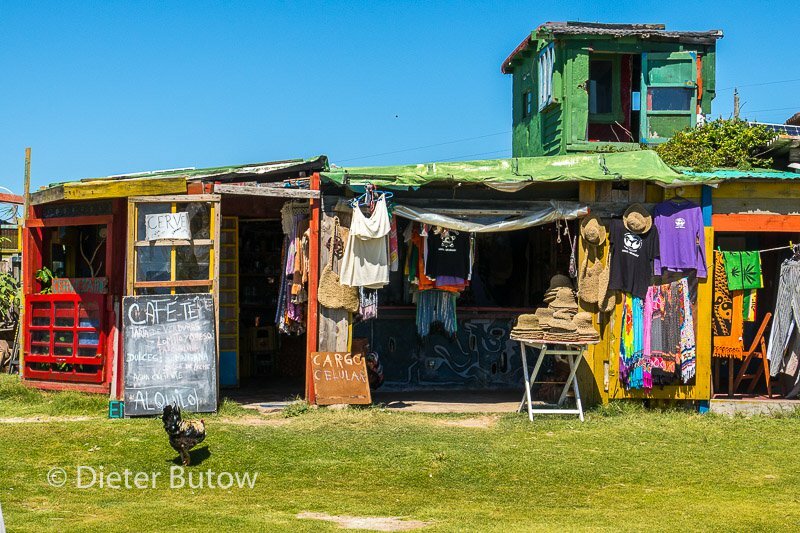 Maybe staying one night is a better idea – it seemed a laid back town with a vibe and many backpackers flock to it. Take your swimming costumes. 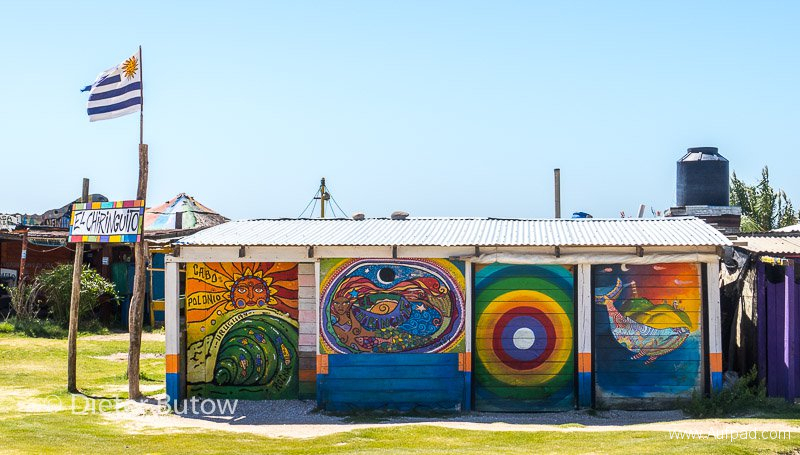 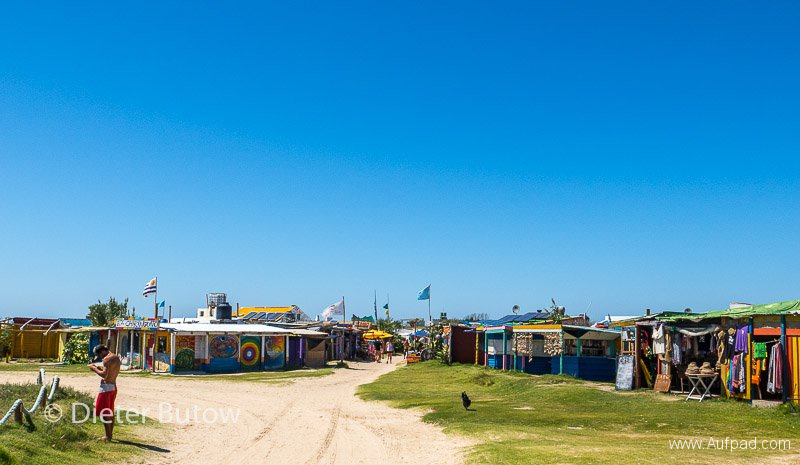 On our journey towards Punta del Este we took a turn into the town Faro Jose Ignacio – a quaint village with art galleries and modern villas, we did not spot a camping site –maybe too upmarket for trekkers like us. In San Rafael, we decided to camp at El Placer – a cut above the rest with all amenities and well organised. 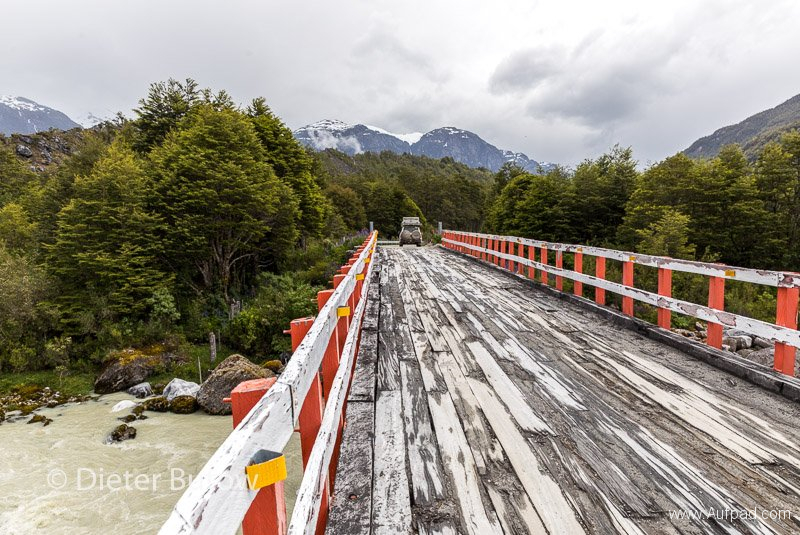 Getting there we passed two extraordinary bridges – one was like a ring with the road separating, the other like a wave. 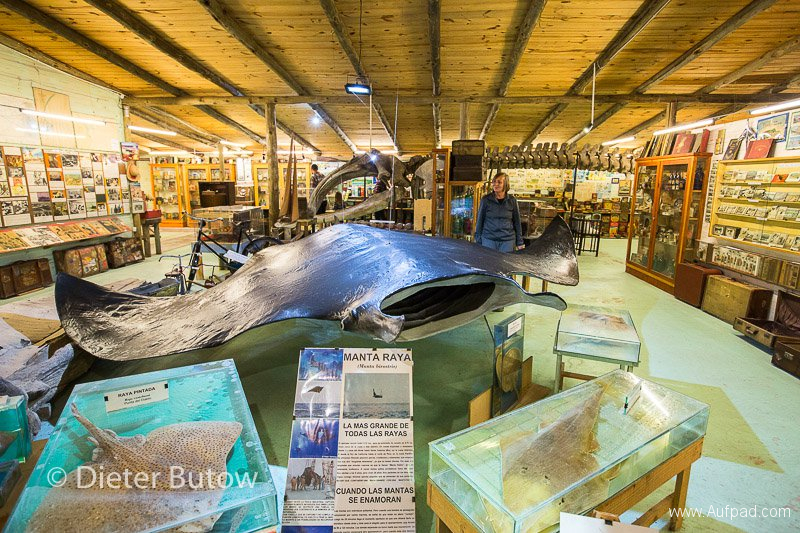 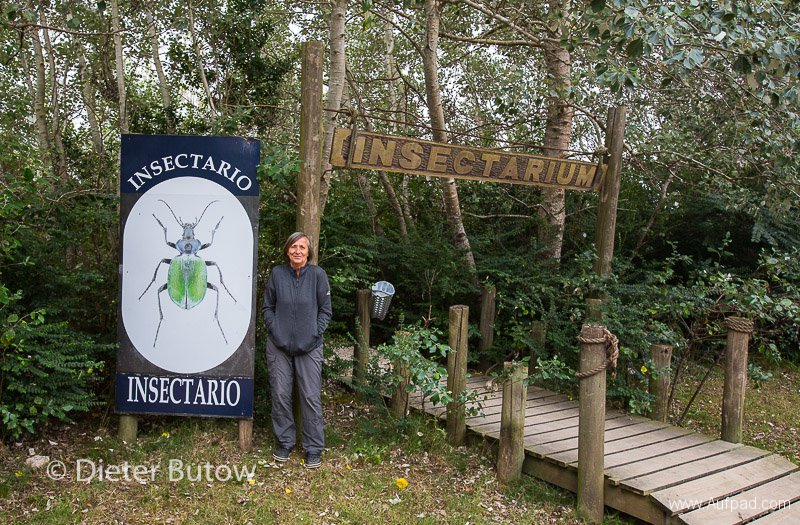 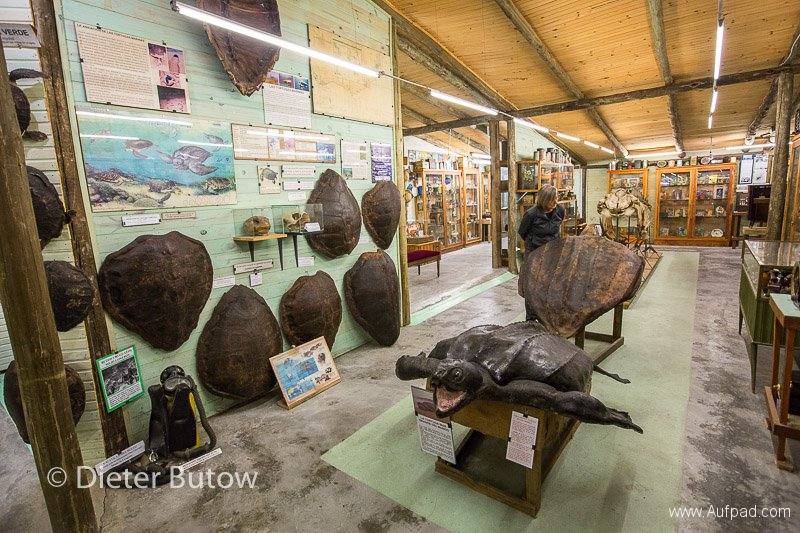 While we were in the La Barra area, we used the opportunity to visit the Museo del Mar and right next door the Insectario that is part of it (entrance fee covers both). 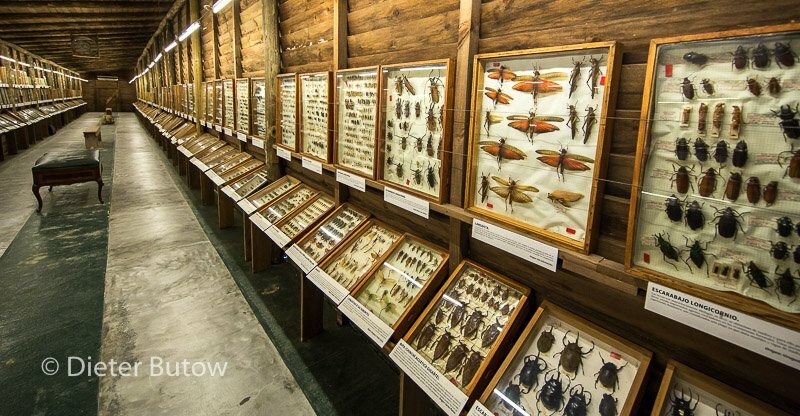 Both are collections of large proportion and extremely interesting and definitely worth a visit. 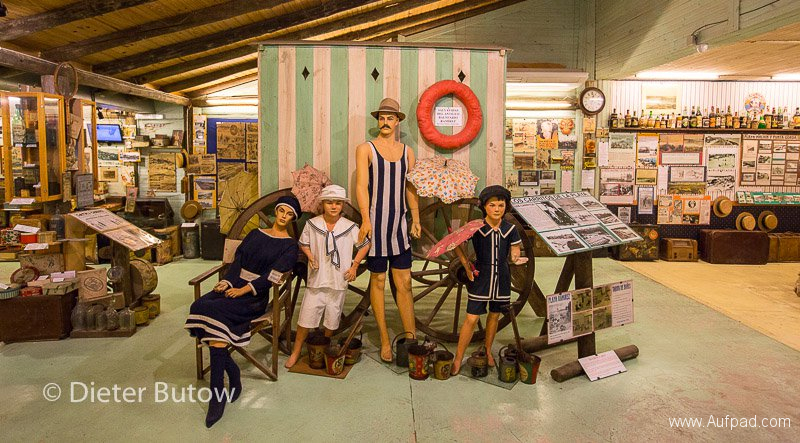 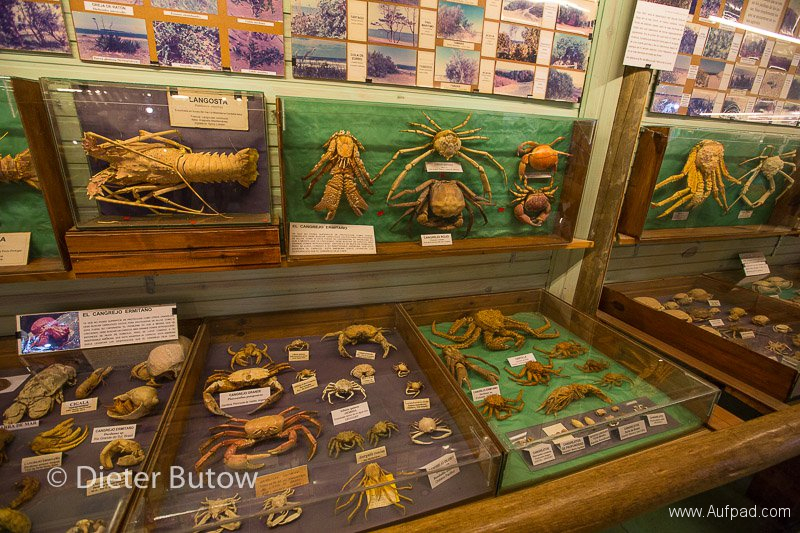 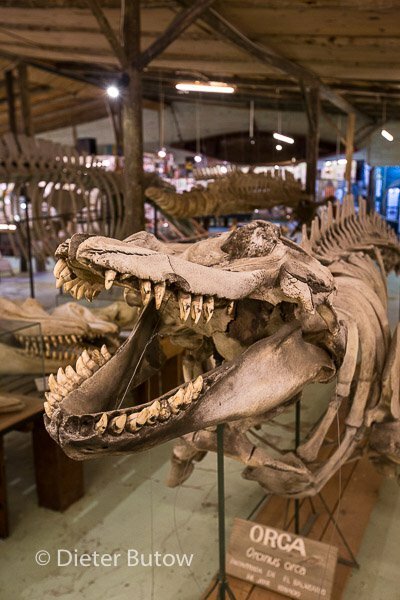 Exhibits also include historical information about the coastal towns. 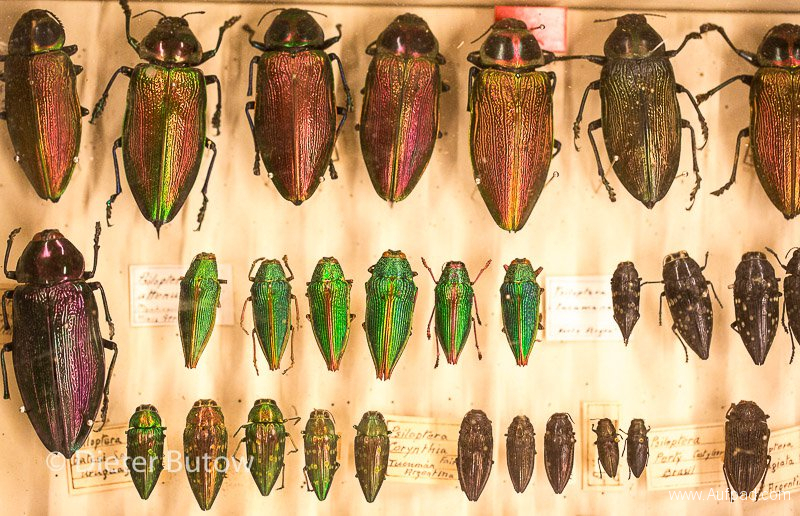 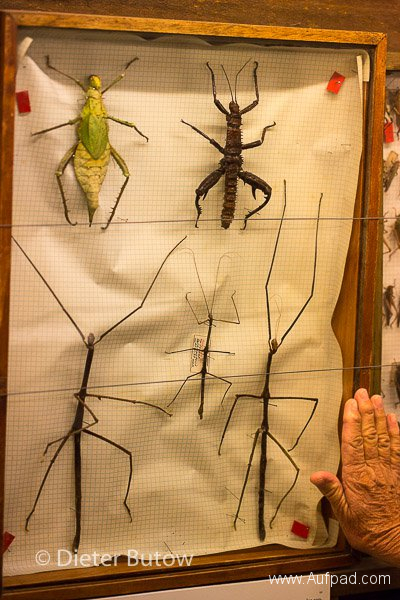 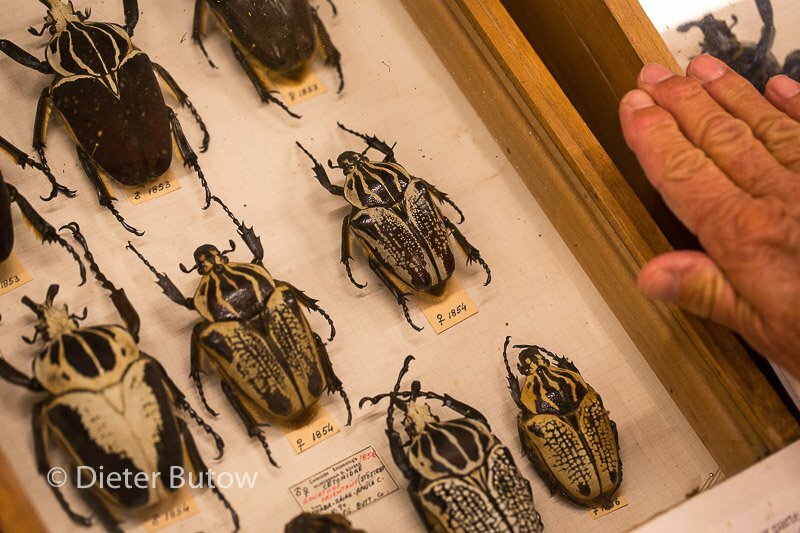 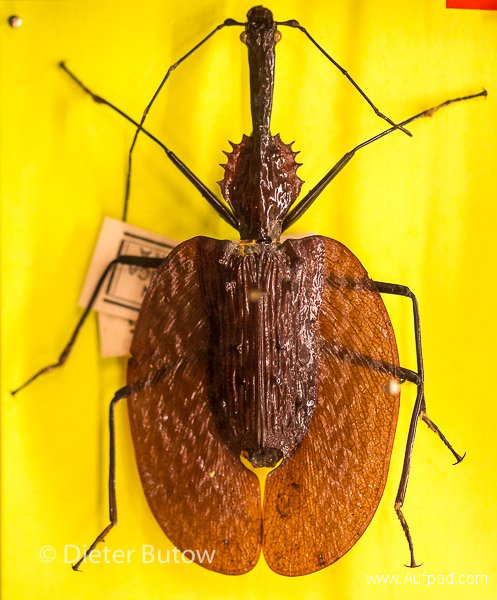 While visiting the Insectario we realised, that we should have looked more for interesting insects in South America – mind boggling shapes and colours abound. 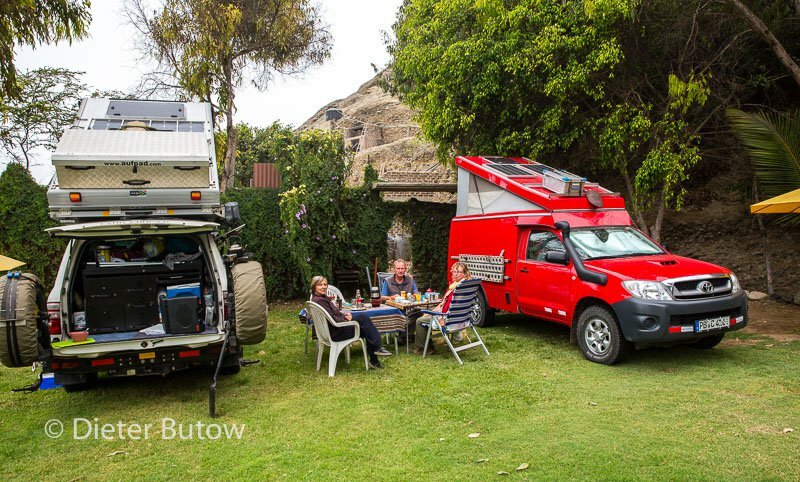 Next camping in Punta Ballena was ok, our last night in the roof tent for the remainder of our journey. 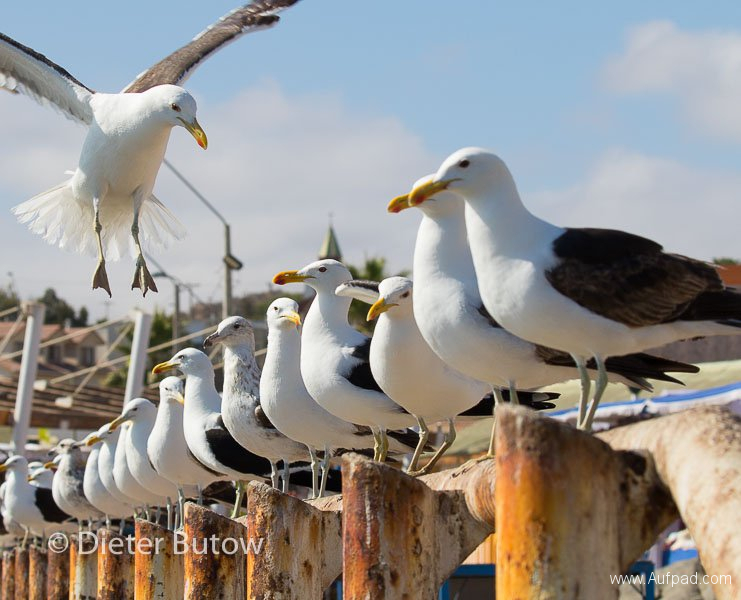 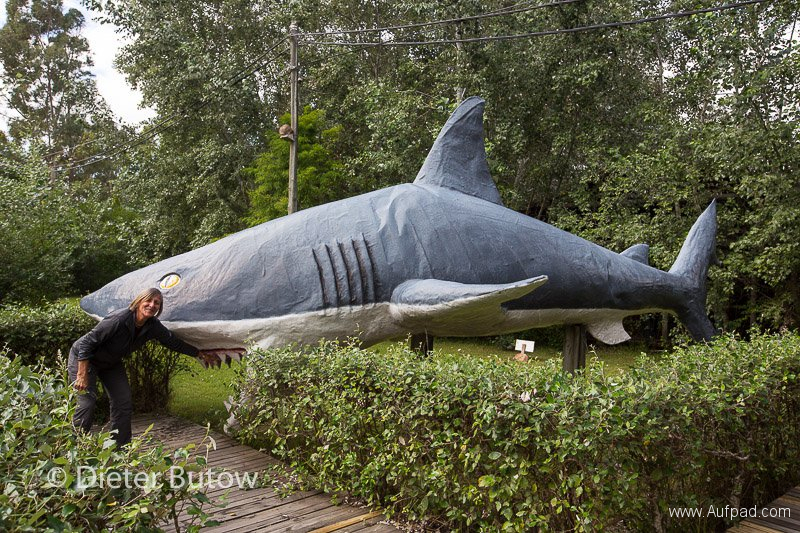 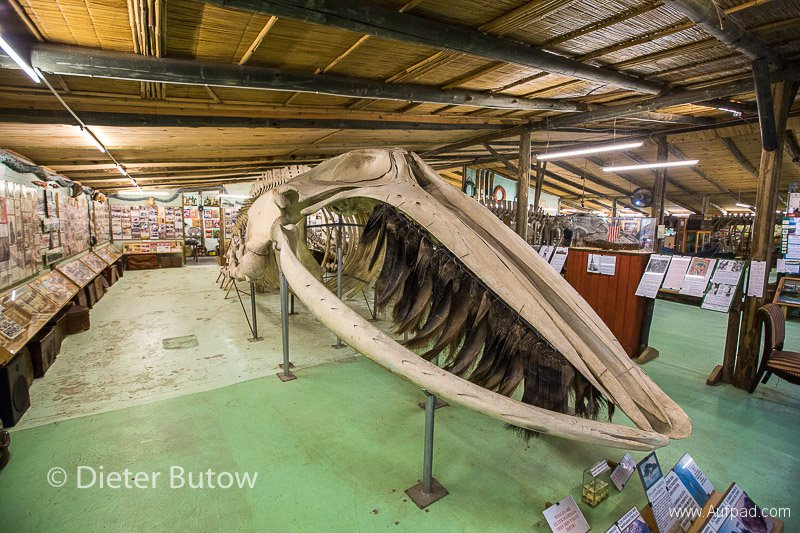 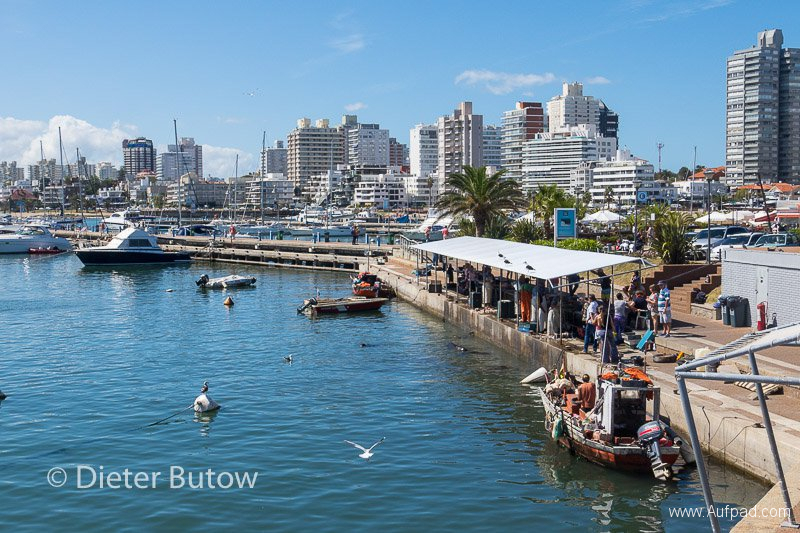 The following day we arrived at our school friends Jürgen and Gisa Hecker, who reside in Punta Ballena for part of the year and with whom we explored Punta del Este and its fish market and the surrounding sights worth visiting. 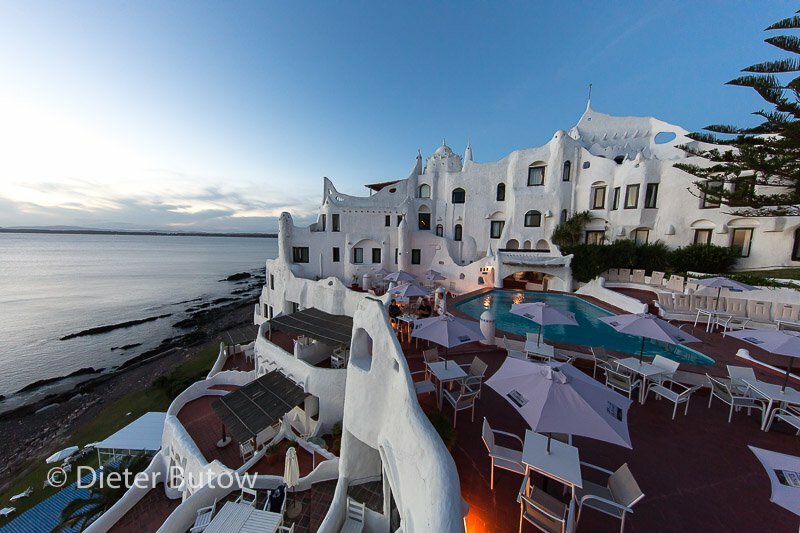 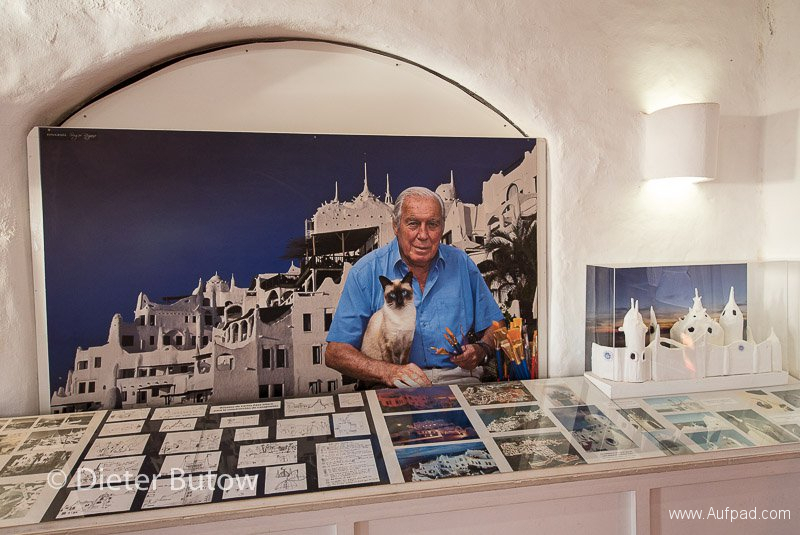 This included the Casapueblo hotel Carlos Paéz Vilaró (previously his studio and house) which is popular at sunset where he reads his poem dedicated to the sun (posthum). 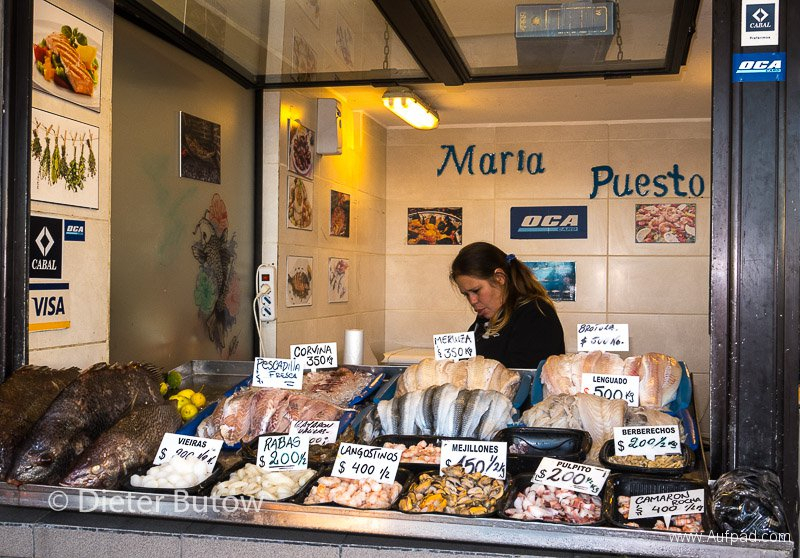 We sampled the fresh seafood of the area by shopping for fish on the quay at Punta del Este. 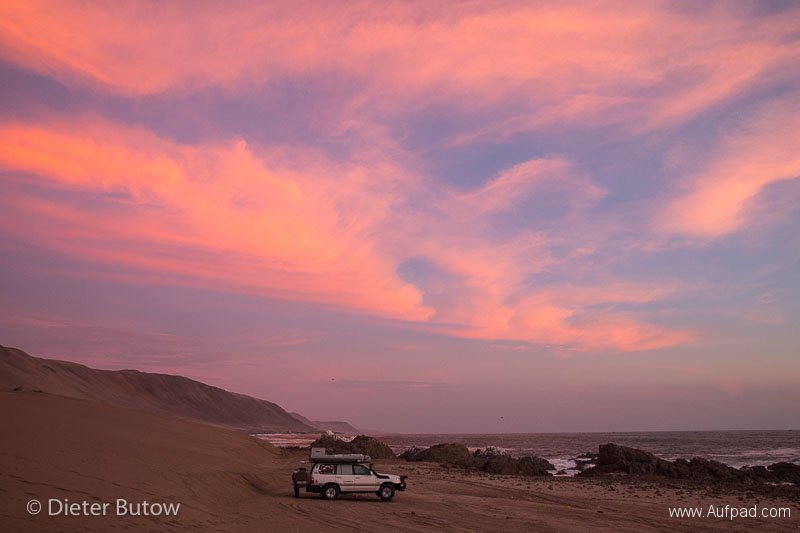 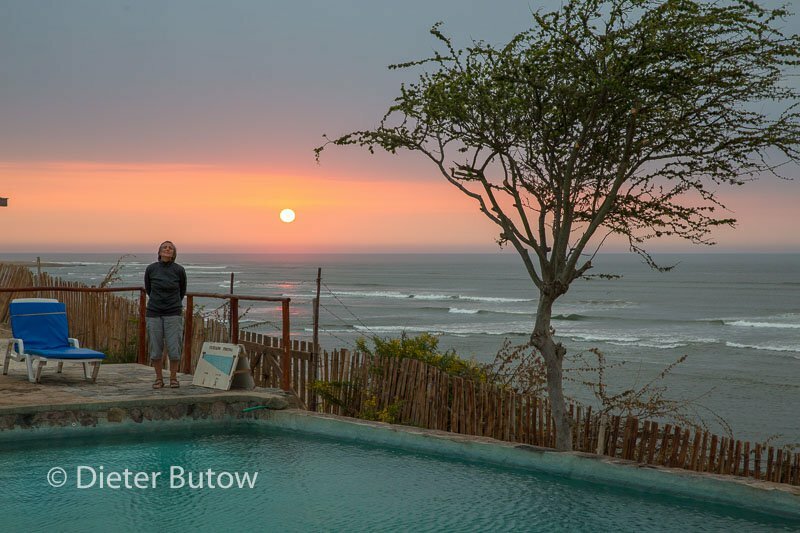 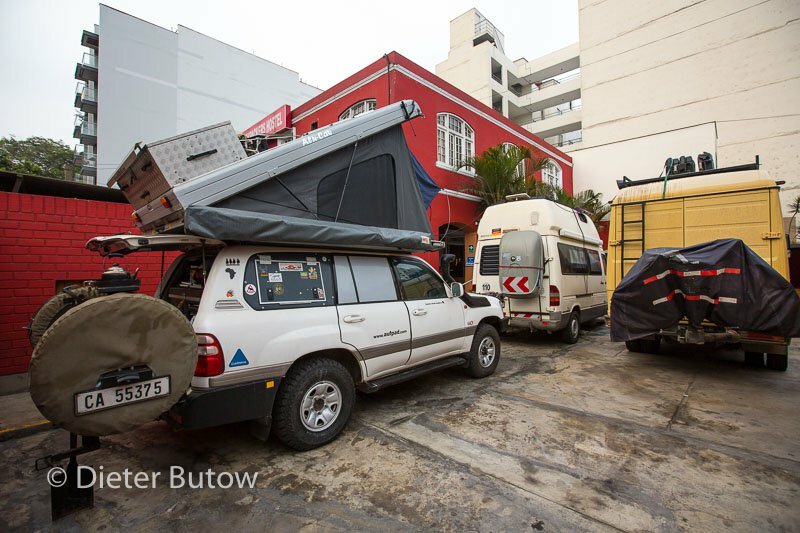 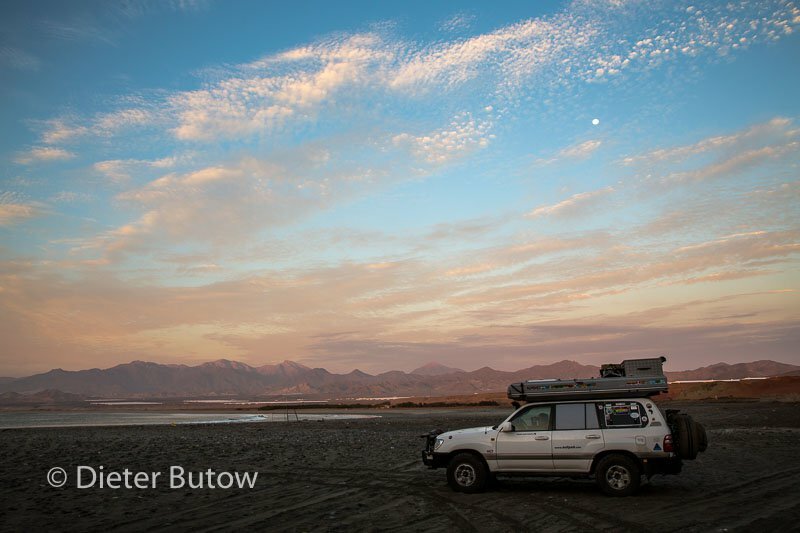 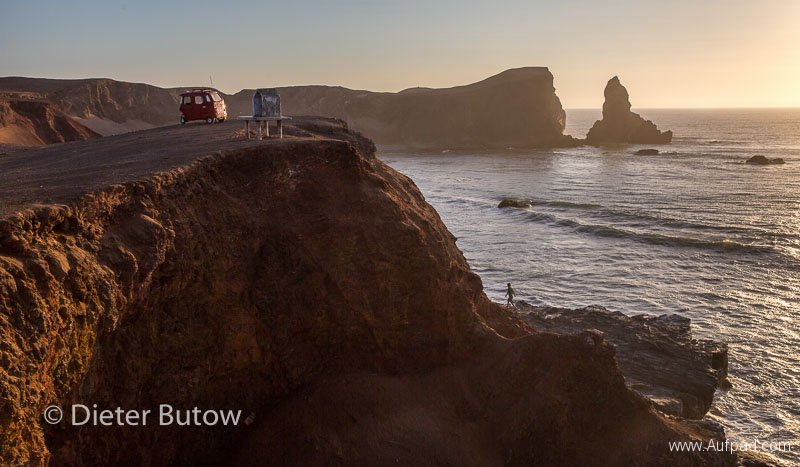 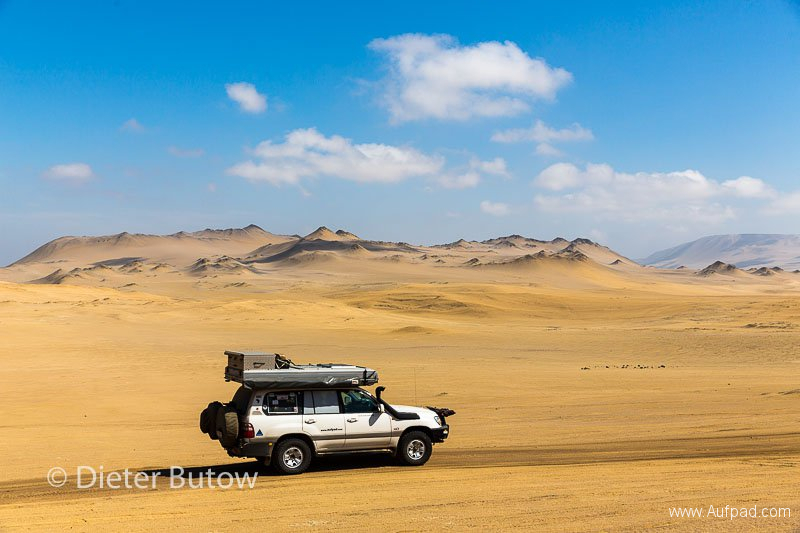 While staying at Punta Ballena Uwe and Almut, with whom we had prepared and shipped the vehicles originally, also arrived, having completed their second leg in South America. 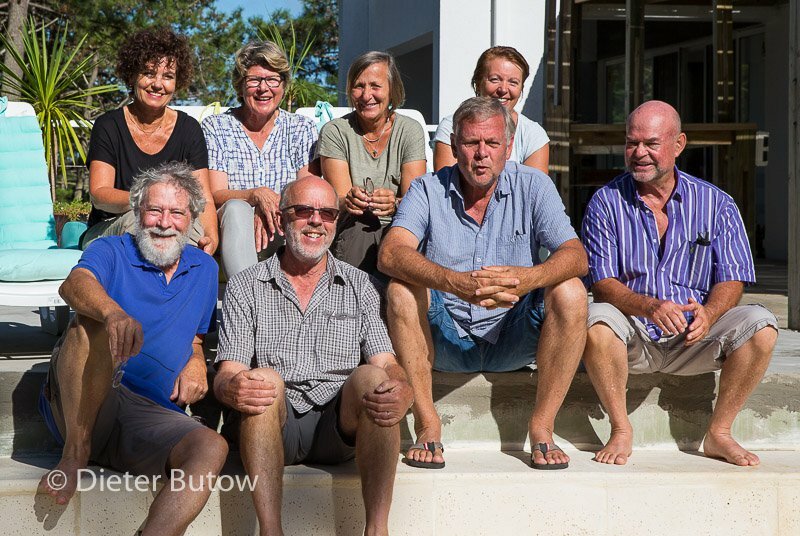 This resulted in an impromptu Namibian reunion with Hagen and Mechthild Stahr, who have settled in Uruguay as farmers for several years as well as Wolfgang “Kücki” Kühhirt and wife Ines who were on holiday from Namibia, where they own the lodge at Rostock Ritz in a beautiful part of the Namib desert ( stop there if ever you get to Namibia –a stunning place). 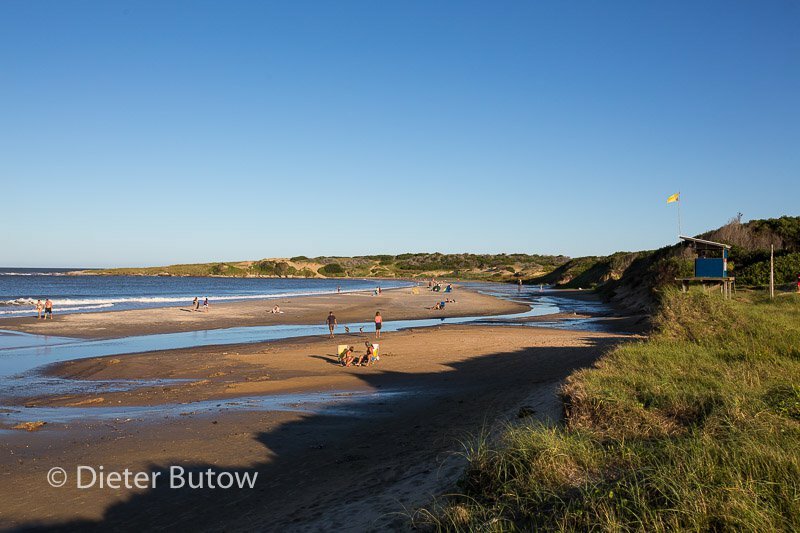 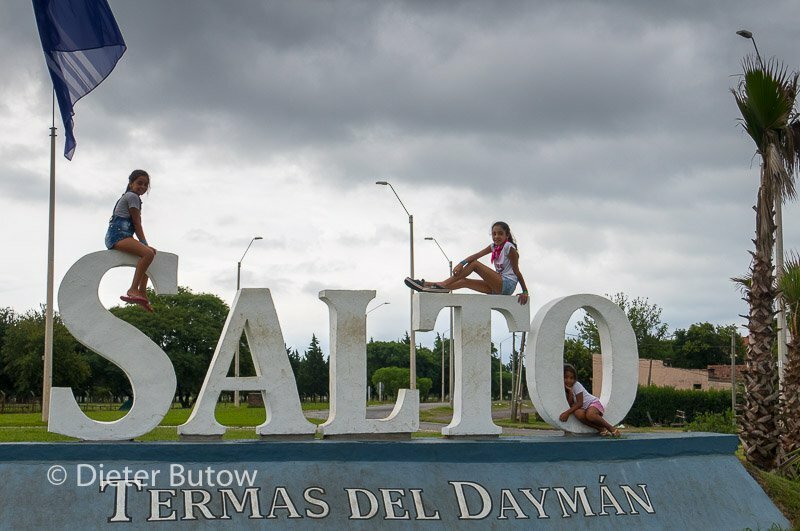 The time passed quickly while we had fun in Punta Ballena. 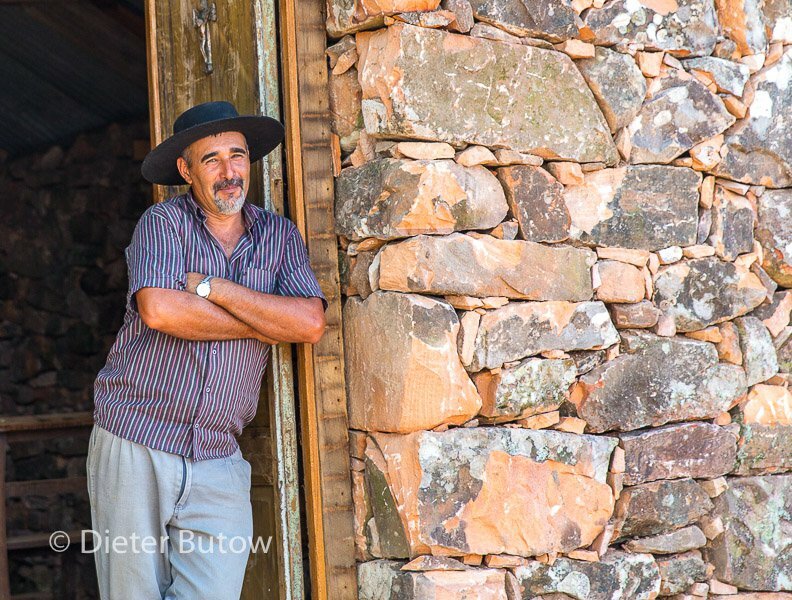 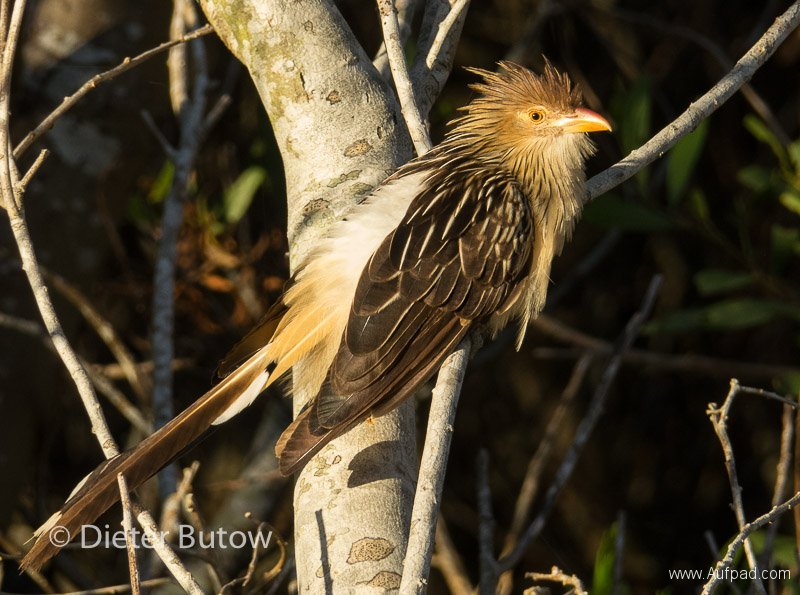 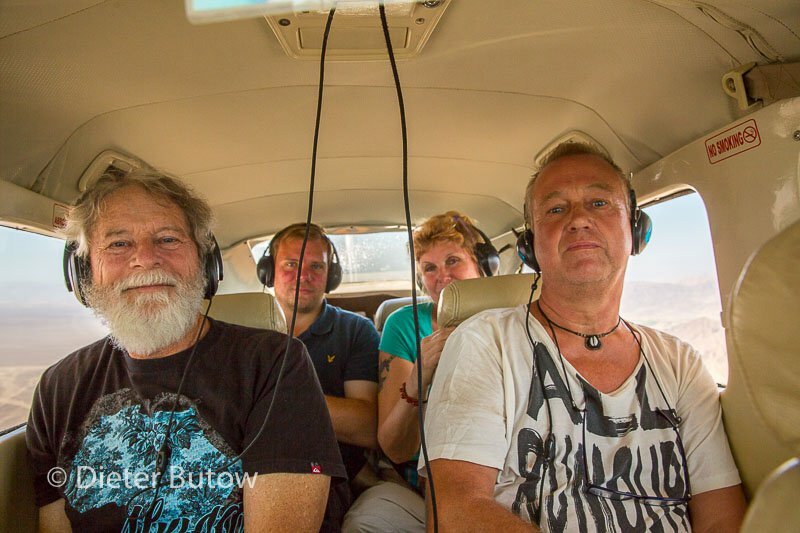 Soon we had to depart to Atlantida, where we would leave our vehicle with Burkhard and Anke Schleicher, the Namibian farmers that we had visited while en-route to Paraguay. 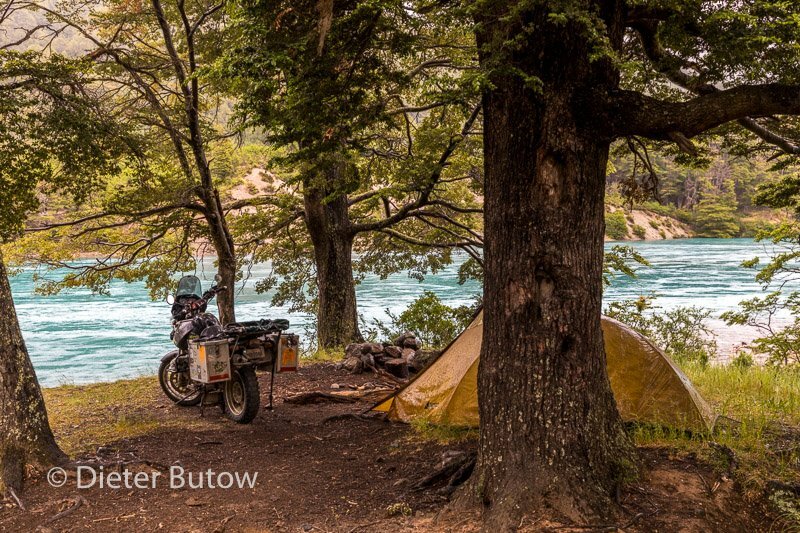 They had relocated closer to the coast and now offer a safe haven for bikes of overlanders and would look after our vehicles. After two days of cleaning and preparation for our return in six months to proceed with our second leg into Pantanal in Brasil and Southern Patagonia, we had to say farewell and we flew back from Montevideo via São Paulo and Johannesburg to Cape Town, where we landed safely on 31st March 2017. 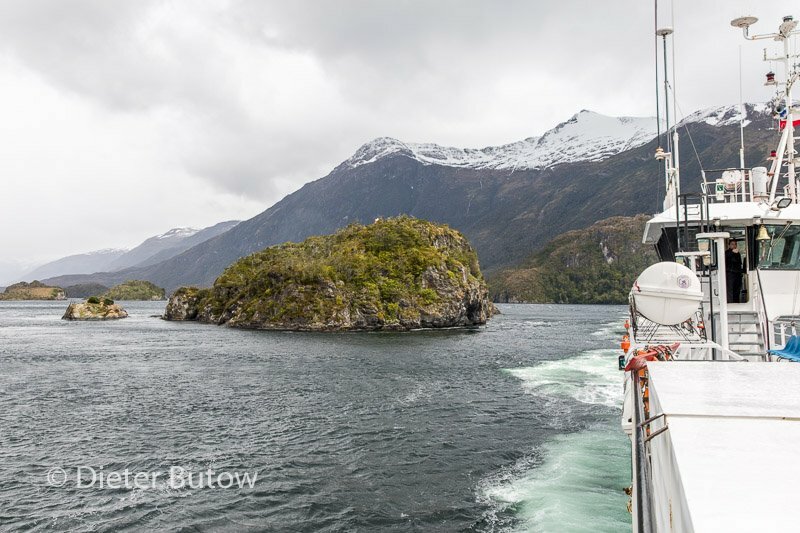 Watch this space in September 2017 – our journey will continue into the breath taking region of Southern Patagonia. While we shall have to dress up warmly for the harsh climate and glaciers, you will be able to continue the journey with us from the comfort of your armchairs. 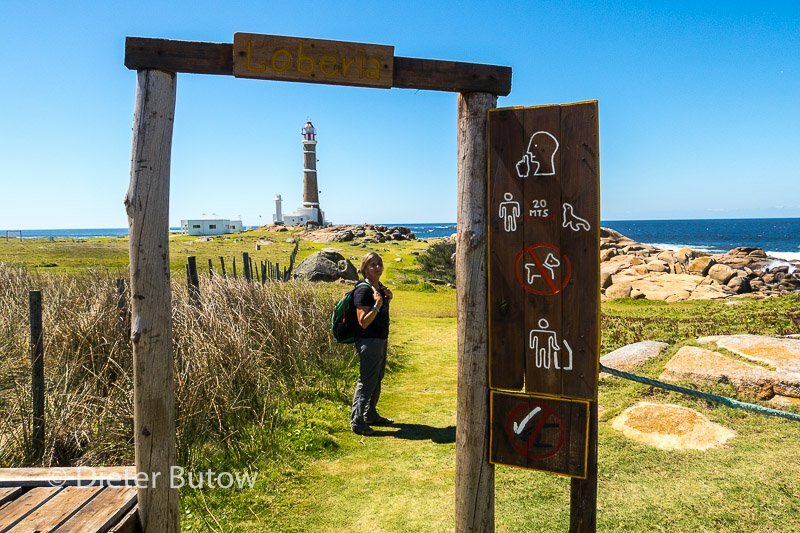 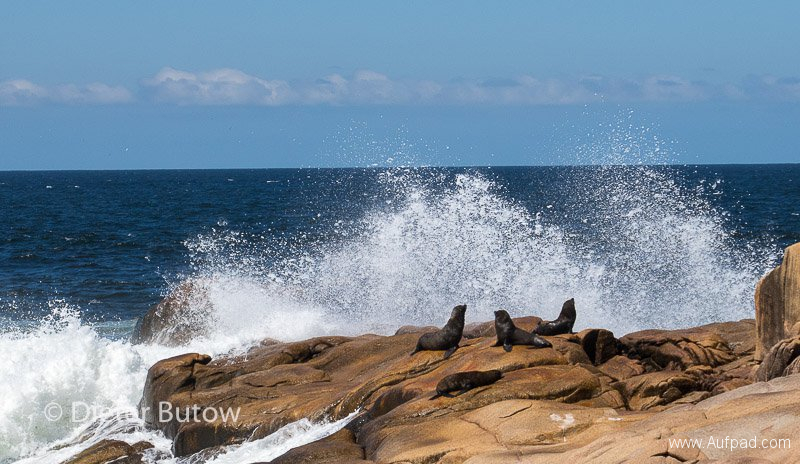 Since we now had about 4 weeks left before our return to Cape Town, we decided to take a second look at Uruguay. 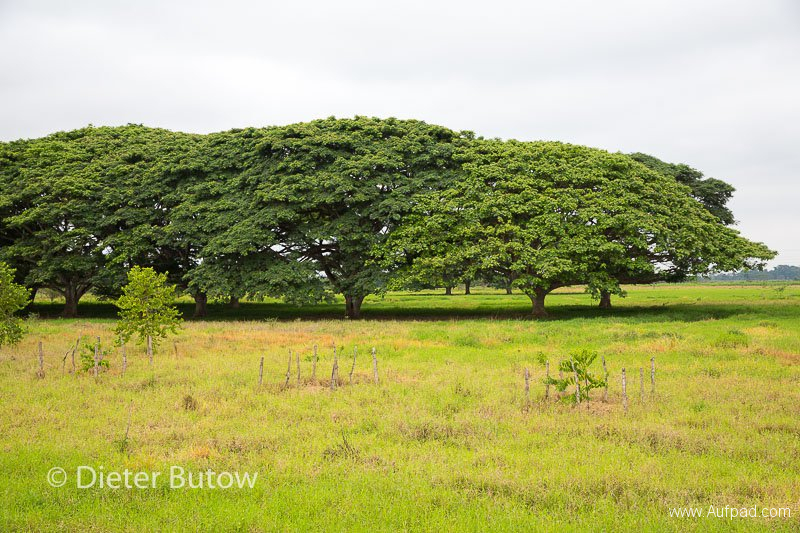 Our first impressions were dampened by rainy season when we arrived in May – maybe the country had more to offer that flat cattle ranches? Noch hatten wir genug Zeit, uns in Uruguay genauer umzuschauen. 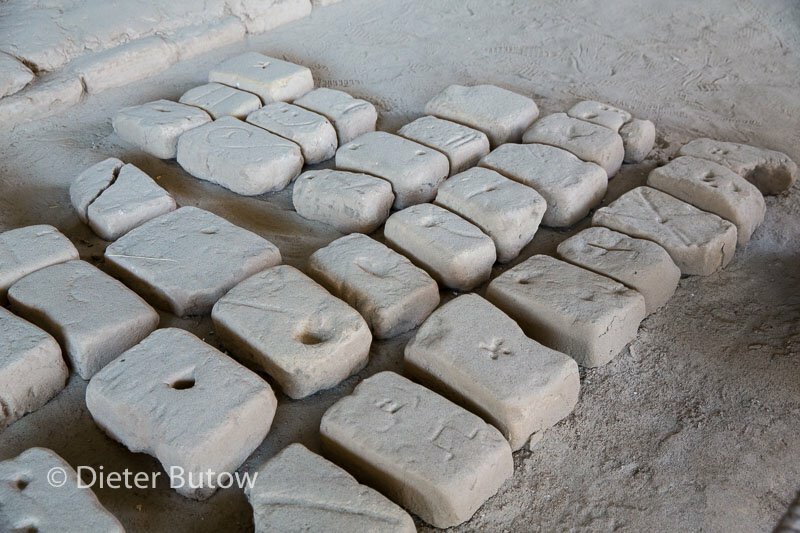 Ist dies Land wirklich so langweilig wie unser erster Eindruck war? 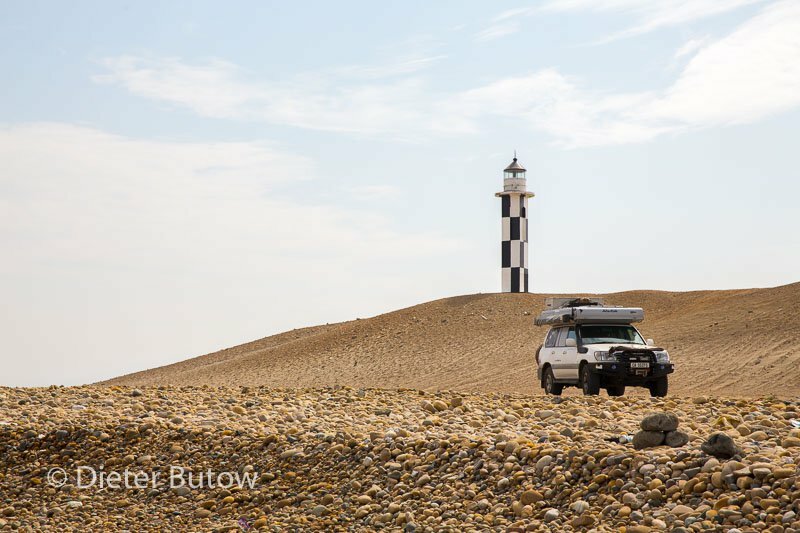 Wir beschlossen, gemütlich entlang der Küste in Richtung Montevideos zu fahren. 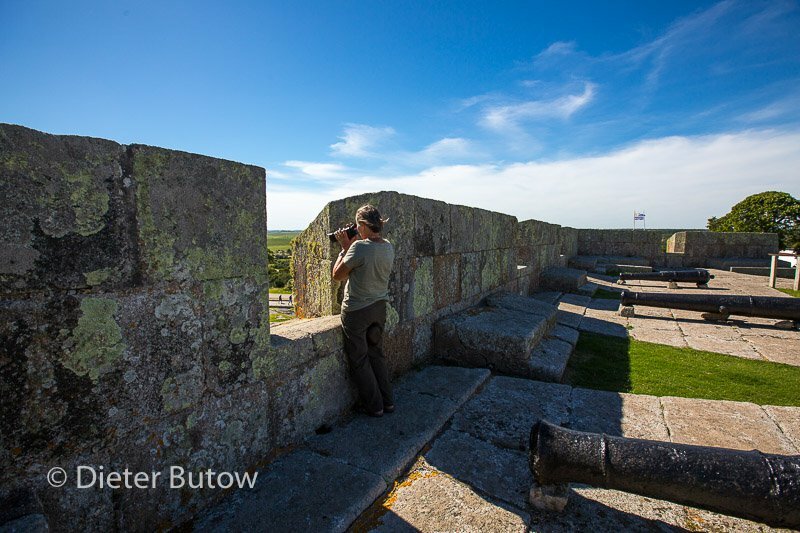 We crossed the Uruguay River via the Salto Grande dam wall which forms the border between Concordia in Argentina and Salto in Uruguay. 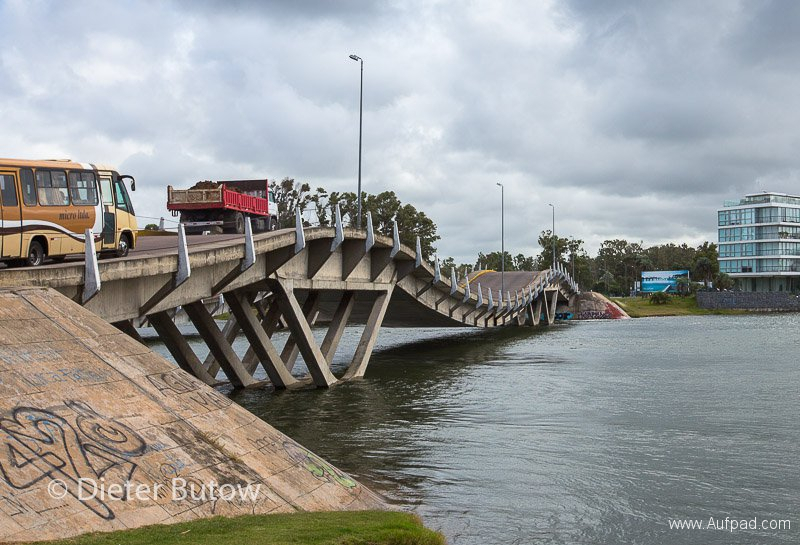 At the joint border offices, customs officials of Uruguay advised us that our vehicle never officially left Uruguay when we originally drove into Brazil the previous year – we should have handed in our vehicle paper to customs. This now could not be rectified on the spot, so next day we again had to emigrate back into Argentina where we drank a coffee at a gas station, then returned to the border once more – this time round we got the paper for our vehicle with validity in Uruguay for full 12 months. 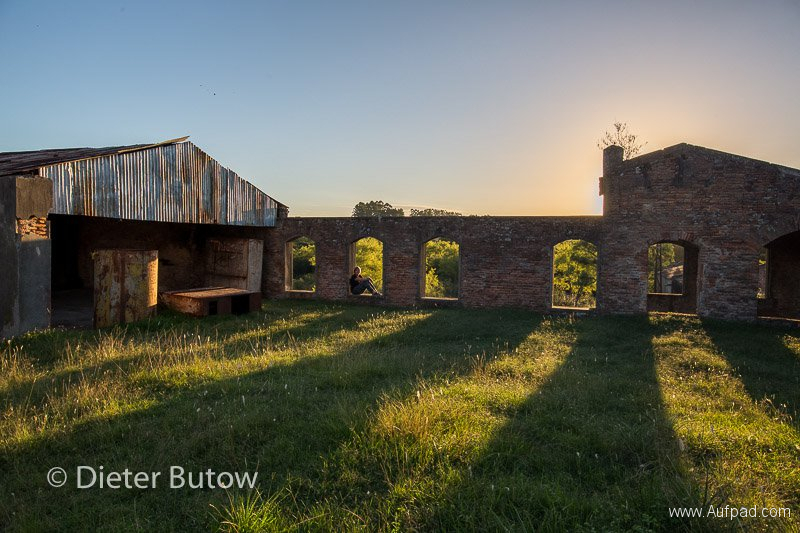 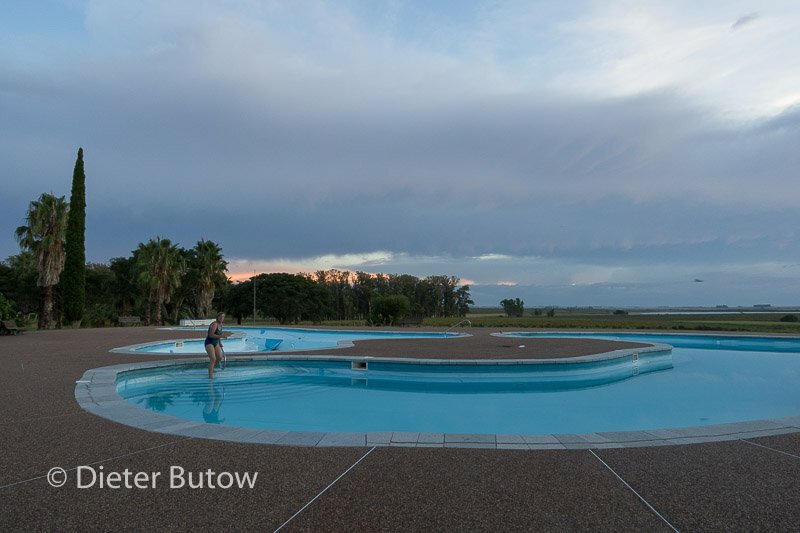 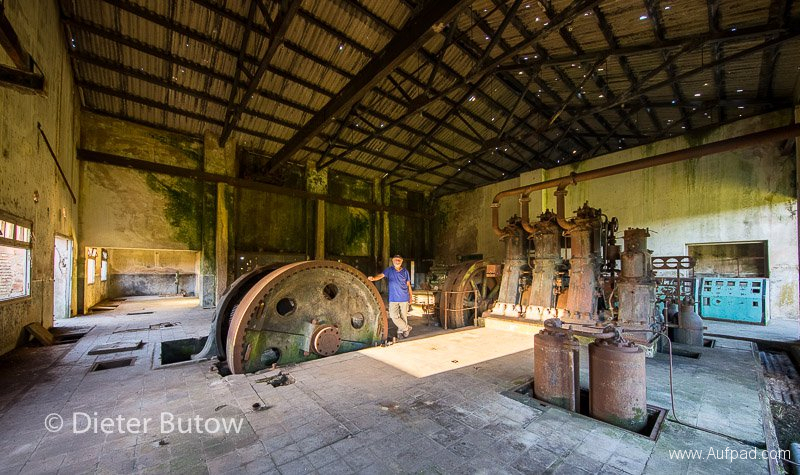 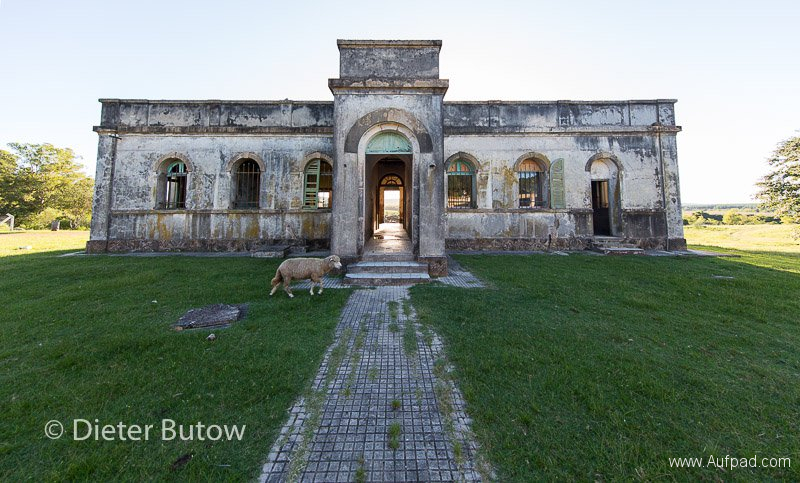 We entered Uruguay and briefly stopped at the Termas del Dayman where there were just too many visitors – so we continued to a beautiful and quiet stop at Termas San Nicanor further on. It was a pleasant camping site with good ablutions and many birds around including the Ñandu, a smaller version of an ostrich. 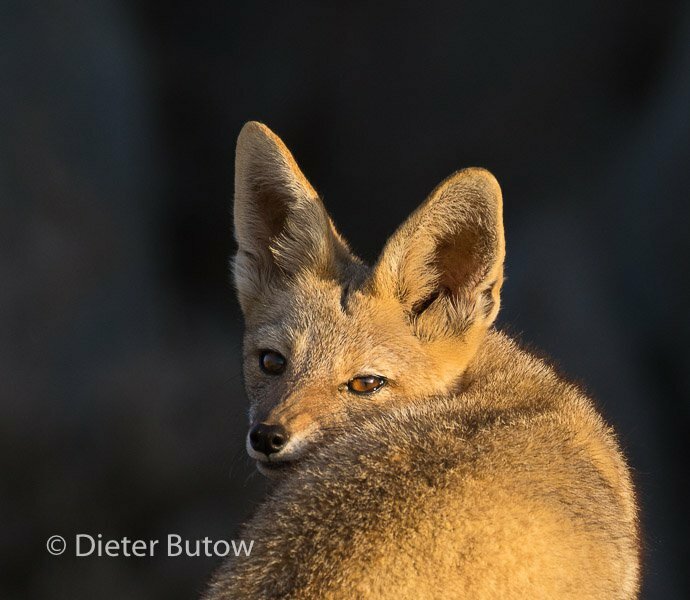 While we held our braai at the camping site, the dog belonging to the lodge shook and possibly killed a skunk next to us – it was not a pleasant sight nor smell – a strong odour similar to carlic lingered on into the early morning hours. 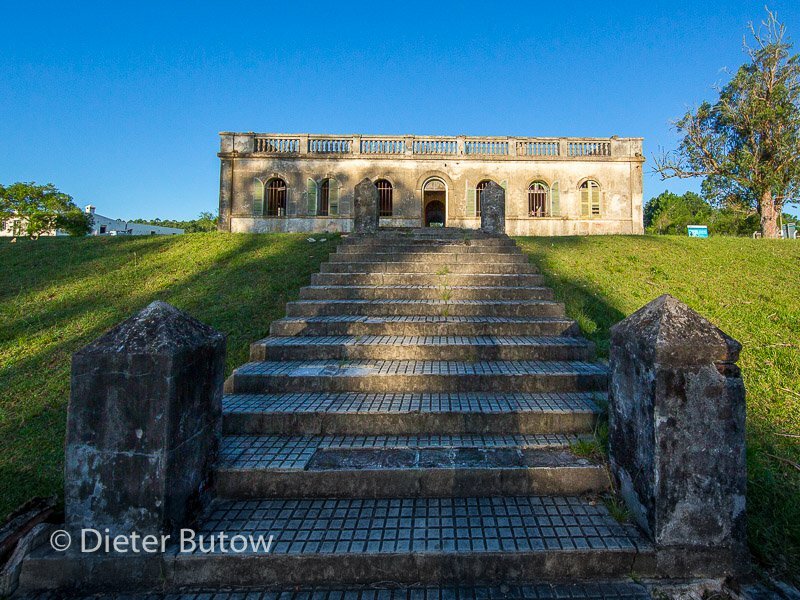 Nevertheless the evening bath in the termas under clear skies was absolutely magic. Following our successful exit and re-entry in Uruguay, we finally had the correct papers to leave the vehicle until March 2018. 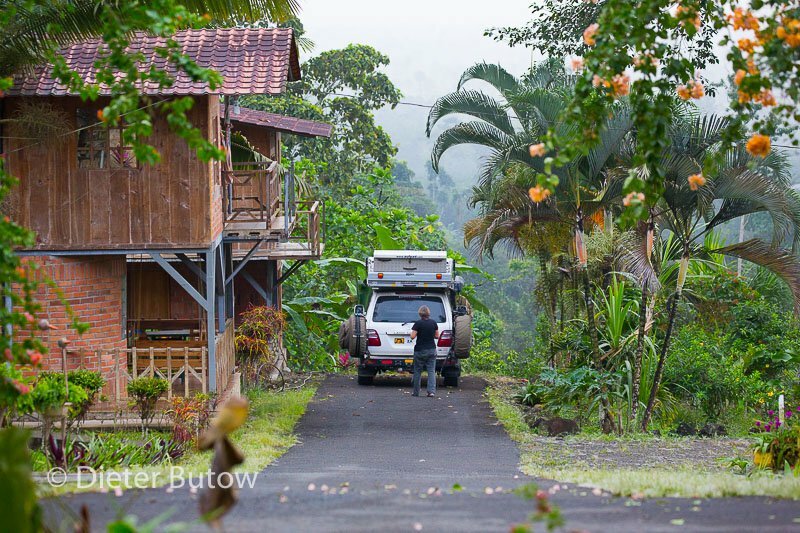 We drove on to the Termas Guaviyú, our next stop for the night. 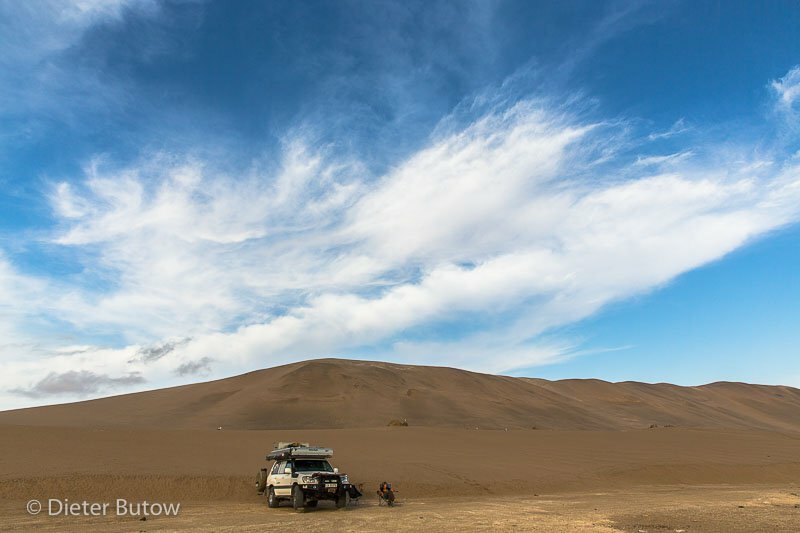 The area was huge – we camped a little distance away from the crowd of holiday makers and had a large area all to ourselves. 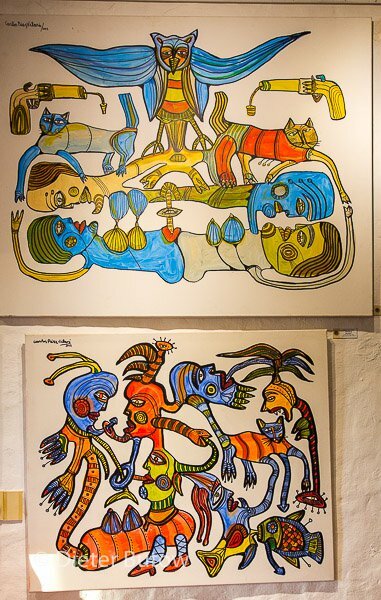 Some mozzies in the evening, customary shower of rain early morning. 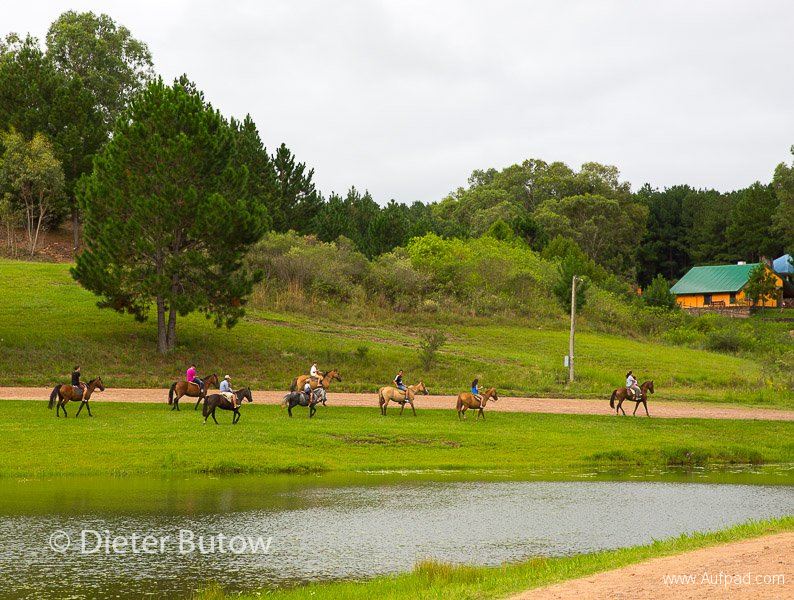 We continued on Ruta 3, then turned off at Lorenzo Geyre towards Tacuarembó and after a pretty boring stretch, did some shopping in Tacuarembó and found an idyllic spot at a Laguna to the north, inside a small forest of pine trees. 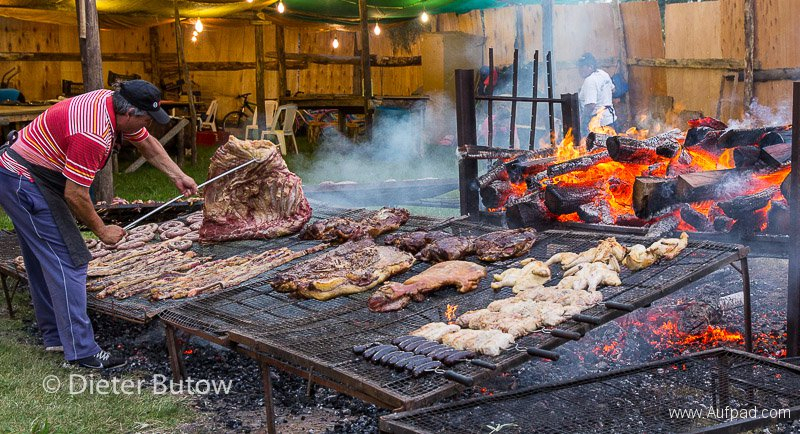 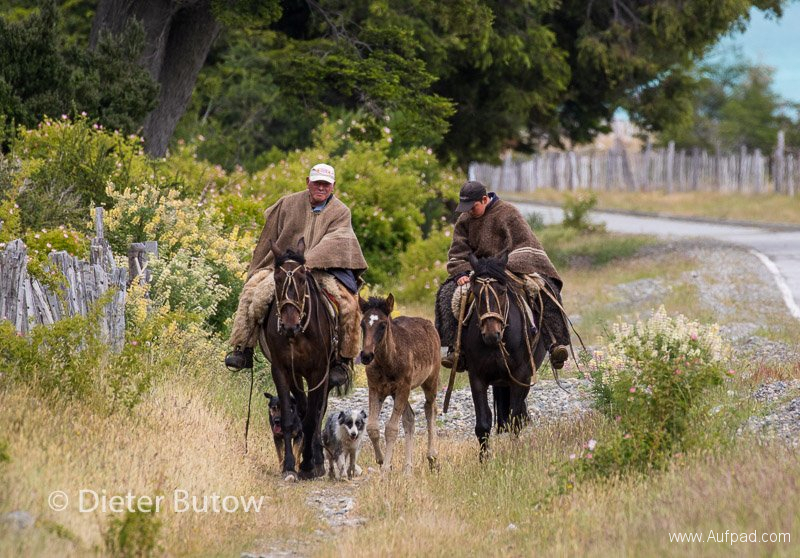 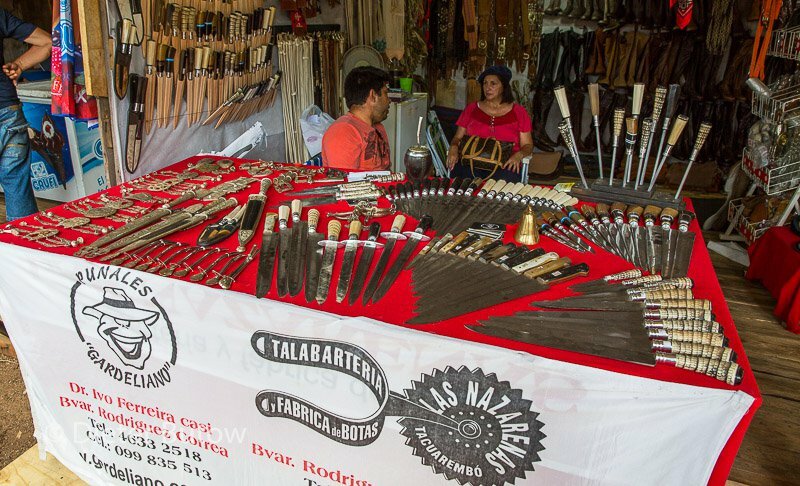 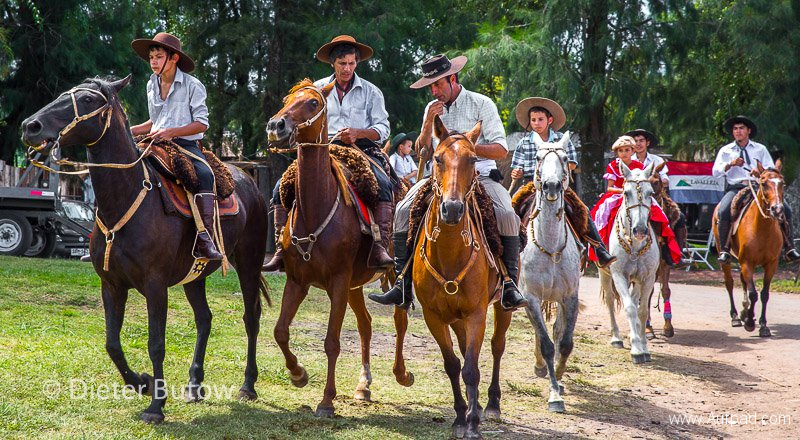 A local gentleman came to run his dog in the forest and informed us, that the well-know Uruguayan national Gaucho festival/feast, the Fiesta de la Patria Gaucha, would start on Thursday. 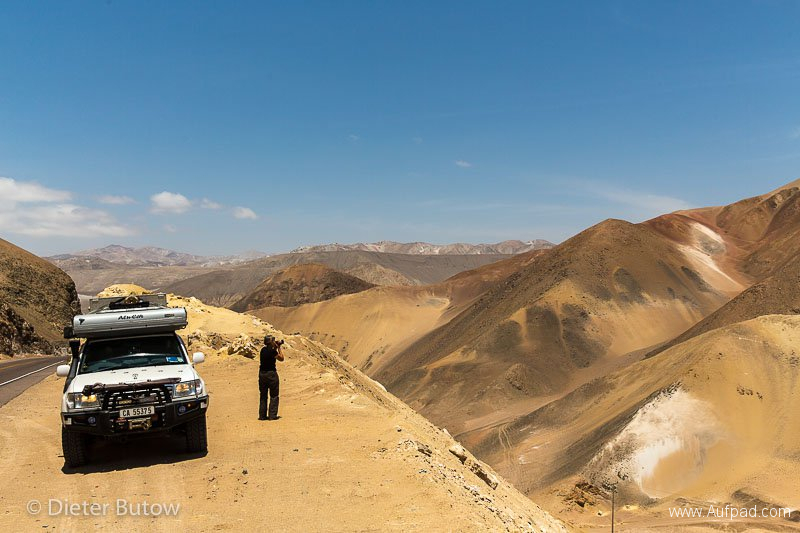 As we decided to stay and pass time, we starting looking for the cave Gruta de las Helechos (ferns) but never found it, the drive through the hills nevertheless compensated for the effort. 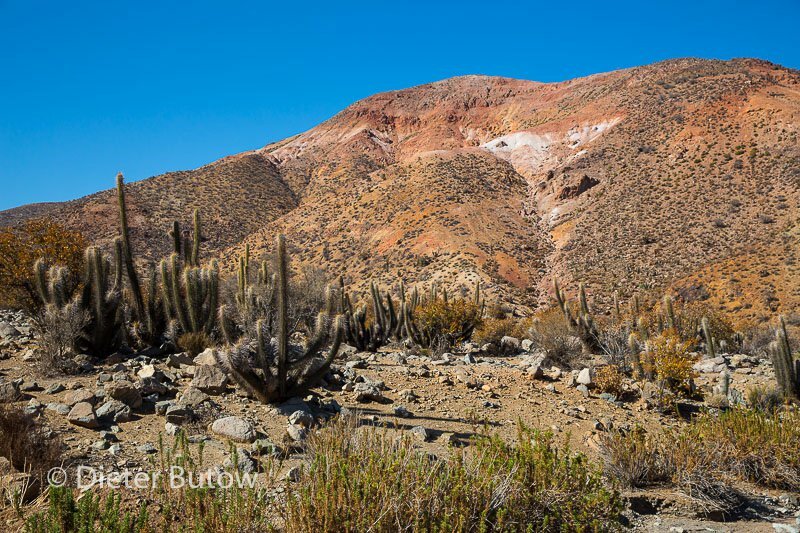 As we did not want to wait in Tacuarembó until the Gaucho Festival would start, we drove to an old, disused gold mine, the Minas de Corrales that was operational between 1867 to 1970 and is a protected sight now. 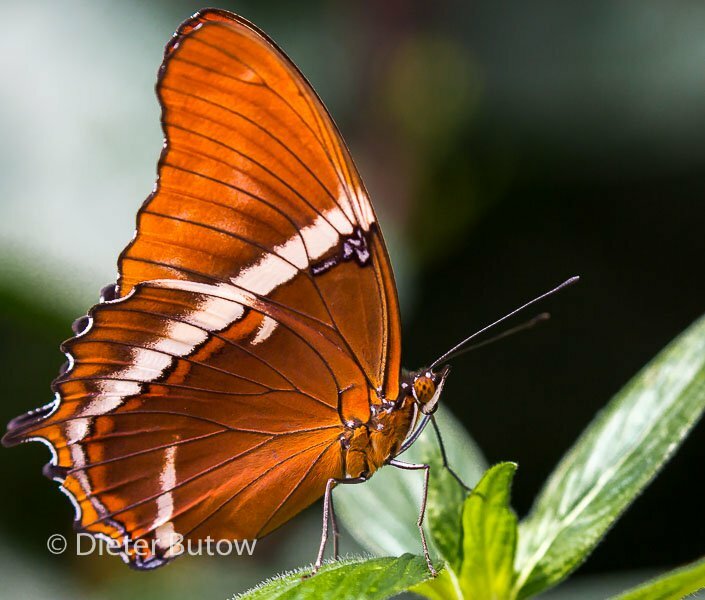 Originally mercury was used to process the gold, later they switched to cyanide. 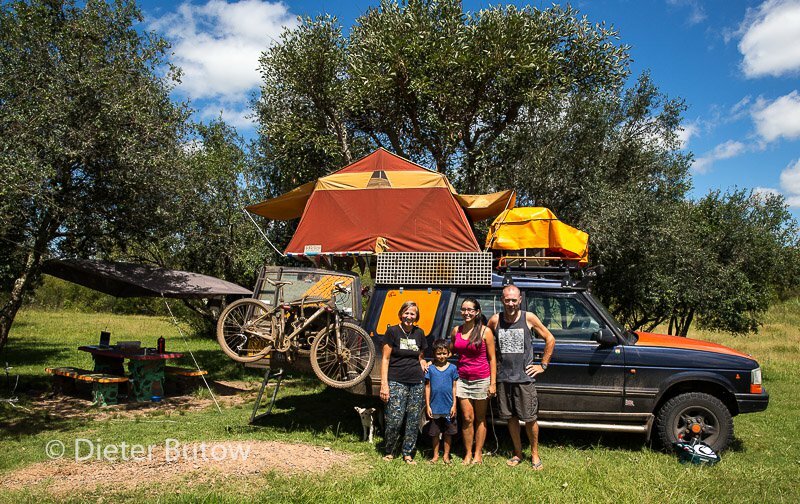 Here we met campers Darren Robert and Natalie Beltrán with son Teo (both had worked for Continental in Brasil) enjoying the drive through Uruguay and looking for new work opportunities. 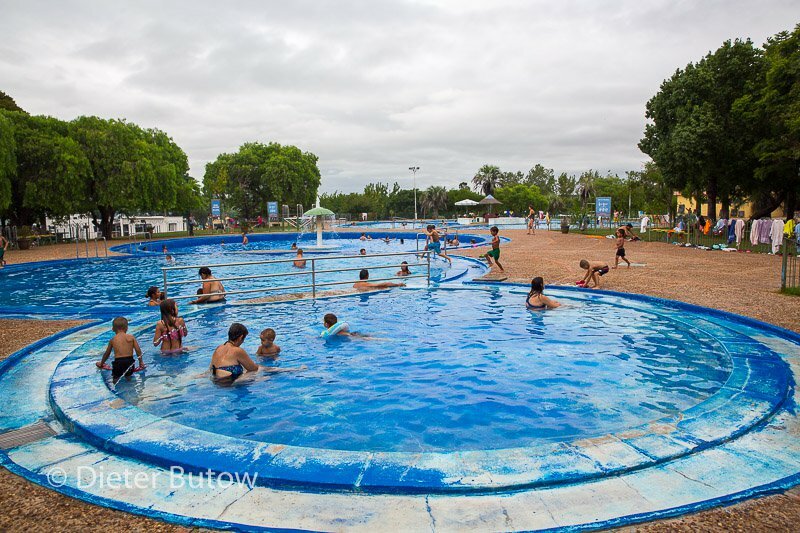 Since the showers were cold at the camping site we stopped at a service station next day, had lunch in the Gaucho steakhouse and took a hot shower at the truckstop for 45 Peso. 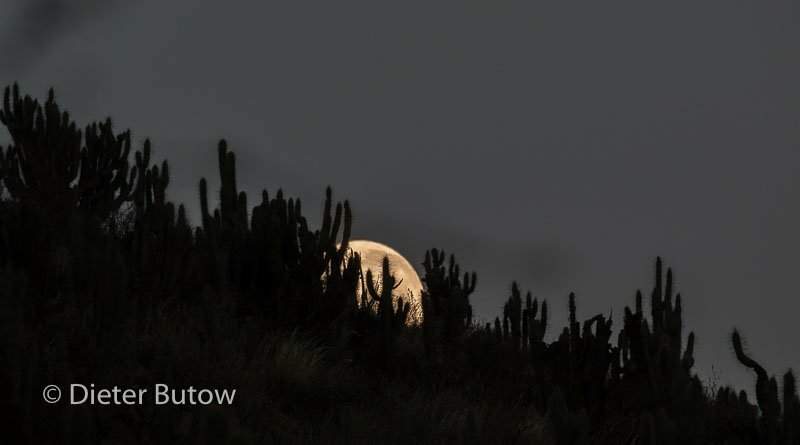 By evening we were back in our little pine forest outside Tacuarembó, again we had another very quiet night. 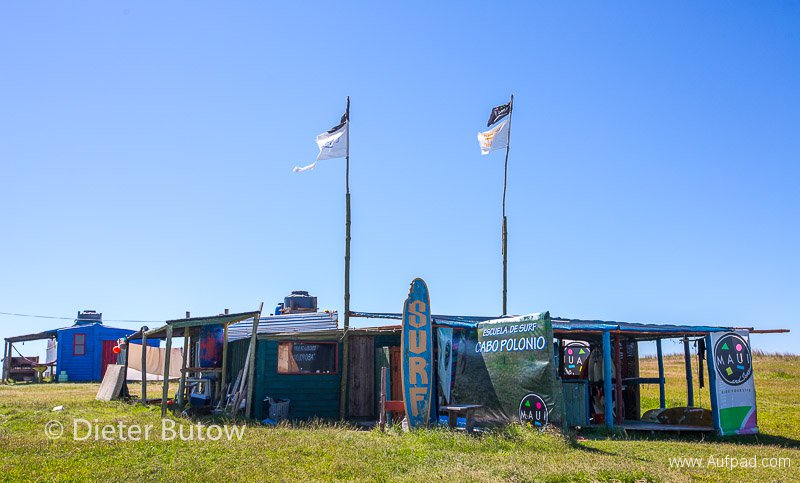 Not so the next : by late afternoon armed police searched for a villain in the area – we decided to move camp after they had requested us to phone 911 if he pitches up. 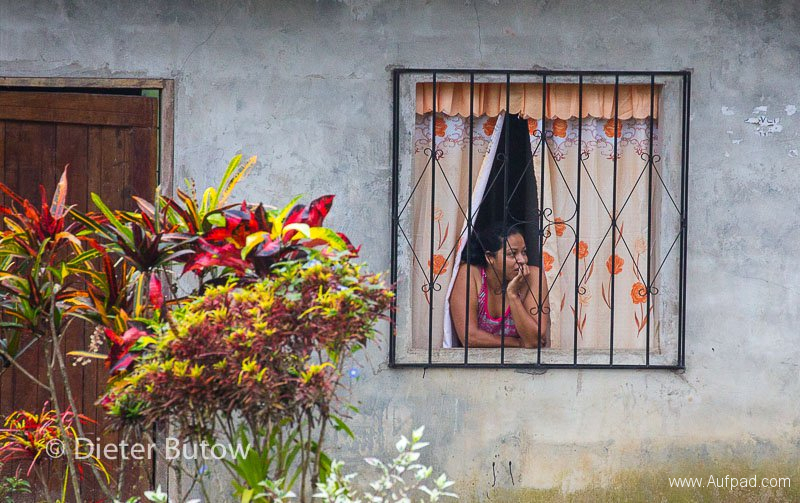 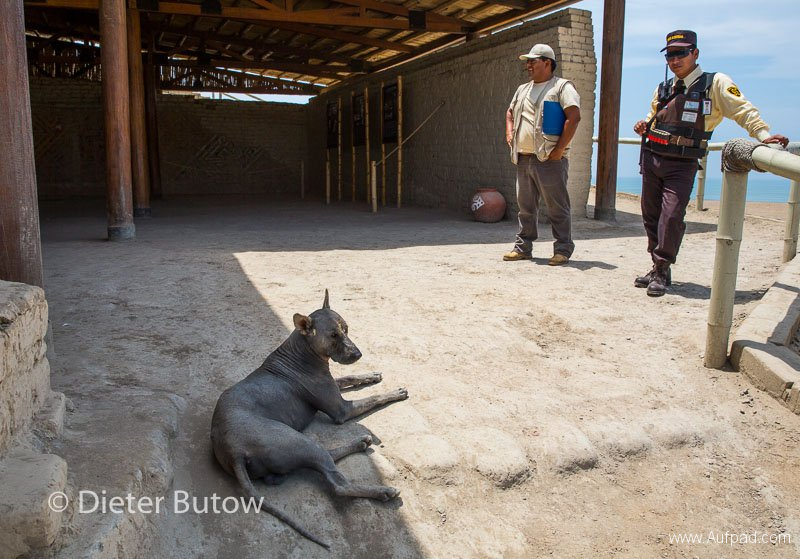 It was the first time in 10 months that we felt it would be safer to stay elsewhere. 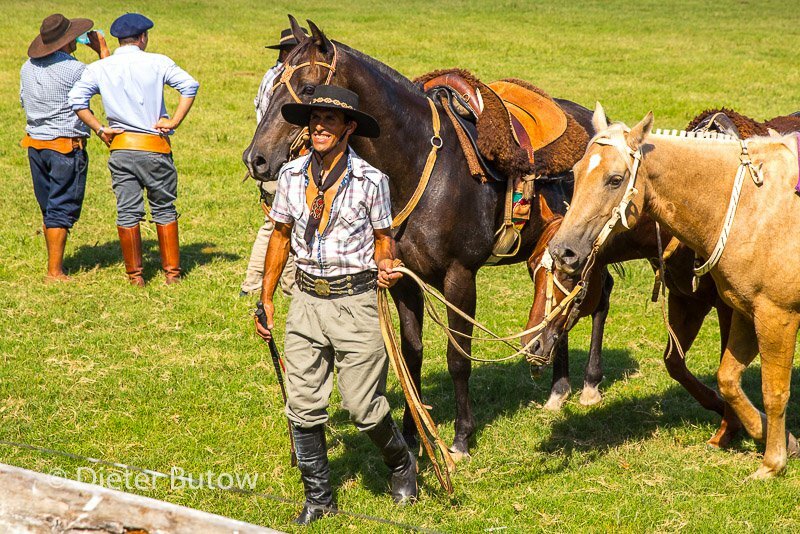 So we camped at Valle Edén some 25km away, close enough to return to the Fiesta de la Patria Gaucha in Tacuarembó the next day. 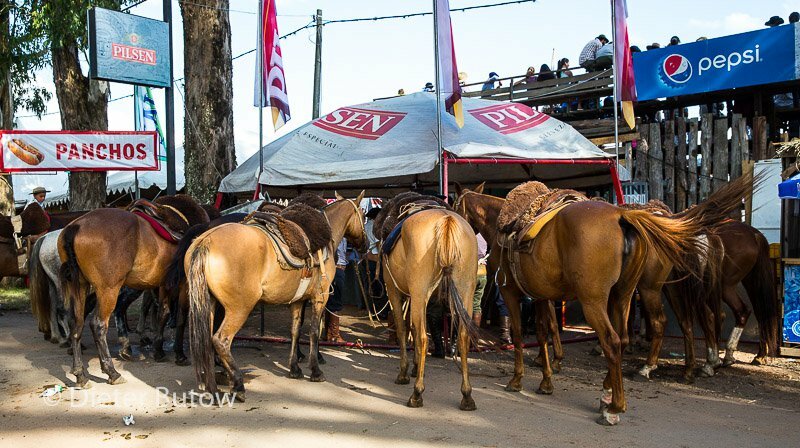 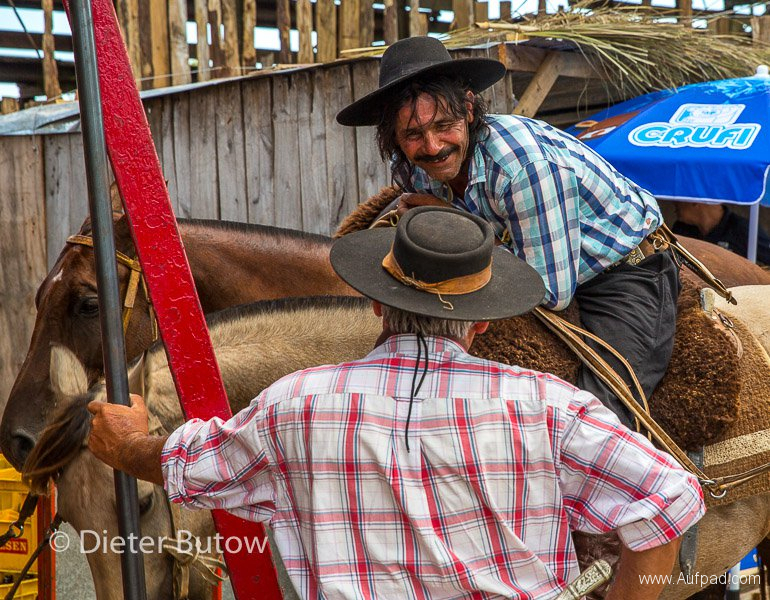 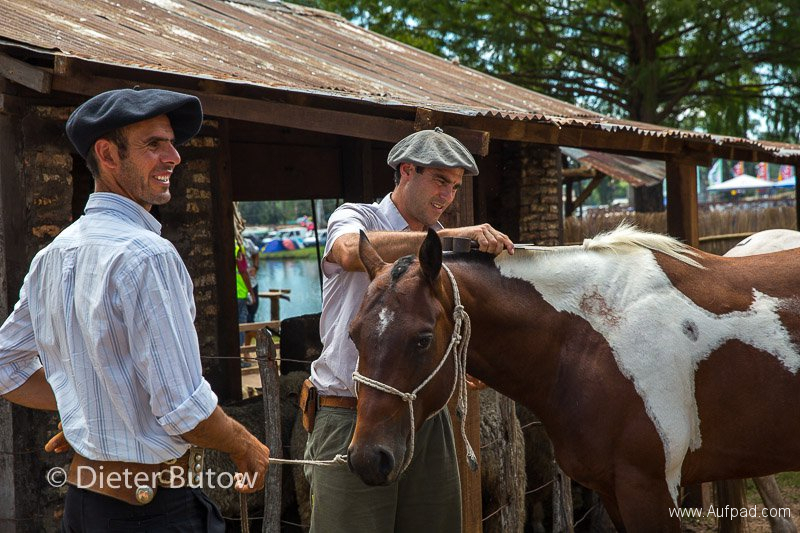 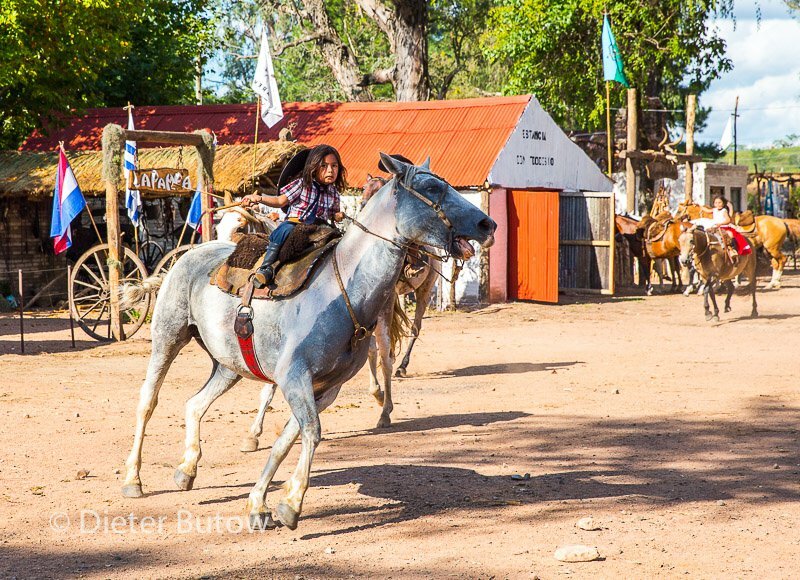 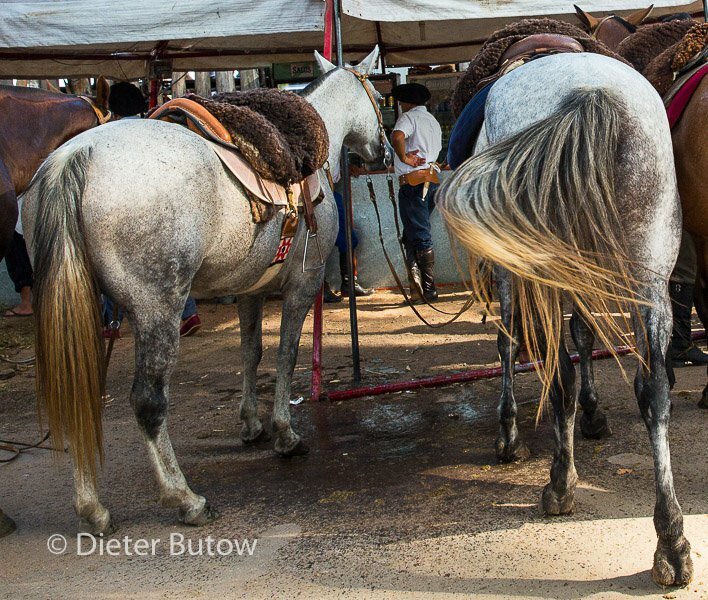 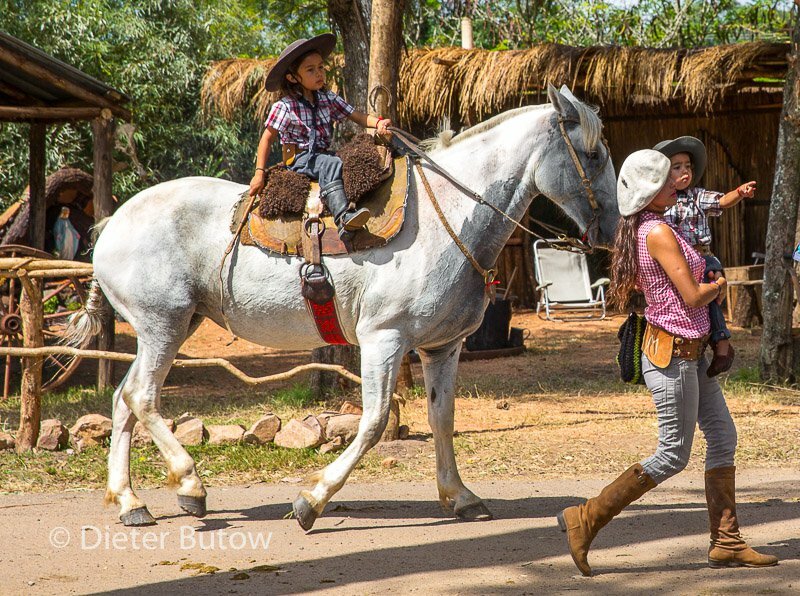 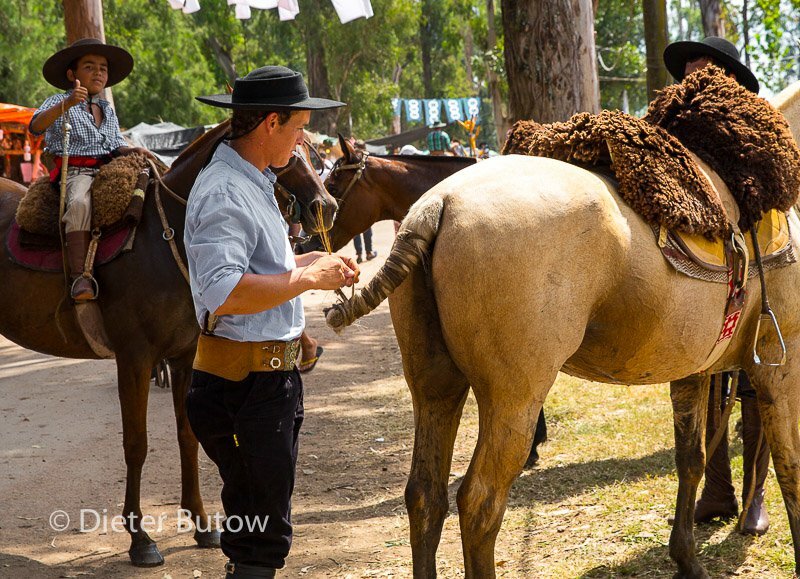 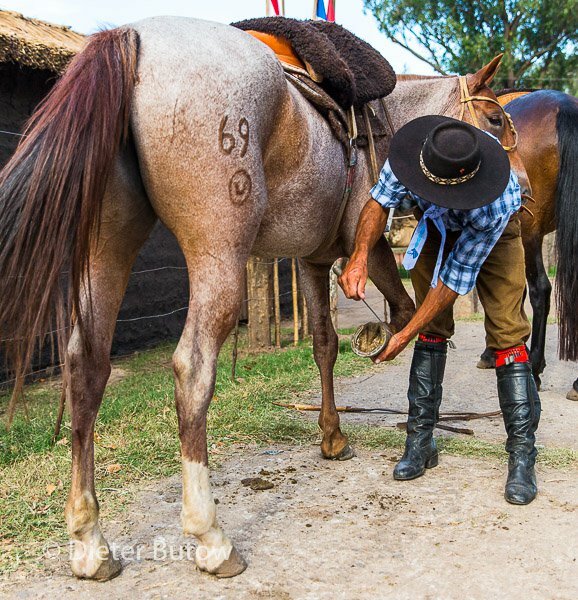 This national Gaucho festival was a sight to be seen, especially since the riders starting at age 5 are already participating. 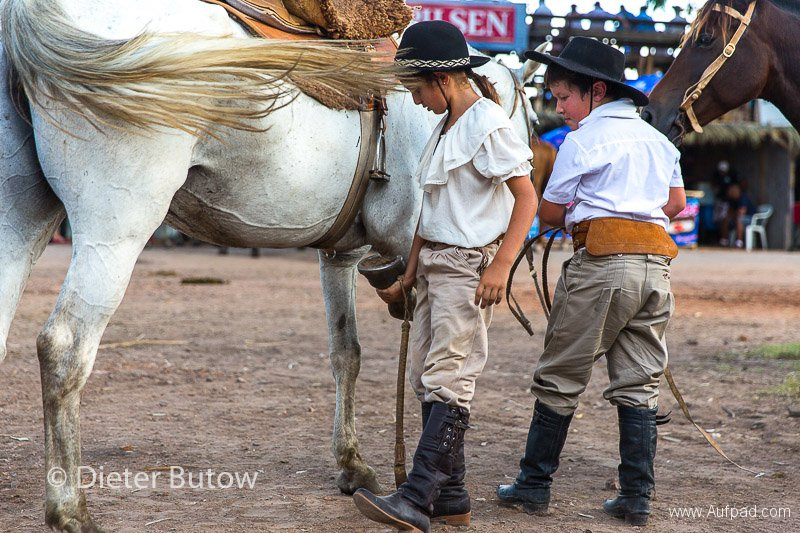 We sometimes wondered whether they had been glued to their saddles, so proficient at this young age. 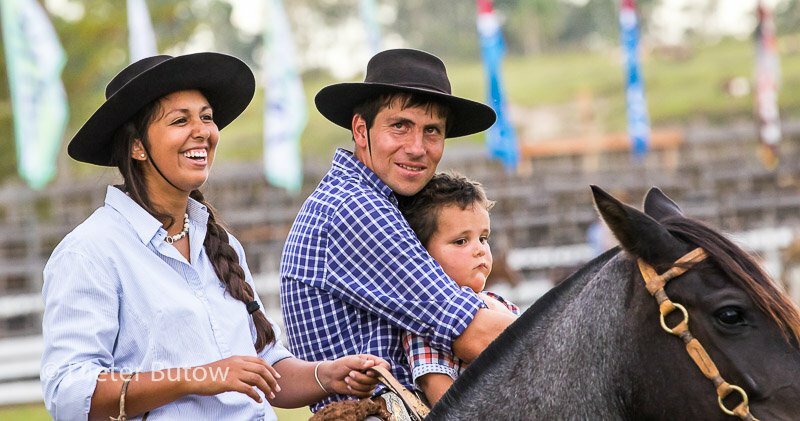 We spent the day enjoying the Gaucho atmosphere and traditions and watched the youth perform. 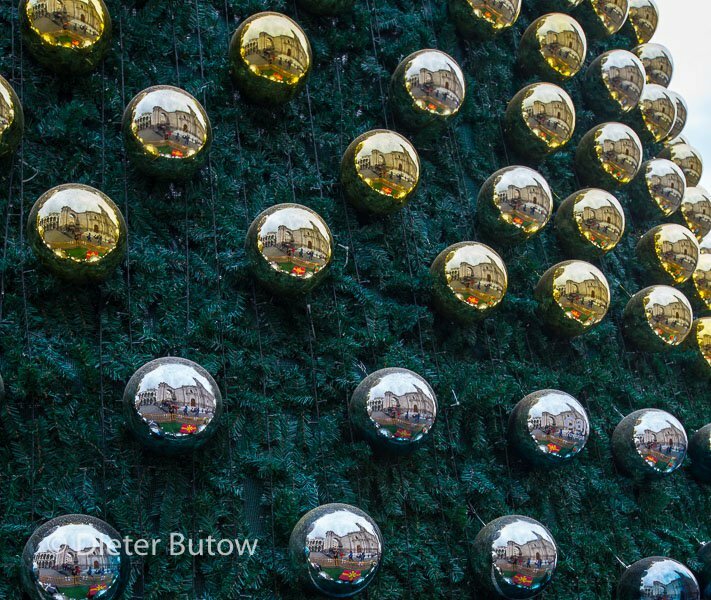 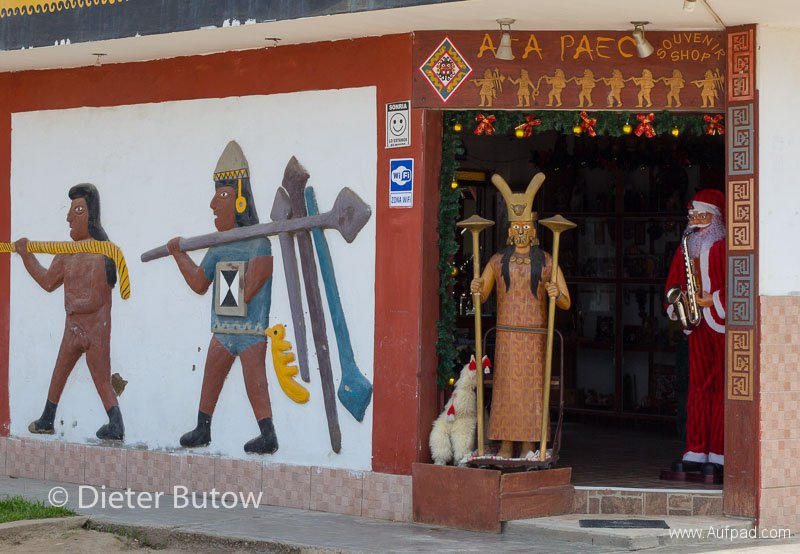 A small village had been erected to display the way of life and old traditions. 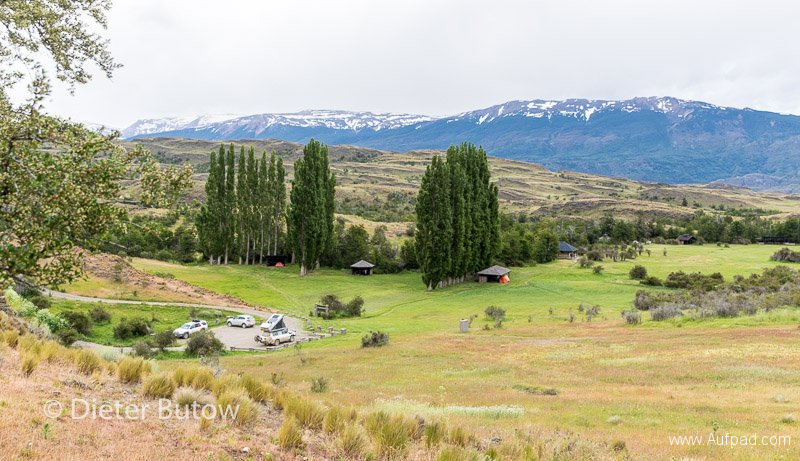 For the night we returned to Valle Edén. 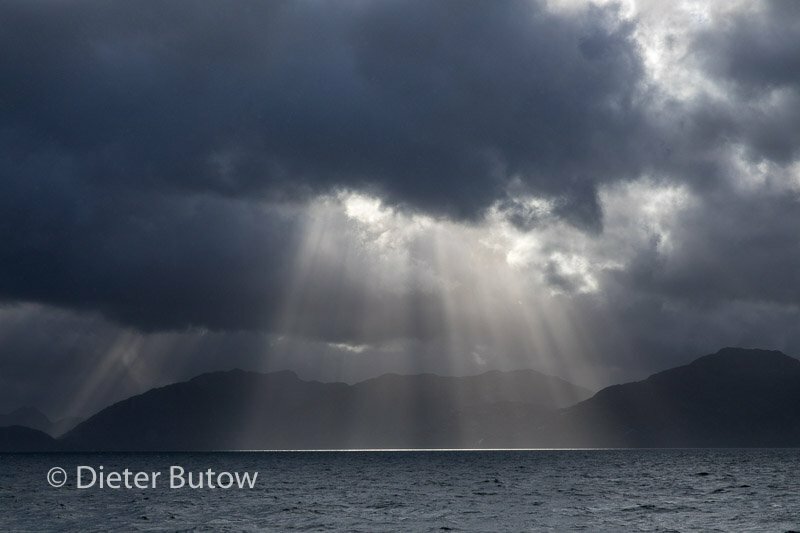 Next morning the heavens opened up. 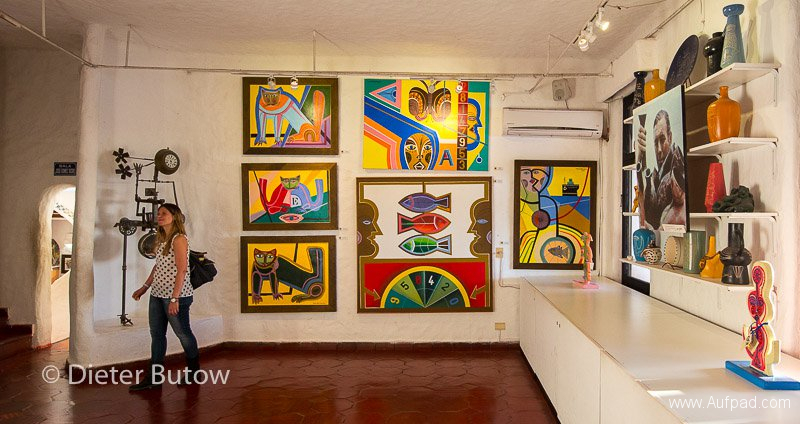 We briefly visited the Museum for Carlos Gardel – (1890 –1935) who was a French Argentine singer, songwriter, composer and actor, and the most prominent figure in the history of tango. 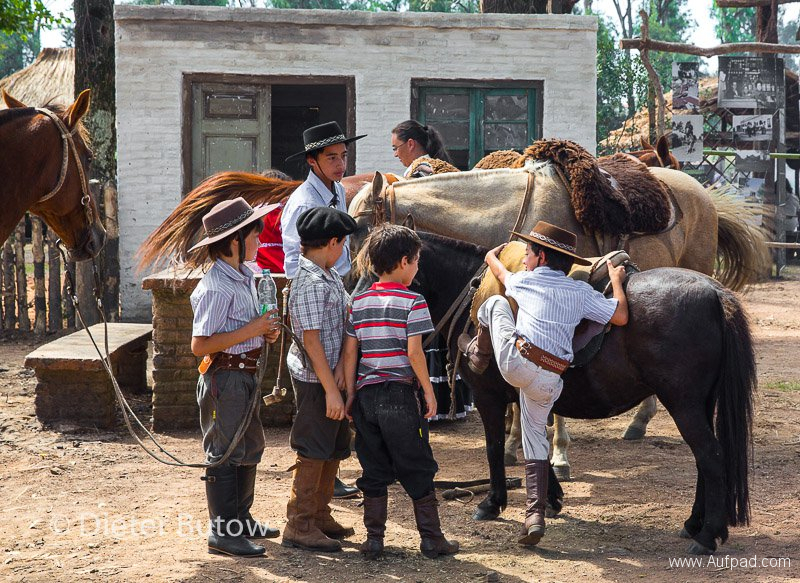 Visiting the gaucho festival this day seemed impossible due to the incessant rain so we decided to continue via Ansina Melo to Trenta-y-Tres where we found free camping on their municipal site. 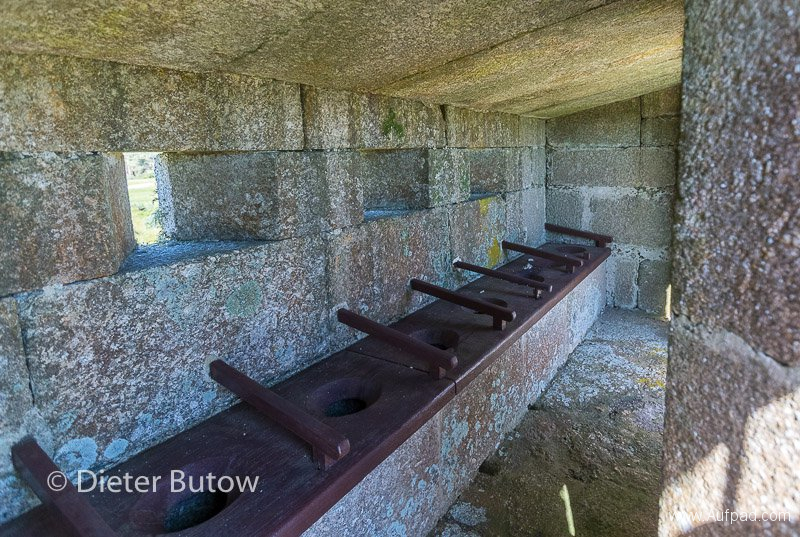 A fairly noisy night with lousy ablutions. Our Spanish teacher, José, had taught us, that a beautiful woman in South America is “guapá” -we started understanding this expression. 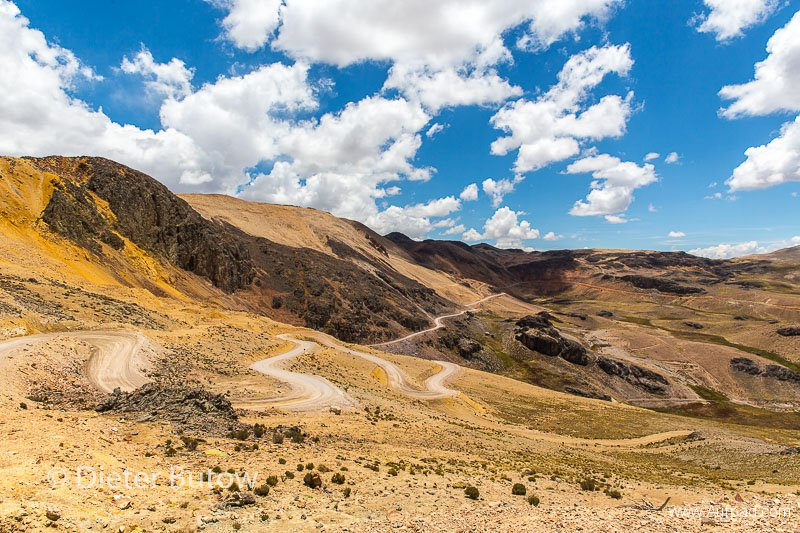 We decided to drive on via Pedro Varela, Lascarno and in the direction of Coronilla on a rural dirt road. On the way a large agricultural machine came towards us, it was as wide as the road and we had to pull off to the side – promptly sinking into mud and down to the axle. An oncoming truck had to pull us out as we could not get back up the embankment. 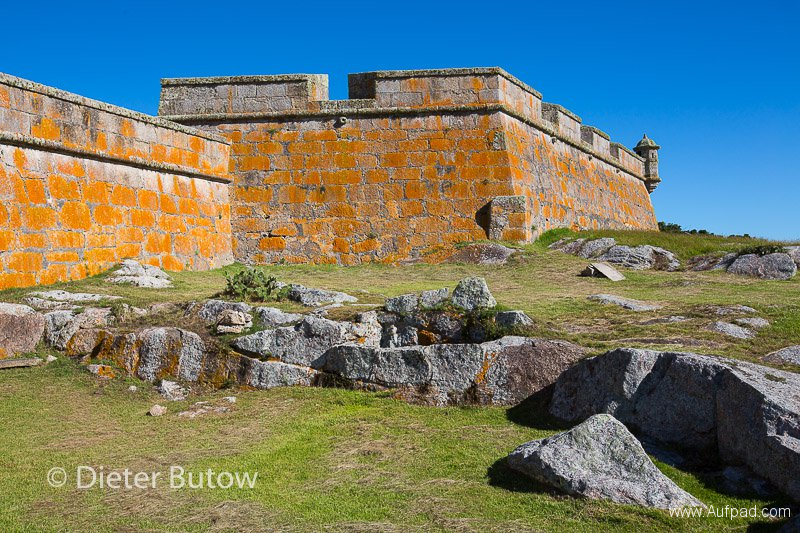 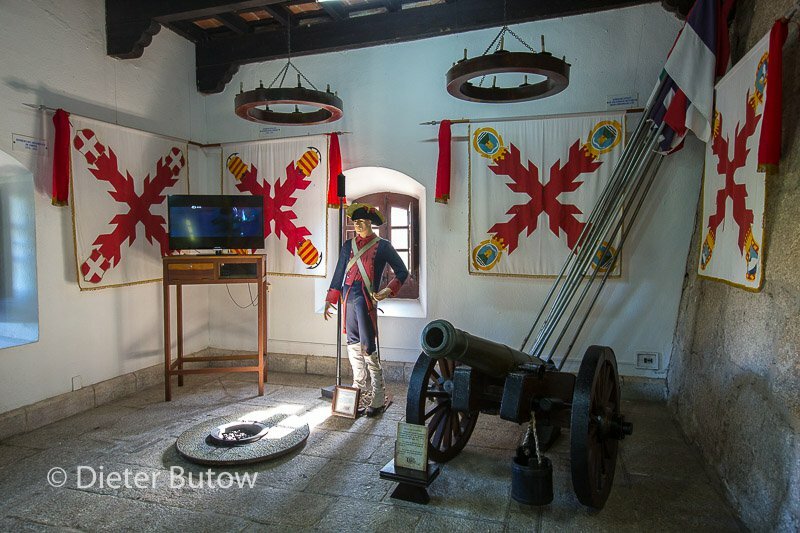 As Coronilla had no camping possibility we pressed on to Fortaleza de Santa Teresa (1762-1793), a beautifully restored fort that saw much action between the Portuguese and the Spanish. 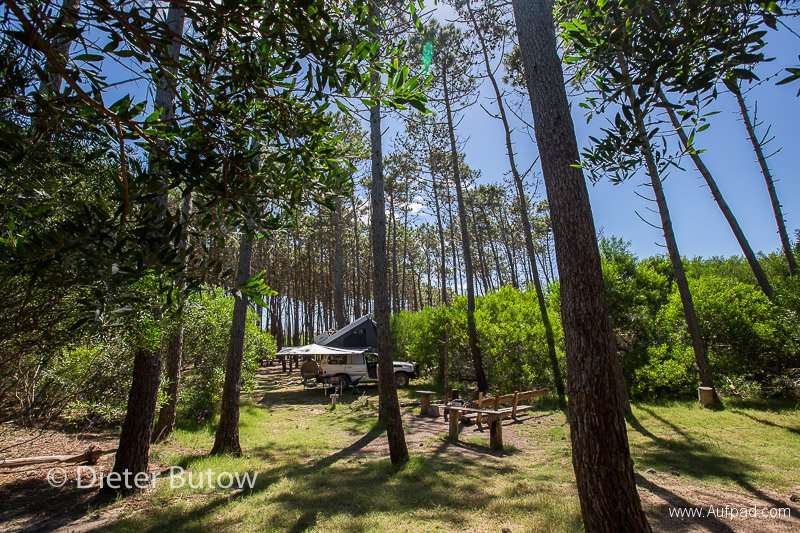 Not far from the fort is a large natural camping area along the sea which can host probably 500 or more campers in the season. 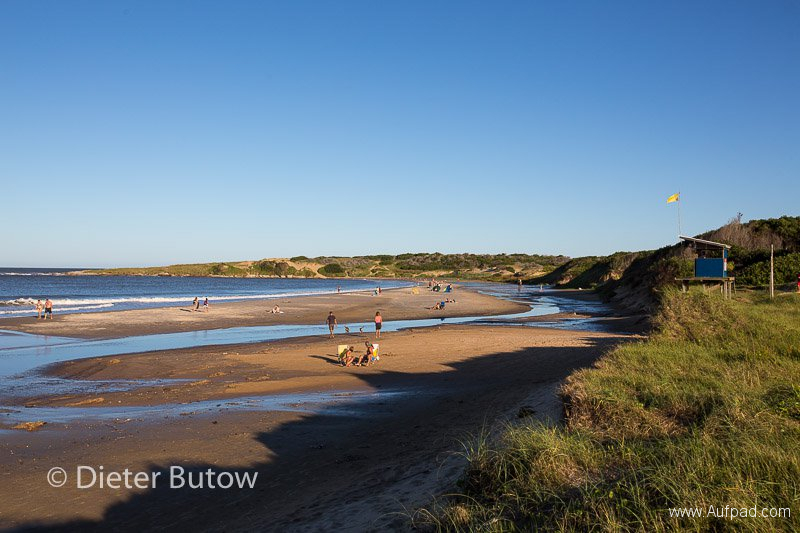 Since school holidays were over, it was empty and we found an ideal spot among trees close to Playa Grande – in walking distance (2km) over a dune or two to Punta Diablo where we already had been 10 months earlier. 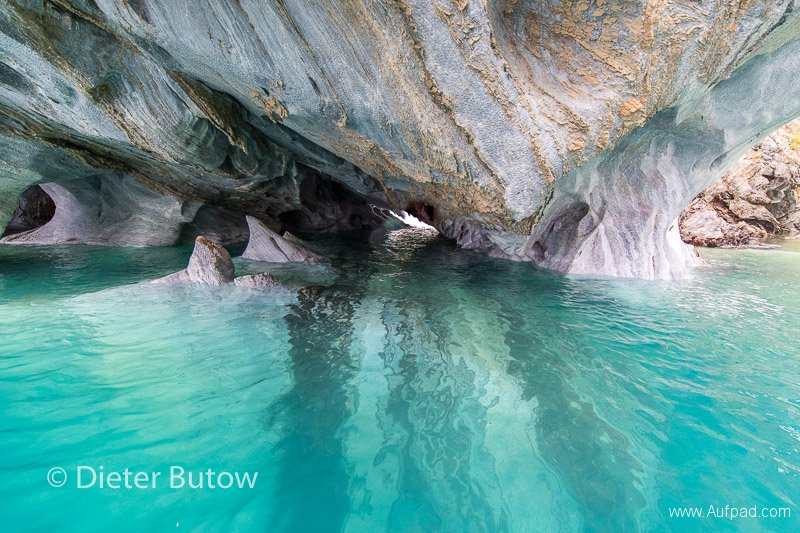 The water was warm here and offered safe swimming with no currents. 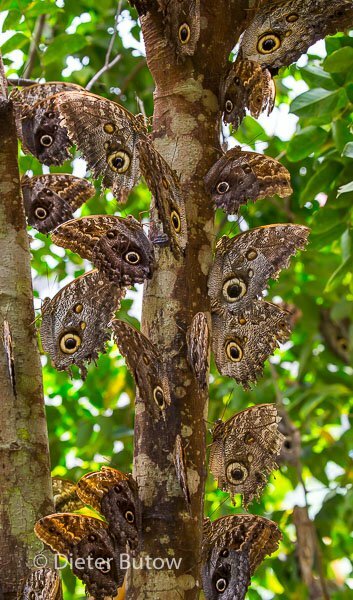 Every day a new surprise. 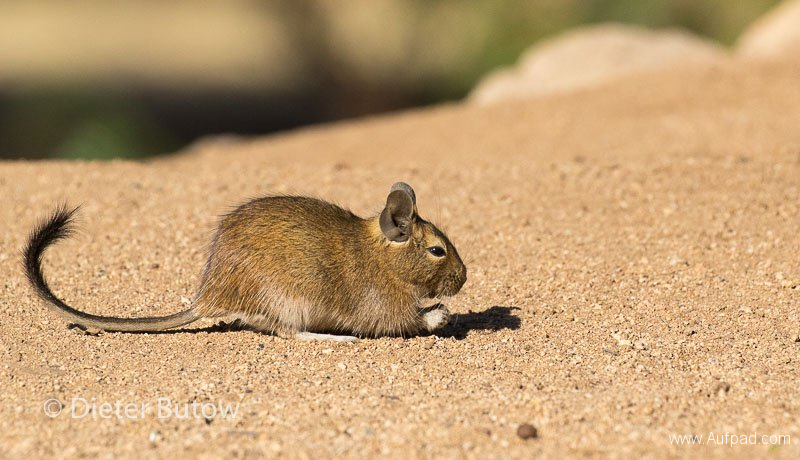 Who would have thought a national reserve existed for rodents? 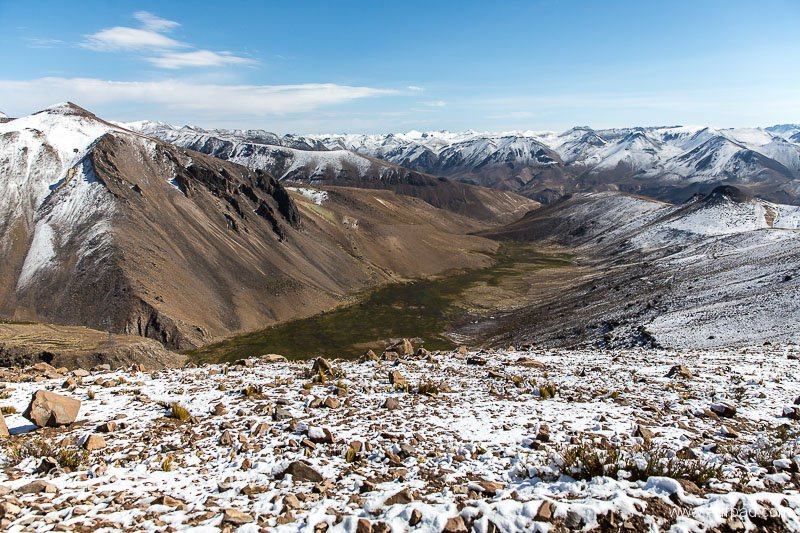 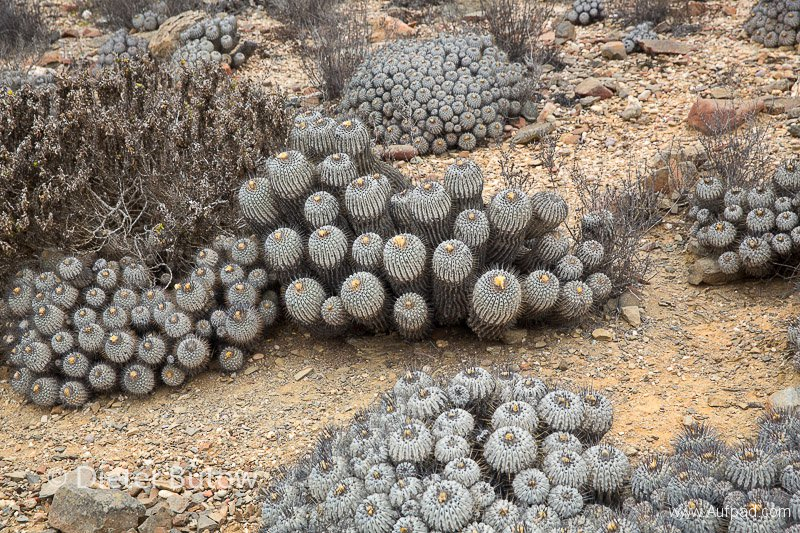 The Chilean Parque Naçional Las Chinchillas takes care of a species close to extinction. Manch einer mag sich an die Modewelle der Chinchilla Pelze erinnern. 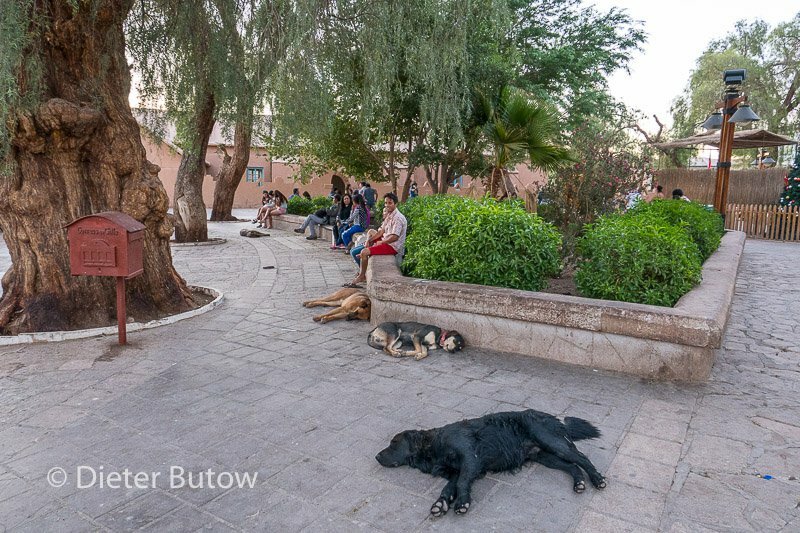 Auch hier hat der Mensch eine Tierart an die Grenzen der Ausrottung gebracht. 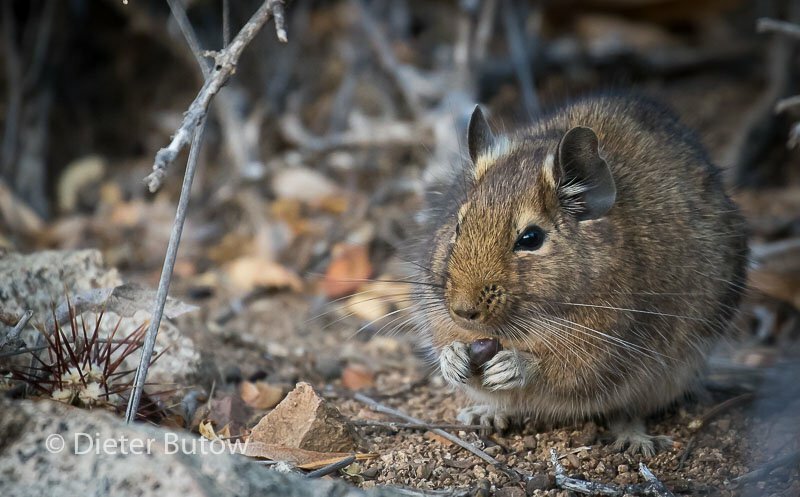 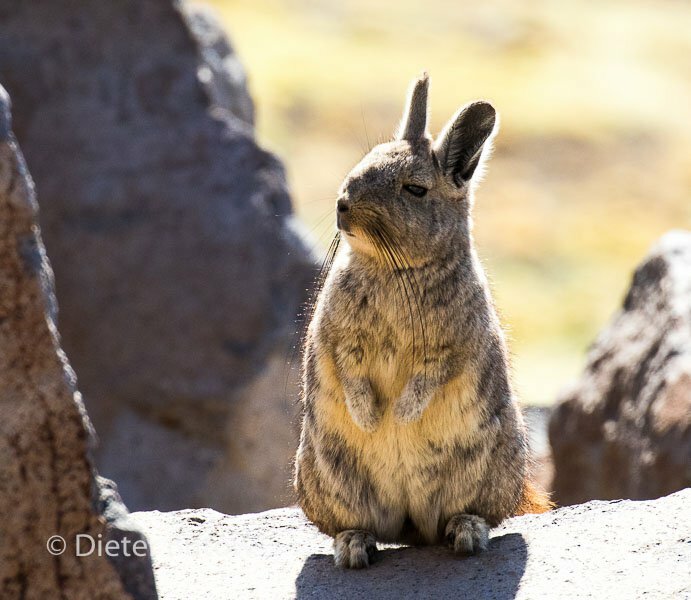 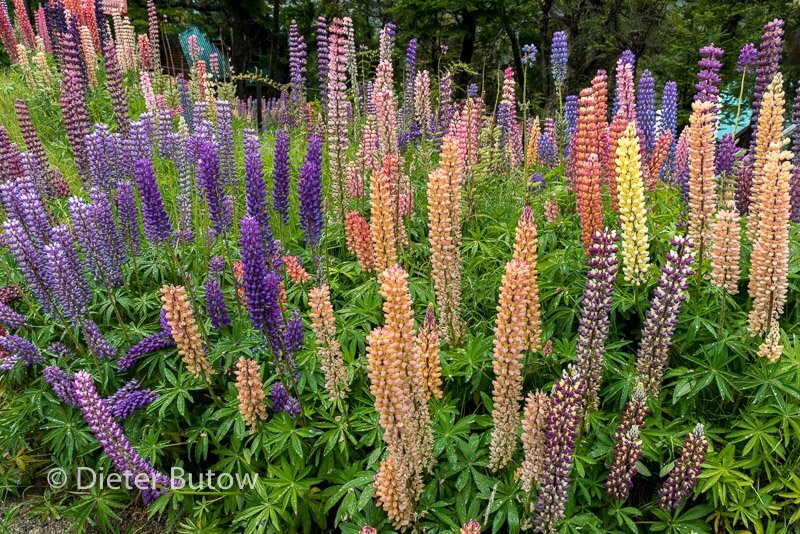 Ein einzigartiger Park in Chile überraschte uns mit seinen Anstrengungen, die wenigen Chinchillas zu retten, die es noch gibt. Our route took us back via Huasco, then via Valleñar on Ruta 5 to Serena and on to Coquimbo, which afforded a shopping opportunity at the Lider Supermercado. 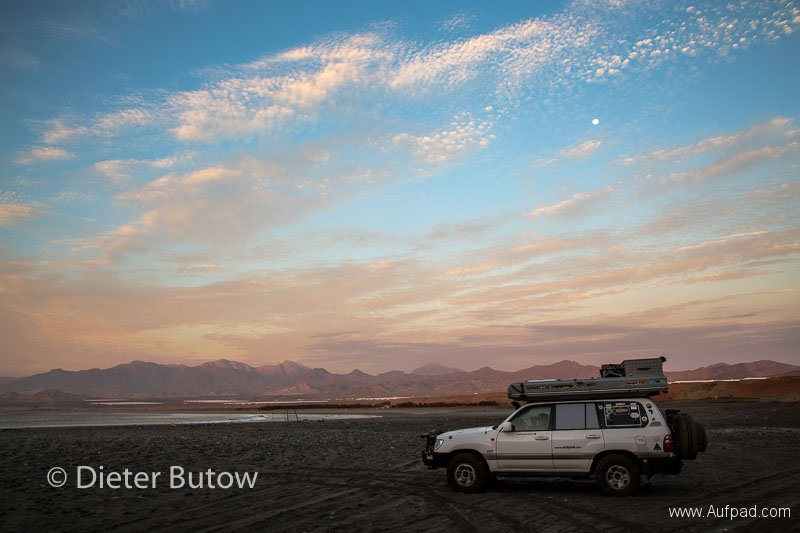 For the night we drove towards Guanaqueros, where we camped at the well organized and clean camping site Mar Azul, run by Hernan. 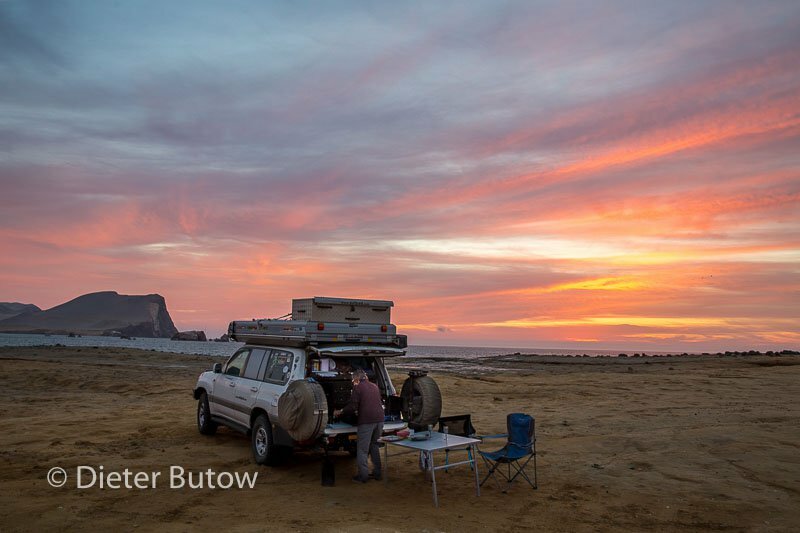 We parked less than 100m from the sea and spent a quiet night. 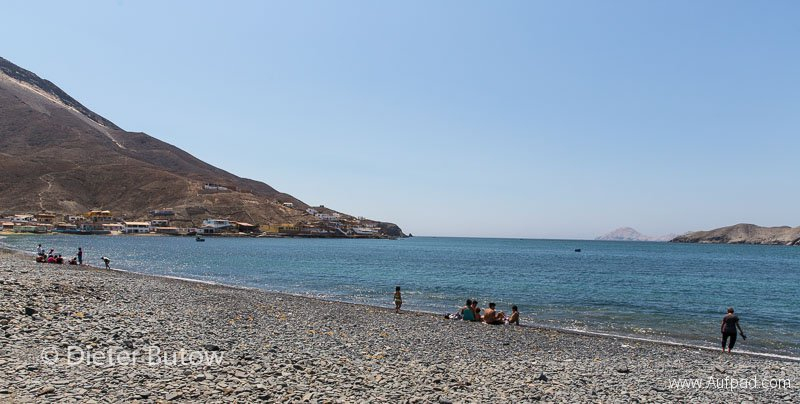 From here the harbour can be reached on foot, being a pleasant 1.5km walk along the beach. We took a stroll next morning and enjoyed freshly shelled raw scallops (tasting very similar to oysters) and subsequently stayed for lunch with a starter of seafood ceviche followed by one of the best, freshly prepared seafood empanadas at one of the stalls. 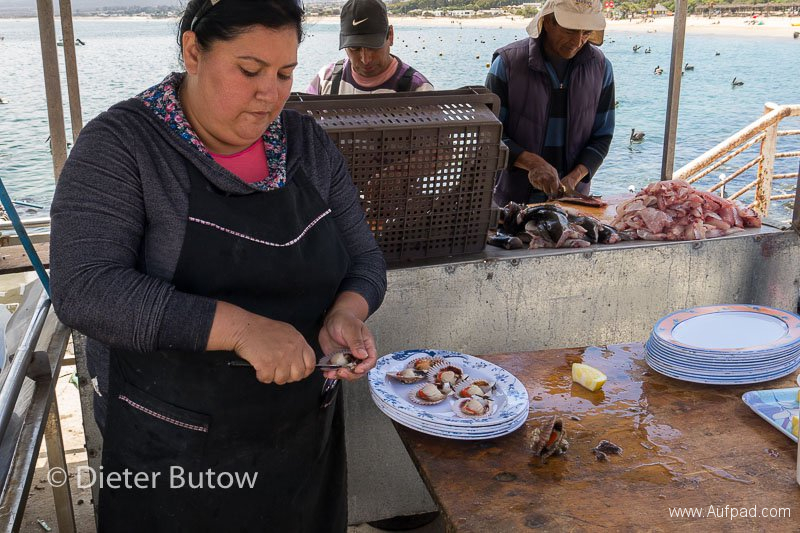 A note of caution: make sure the ceviche or camarones have been kept on ice! (a friend we had recommended this place to had a problem a few days later). 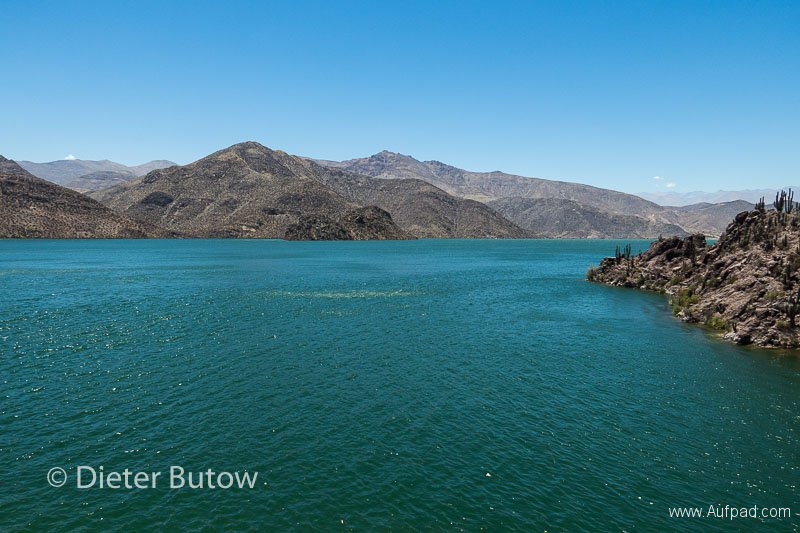 We returned to Serena and took the Ruta 41 eastwards to Vicuña, on the way we stopped at the Puclaro dam and took a stroll along the dam wall, strong winds prevailed. 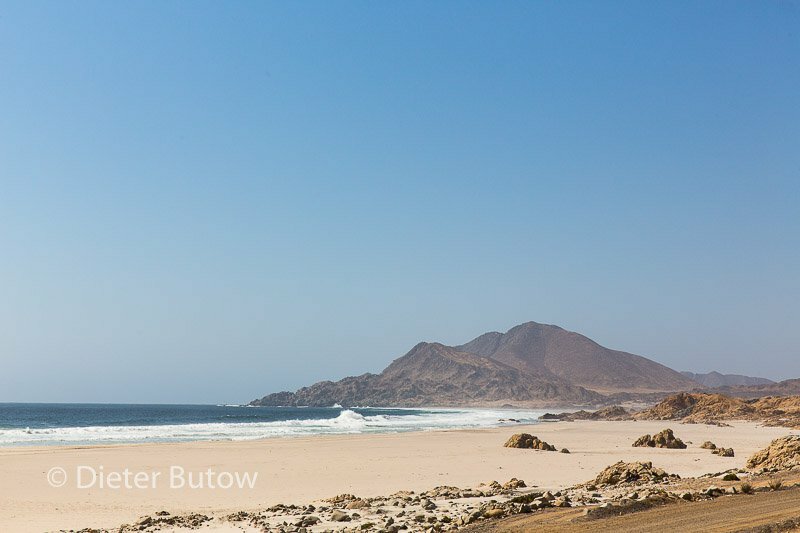 Although no kite surfers were active, it apparently is a very suitable expanse of water for this sport. 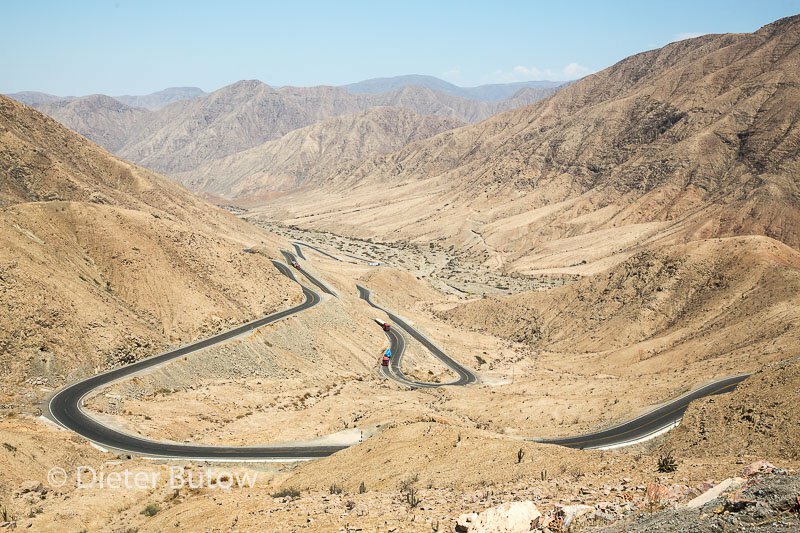 The area was arid, yet along the valley it is lined with vineyards and fruit trees right up to the little village of Pisco Elqui, a town wit its own pisco distillery and an abundance of little eating places. 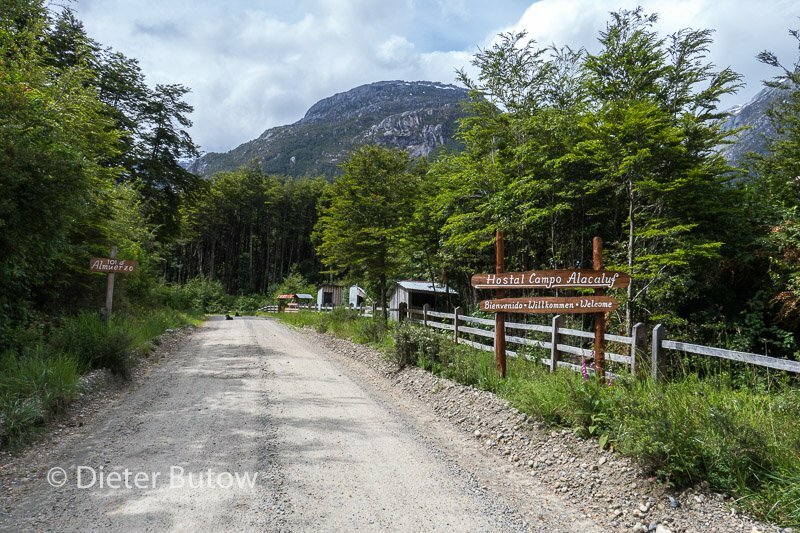 At our camping site Camping Refugio del Angel adjacent to the clear cold Rio Claro, we met our friends from Iquique New Years Eve party again – Laima and Mindaugas. 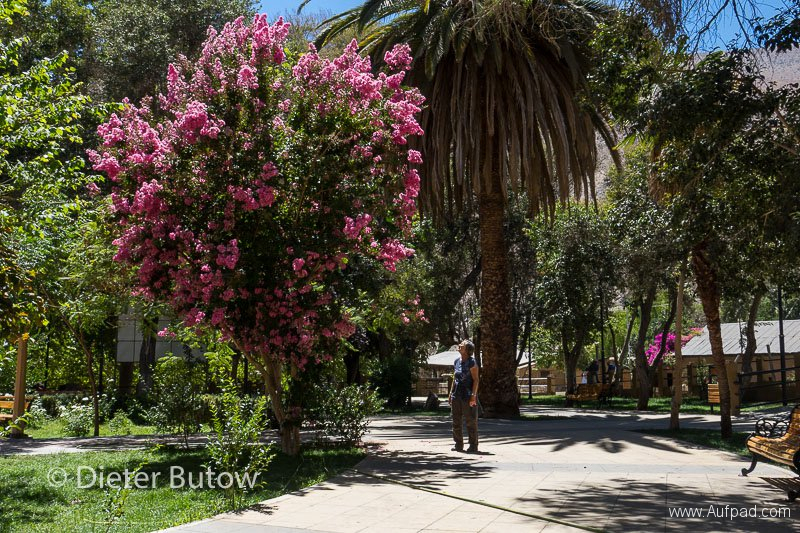 This was a good opportunity to enjoy a pisco for sundowner and a joint supper among the shady weeping willow trees. 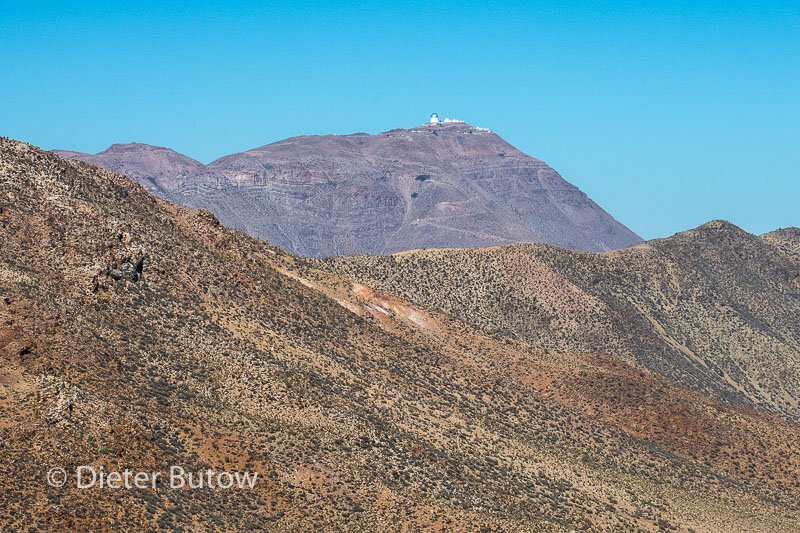 This area is known for its observatories that can be visited – we were not in luck as it was full moon. 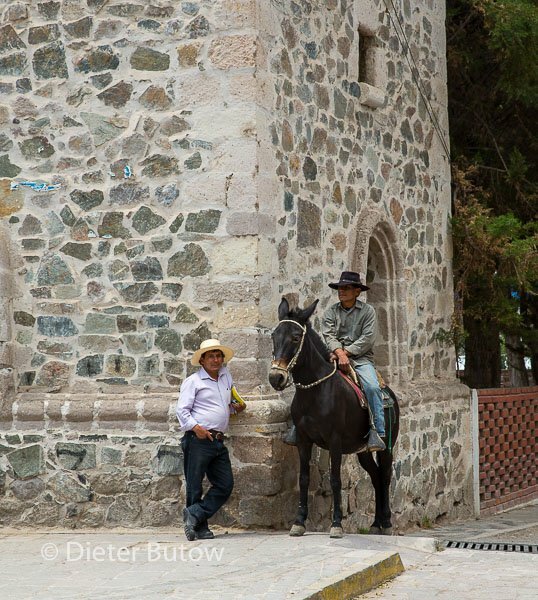 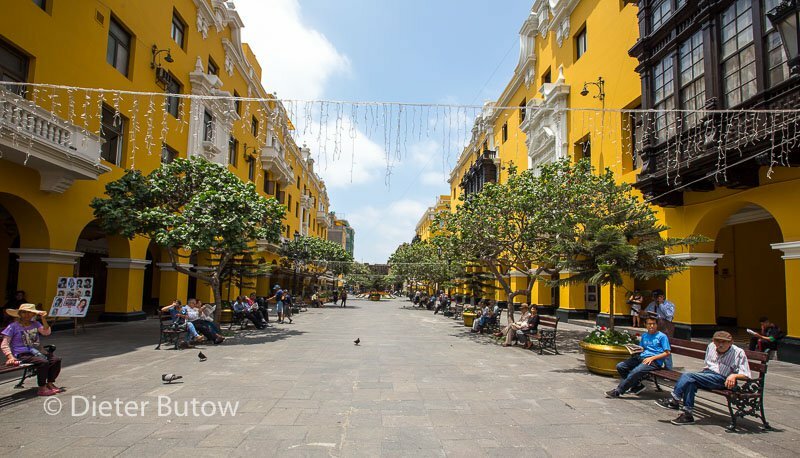 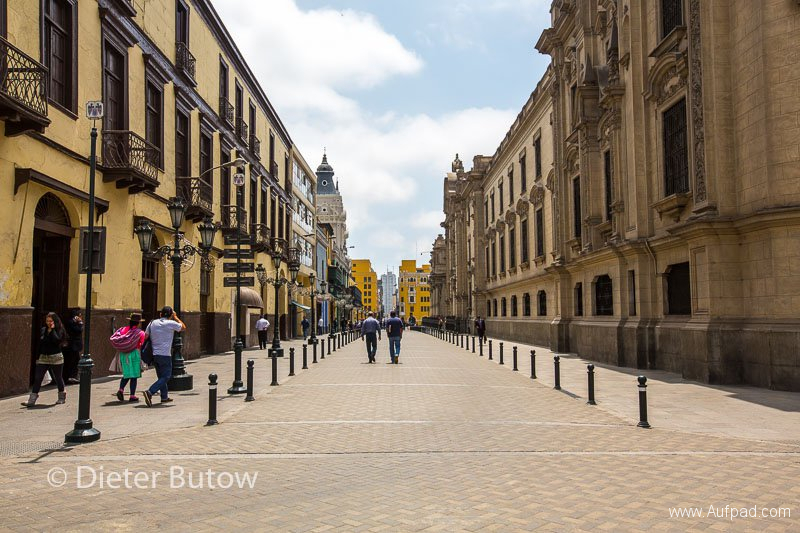 In the morning we walked through town, enjoyed a pisco ice cream on the shadowy plaza. 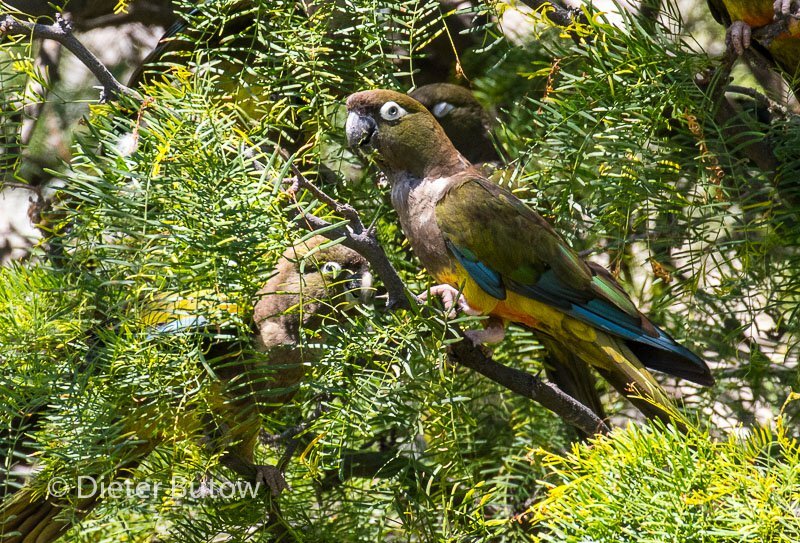 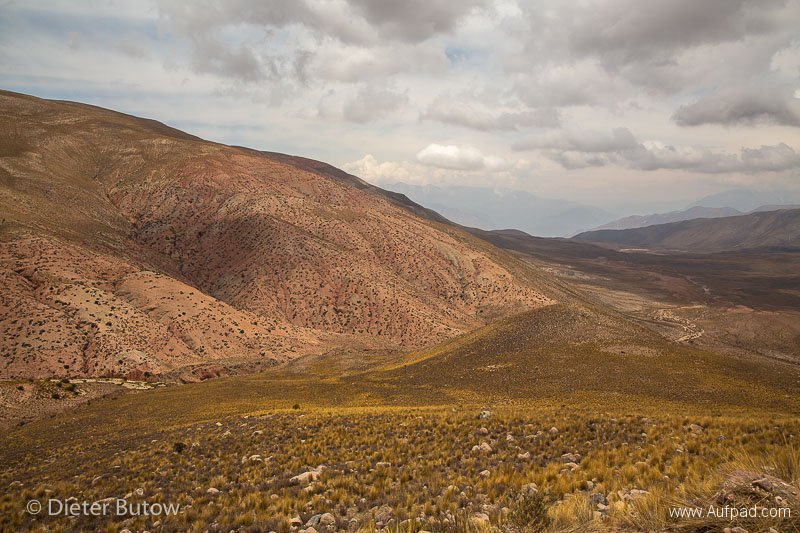 We found the camping site with its many trees a comfortable place to stay for the day and only left next morning back to Vicuña from where we turned into a small gravel road with plenty of mountain passes, cacti, colourful parrots and observatories visible on the mountain peaks. 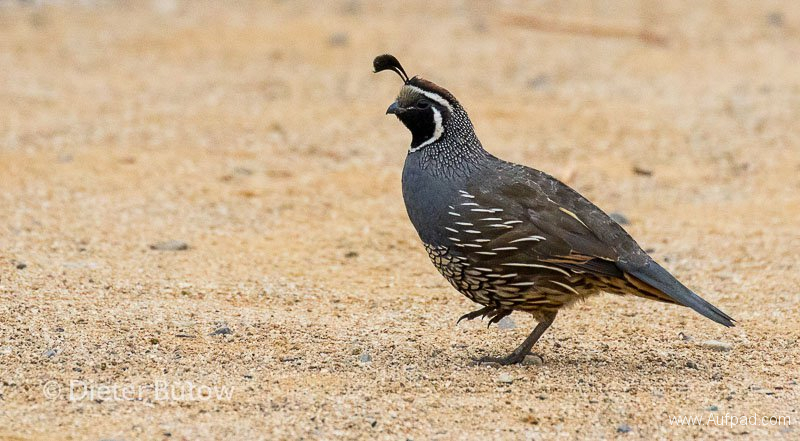 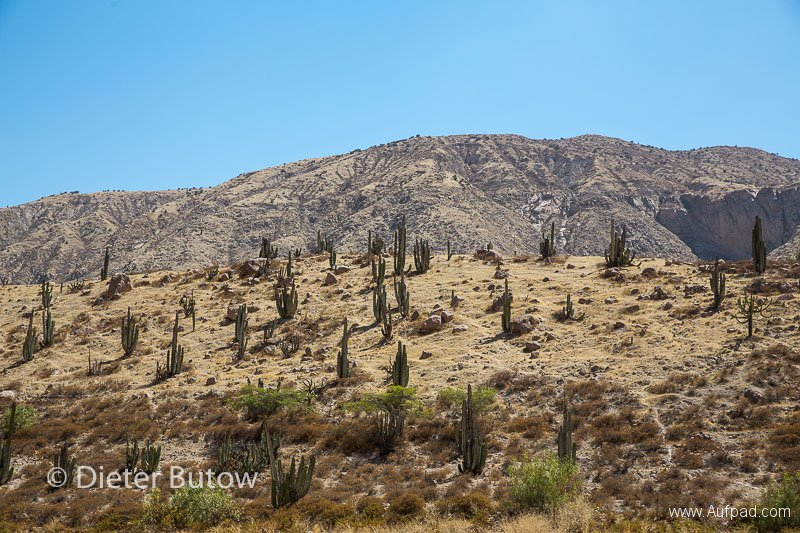 We drove past Ovalle and ended the day at the Parque Naçional Las Chinchillas – the friendly staff gave us special permission to stay for the night in the parking area. 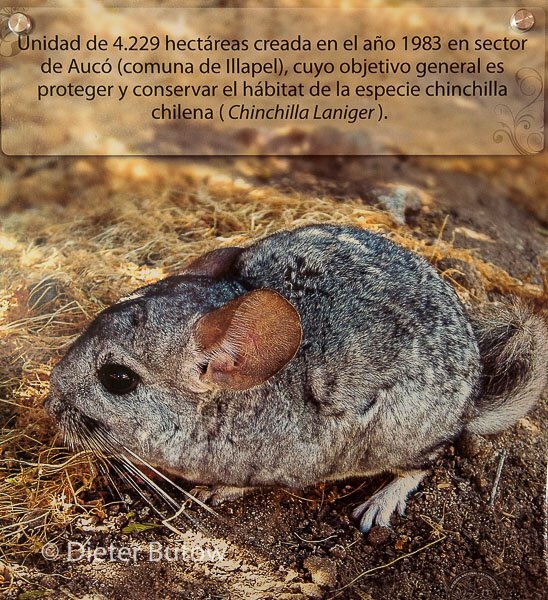 We were not aware of this reserve beforehand and it highlighted the plight of the Chinchilla to us: There used to be 20 million animals before it became fashionable to wear pelts made of the fur of this little, nocturnal rodent. 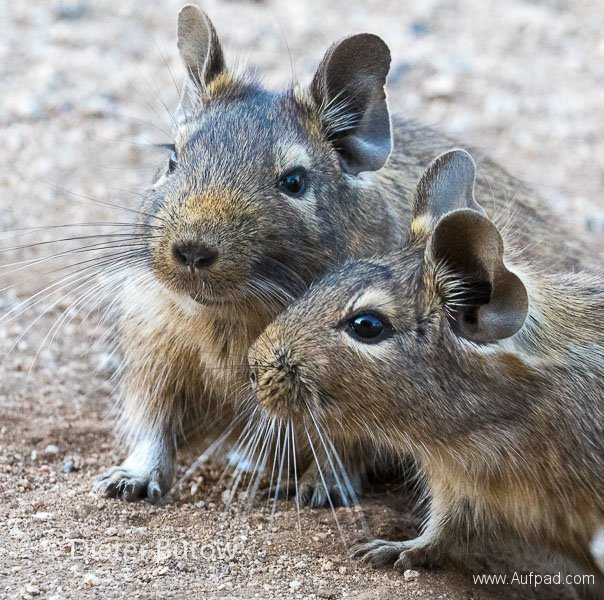 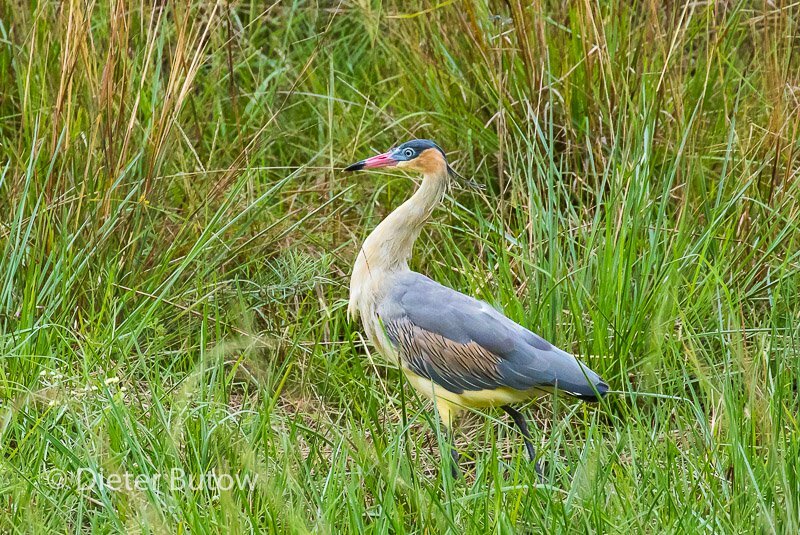 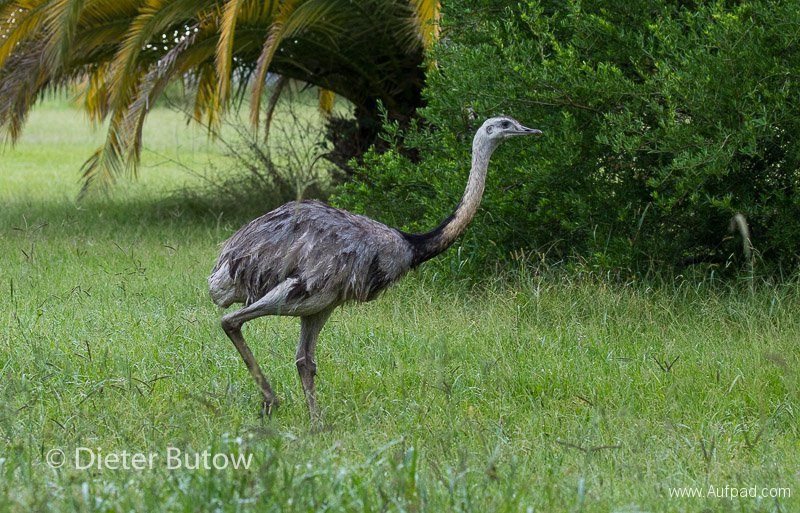 Today, they are almost extinct save for the small 20 000 population cared for in this reserve. 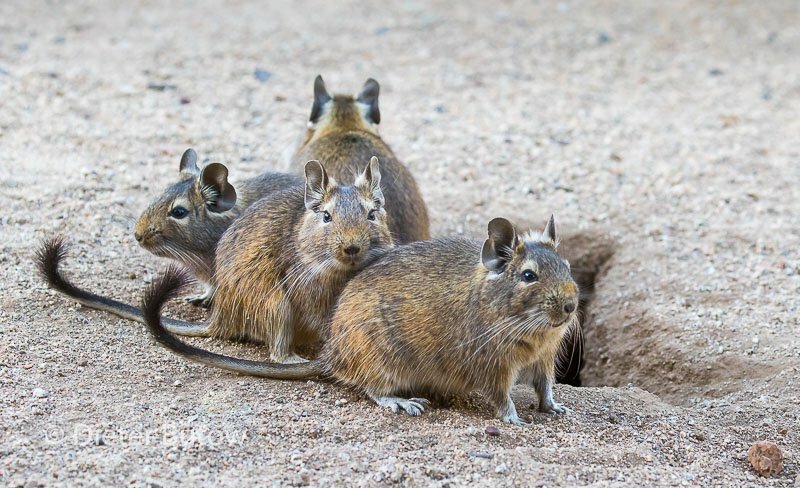 Boris, the guide, took us into the nocturama – a underground cavern which houses a number of different rodents from the reserve and that can only be seen during the dark of night. 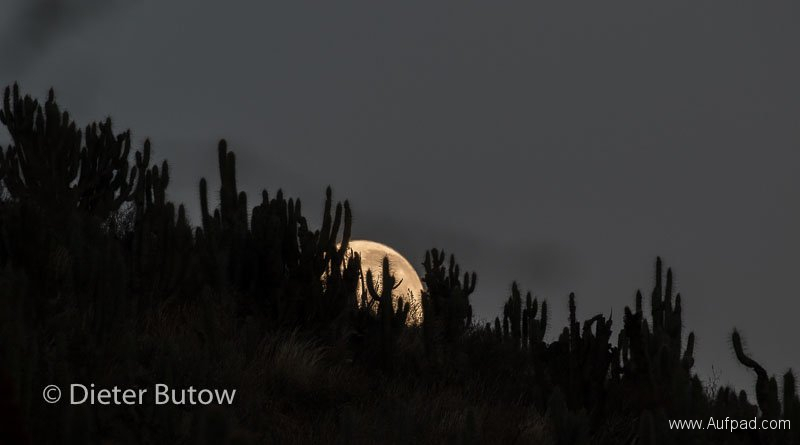 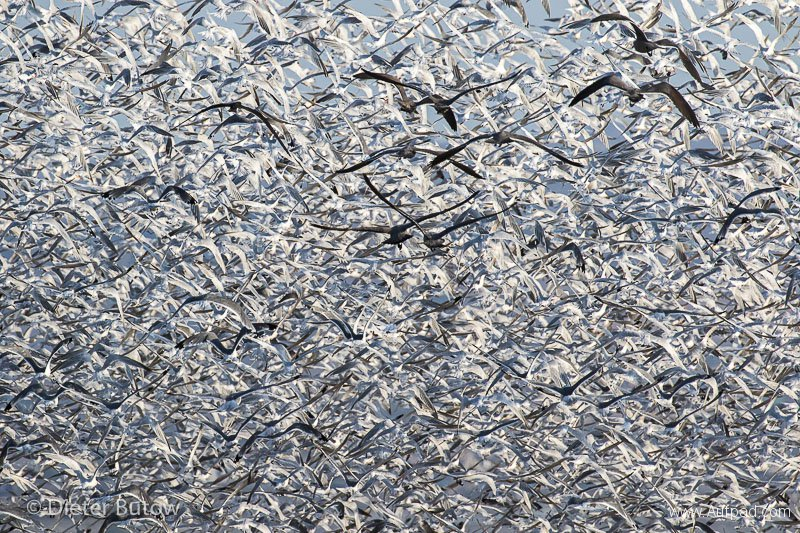 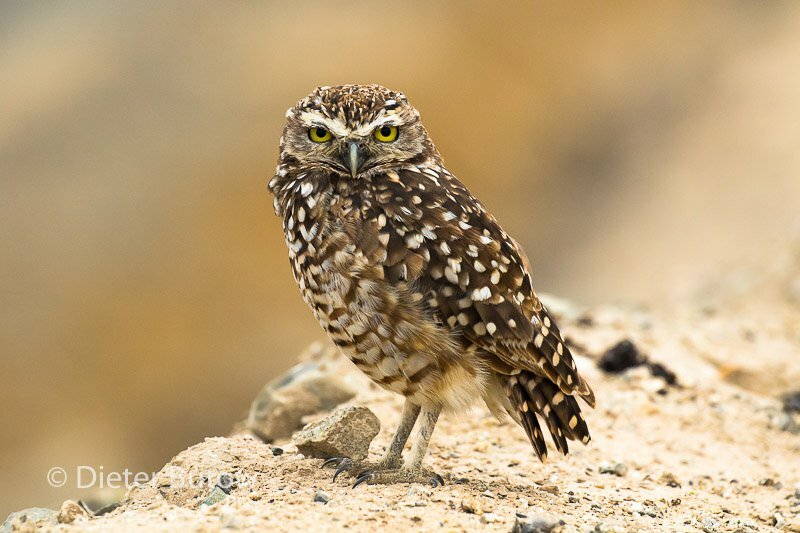 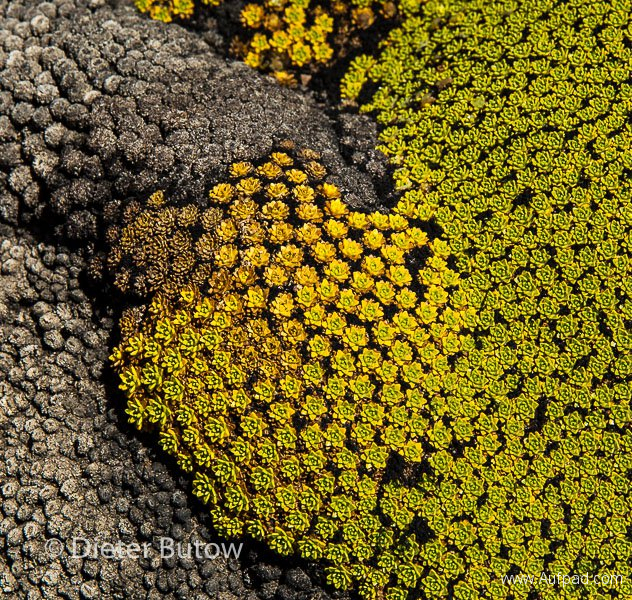 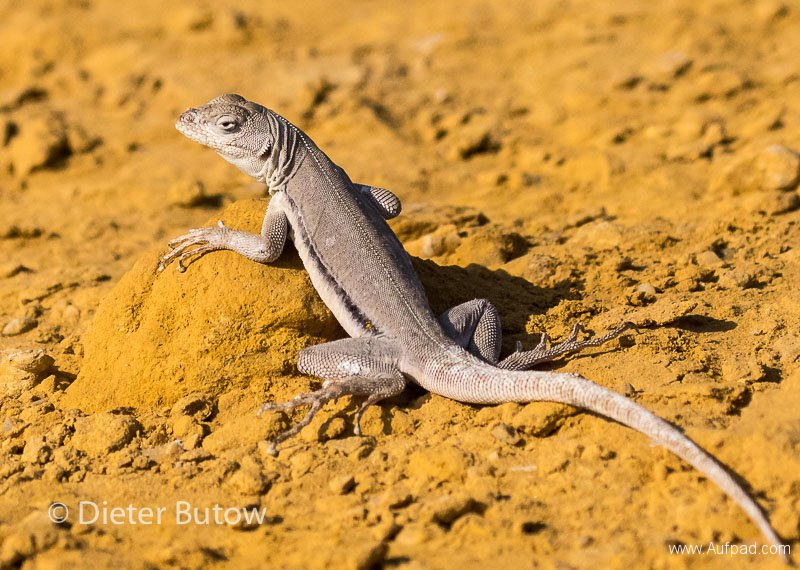 However, the little Degú can be seen at dusk and dawn and it gave us the opportunity for a few closeup photos. 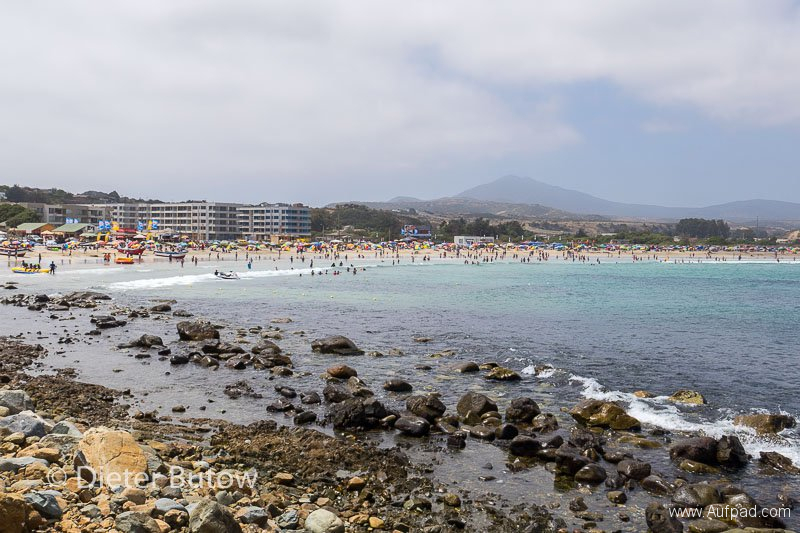 We journeyed further to Illapel and Los Vilos and along the coast to Los Mollos, a coastal resort where we found Camping El Chivato, close to the beach, where we took long strolls amidst many holiday makers enjoying this area at the summer time of the year. 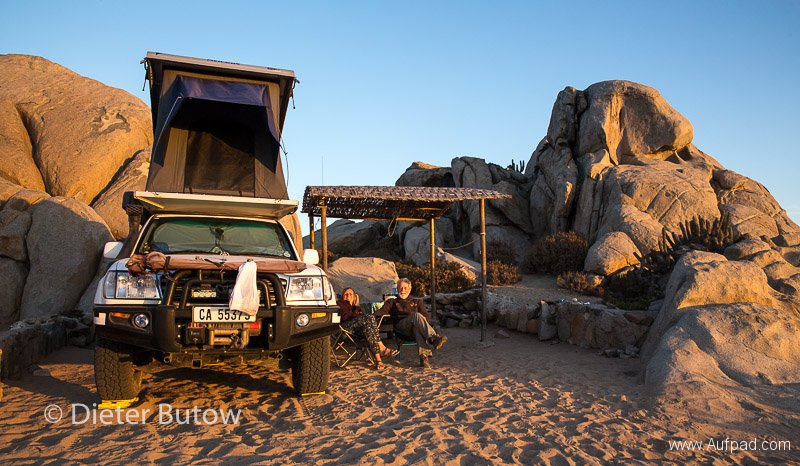 Here we met Laima and Midaugas yet again and settled down for the now customary sundowner and a delicious camping supper. 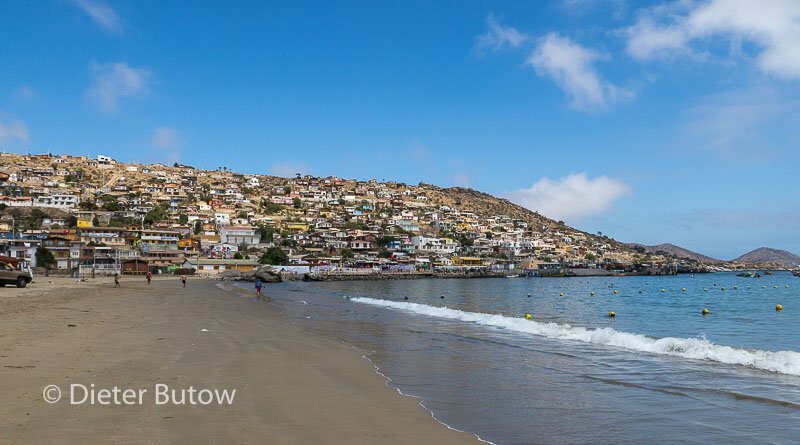 Los Mollos offers scuba diving trips and has a large park worth visiting. 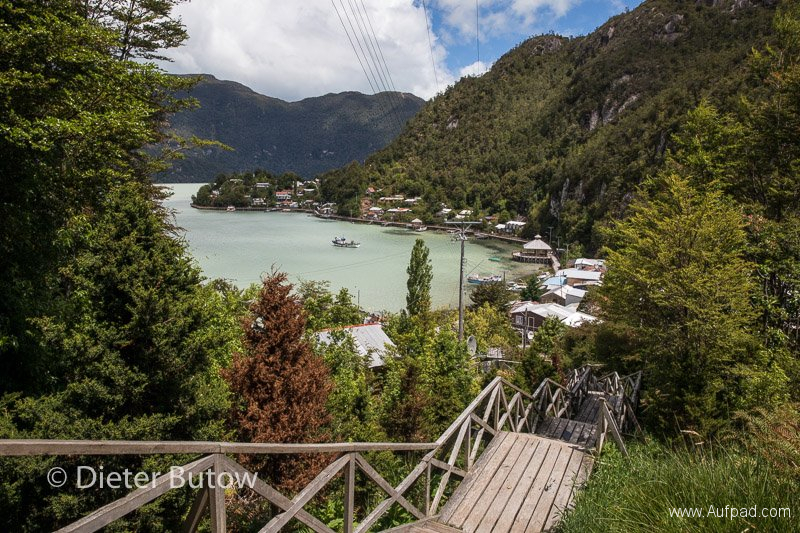 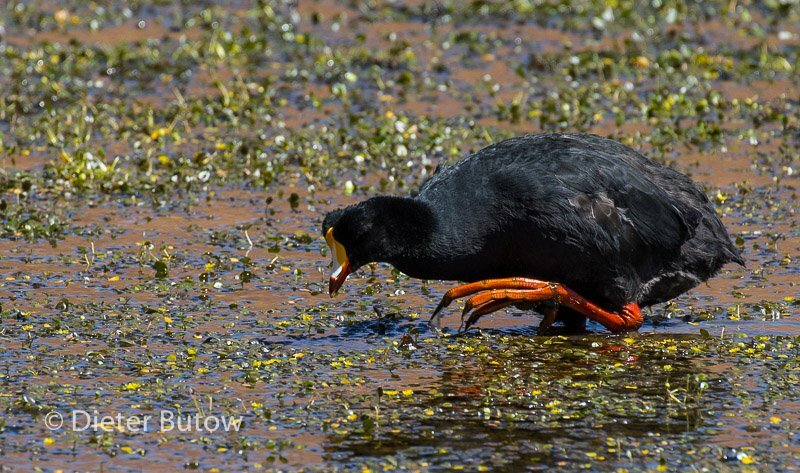 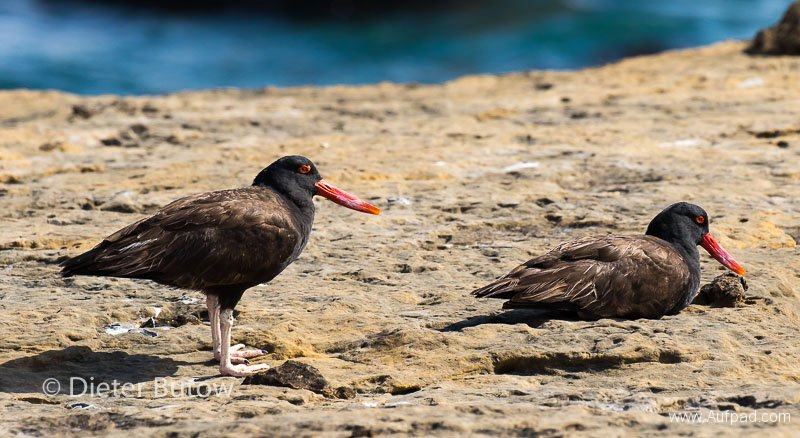 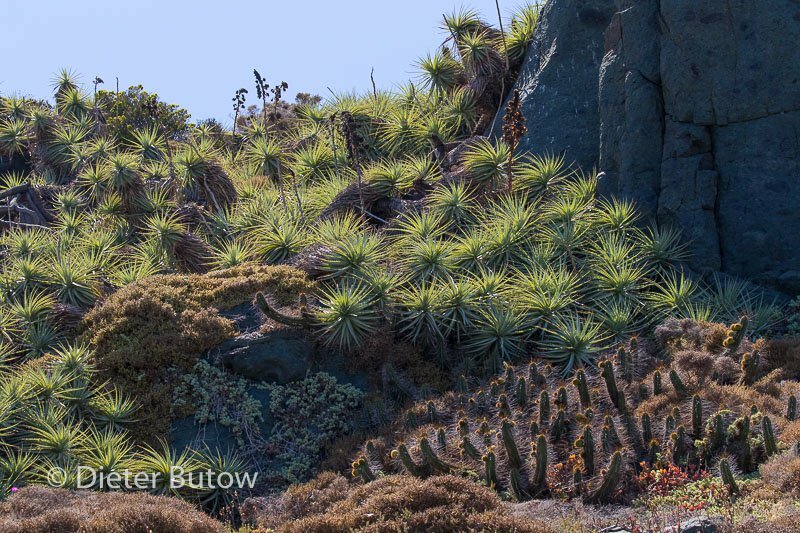 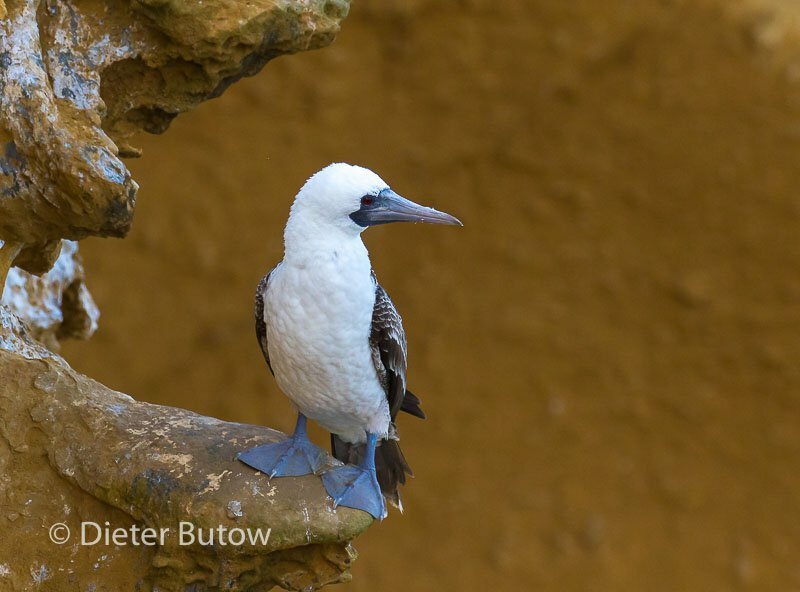 We decided on the latter and walked through the Bio Parque Puquén with its interesting birds, cacti and cliffs. 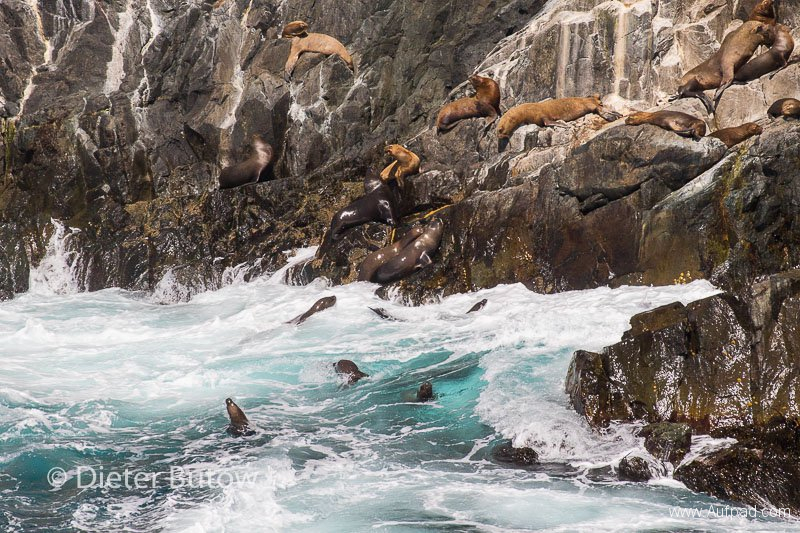 We observed whales and dolphins and marvelled at the effort sea lions go through to get up on the island cliffs, having to time their ascent with big waves. 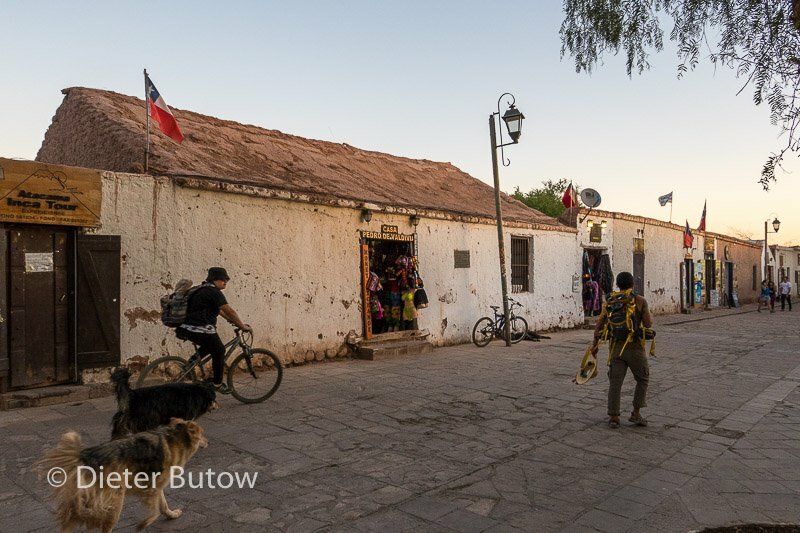 San Pedro de Atacama reflected the vibe of this desert -desolate yet vibrant. We started here and finally ended on the coast in a national park. 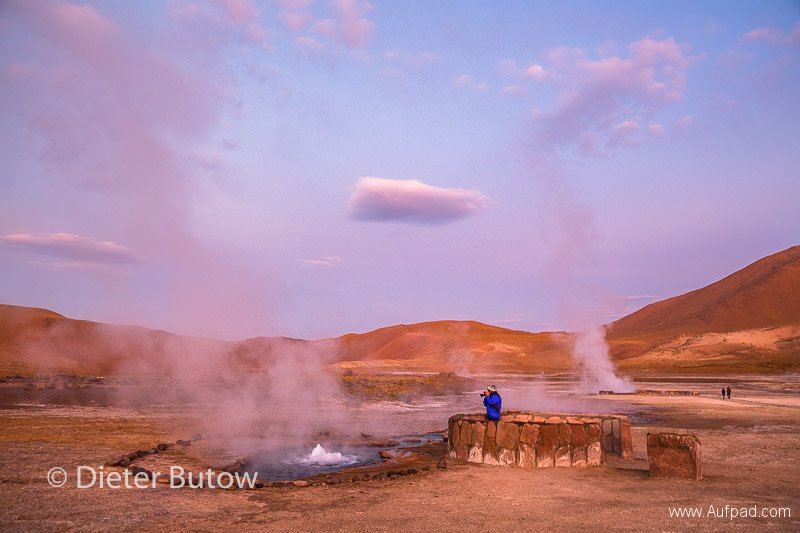 Das höchstgelegene Geysir Feld El Tatio war etwas mühsam zu erreichen -aber doch beeindruckend. 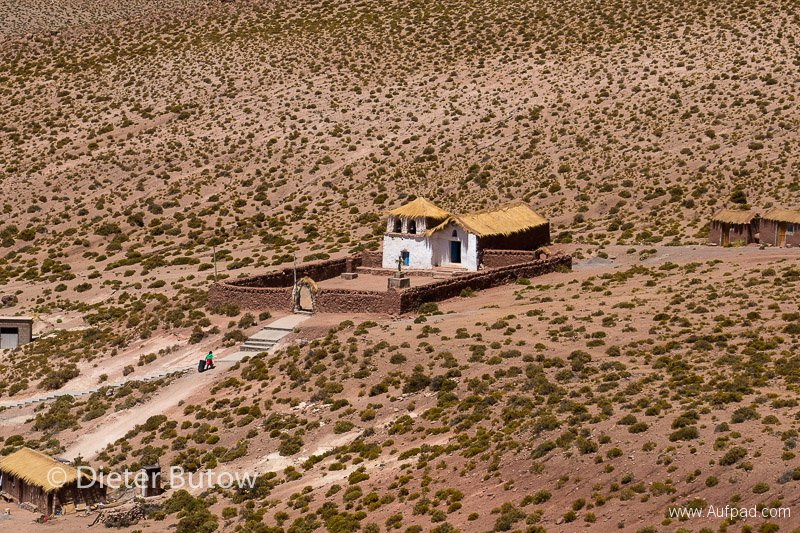 Wir setzten unsere Reise durch die Atacama fort und wurden immer wieder von einsamen, tollen Landschaften begrüsst. 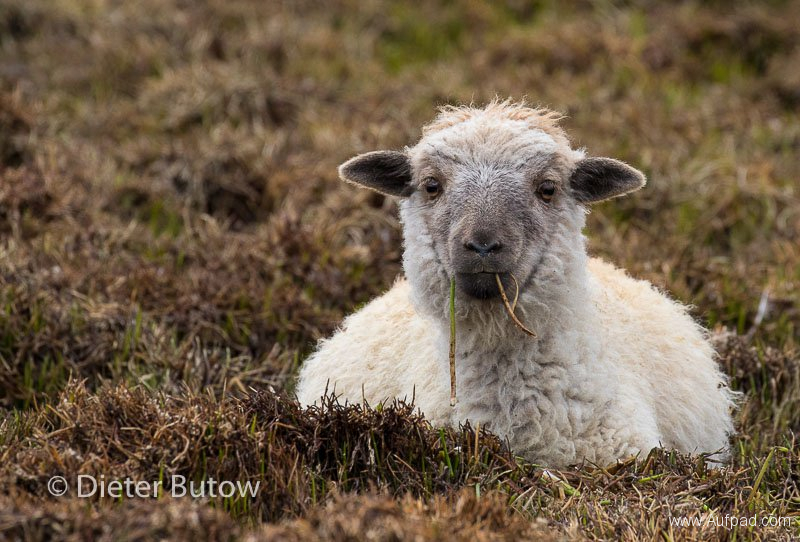 Alles andere als langweilig, wenn man Wüsten liebt. 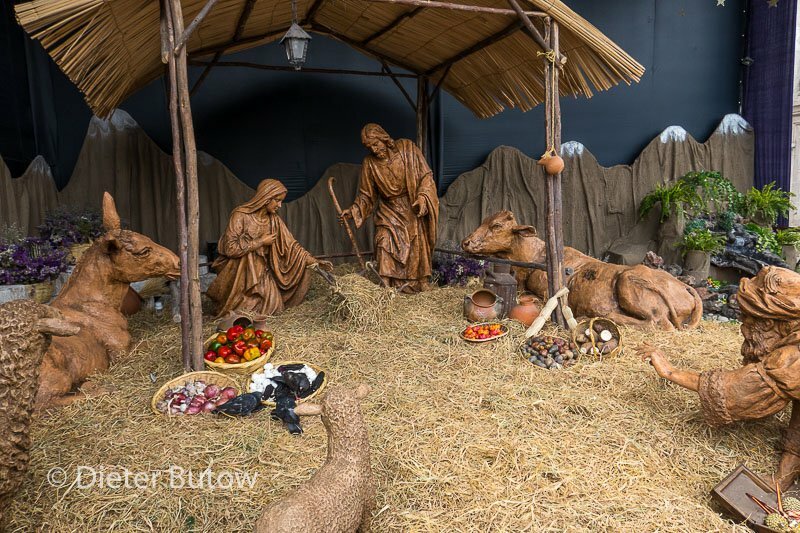 Ansonsten kann die Einsamkeit bedrohlich verlassen wirken. As the last musician drifted back home from the evenings party, we left at 4:15am to beat the traffic on the atrocious road to the El Tatio geysirs, almost 2 hours away. 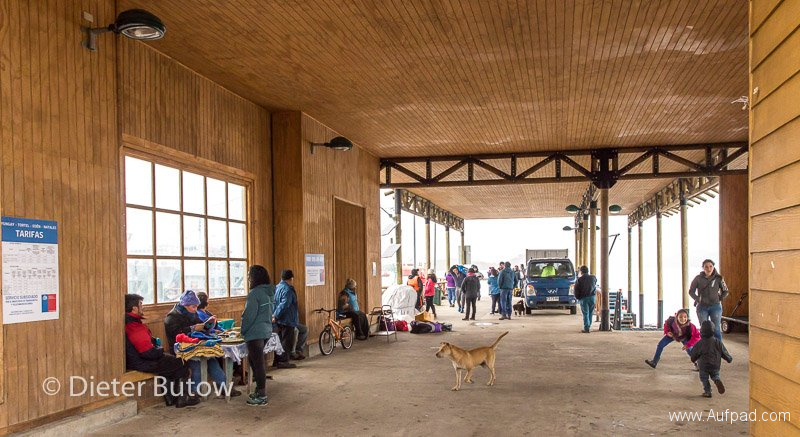 We arrived in bitter cold conditions just before sunrise together with some bikers who had left even before us and who seemed frozen stiff. 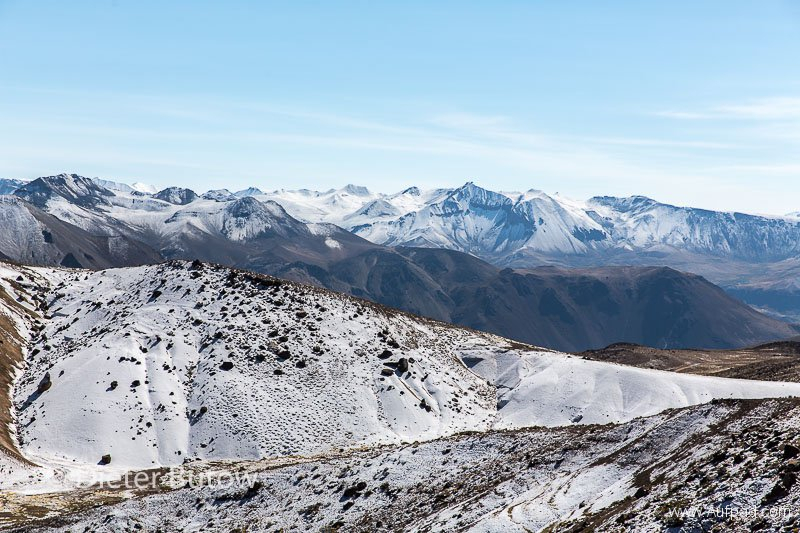 The temperature had dropped from 13° at San Pedro to -3° C at the 4300m altitude. 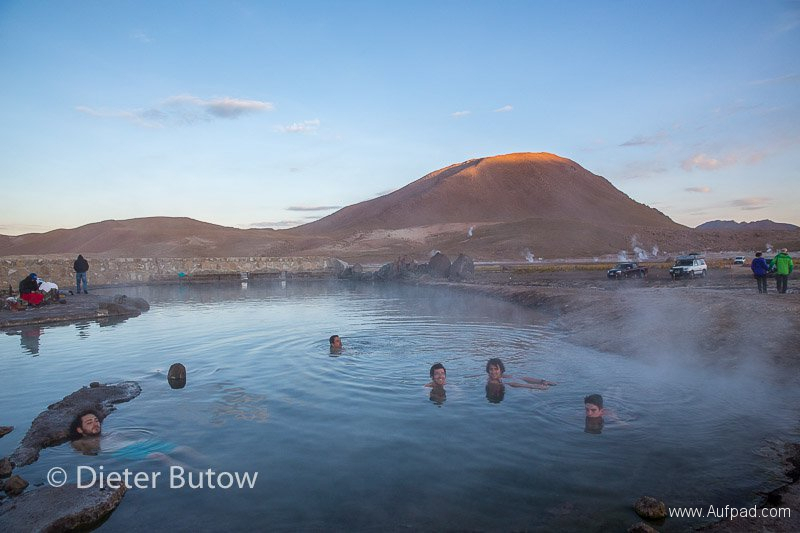 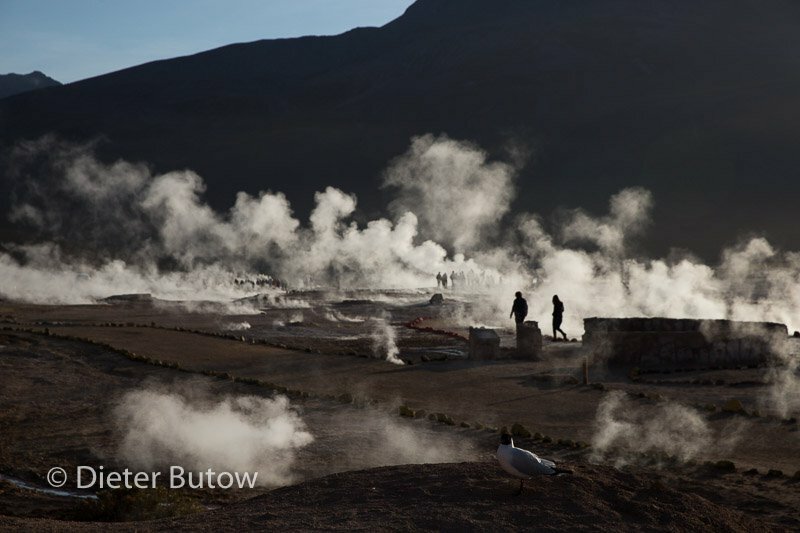 El Tatio is the highest field of geysirs in the world and the best time is to see them is early in the morning as the steam is more prominent. 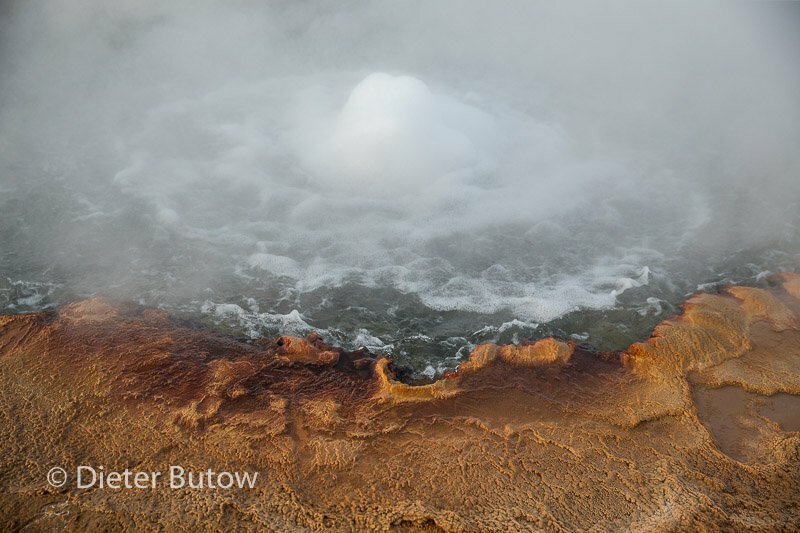 Although some visitors took a steam bath in the natural pool, we decided against it, but it was tempting. 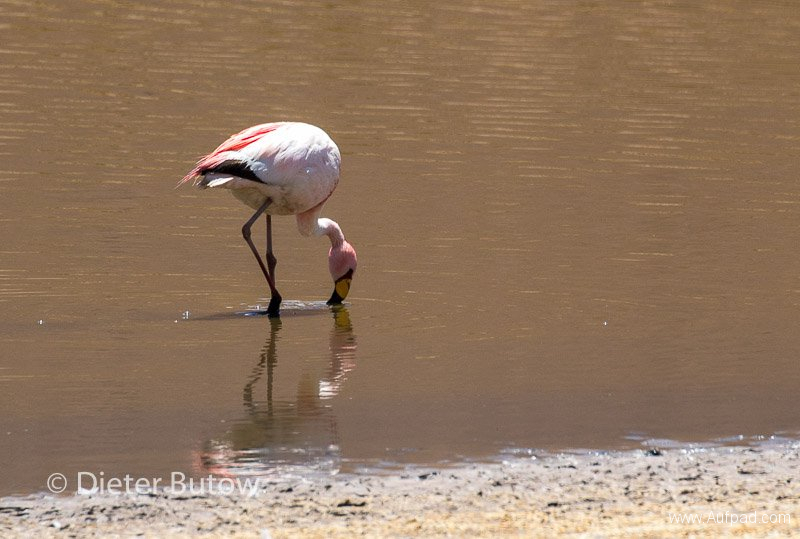 Only while we drove back did we see the beauty of the area, the vulcanos, the vicuñas and flamingos (including the rare James Flamingo with its bright red tail feathers) as well as Moorhens, Andean Avocets and Andean geese. We left San Pedro at midday and continued to the Lagunas Miscanti and Miniques only to find that they closed 18:30 and camping is not permitted anylonger in the reserve. 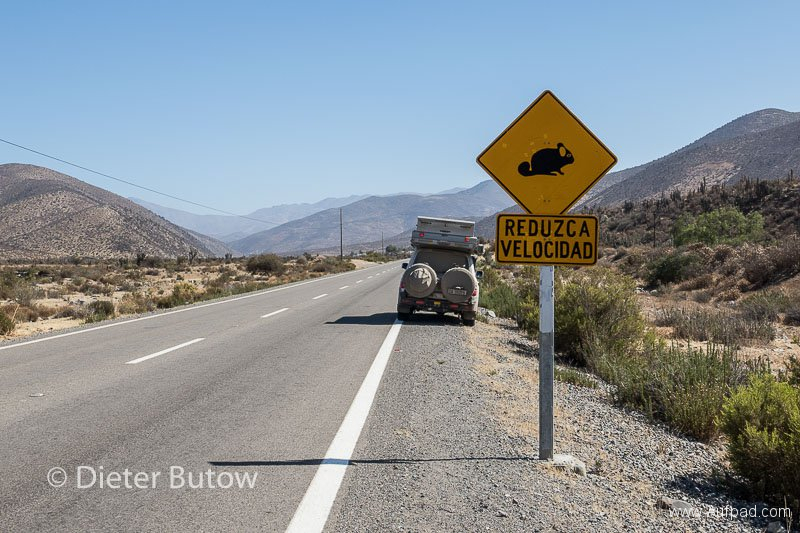 This prompted us to drive on in the direction of the border towards Argentina where we found a wonderful riverbed 6km away (at 3850m altitude) and suitable to camp in between rock faces and not visible from the road. 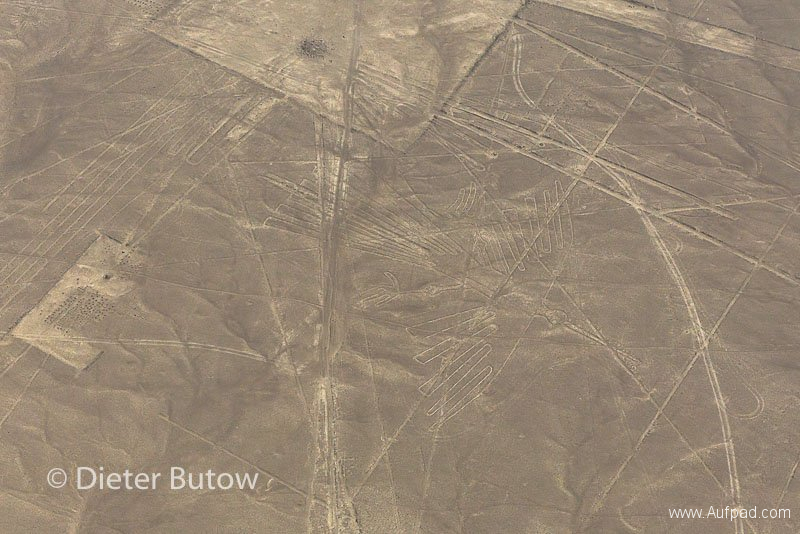 Again, it paid off to be under way in a 4×4 ( S23°44.9879, W067°50.4649). 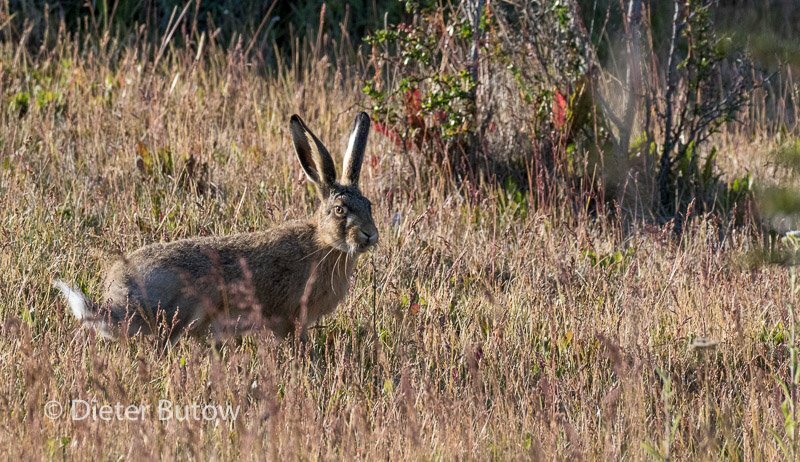 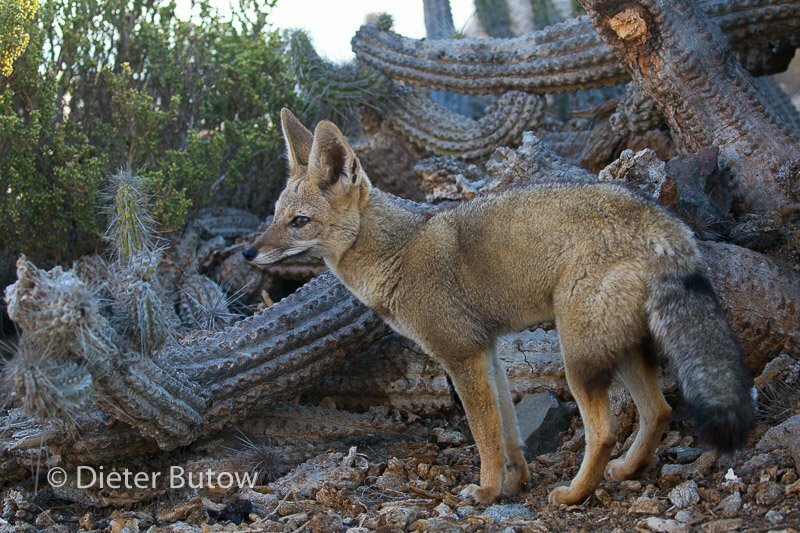 Here we were lucky to observe a South American Gray Fox (Chilla Zorro), some vizcacha hares and different bird species. 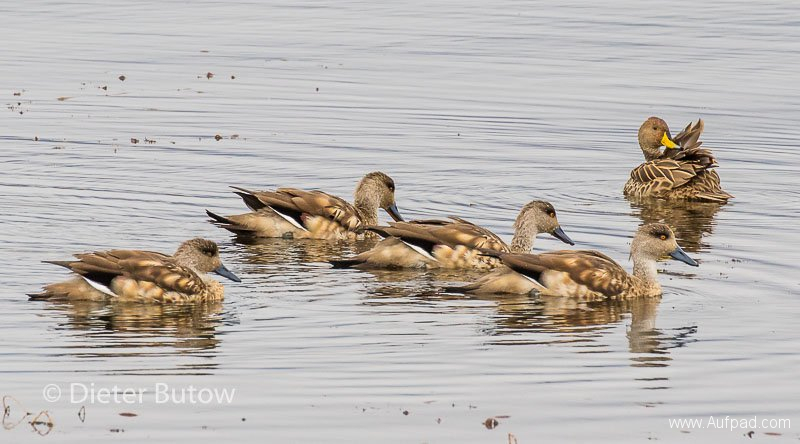 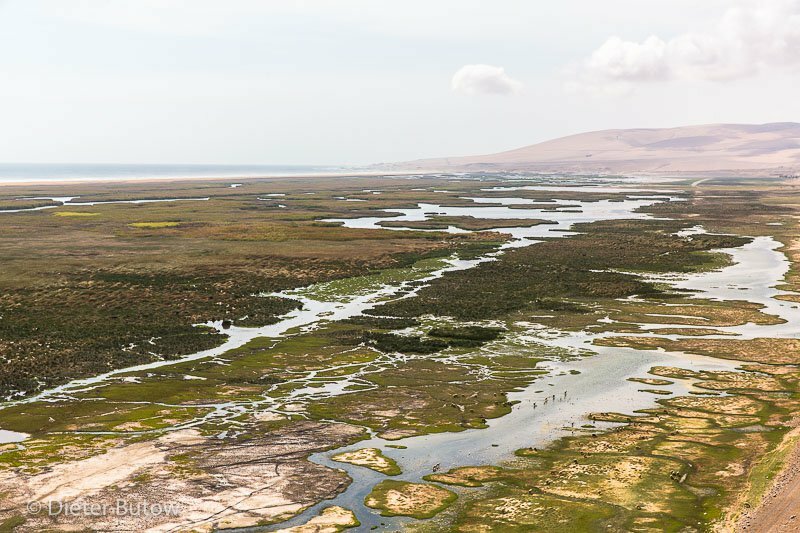 After a cold and clear 4°C night we returned next morning to the reserve at the foot of Cerro Miscanti and Cerro Minques, where we spent some relaxed hours at the equally named lagunas – pity there were no flamingos to be seen during this time of the year. 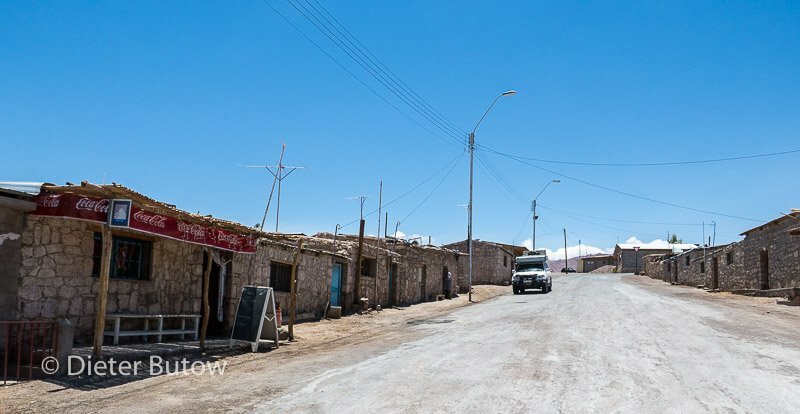 From here we decided on a detour via the little town of Peine on the edge of the Salar de Atacama, a huge, dry salt lake. 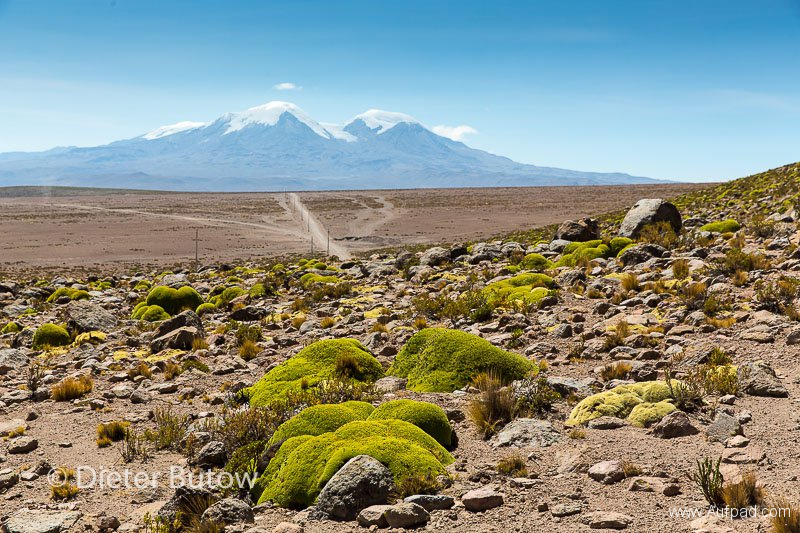 Lots of Lithium mining takes place here and the crust is hard and rough – nowhere to be compared to the beauty of the Salar de Uyuni in Bolivia. 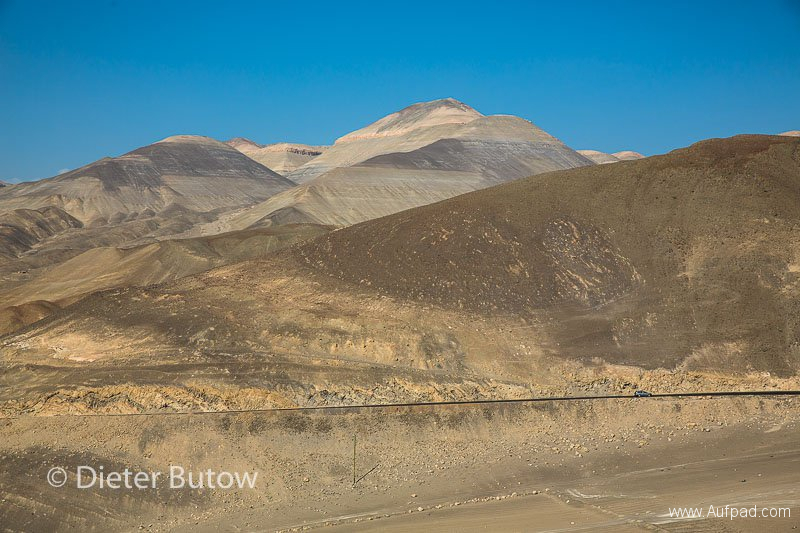 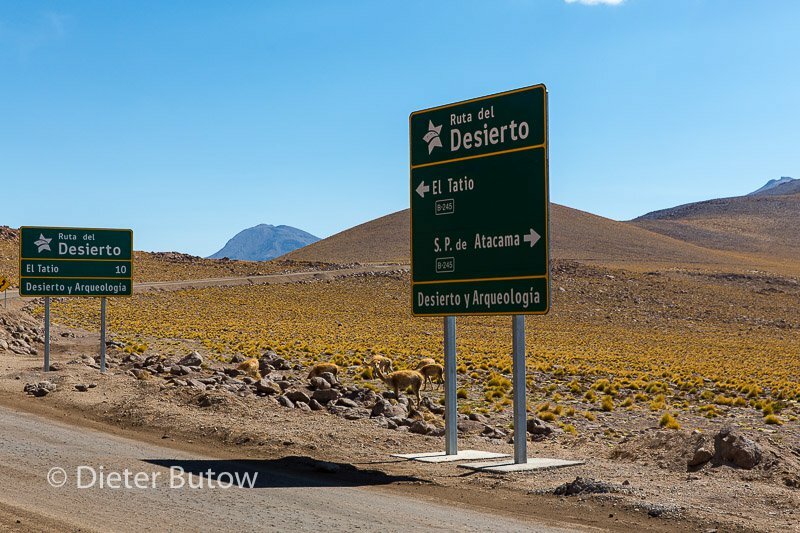 The road we took is the main track to Antofagasta from here, but we decided to turn off to the B55 southwards towards Estacion Pan de Azucar. 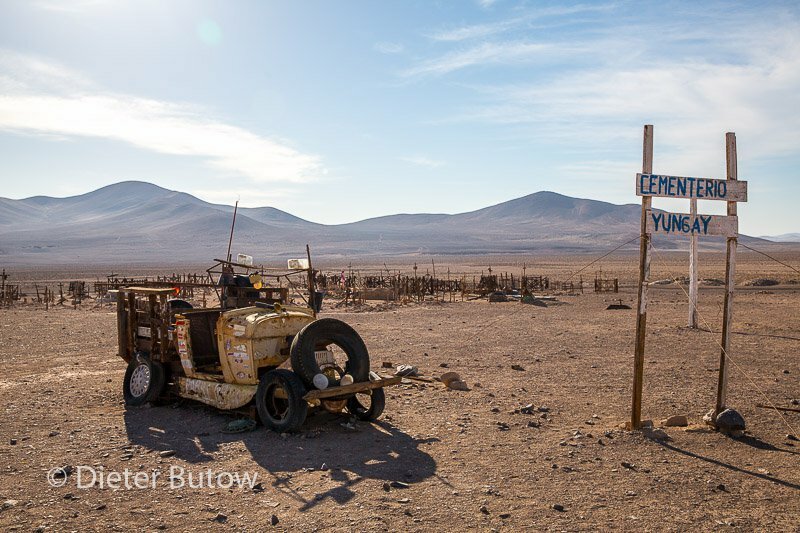 This dirt road is deserted, no traffic and we got pleasantly surprised that at deserted Estacion Imilac , directly on a dry salt lake, a spring delivers cold, clear and sweet water and made this remote station a good place to replenish our drinking water and obey the demand to leave some behind. 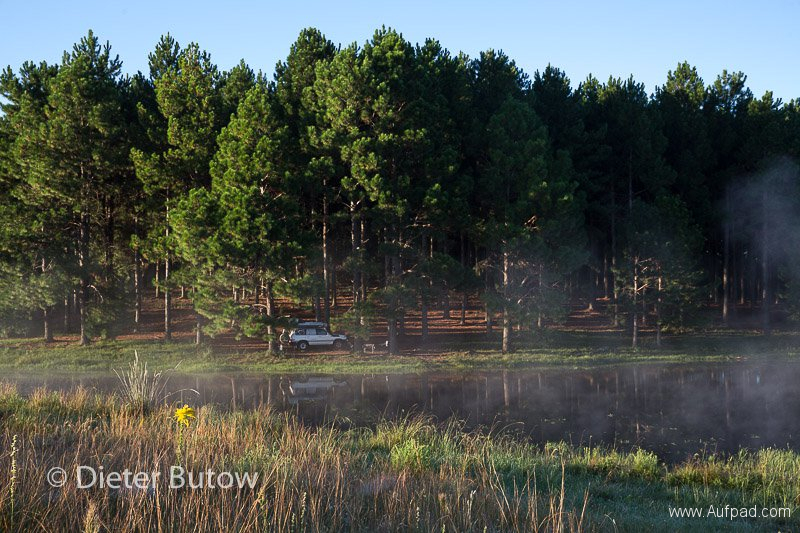 Although the night was clear the morning presented a thick blanket of fog with everything being dripping wet. 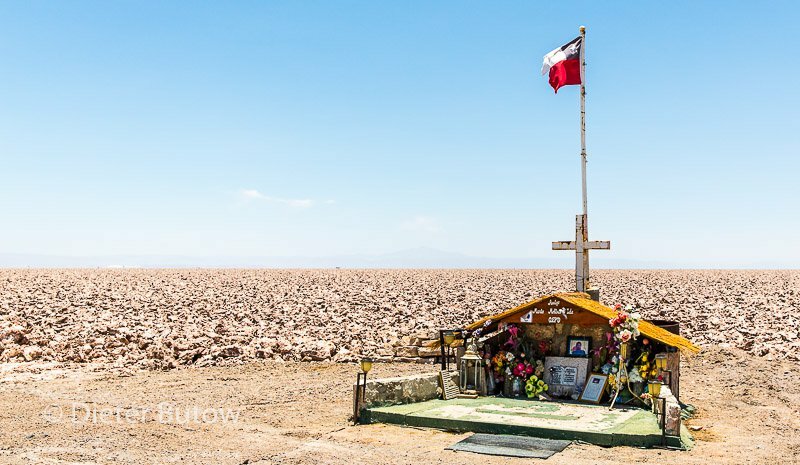 We pushed on to Paradeiro Barazarte on the Pan Americana Ruta 5 and continued southwards with a stop at the well-frequented Mano de Desierto –the large concrete hand sticking out of the desert sand along the route, sculptured by Mario Irarrázabal in 1992 in honor of the victims of injustice by the then regime. 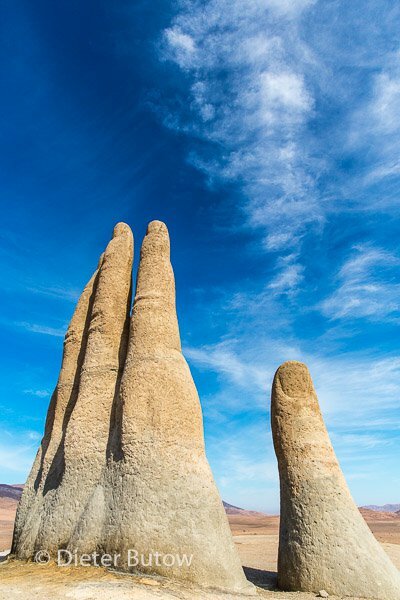 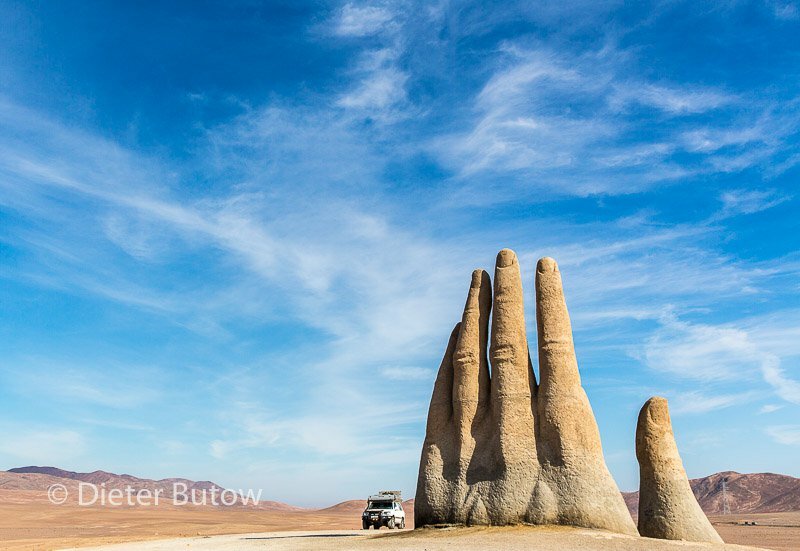 (the hand at Punta del Este in Uruguay is by the same artist). Along the PanAm we regularly saw decorated graves, complete in some cases with the vehicles in which the occupants died as well as paraphernalia like hard hats, caps or other items associated with those who perished. 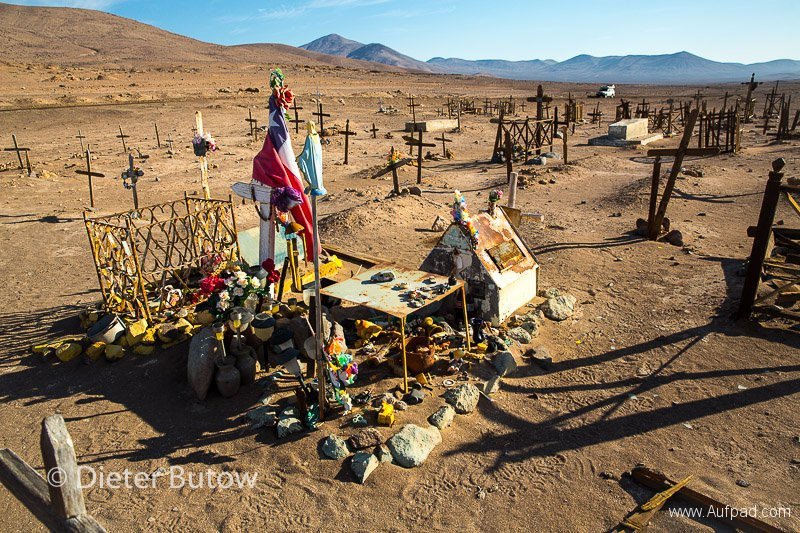 In cases where children are involved, often the toys are also left at these memorials. 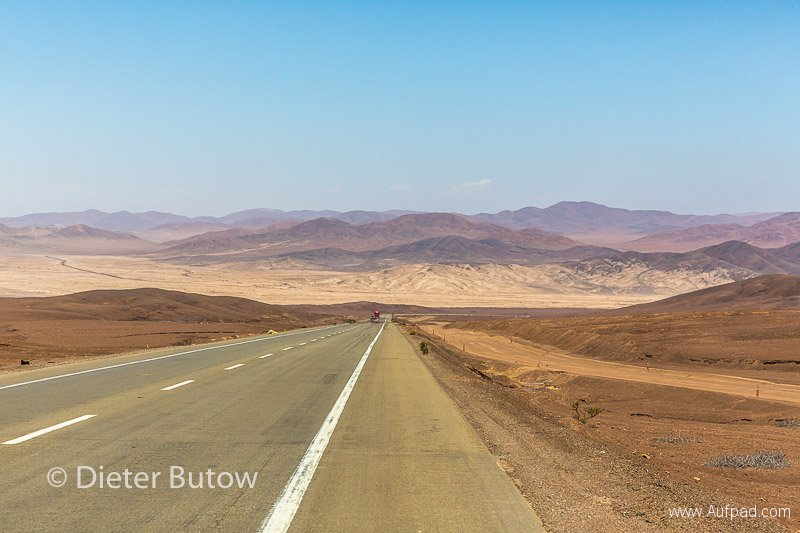 It should be noted that service stations along this stretch are infrequent – however,it did not pose any problems for us with a tank reach of around 1200km. 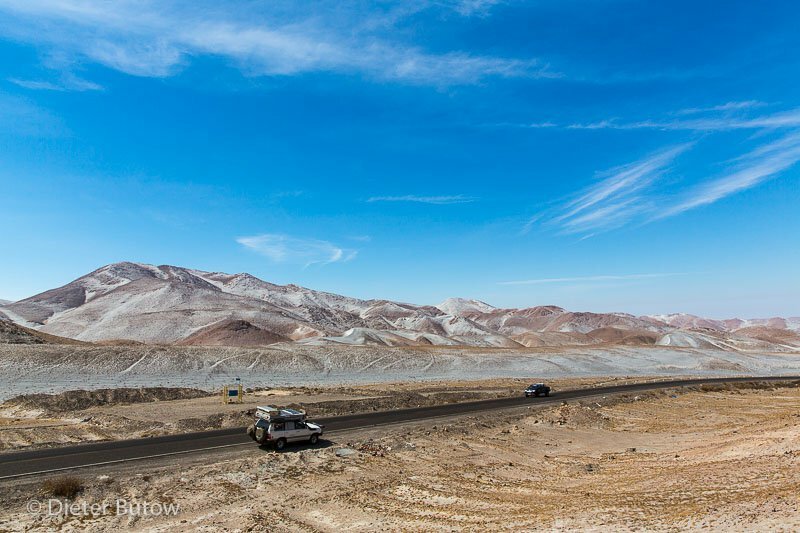 We filled up at Aqua Verde and continued to Chañaral through the Sierra Colorada, again with beautiful vistas of the Atacama. 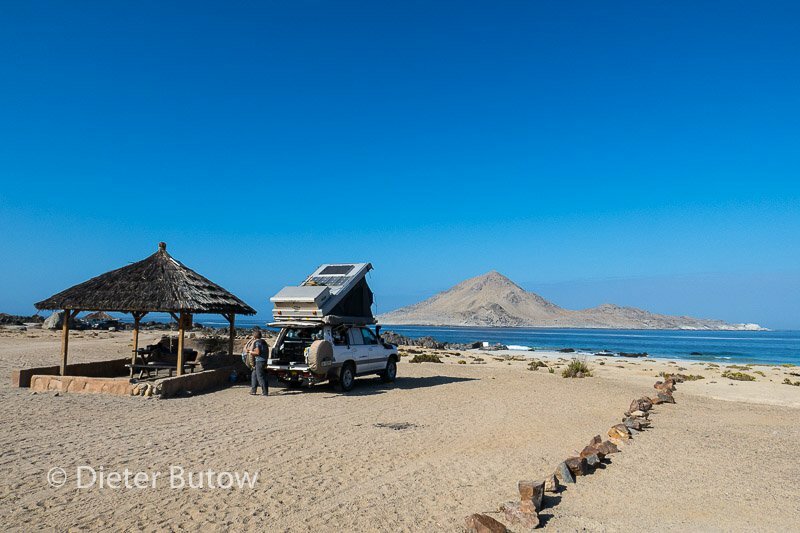 From Chañaral we turned northwards along the coast to reach the Parc Naçional Pan de Azúcar where we camped at the Lodge Pan de Azúcar with many camping spots and a kitchen lapa and warm showers. After an early walk into the sleepy fishing village we drove back via Charñaral along the Ruta 5 PanAm to Cadera, an endless stretch of desert again illustrating the enormity of this desert expanse to us (more than 1000km long straddling Peru, Bolivia and Chile). 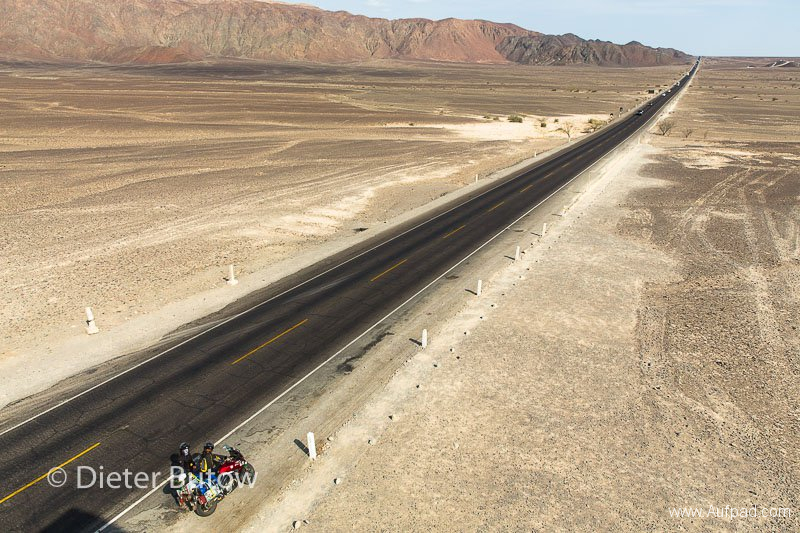 Here the Pan Americana changes into a dual lane double highway, allowed us to make good headway to Copiapó and southwards where we turned back to the coast at Algorrabal, had tarred road to Canto del Agua, then via Punta Carrizal into PN Llanos de Challe known for its cactus landscapes. We found a quiet camping spot behind a rock amidst all the holiday activity prevailing. 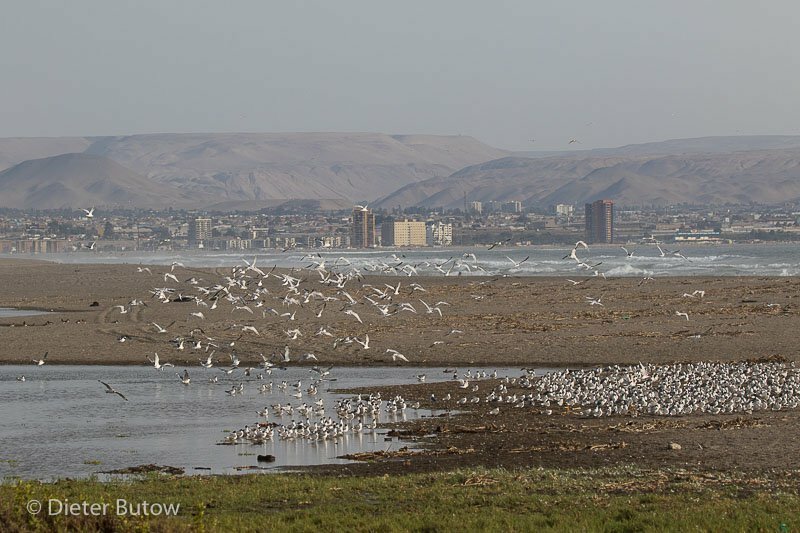 Before sunset we went for a walk and tried the cold, crystal clear Pacific ocean. 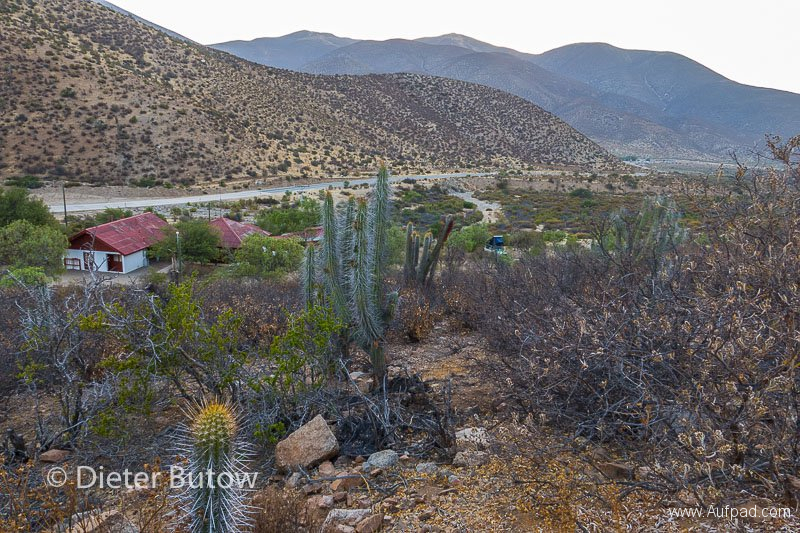 At this campsite various animals could be observed, including zorros chilla (false fox) and some owlets early the next morning. 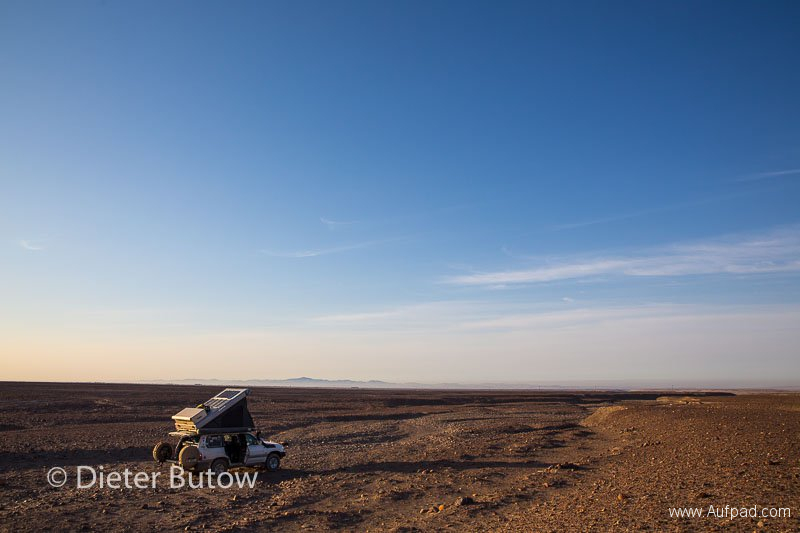 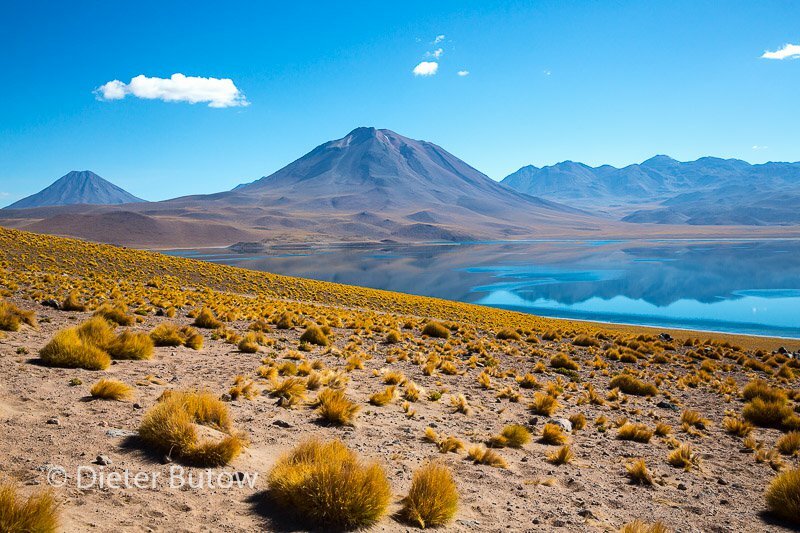 Read more about the Atacama desert. 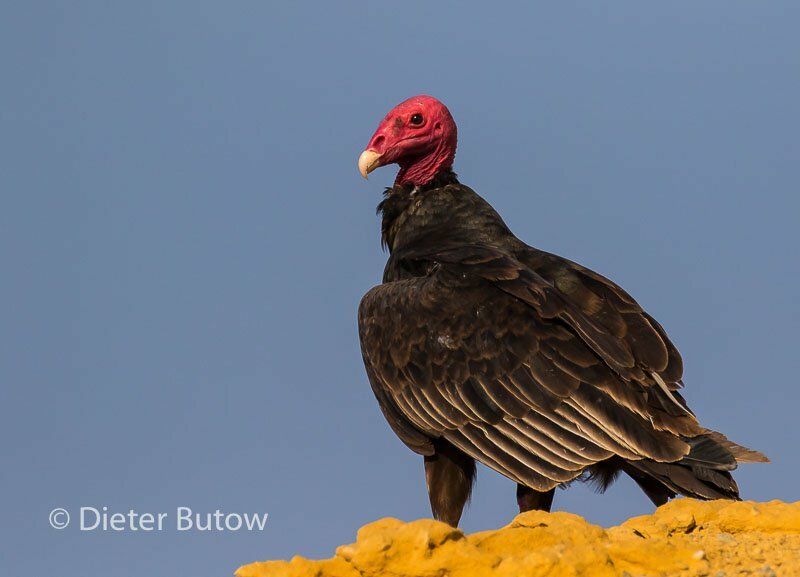 Following a relaxed Xmas time in Arequipa, we still wanted to observe the Condors at Colca Cañon and then make our way southwards into Chile. 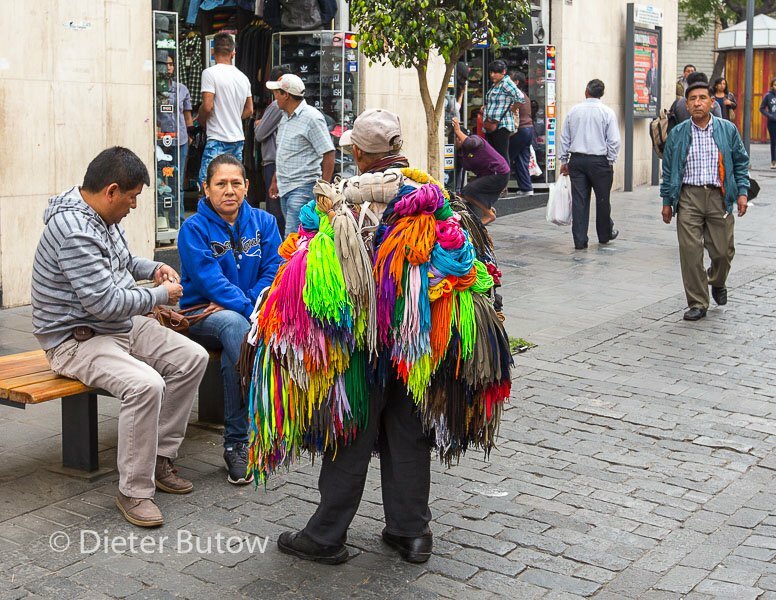 Nach einer ruhigen Zeit in Arequipa hatte wir noch den Colca Cañon vor uns, wo die Chance, Kondore zu sichten, sehr gross war. 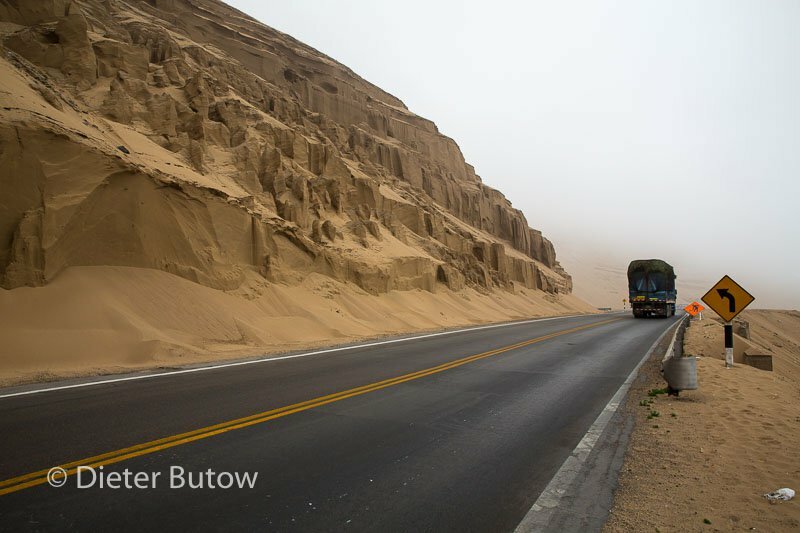 Also machten wir uns auf den Weg dorthin, bevor wir dann entlang der Küste Perus auf Chile zusteuerten. 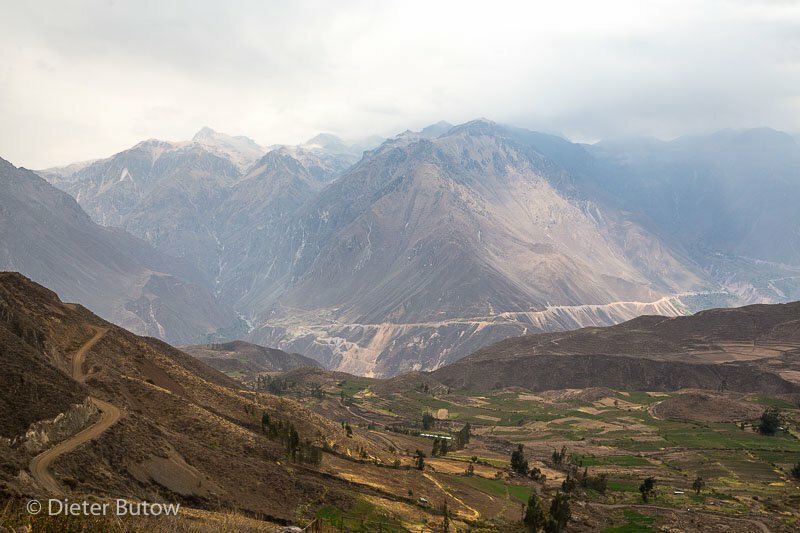 Leaving Arequipa we drove back to Tambillo and turned north passing through Huacán and Huambo before we got to the the Cruz del Condor viewpoint above the Colca Cañon. 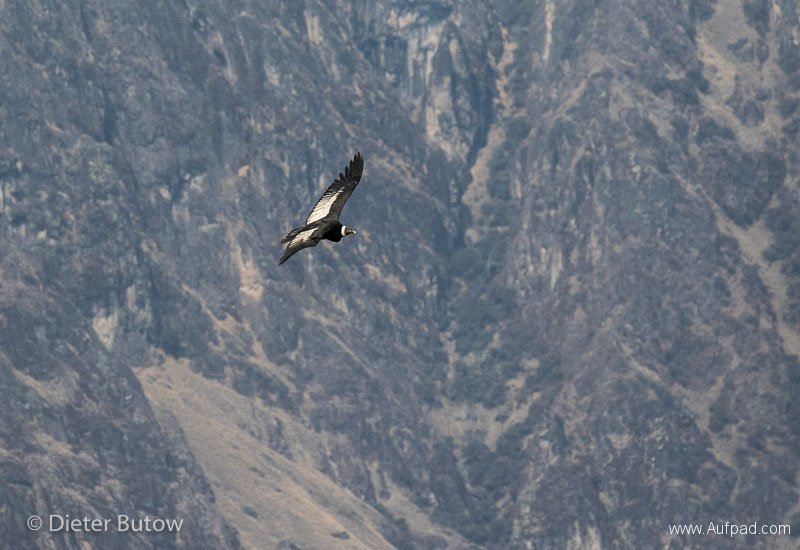 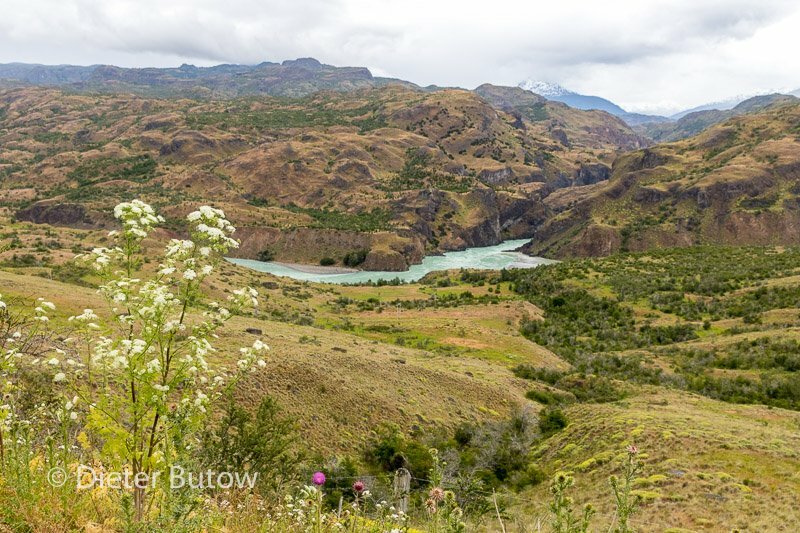 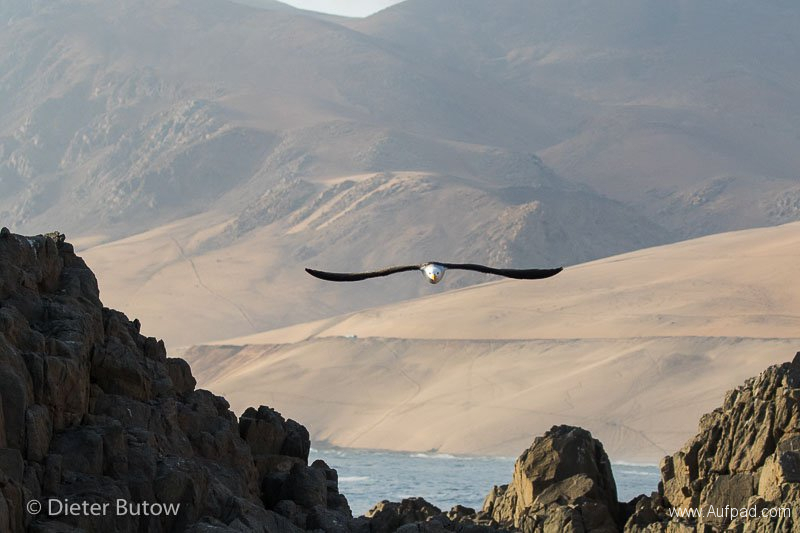 We arrived at the viewpoint towards afternoon and were lucky to see some Condors flying along the deep canyon. 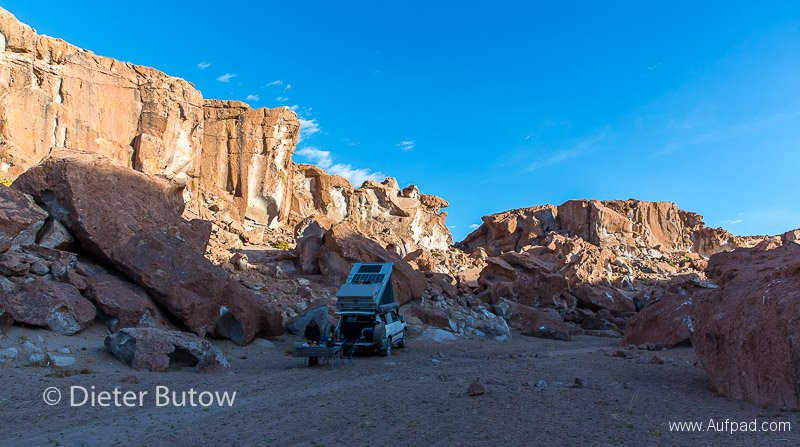 There was a possibility to camp in the older parking area although we found a small track going further down – here we decided to spend the night with a splendid view of the canyon. The surrounding mountains reached between 5600m to 6300m and, although our site was lower down at approx 4000m, it turned out to be a cold night, only tempered by the hot tea with a shot of rum before we retired. 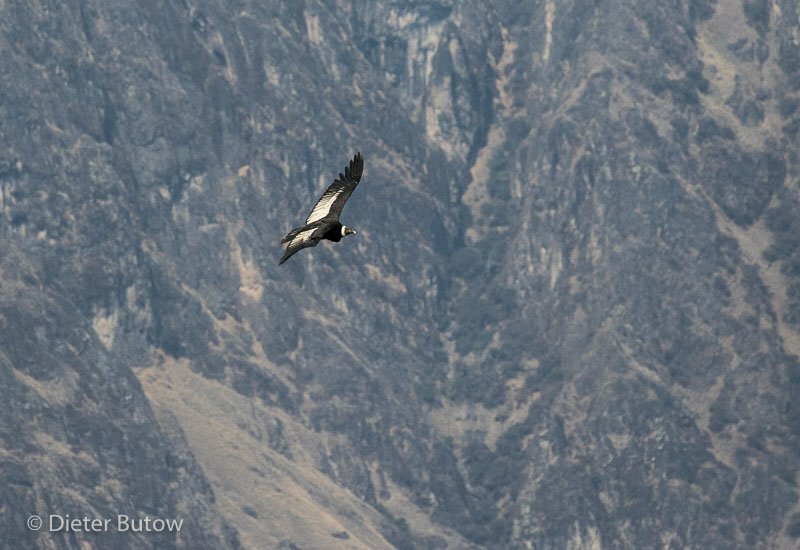 Next morning we drove up to the viewpoint at around 10:00, the time when it is expected for the Condors to have sufficient thermals to rise from their perches. 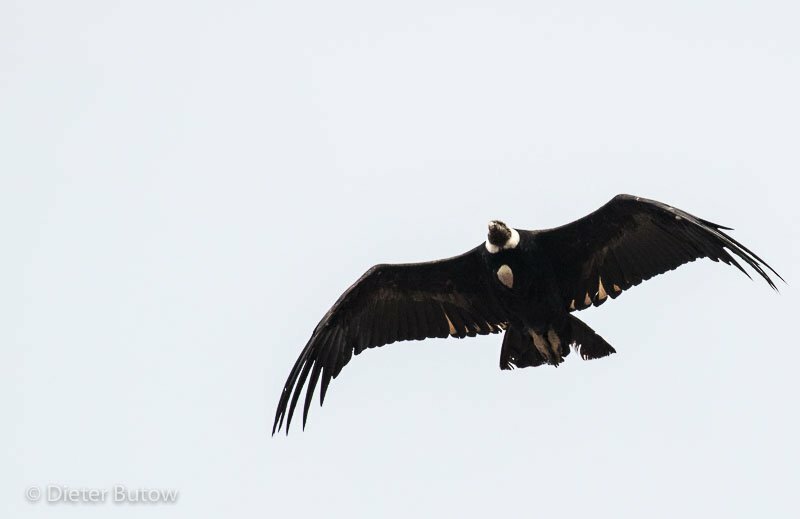 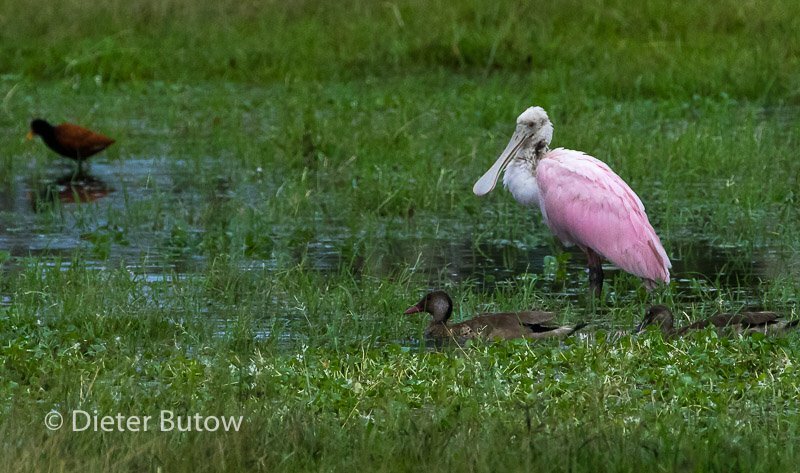 We saw only 4 in the distance after the mist had lifted and were grateful for the previous afternoon’s sighting. Many tourist groups gathered at the viewpoint and also we were required to pay the substantial entrance fee of 70 Soles pP (especially considering that we did not see any Condors close up). 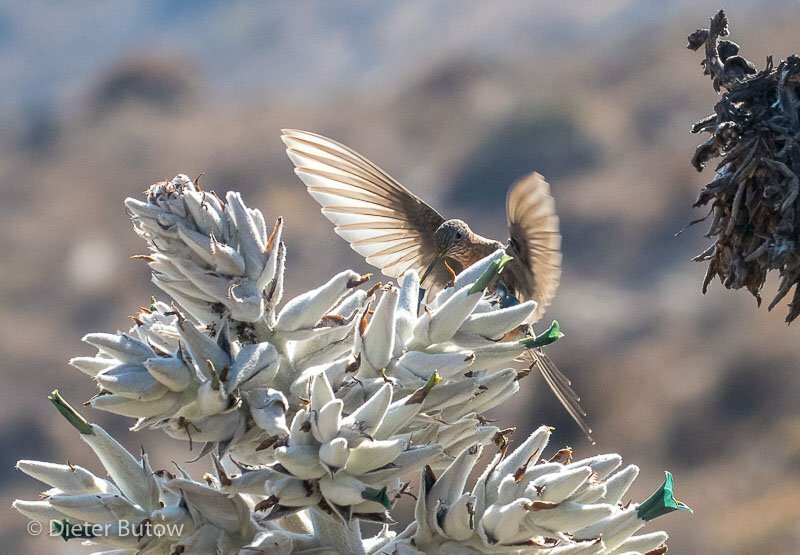 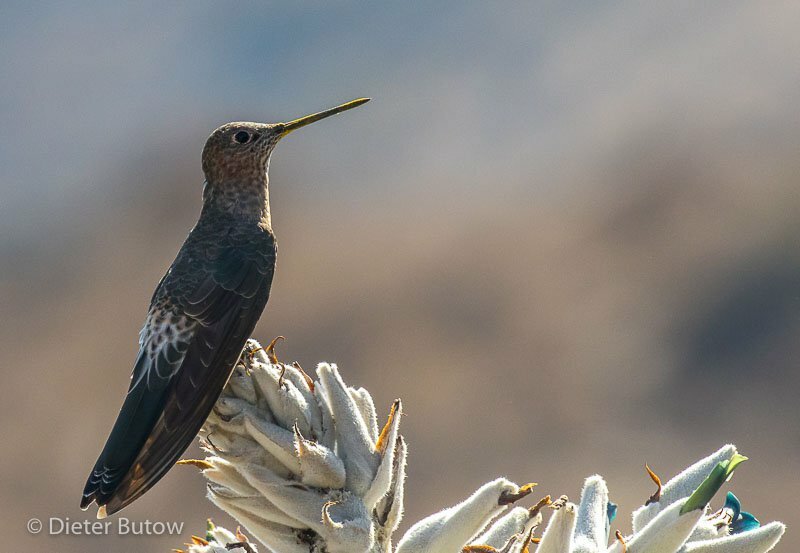 However, we were rewarded with some hummingbirds feeding on the flowers on the canyon edge. 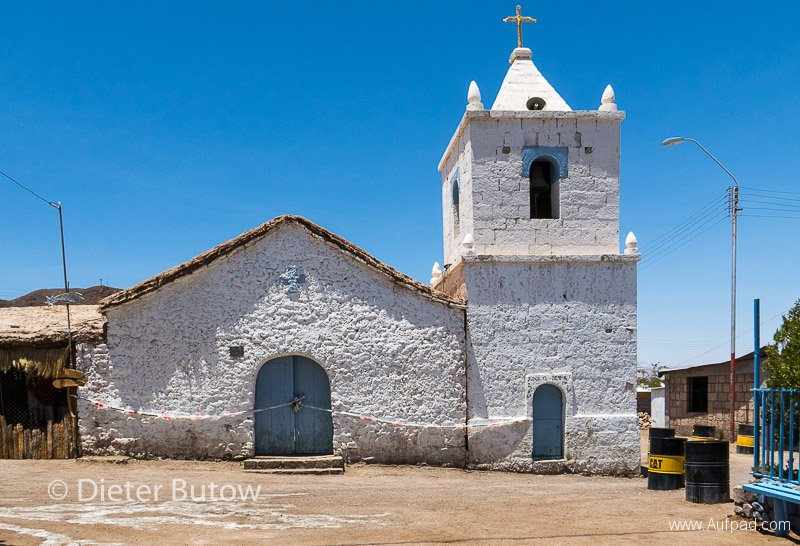 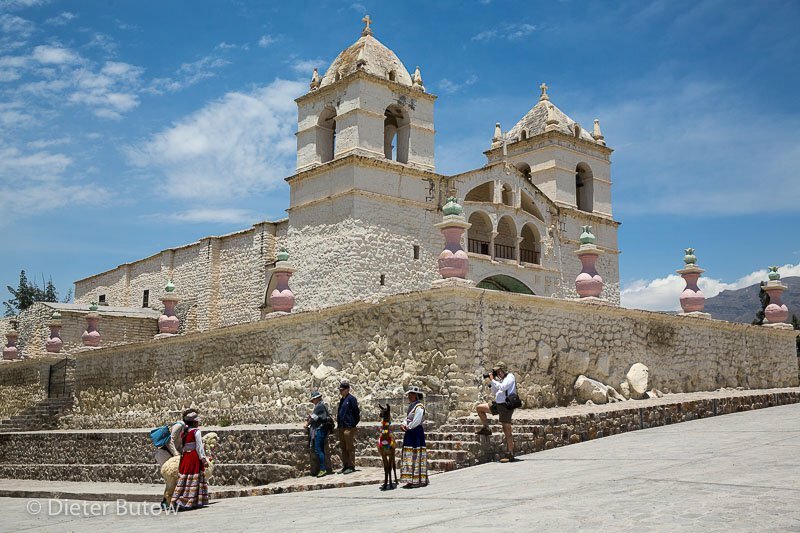 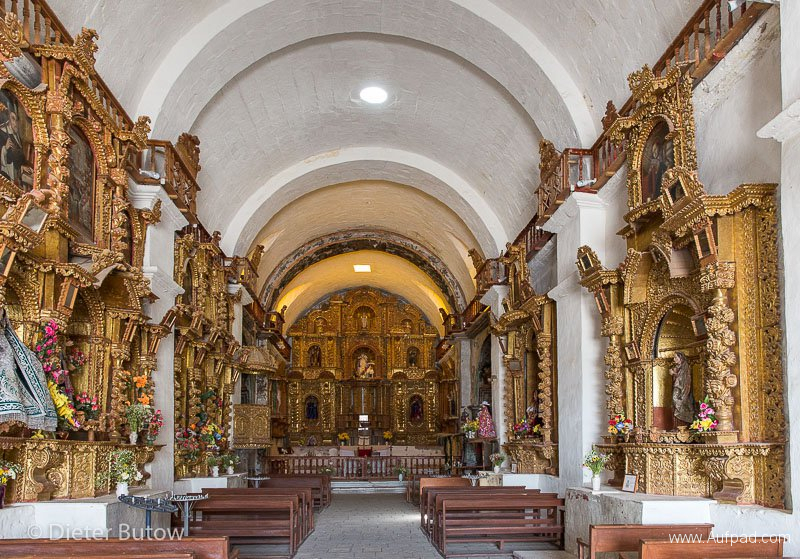 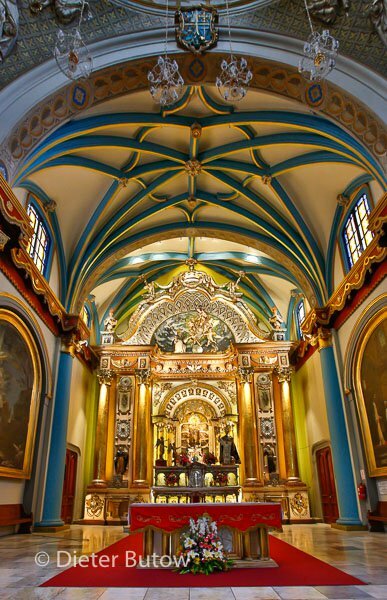 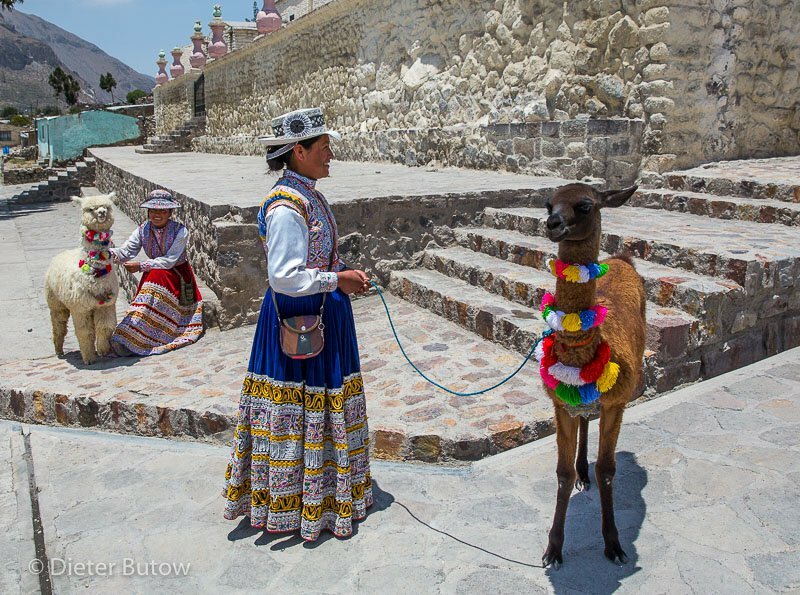 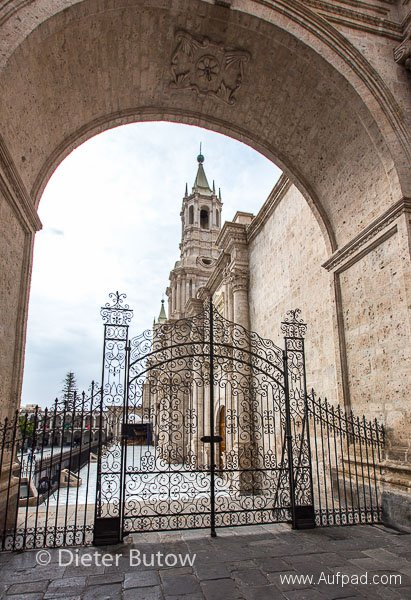 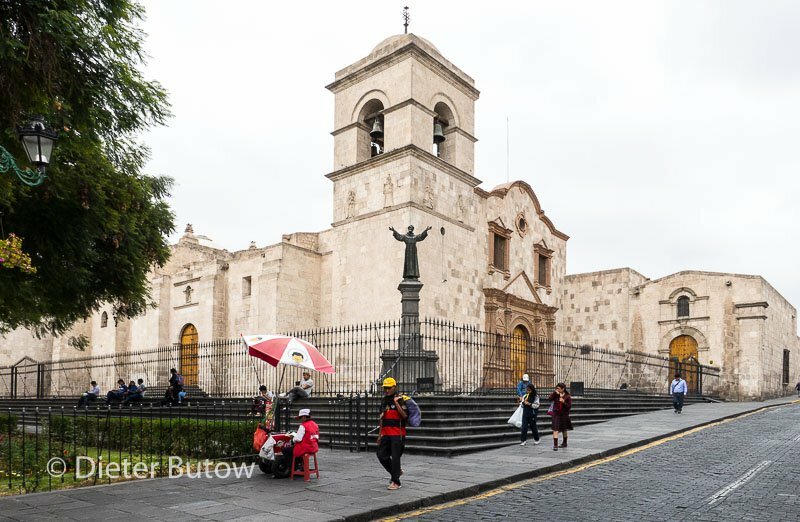 We returned to Arequipa via Maca, a small town with a quaint old church and known for the women wearing skilfully embroidered clothes and hats. 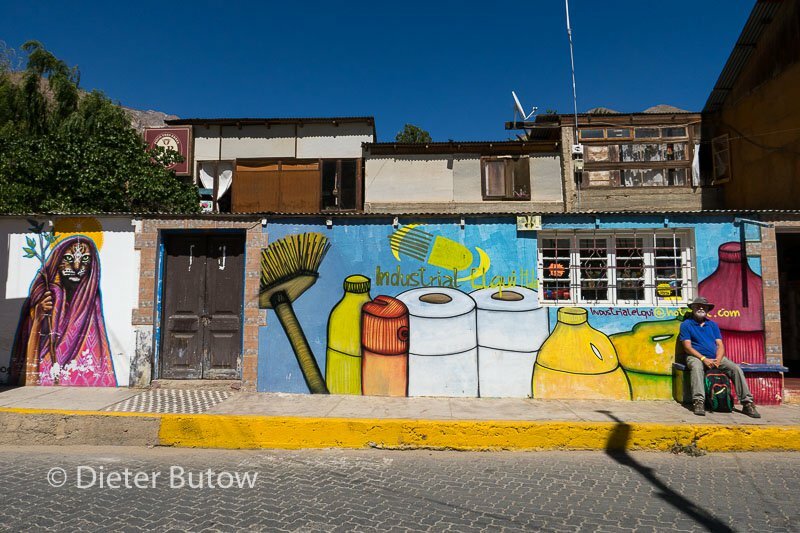 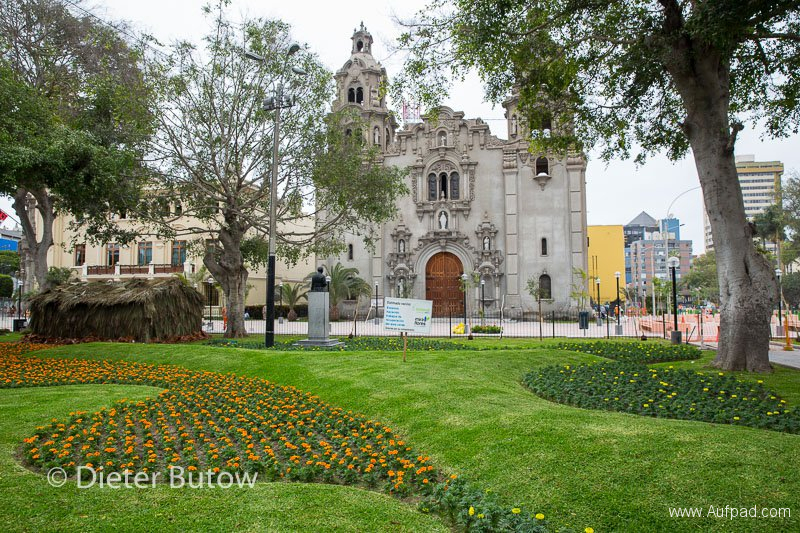 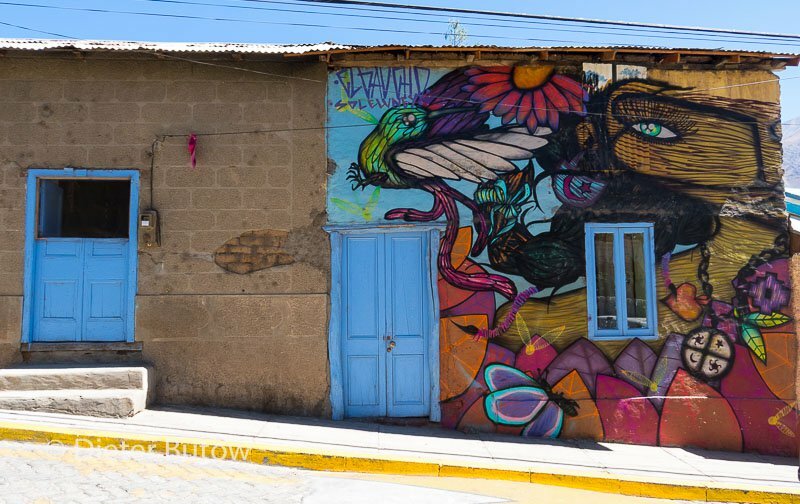 We continued via Chivay, Chucura and Yura to Arequipa, where we spent another night at Grace Valley hospedaje, conveniently situated around the corner of Plazavea supermercado so we could still do some essential shopping before dark. 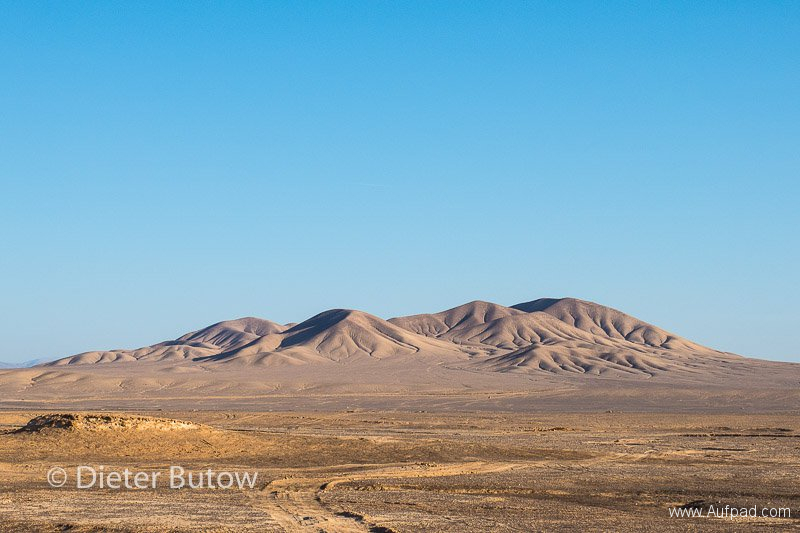 Next morning we continued south through La Repartición, La Joya, Moquegua, Camiara to Ité on the coast. On our way to La Boca del Rio, we found a convenient wild camping spot at the deserted Club de Pescadores along the beach just below the main road, a few kilometres before we got to the town. 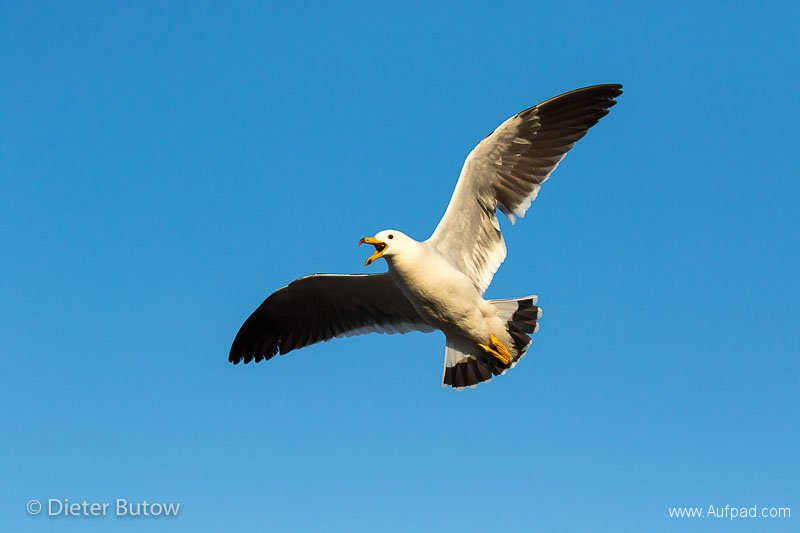 A pair of seagulls were repetitively diving towards me while photographing, although I could not spot their breeding spot. 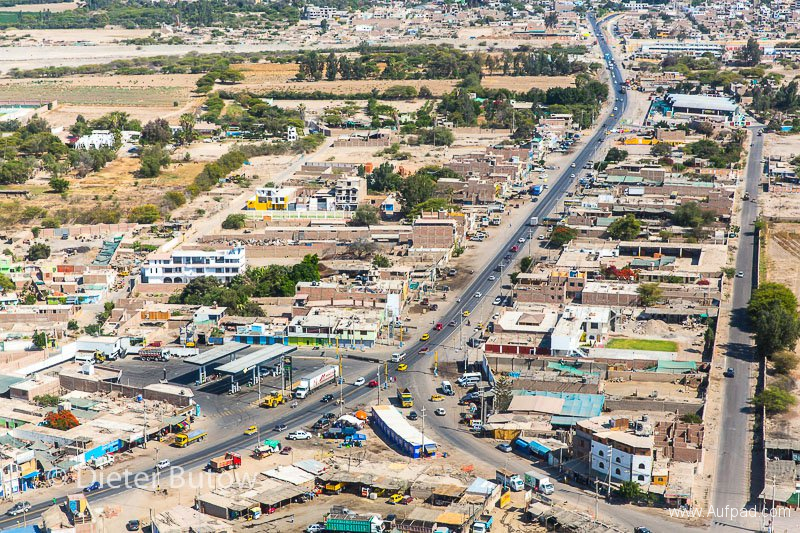 Next day we travelled past Tacna and crossed the border into Chile without too many problems. 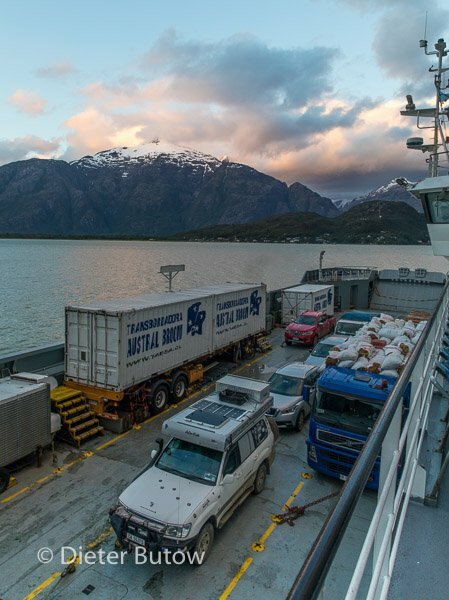 The Chilean customs officials were thorough in their search for fresh fruit and vegetable, which cost us one apple and two potatoes after scanning the luggage. Even our top box was scrutinised. 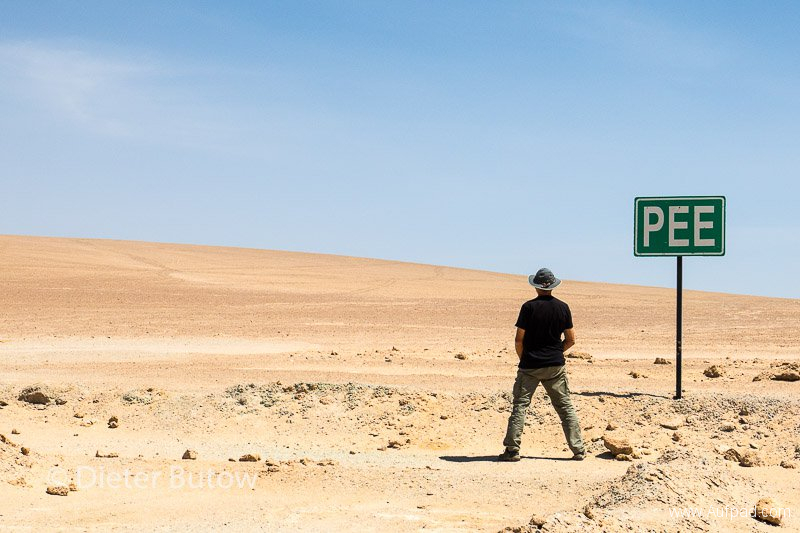 The border crossing took approx. one and a half hours. 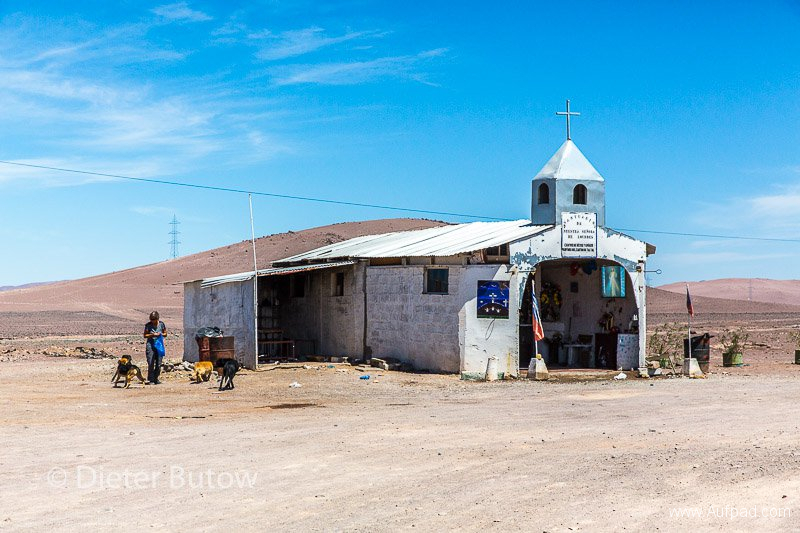 Eventually we stayed just north of Arica at Camping Josefine where owner Paula, ably assisted by her lovely 6 year old daughter, runs the site. 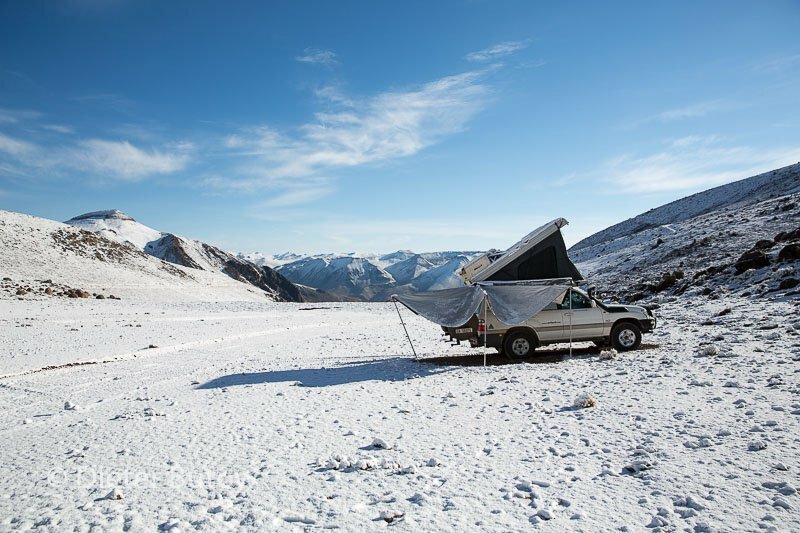 Not the best camping site but adequate for a night. The beach area, 2km away, teemed with terns and gulls. 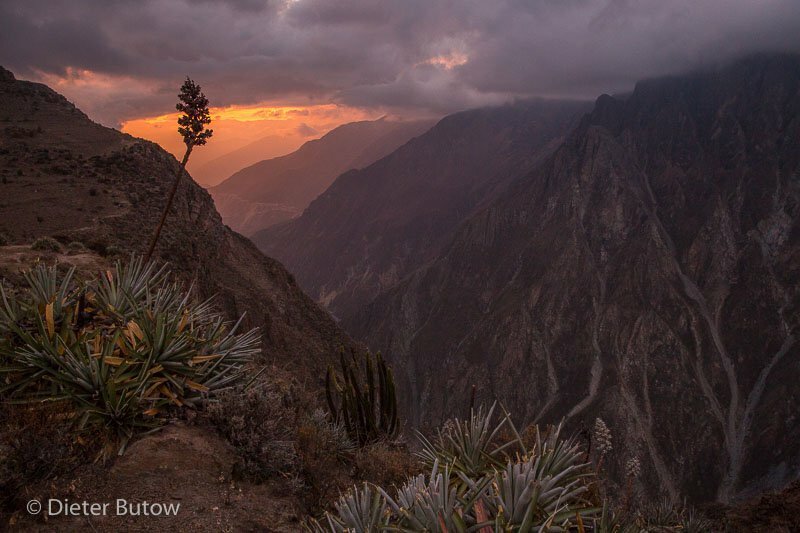 Peru has the highest Andes mountain peaks in South America – not surprisingly also the deepest Cañon in the world. 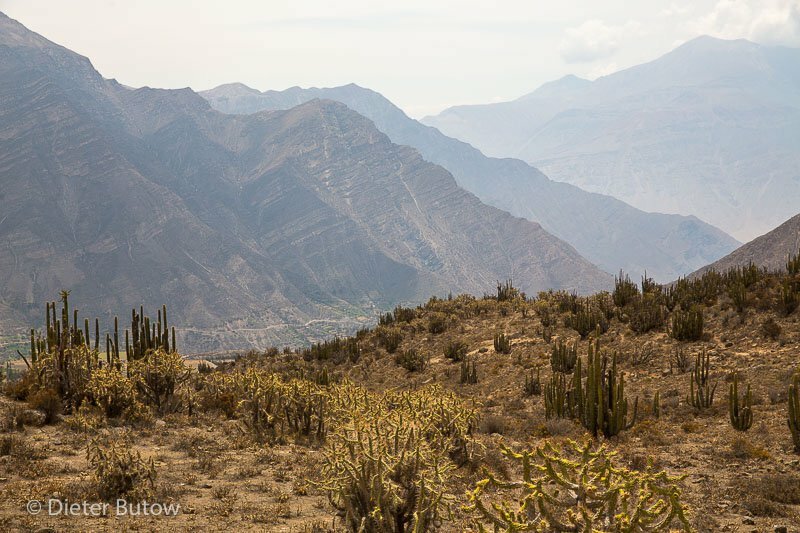 Cañon de Cotahuasi is very remote and difficult to get to – and we did not expect the surprises along the way. 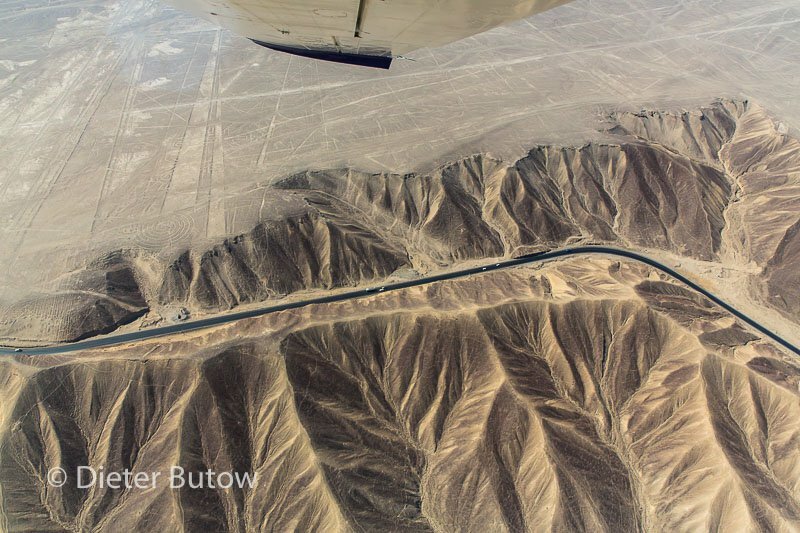 Wenn wir schon die höchsten Gipfel der Anden bestaunen konnten, wollten wir uns den tiefsten Canyon der Welt nicht entgehen lassen -allerdings mit ein paar unerwarteten Überraschungen auf dem einsamen Weg dort hin. 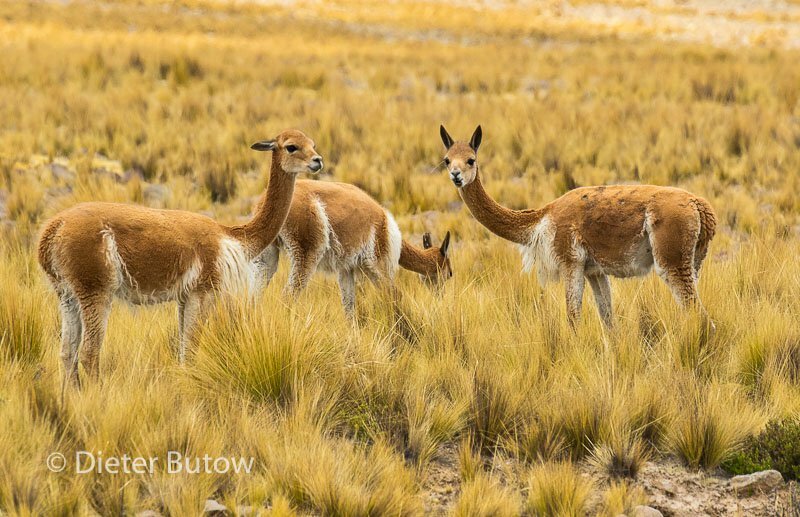 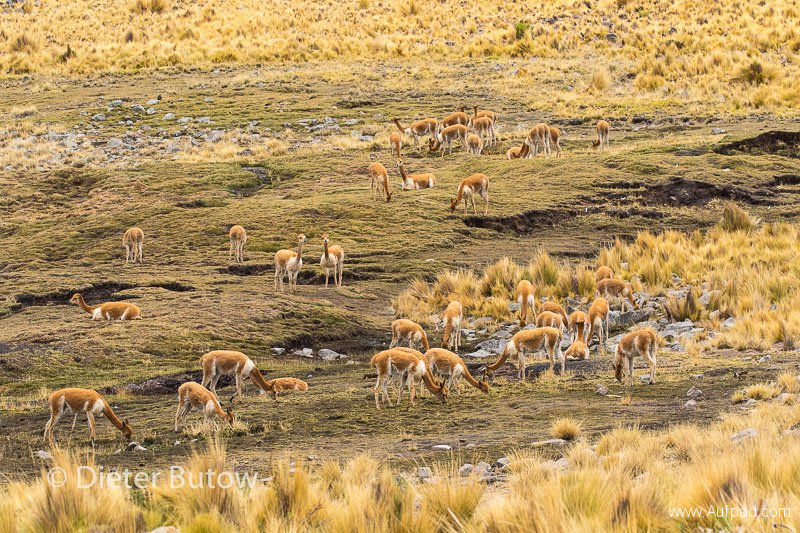 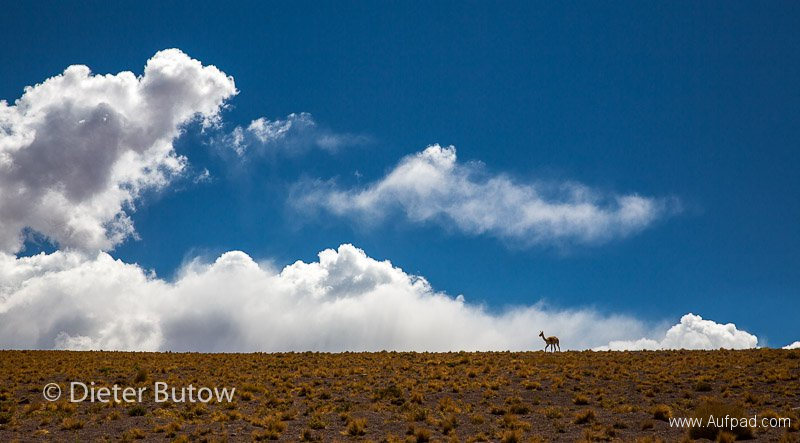 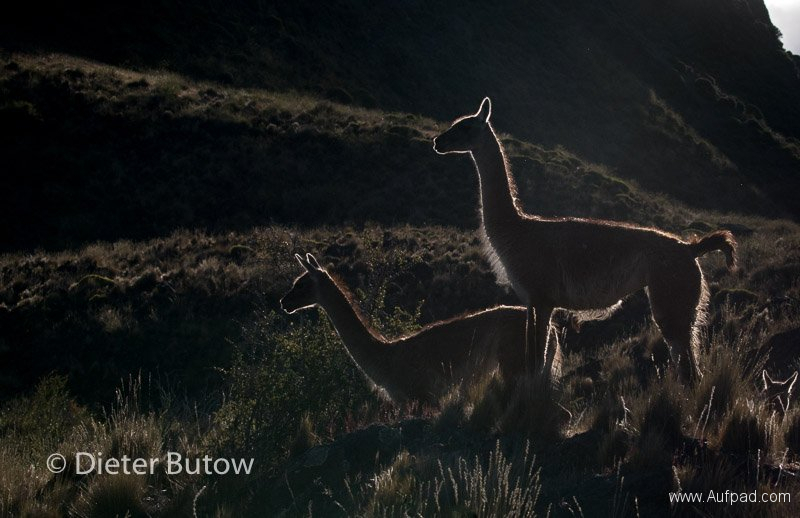 Once we had left Nasca we took Ruta 30A eastwards via Puquio, a road with many curves and wild Vicuñas grazing. Underway we met Axel & Erika in their bright yellow Unimog who are already travelling for 3 years with their dog. 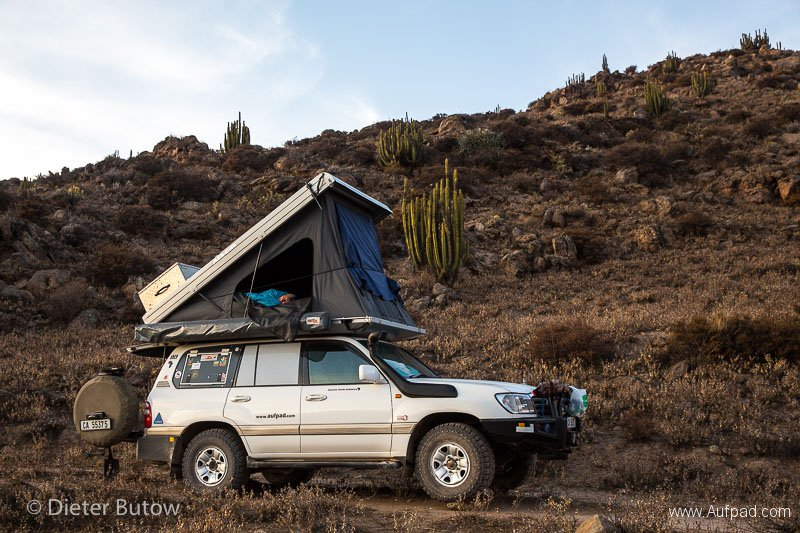 The day ended with us camping wild at Laguna Yurira at an altitude 4400m – we were prepared for a ice cold night as it started raining a few drops. 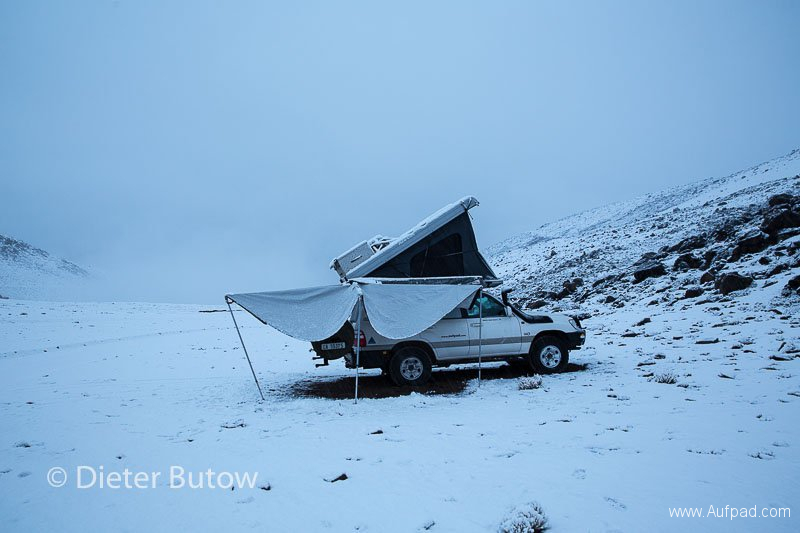 Following a quick supper we crept into our roof tent to shelter from the cold. Since we could feel tingling in the hands and feet and had altitude headache, we decided to take some Diamox as it has been a climb of almost 4000m within a day -not good. 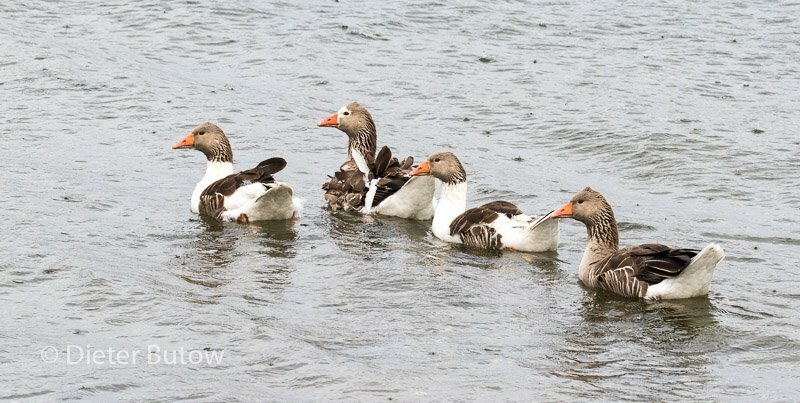 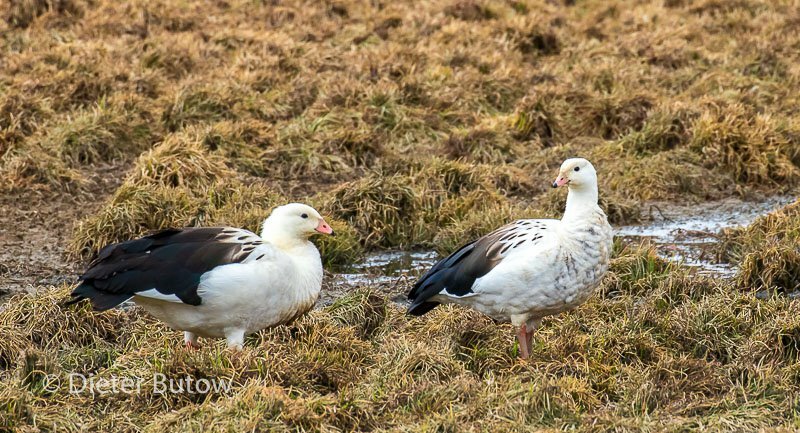 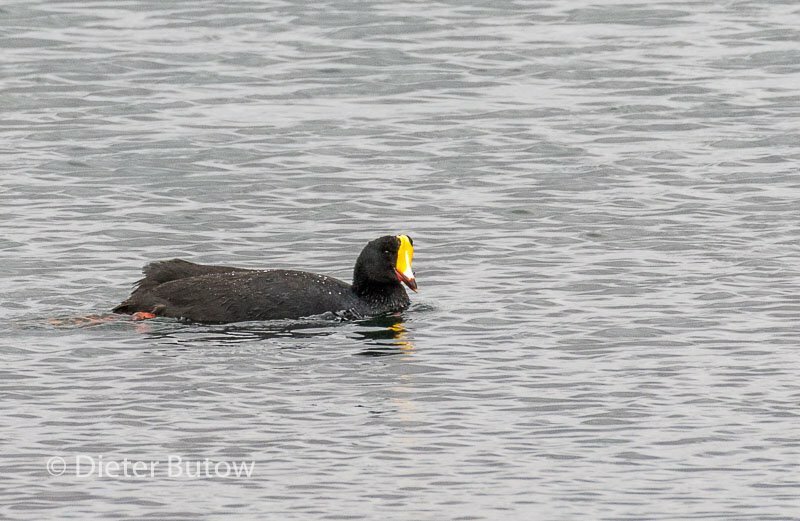 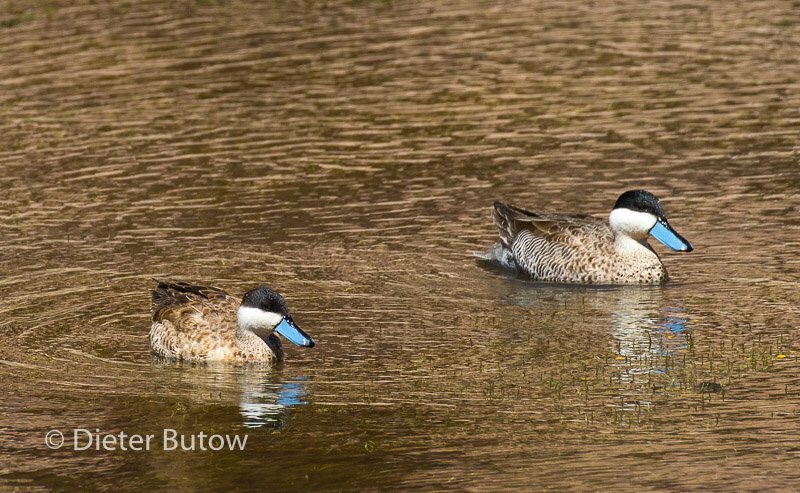 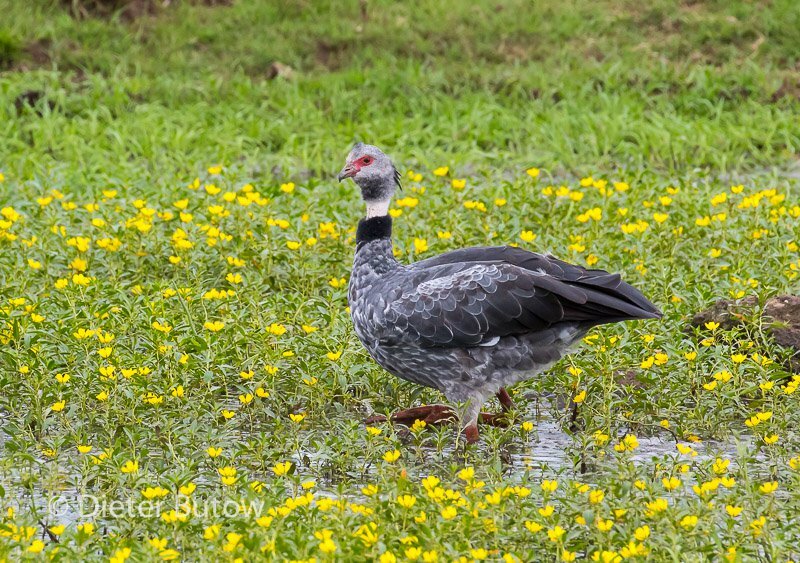 In the morning we observed some Andean geese, Yellow-billed Teal and Giant Coots (as well as one lonely sheep -we named him Shaun). 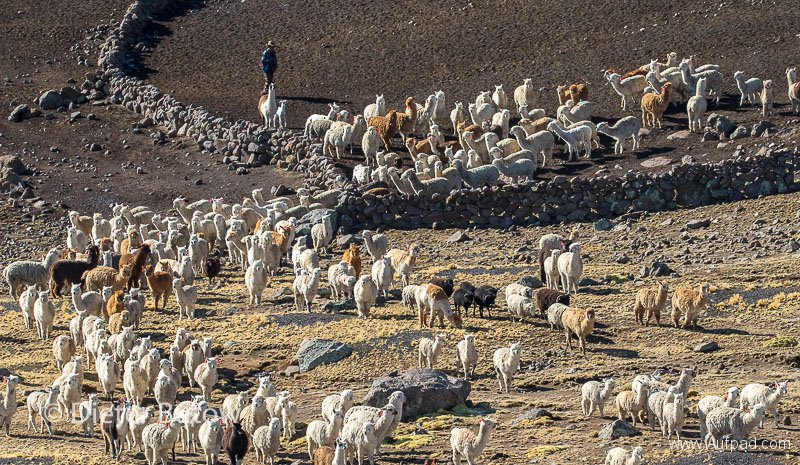 Less and less herds of Llamas were seen. 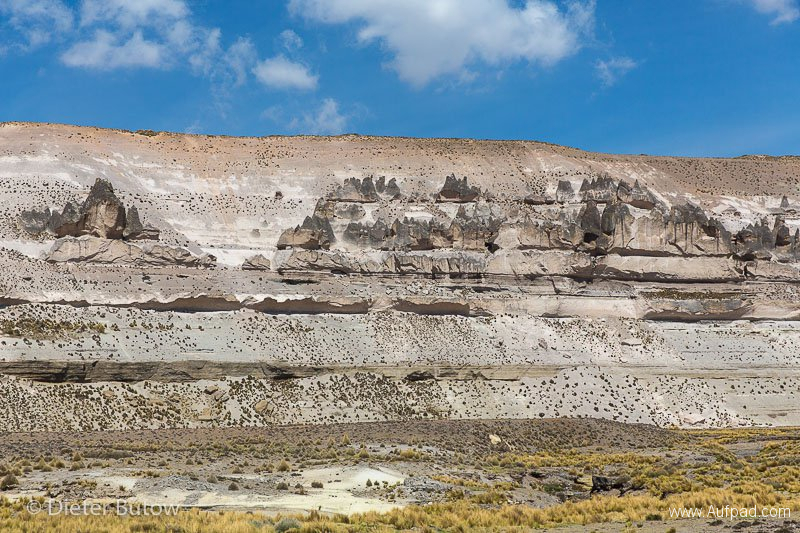 Next morning we carried on along the 40A and turned off close to Rocruzca onto Ruta AR105, a small and rough road. 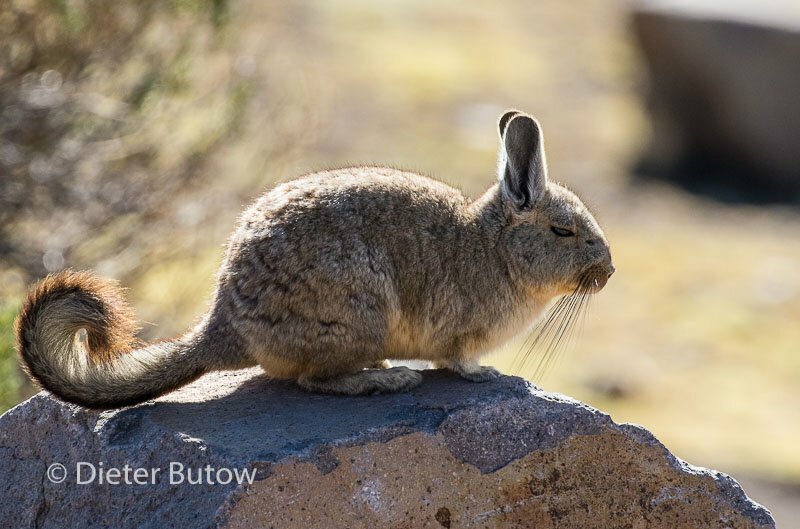 At the turnoff our details were recorded at a boom -not to sure for what purpose.We discovered some southern Viscacacha (chinchillas), cute with their curly tail. 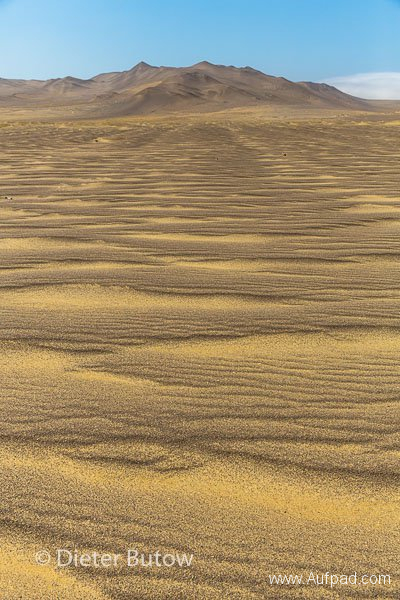 As we drove along AR105 the area became very desolate and remote – virtually no people left except one herdsman who walked up a hill when he spotted us photographing. 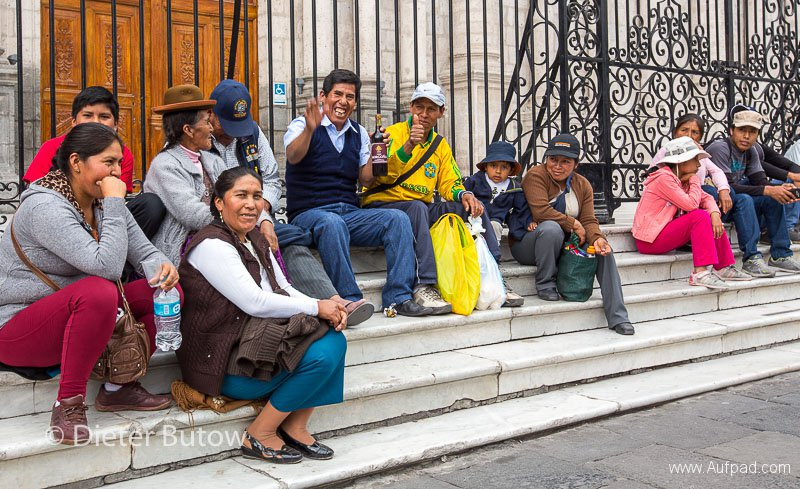 A few provisions made his day. Towards afternoon a thunderstorm was developing, dark grey and threatening, but beautiful. We were reaching a height above 5000m. The temperature dropped and suddenly our road was obstructed by a small landslide. 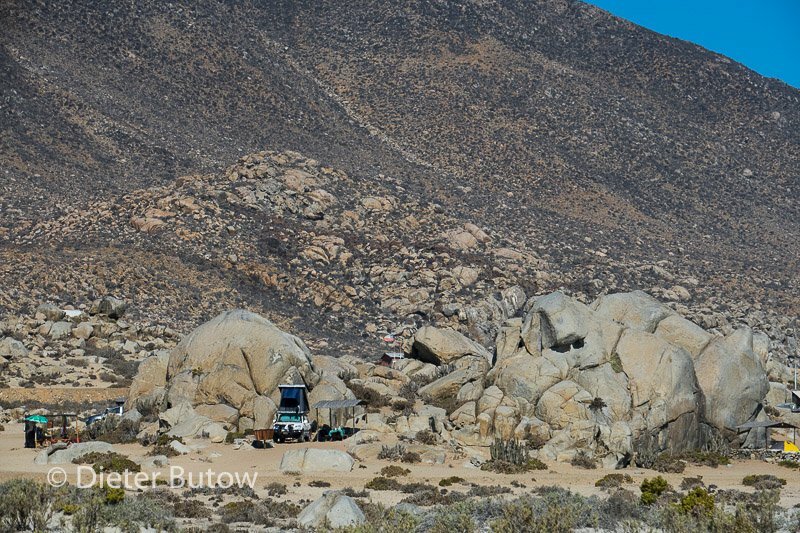 We could not squeeze by and had to start shovelling and rolled some boulders out of the way which we barely managed. 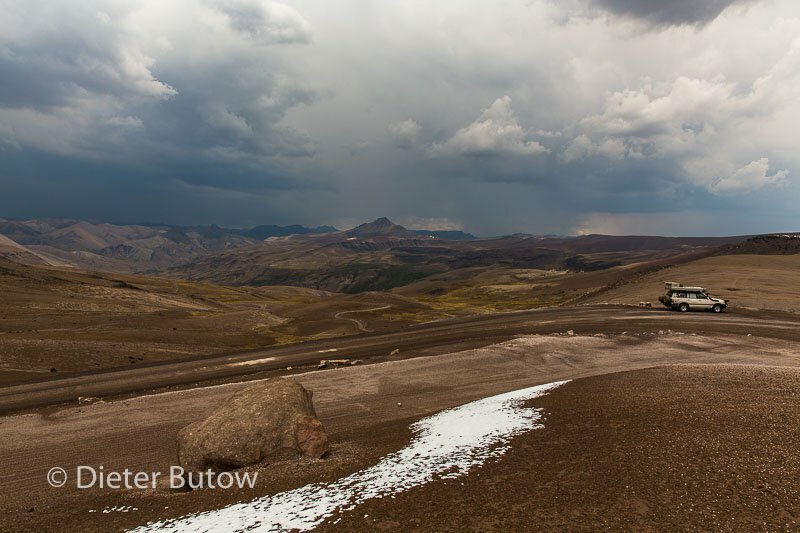 As we were shovelling the first sleet came down and then it turned into a snowstorm within the next 30 minutes – giving us just enough time to reach a reasonably level clearing where we could park. 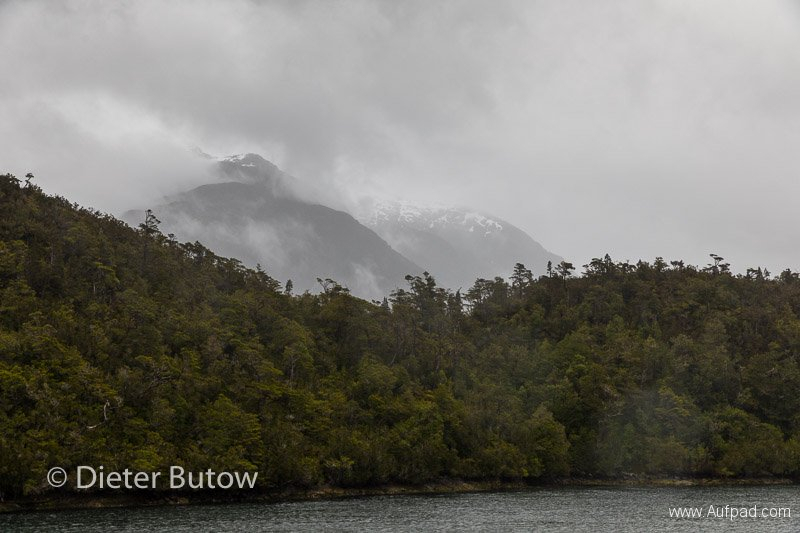 We could not see any tracks any longer, it got dark and within a short while we were covered in about 5cm of snow. At this point we decided to call it a day and crept into our tent. 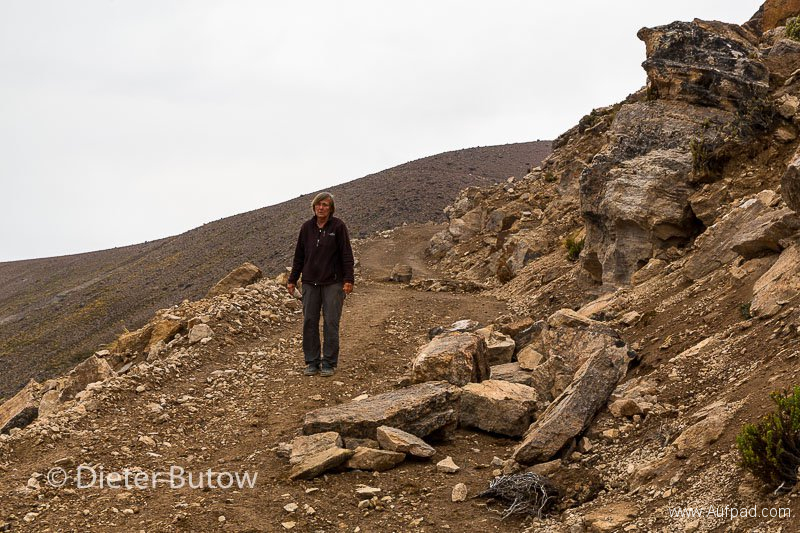 The altitude here was 4900m ( we managed still to come down from the 5100m we had reached an hour earlier). Not knowing how long we may be caught in the snow, I decided to restart the vehicle twice during the night and let it run for approx 20minutes. 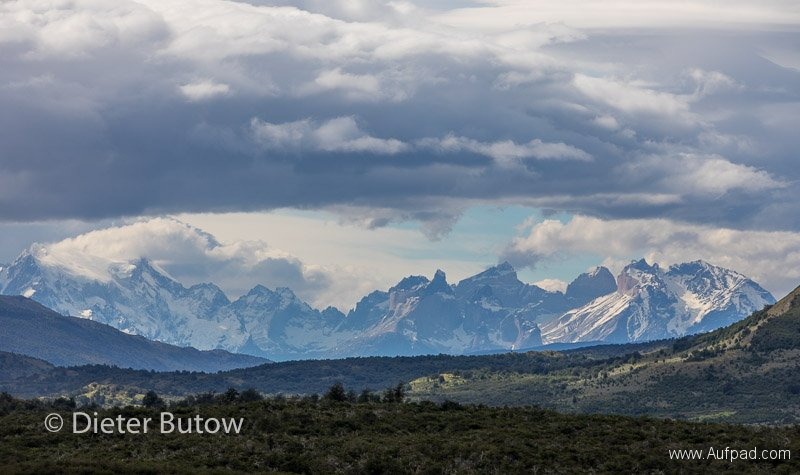 Luck was on our side – next morning the Cordillera de Huanzo mountains were clear, the snowing had stopped and within two hours of brilliant sunshine enough snow had melted for us to see the road again. 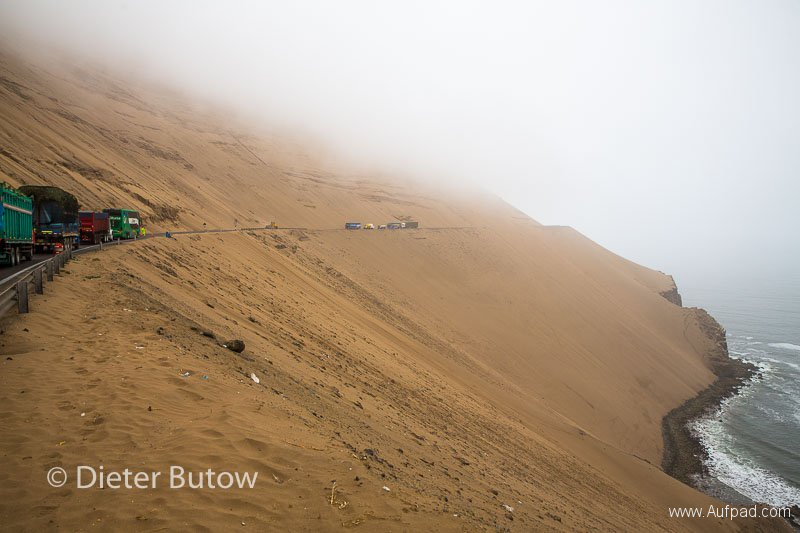 We continued albeit a little nervous about further landslides as there was no oncoming vehicles we could ask. 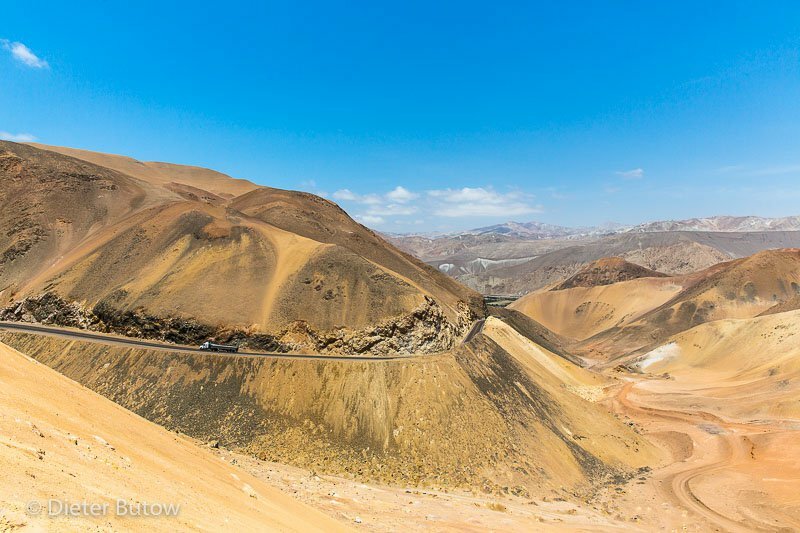 The road continued through the mountain ranges, up and down winding passes and through little remote villages like Puyca, Alca and Tomepampa. 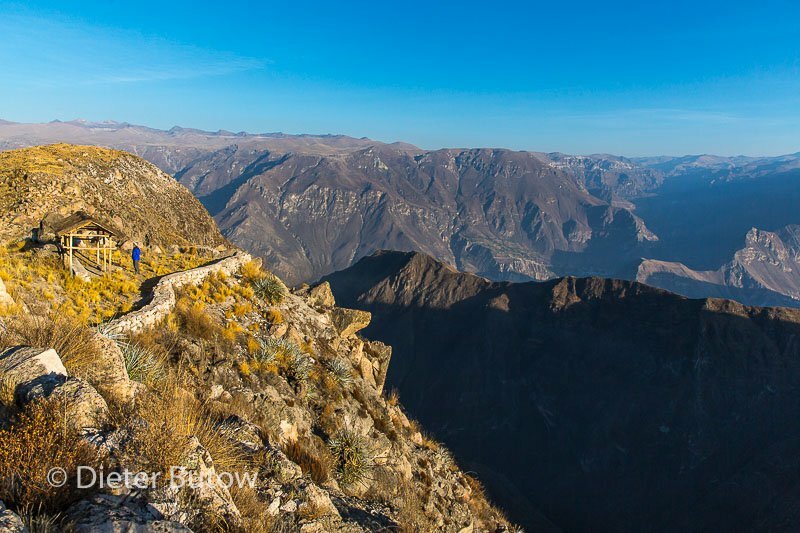 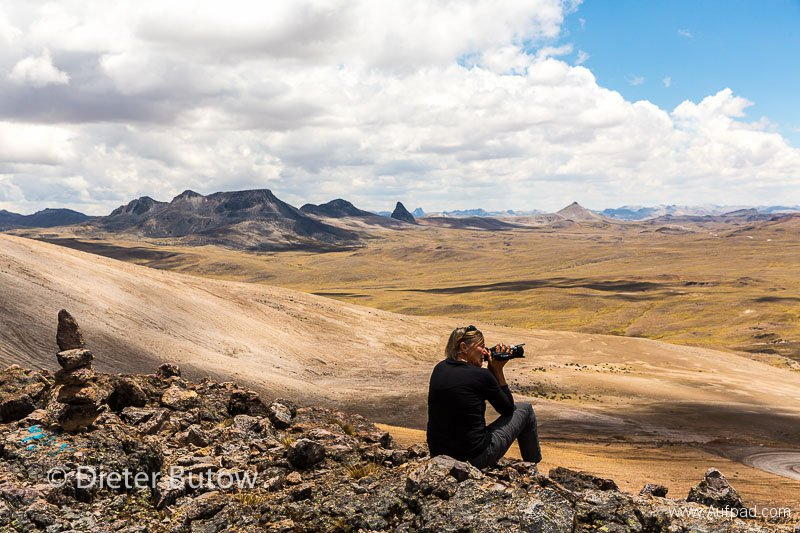 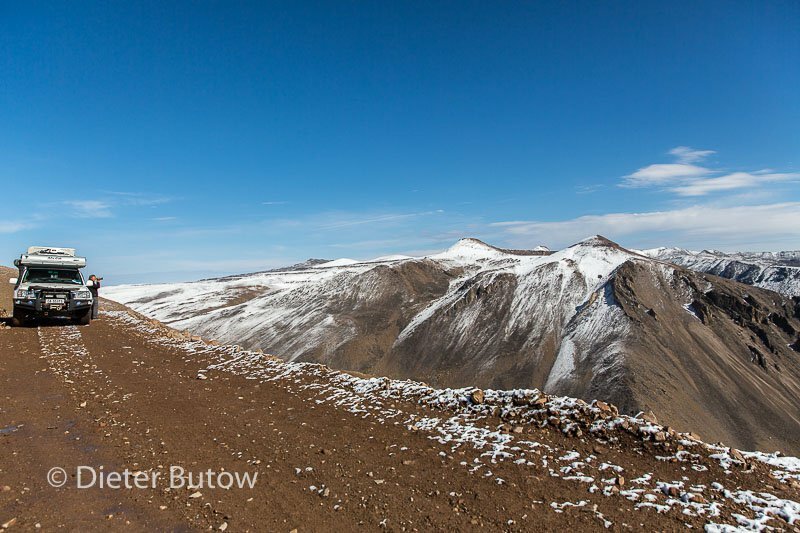 Finally we reached the Coatahuasi Cañon (3535m deep), where we stopped and camped at Mirador Bañadero del Condor with view of the distant town of Toro. 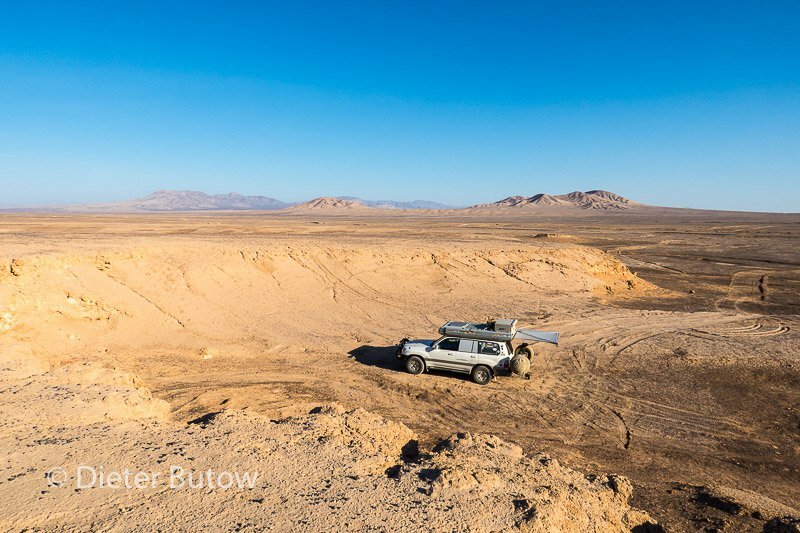 This viewpoint/camp can accommodate maximum 2 vehicles and there was even a loo! 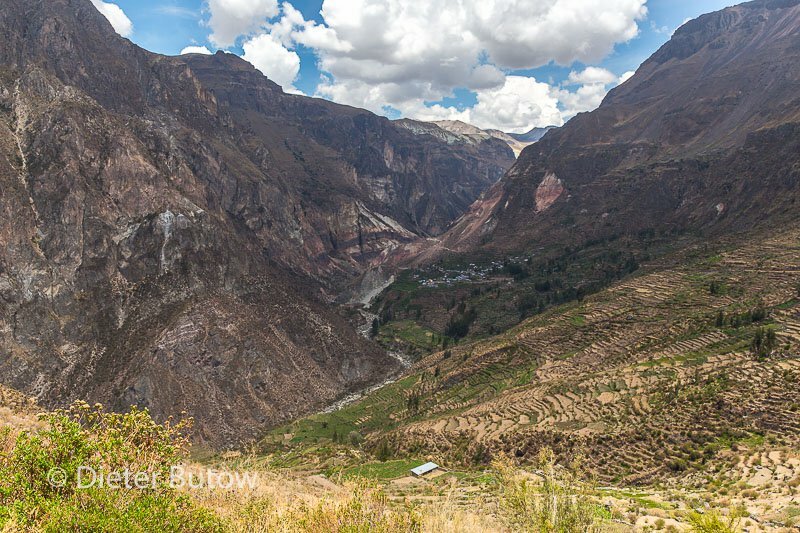 200m further is a lookout from where at times Condors can be seen bathing below a small waterfall high up on the opposite wall -we were not so lucky. 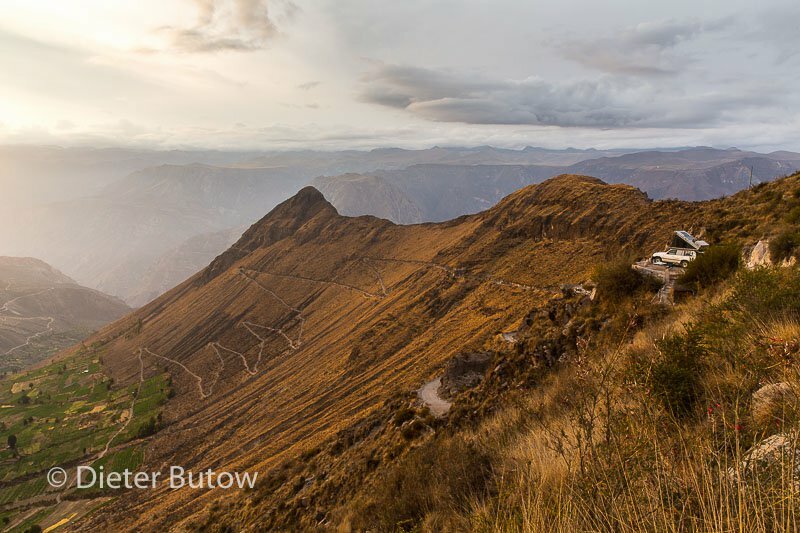 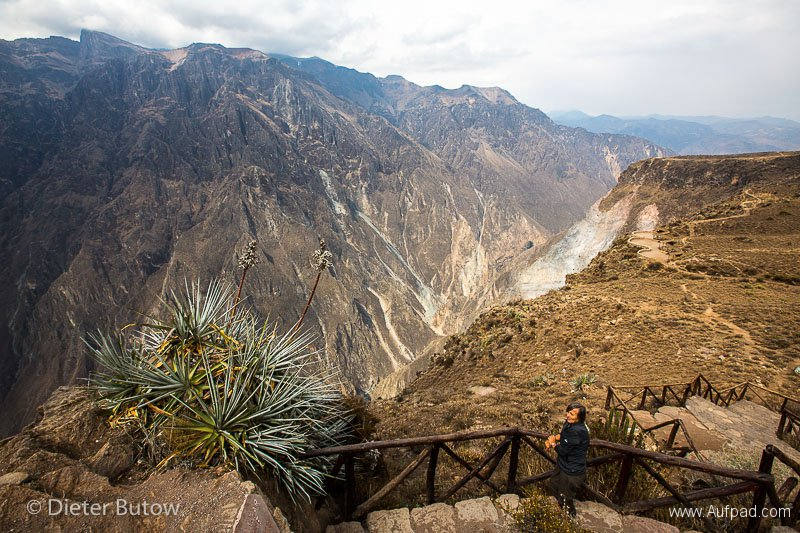 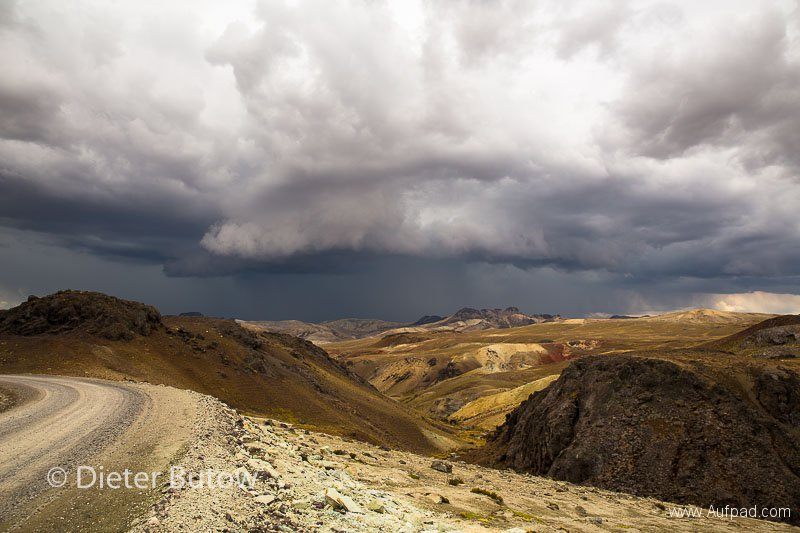 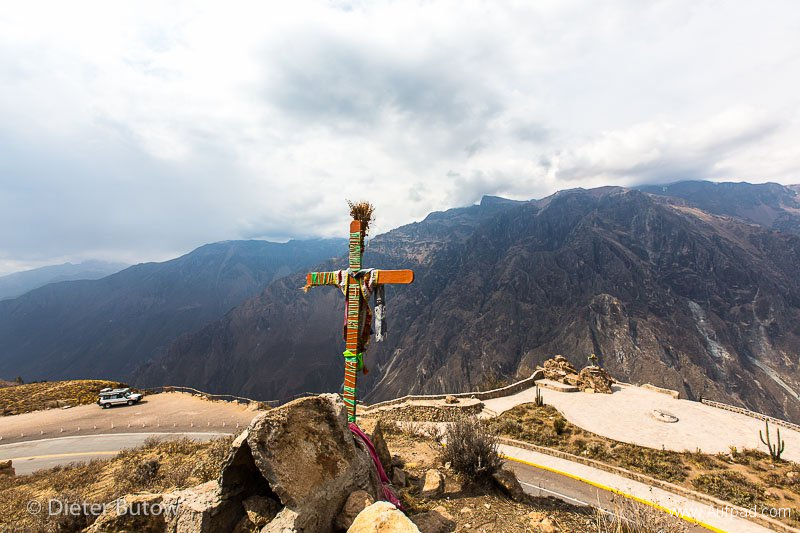 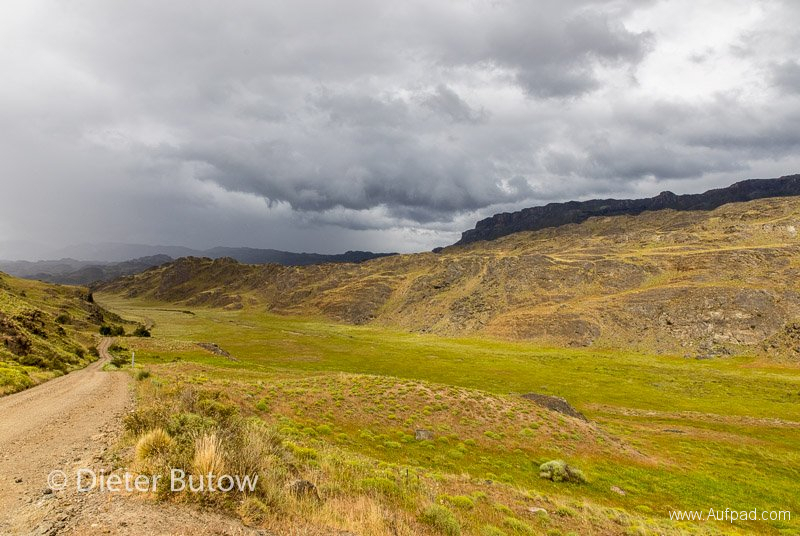 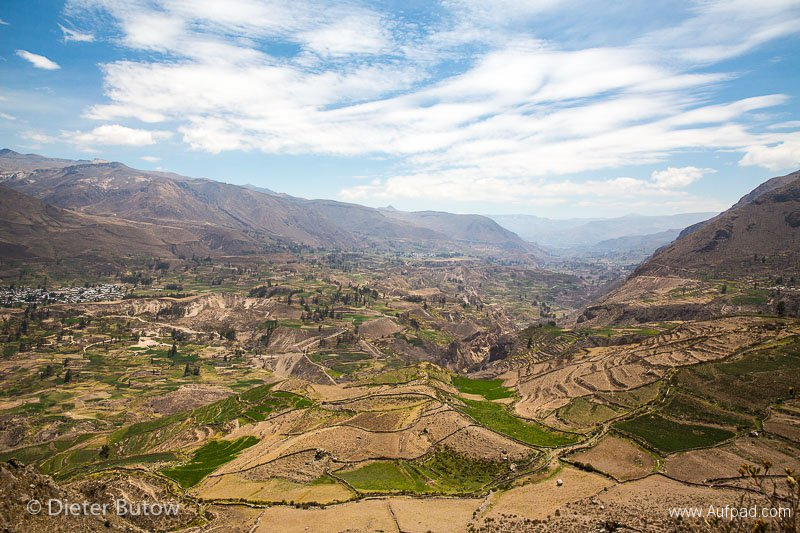 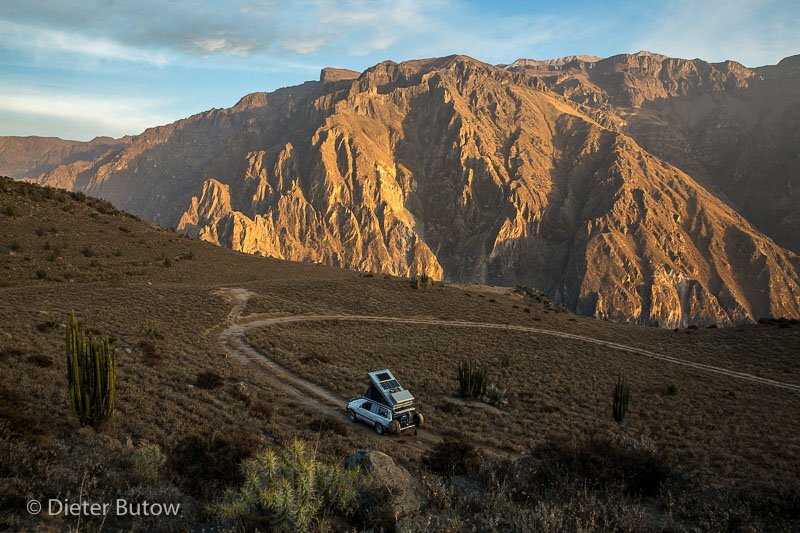 We found the journey to the Cañon exciting and one of the most remote and quiet areas in Peru. The cañon itself was maybe a little disappointing as we had envisaged grandeur like the Grand Cañon in Nevada or Fish River Cañon in Namibia. 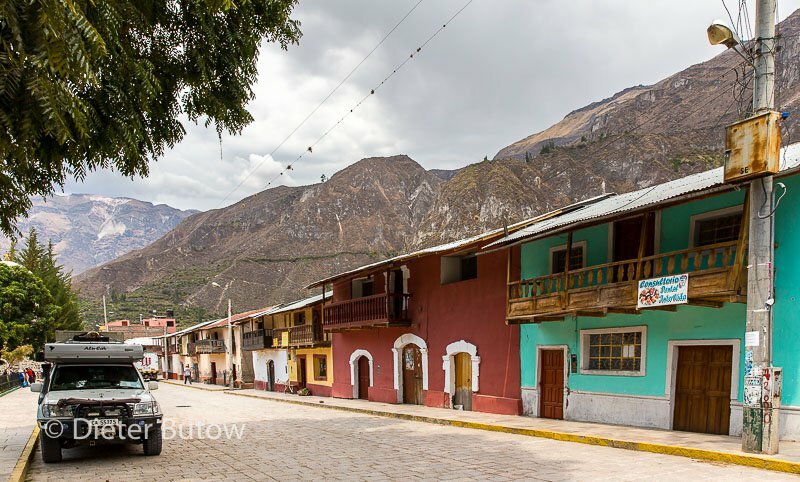 Cotahuasi is different – not so visible. 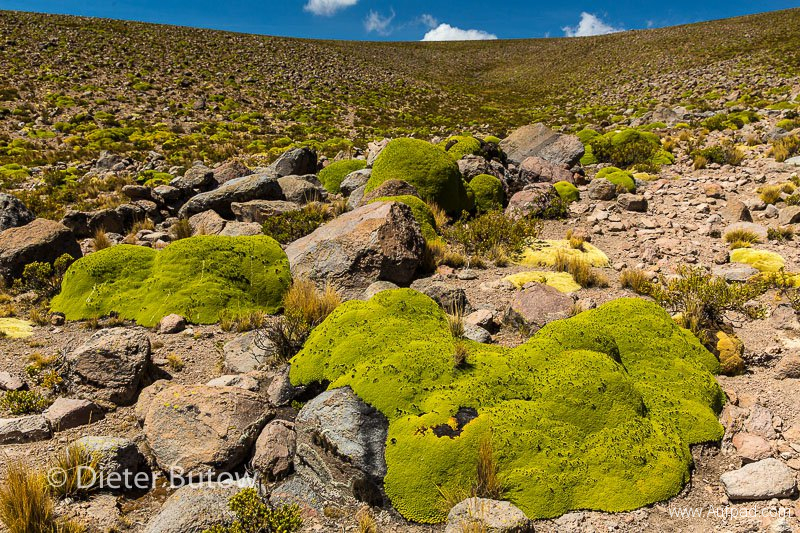 We continued through Puna landscape past the Nevado Solimana (6323m) and Nevado Coropuna (6613m), the landscape dotted with hardy green plants looking likes stones. 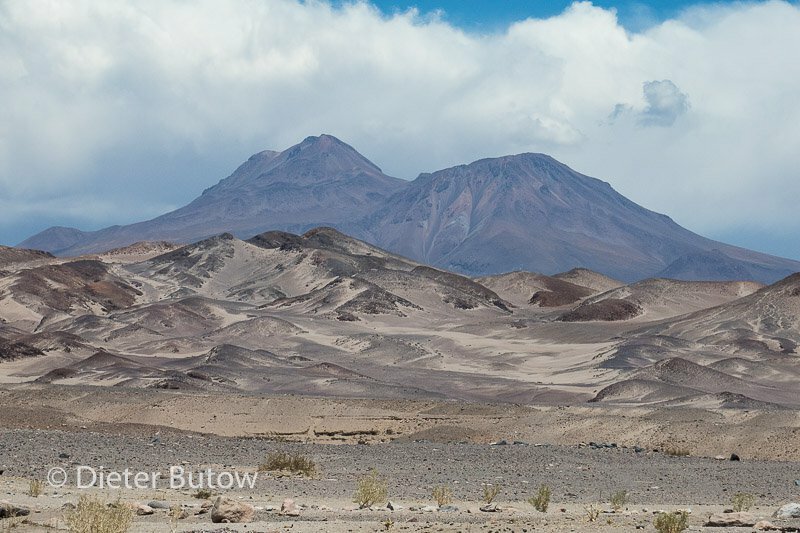 Wind picked up while we drove through the Pampas de Majes where we could barely make out the sandstone petroglyphs Toro Muerto in the distance -not the day to explore further due to incredibly strong winds and dust. 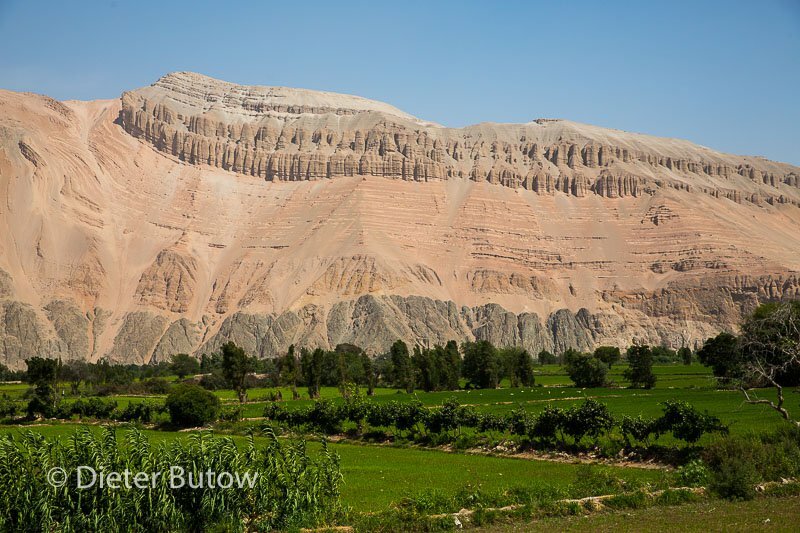 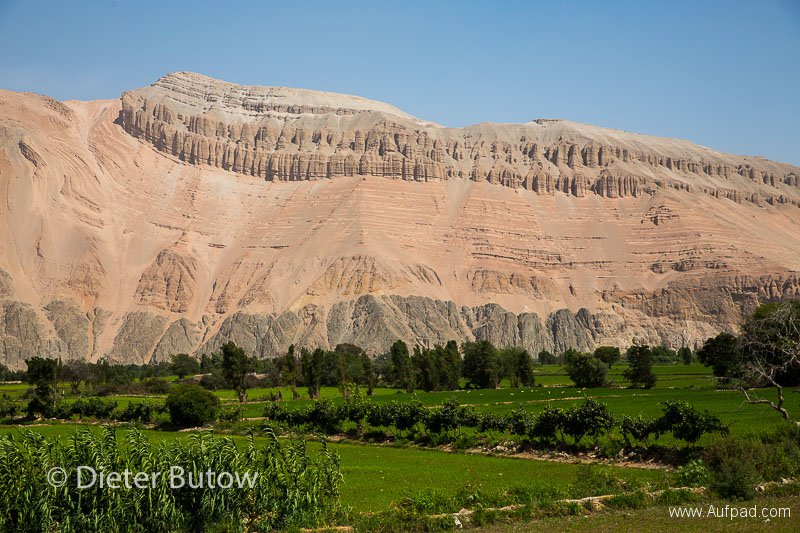 Barren mountains lined a very fertile and dark green valley with vines and rice. A lot a cacti grew on some of the slopes, the mountains pink and grey. Near Tambillo we turned into the stony desert and camped under clear skies full of stars, faintly aware of only a very distant rumbling of trucks along this stretch of road. 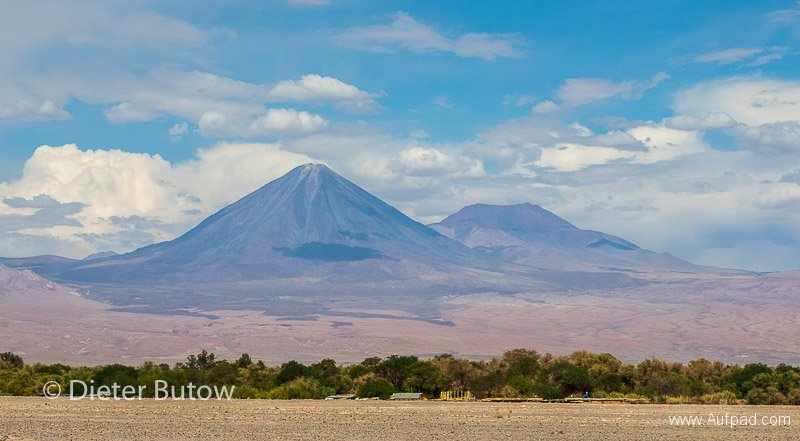 Soon we reached Arequipa and found a pleasant place to stay, Grace Valley B&B with Diana and her mother running it and making us feel very welcome -especially since it was Xmas. While in Arequipa we could get the vehicle serviced at Mitsui Toyota on short notice,a professionally run workshop with one assistant in sales speaking English to translate. 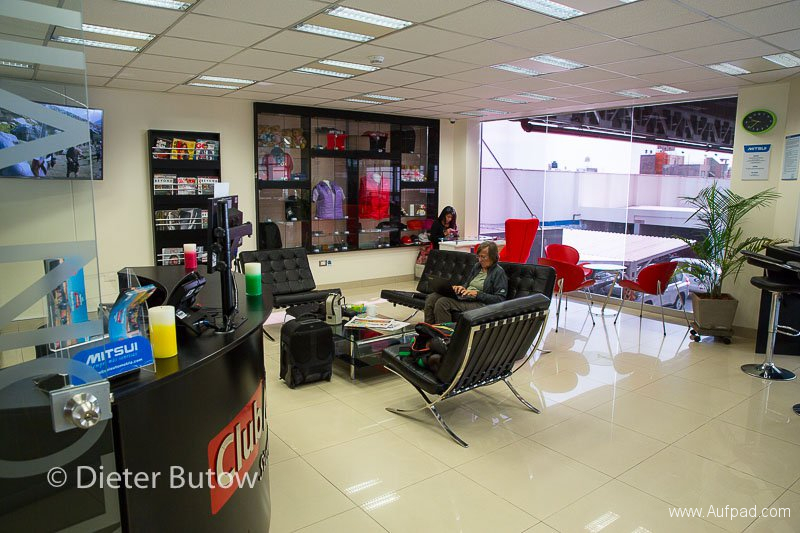 We relaxed in the comfort of the client lounge with view of the workshops. 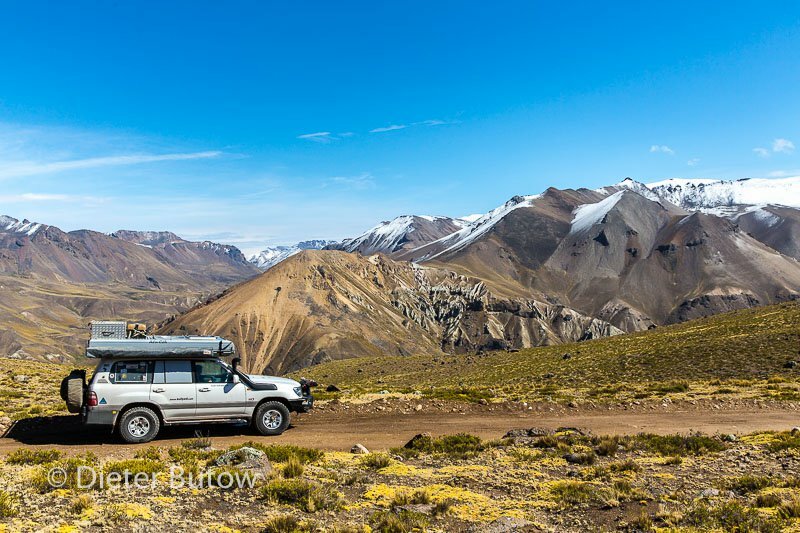 While in Arequipa we found our vehicle’s starter batteries failing ( the Landcruiser VX100 has two in parallel that are best replaced as a pair) and we managed to get two suitable replacements (Panasonic brand to get a one year warranty in all the countries we were due to visit). 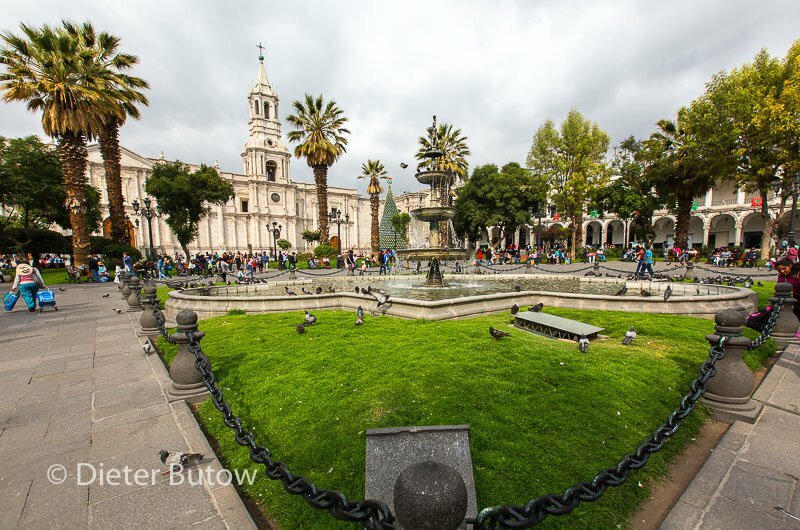 We also found that from Grace Valley we could reach the old city on foot and the Arequipa Clinic by taxi, all very conveniently. Although it is possible to stay in the vehicle roof tent at the B&B, we suggest taking a room as the traffic noise can be loud. 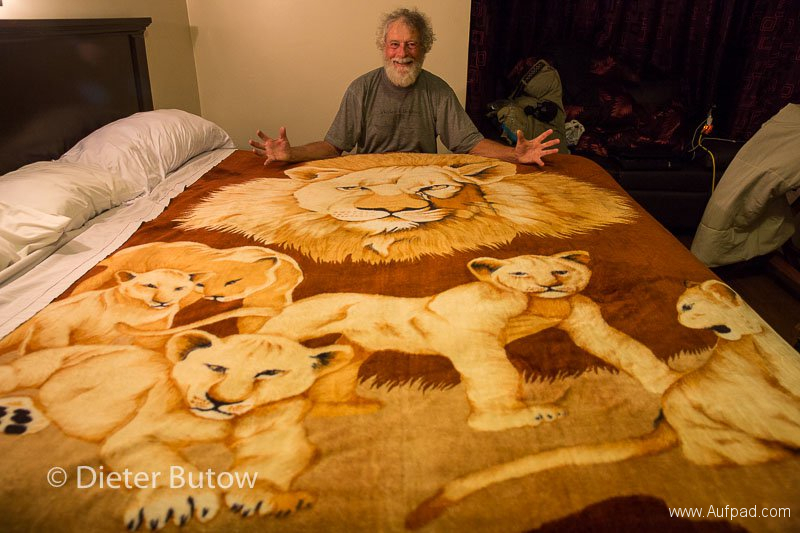 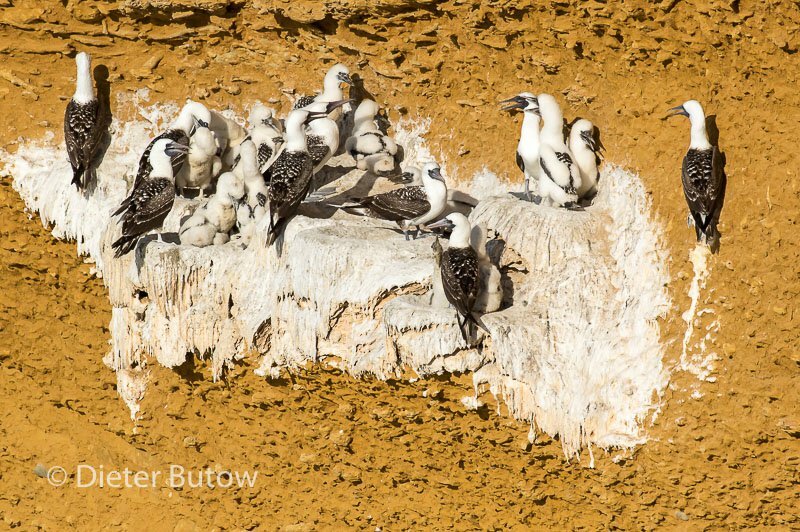 And maybe you are lucky getting the same blanket on your bed – a very homely feeling for us from Africa. 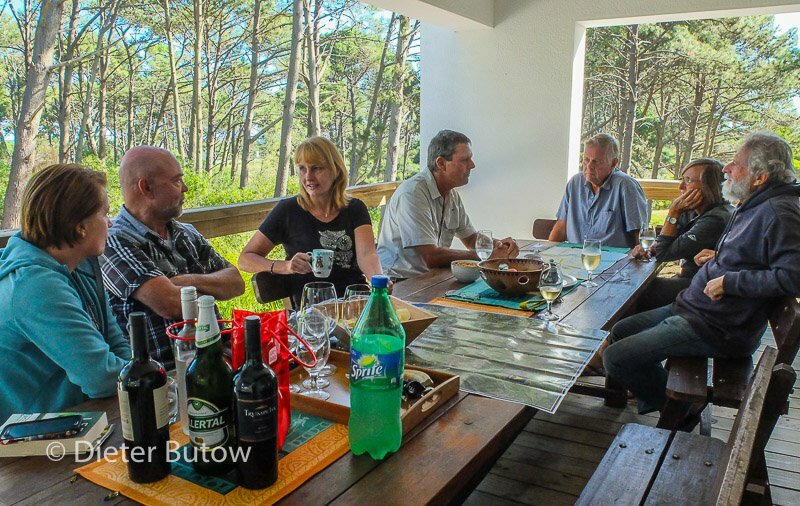 It was a pleasant stay at Grace Valley and Diana tipped us off to book at Zigzag restaurant for Xmas dinner – an excellent suggestion. We toured the old city, had a haircut and looked for a laundry. 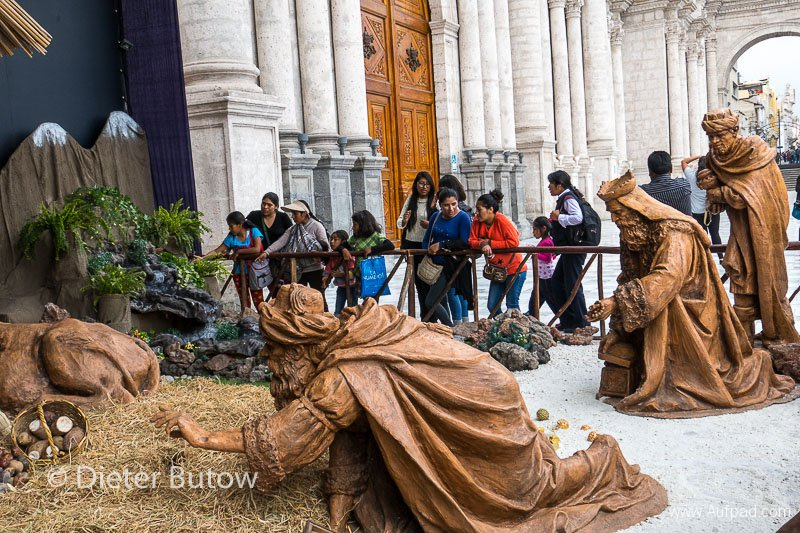 The central plaza was abuzz with families showing their kids the nativity play – little Jesus was missing (it only appear on Xmas Eve after the mass). Unfortunately the Santa Catalina monastery closed early and we missed seeing the inside which we believe is worth seeing. This made our decision easy to relax with a sundowner of different Pisco cocktails before going to supper. We decided to stay the 25th and got served a traditional hot chocolate, turkey and Italian cake for breakfast. 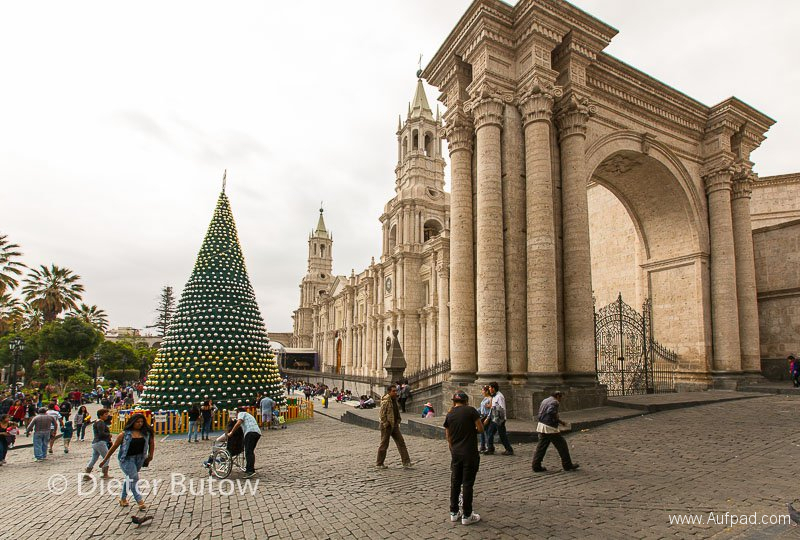 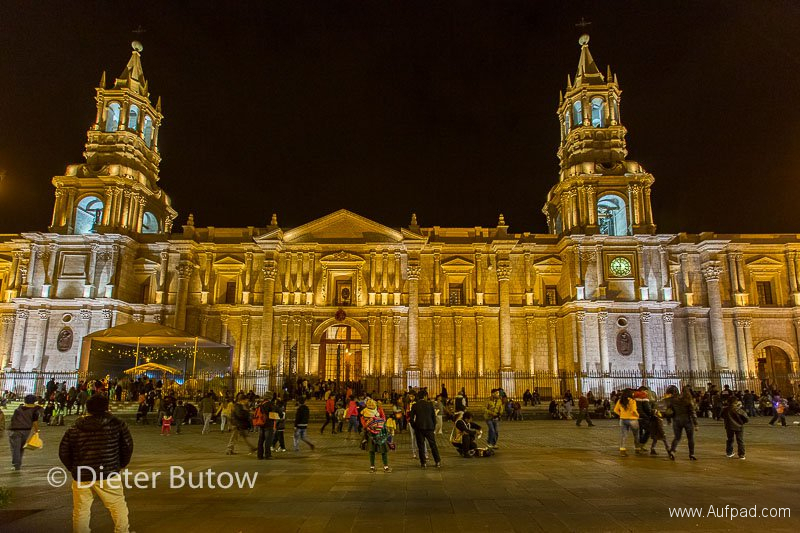 When in Arequipa for Xmas – stay up after midnight, as this is the time when the fireworks everywhere started which lasted two hours. 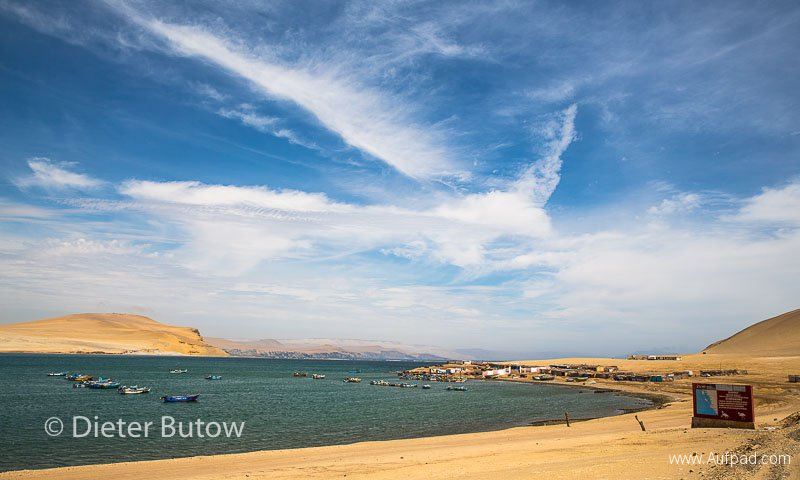 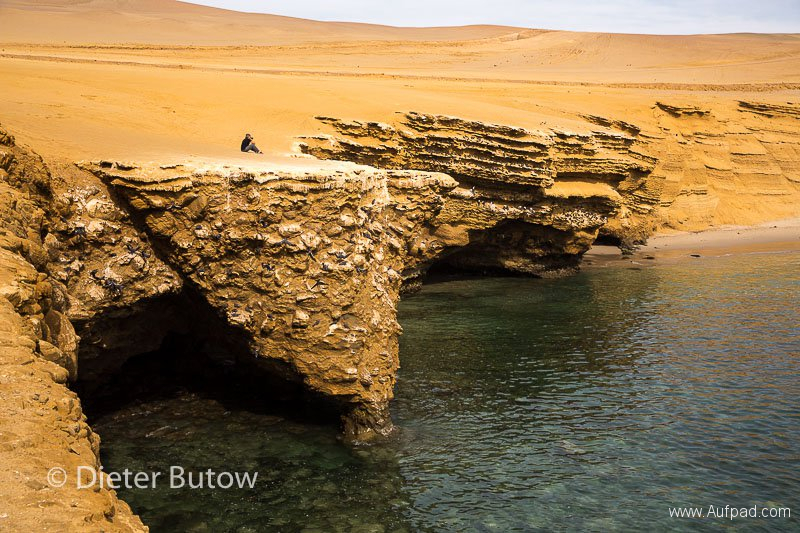 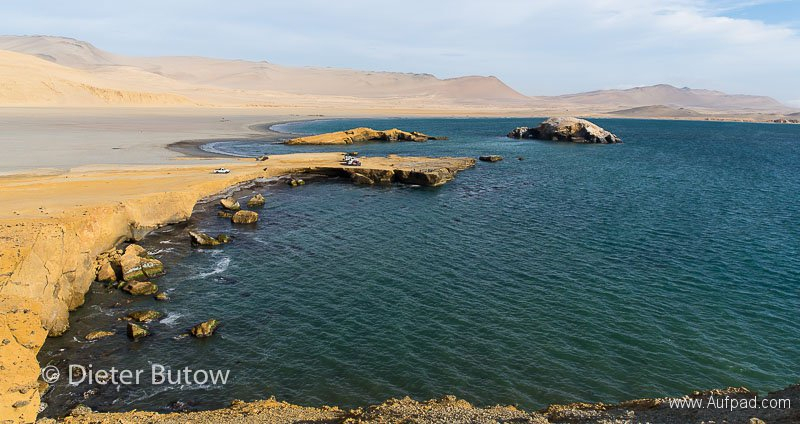 Although the coastal area of Peru is mainly desert, we found a visit to the Paracas National Park attractive as it reminded us of our home country, Namibia. 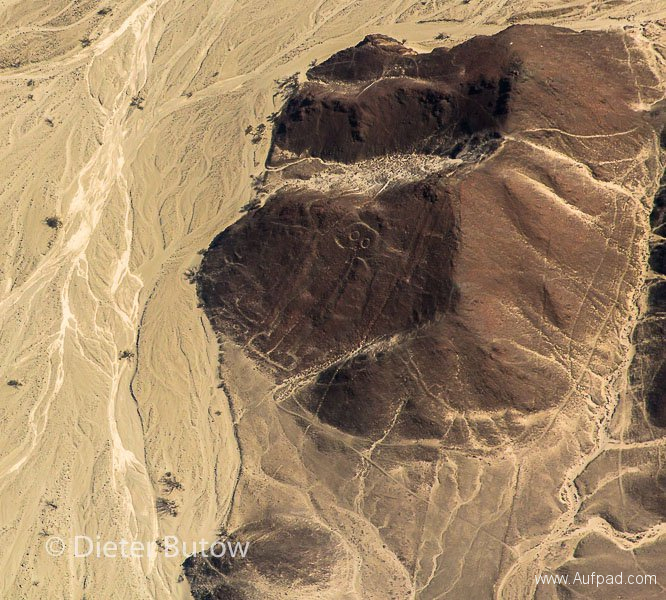 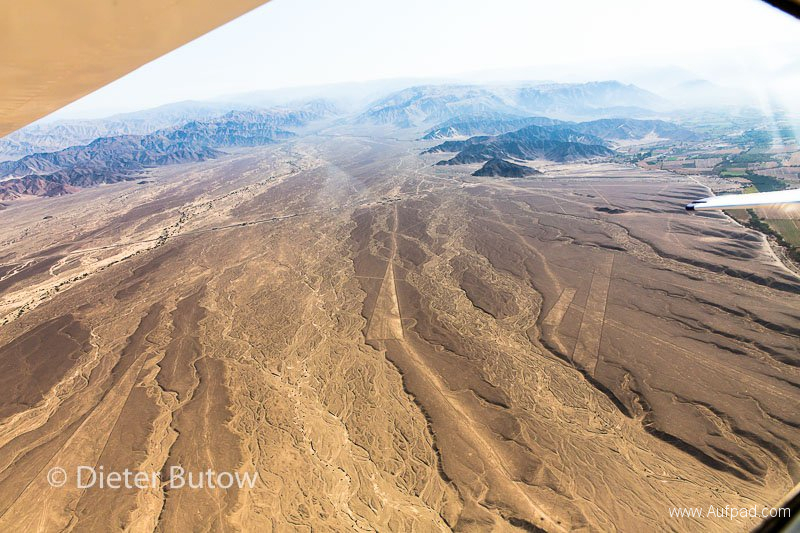 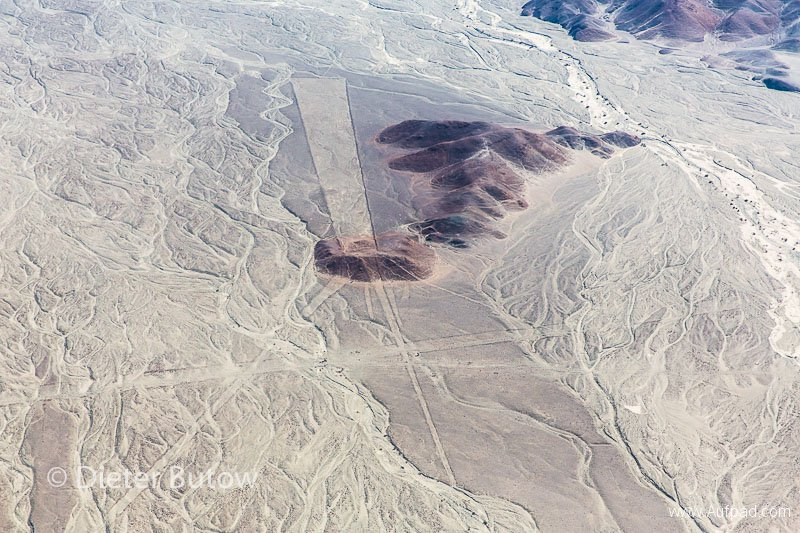 Having a closer look at the mysterious Nasca lines reminded us of books of Erich von Däniken we had read many years ago. So we decided to have a closer look. 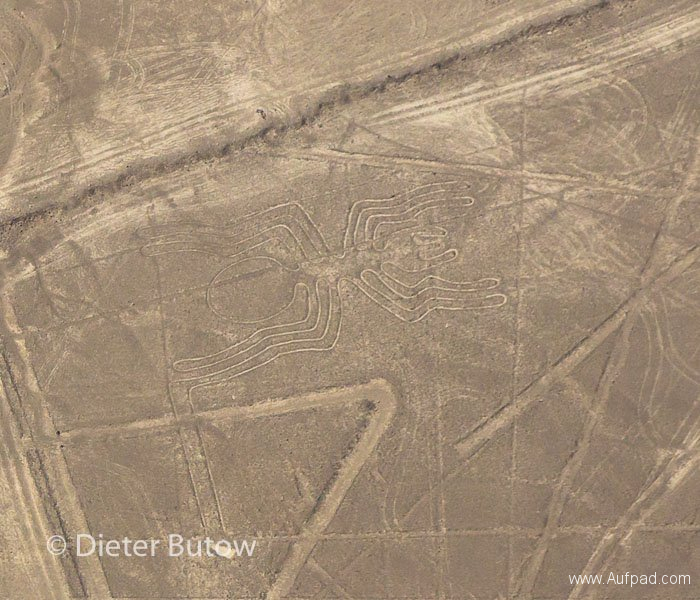 Ein Flug über die Nazca Linien klang reizvoll. Hatten wir doch über die von Däniken Theorien gelesen, dass diese Linien und Geoglyphen für oder von ausseridischen Wesen stammen könnten. 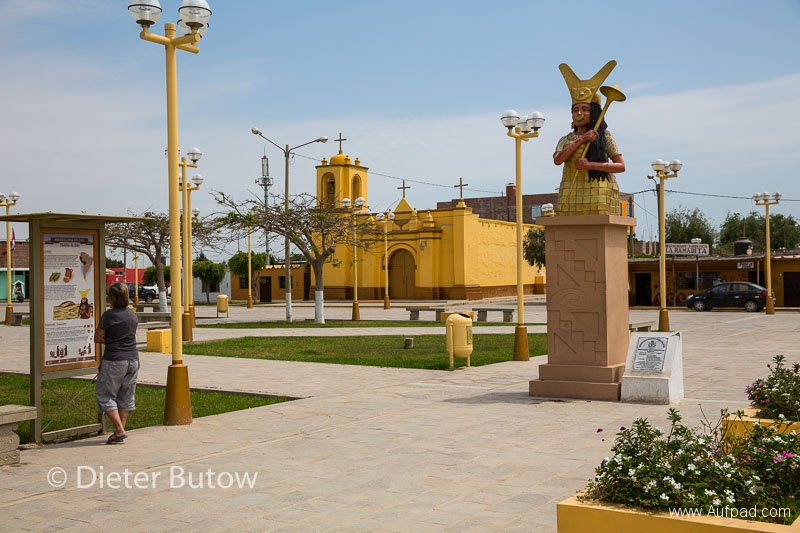 The PanAm Sur to San Vicente de Cañete is a good stretch of highway with many holiday developments along it. 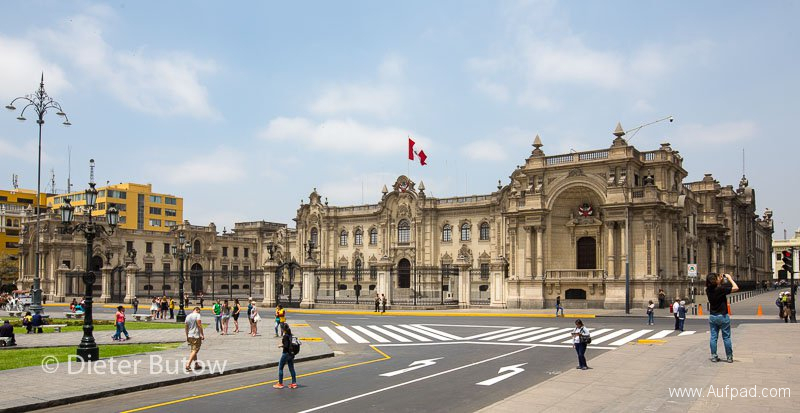 It is close enough to Lima to be conveniently reached for weekends. Past Chincha Alta we briefly stopped in the town of Pisco. 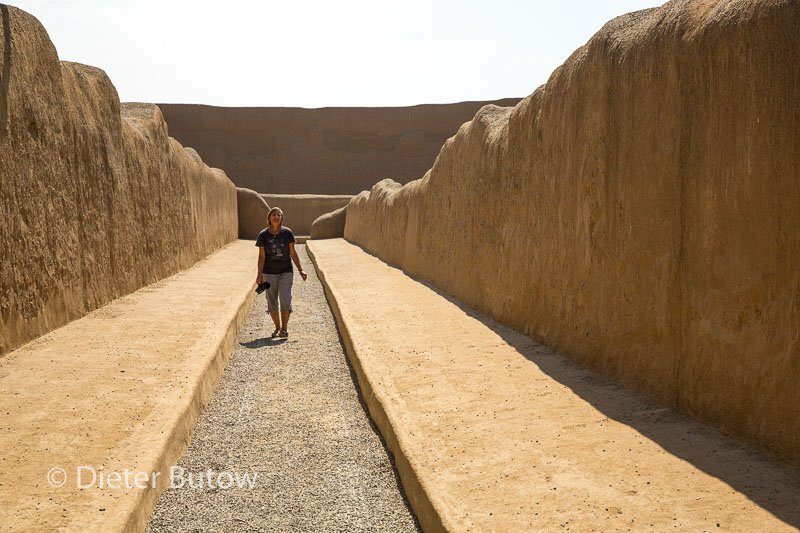 This area was hit by an earthquake during 2007 but most is reconstructed. The famous Pisco liqueur is distilled in this area and shops along the road offer many variants of it. 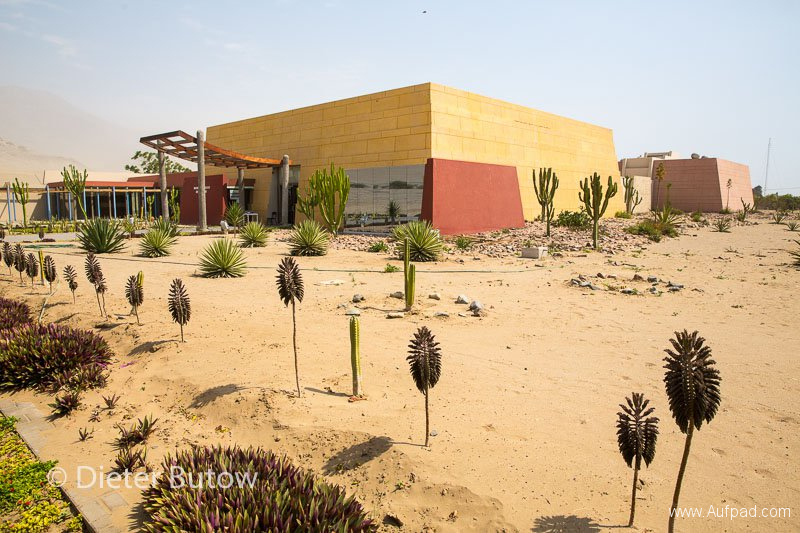 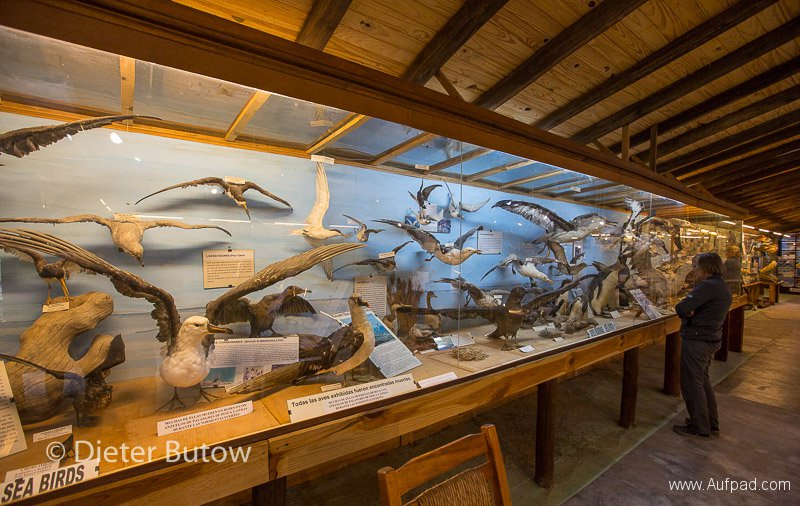 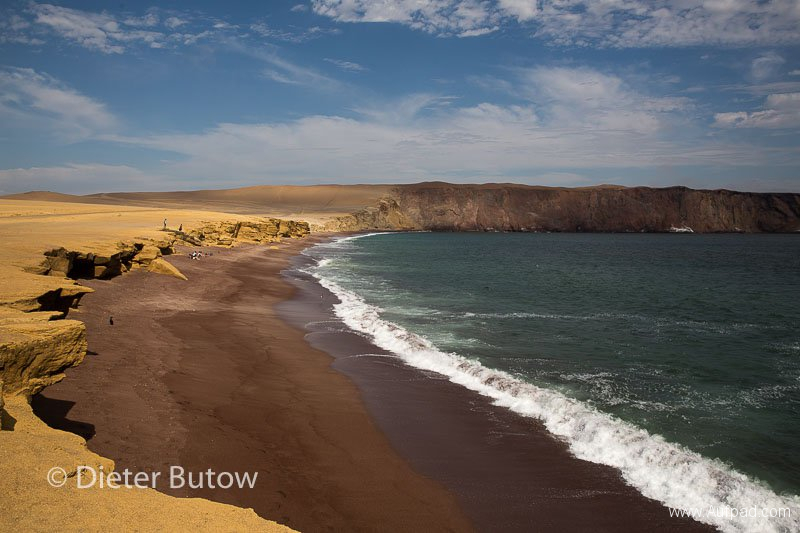 We turned off into the Reserva Naçional de Paracas, then visited the small natural history museum past the entrance gate before exploring the coastal desert park itself. After some calamari at La Tia Pili in Lagunillas (a fishing village in the park) we camped near Playa de la Mina on the parking area – all new toilets had been built at various places in the park, but the water was not yet connected. 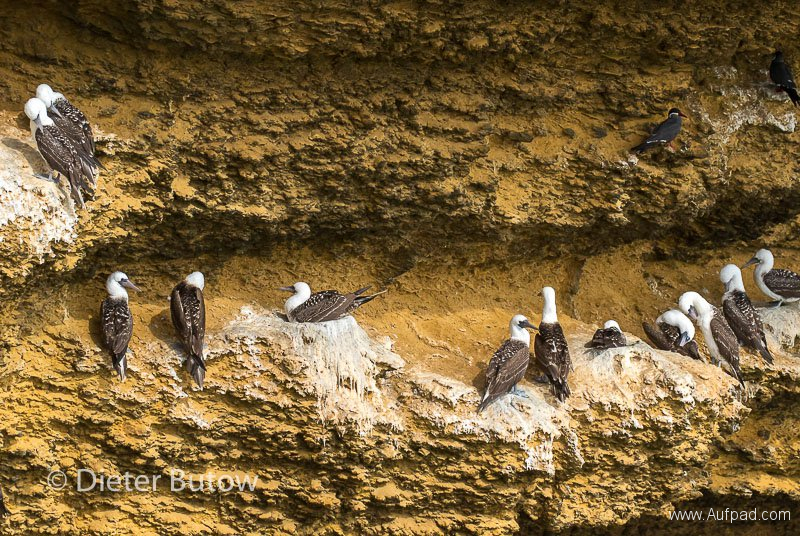 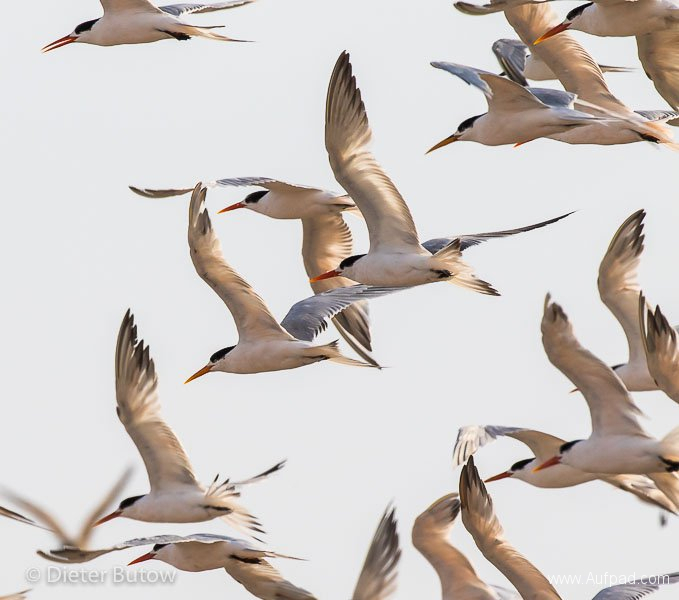 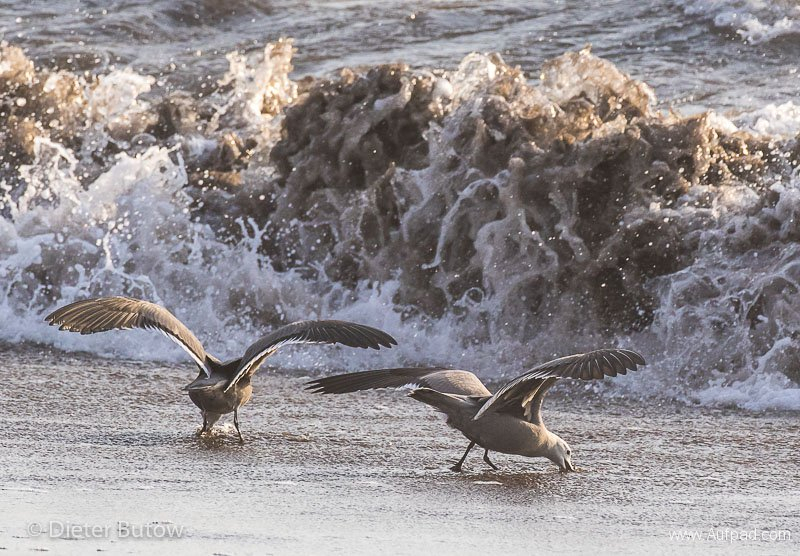 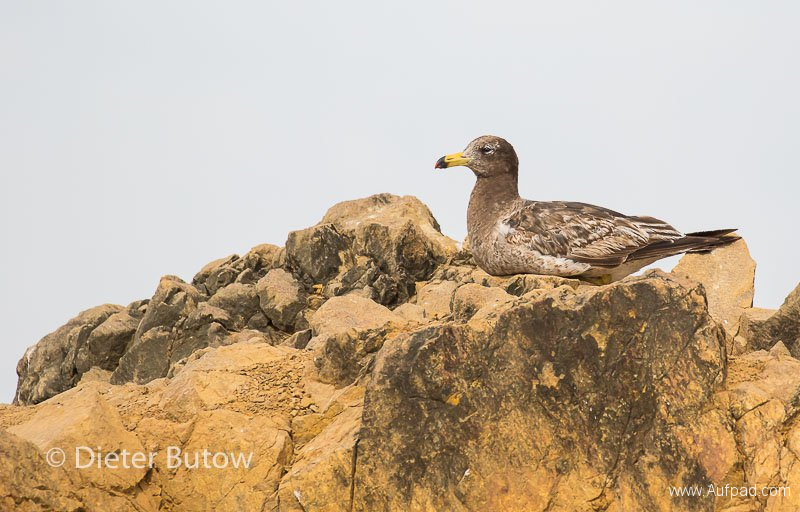 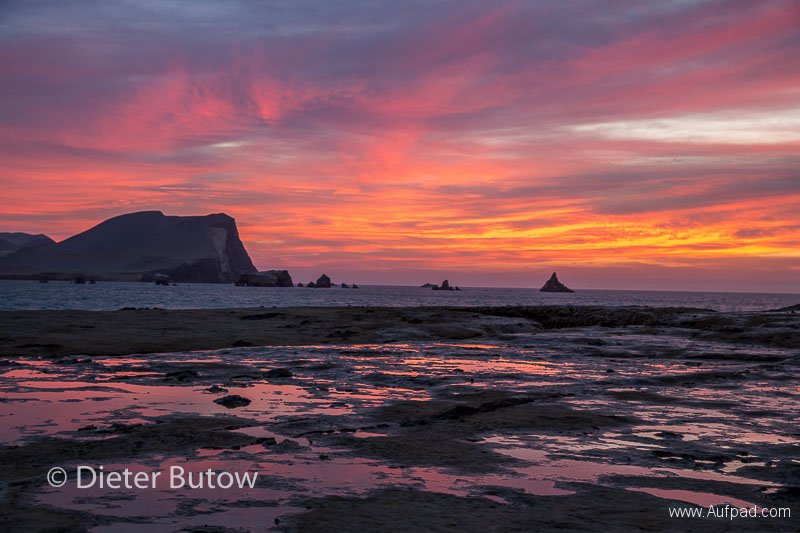 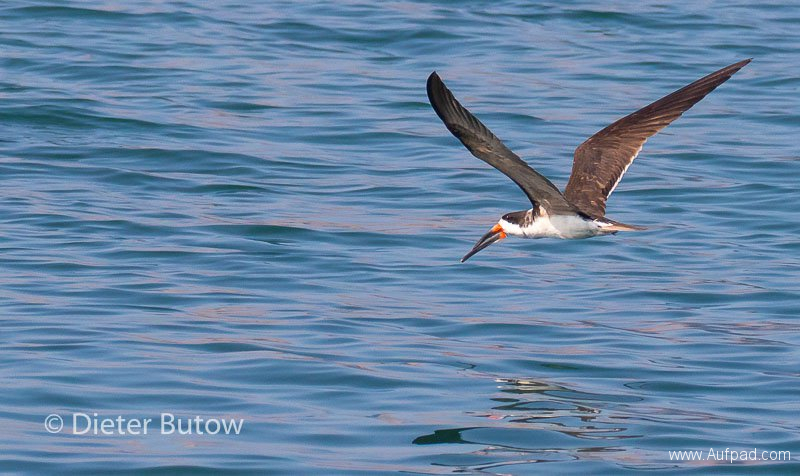 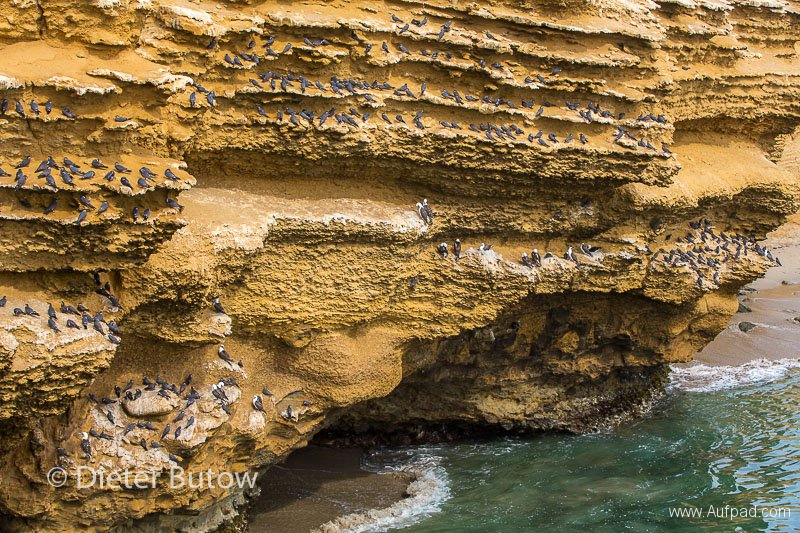 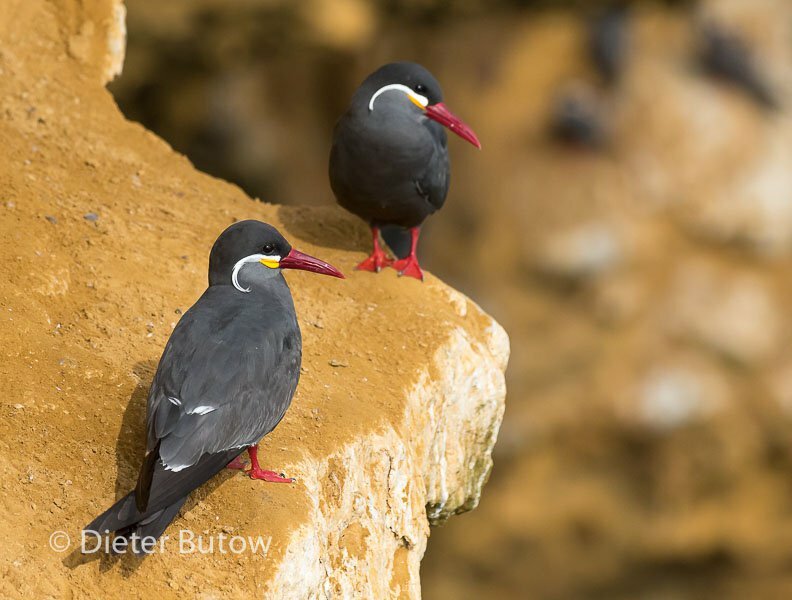 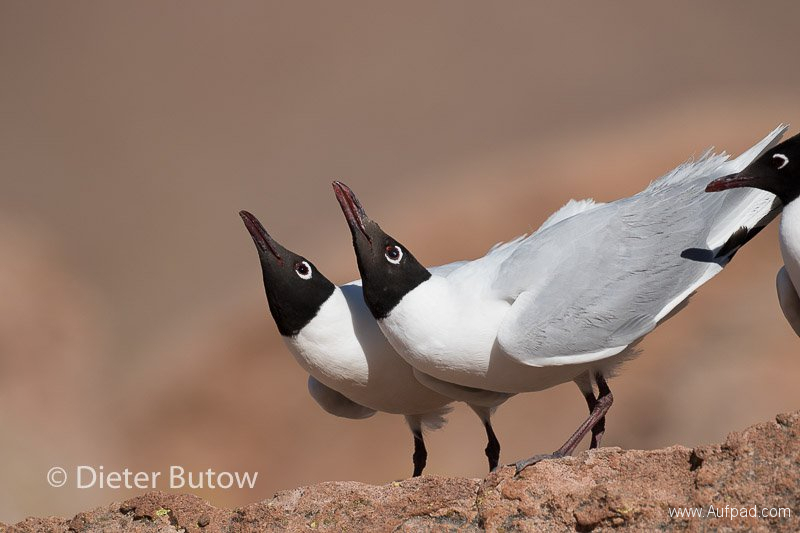 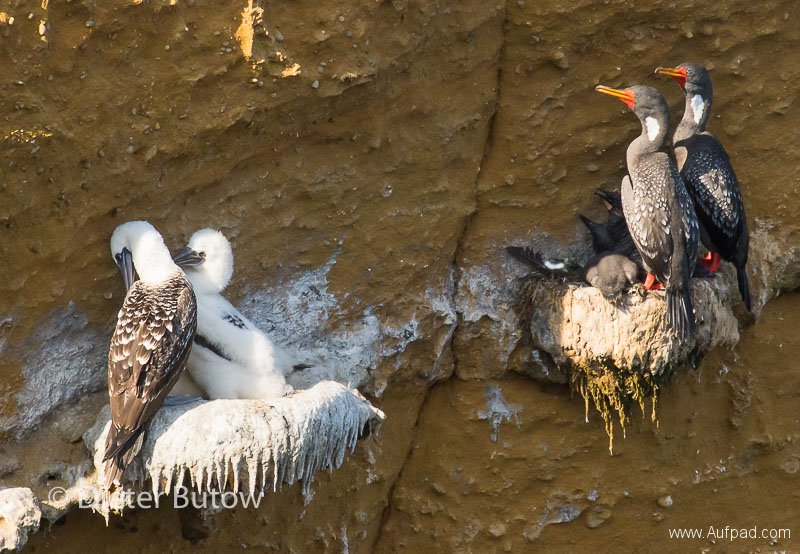 We spent a cold and quiet night with many Inca terns and Peruvian Boobies breeding in the sand cliffs nearby. 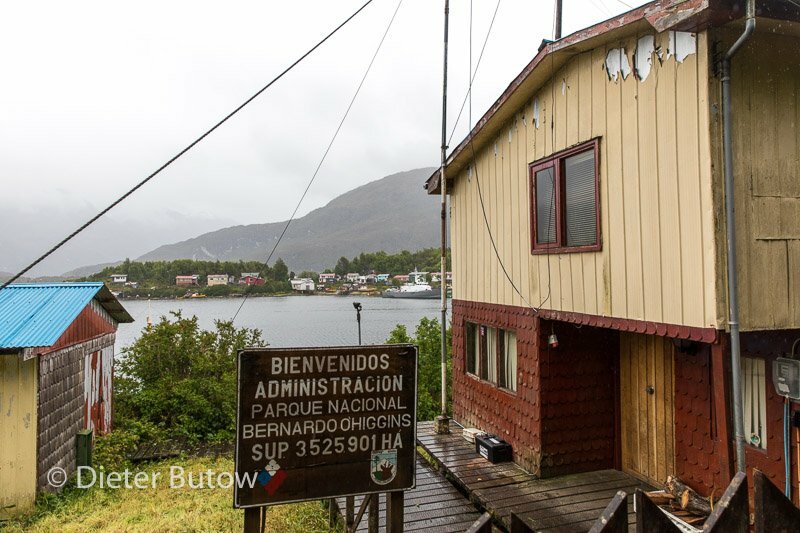 Next day we toured through the park, realised that entry to the harbour Puerto General San Martini is no longer possible (mining export? 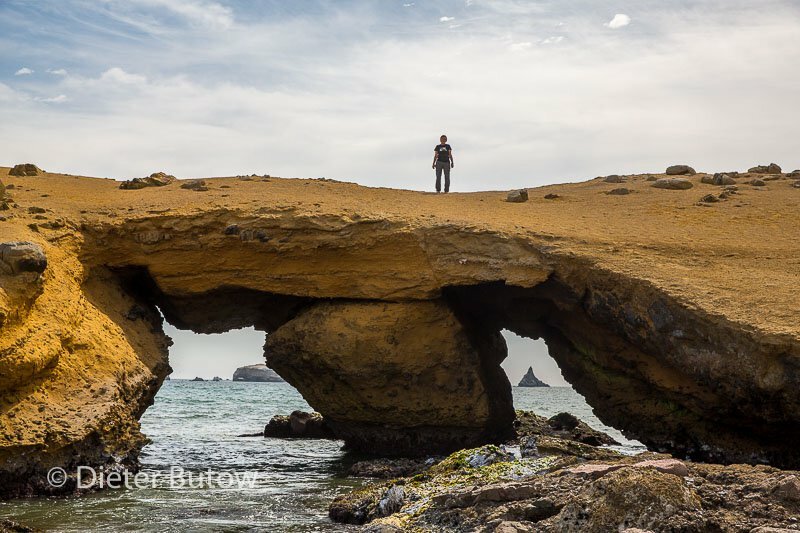 ), then enjoyed the beautiful dark red beach at Playa Roja, drove past “La Catedral” a natural formation near Playa Yumague. We camped at Mendieta Playa meeting Christian and Sarah from Austria who were enjoying kayaking around the formations. 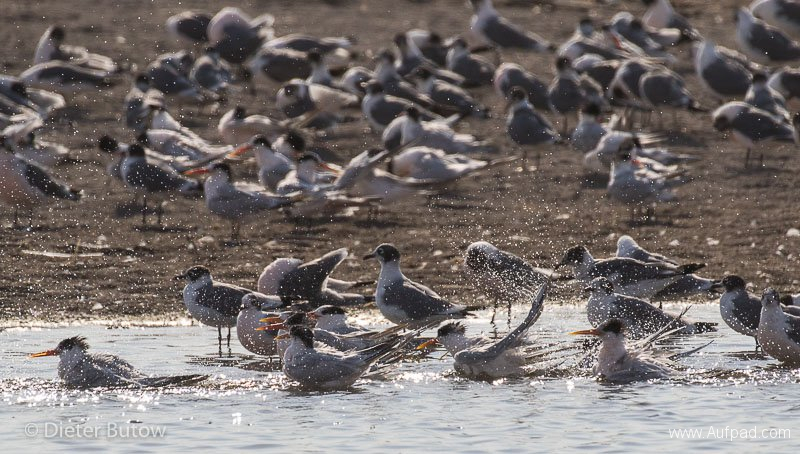 The fishermen left at sunset and we had this wonderful spot to ourselves and it was a good time to observe Royal Terns and both, the American as well as the Blackish Oystercatchers. Early morning we walked up the cliffs and had a wonderful view of the rock formations and observed breeding Peruvian Boobies, Red-legged Cormorants, Black skimmers and red-headed Turkey Vultures. 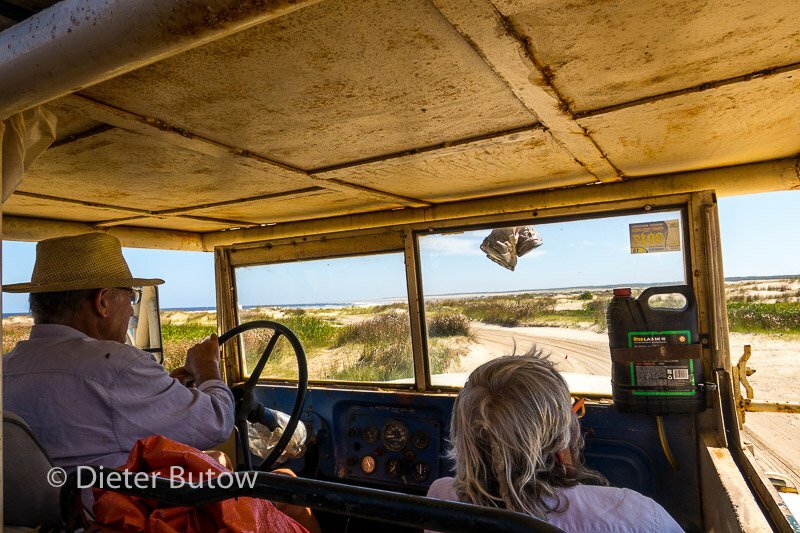 Mid morning we decided to proceed down to Laguna Grande, a fisher settlement and then took a path through the dunes eastwards back to the PanAm. The area was desolated and incredibly barren but scenic. 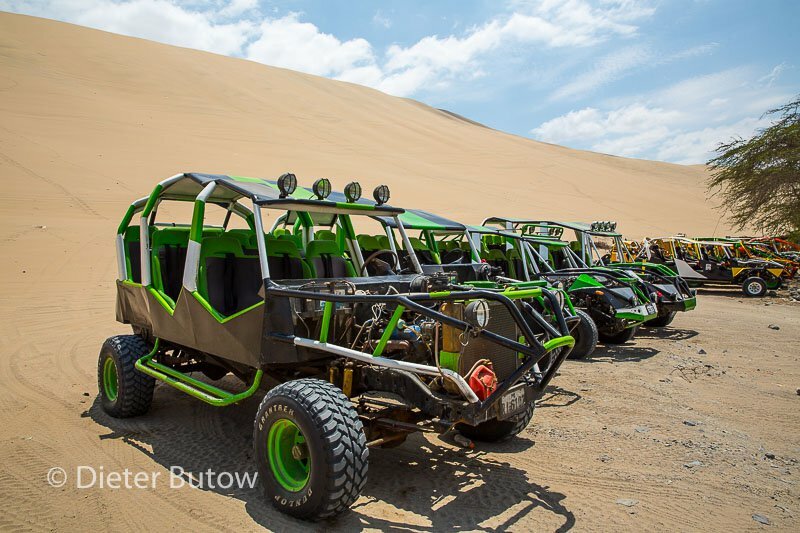 Past Guadalupe we reached Ica where we turned off to Laguna de Huacachina with plenty dune buggies racing on very high dunes – adrenalin galore for the visitors. 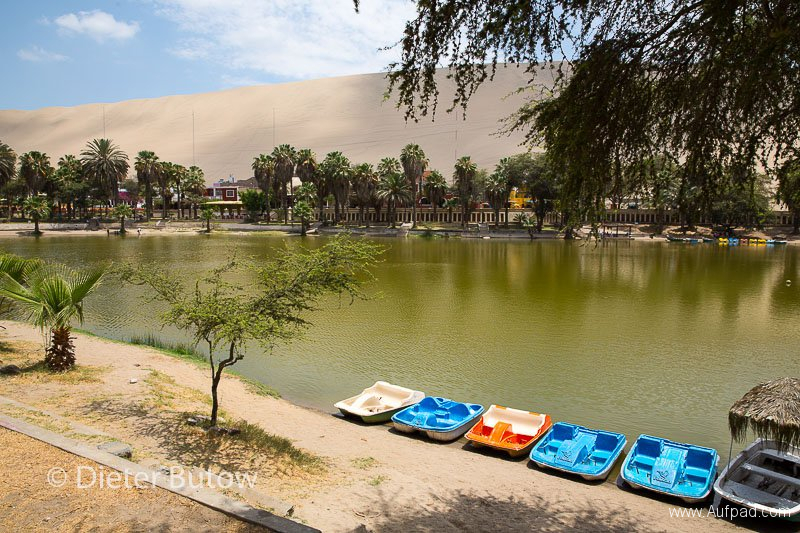 The laguna itself looked rather dull and polluted. 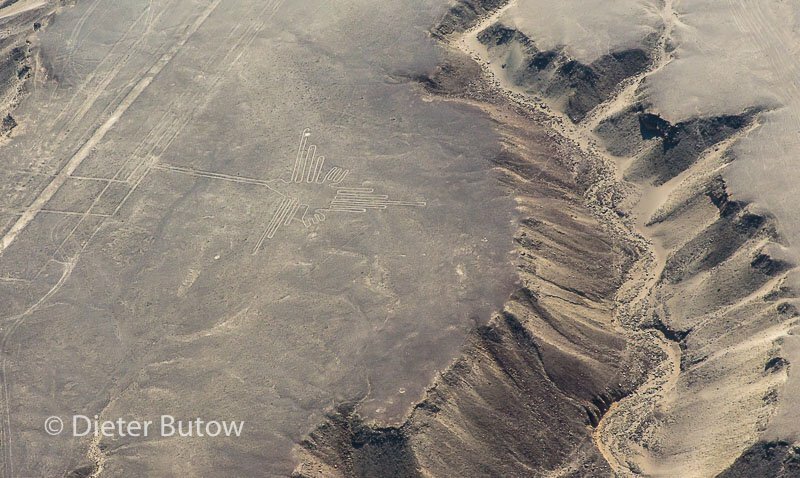 As we drove further south on the PanAm Sur we passed the viewing tower which we ascended to have a view of the three Nasca line formations that can be seen, albeit not very well. They were supposed to be the hands, the lizard and the tree. 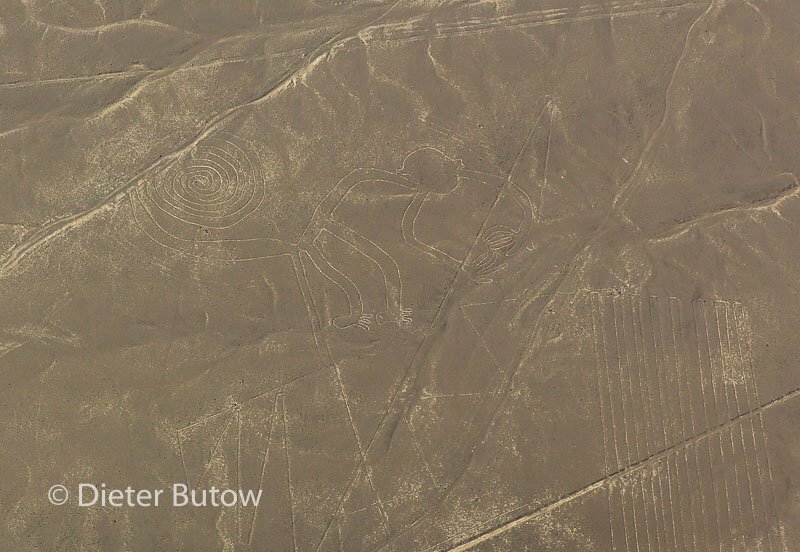 We could really only make out the hands(but had a good view from the air next day). 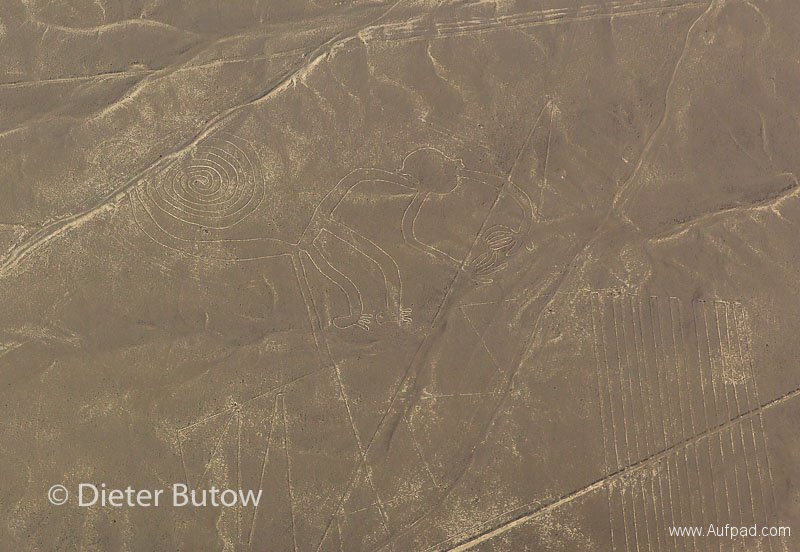 Reaching Nasca we made a flight reservation for early morning and then put up our camp at Hotel San Marcelo, negotiated the use of a bathroom and enjoyed their pool. Next morning we left early to the Nasca airport and took the flight across many of the Nasca formations.The arid area is colourful from the air, Nazca itself not the most beautiful town. 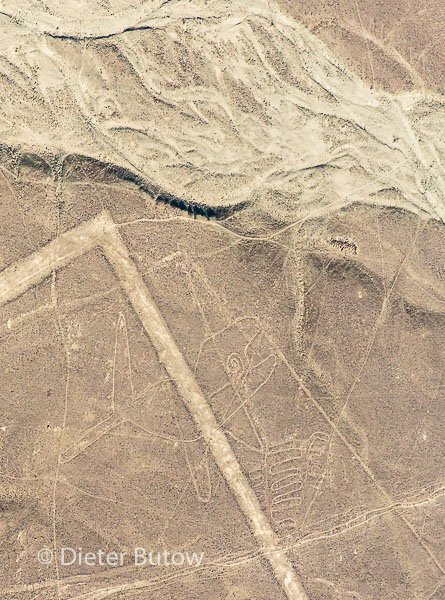 The first geoglyph we identified was the whale. 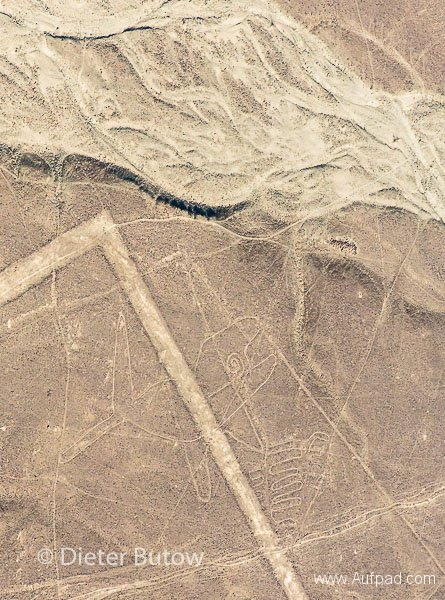 Besides the many geometric figures and lines, which reminded us of landing strokes and signage for alien craft visiting ( although apparently used by the Nazca for rituals praying for rain) we could clearly make out the “Astronaut” figure cut into a hill side and the large monkey geoglyph. Other animal figures included the hummingbird, Condor and spider. 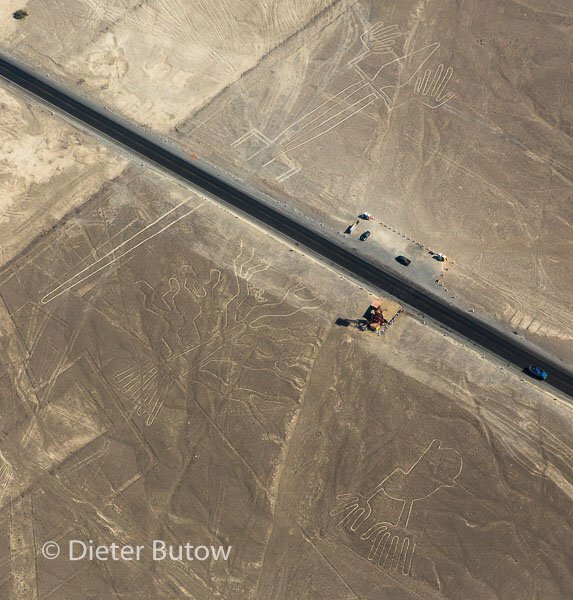 It was a rough flight but worth getting a proper overview on the extend of the many geoglyphs,lines and symbols drawn into the landscape at Nazca and we could not but wonder, how they were made without an aerial view at the time, as they are really only clearly recognisable from the air. 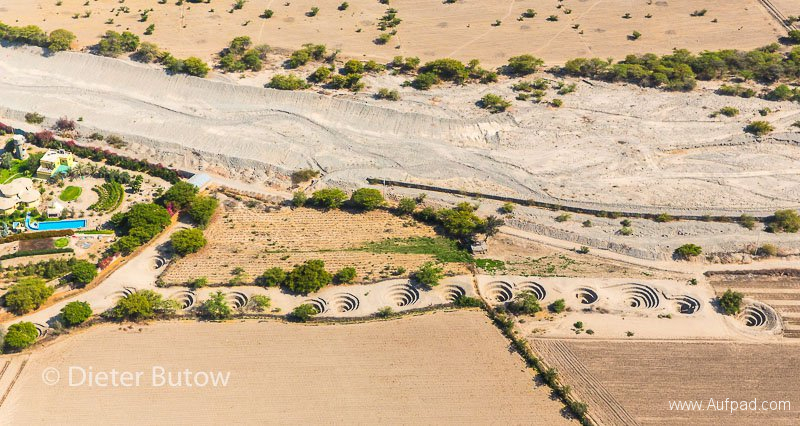 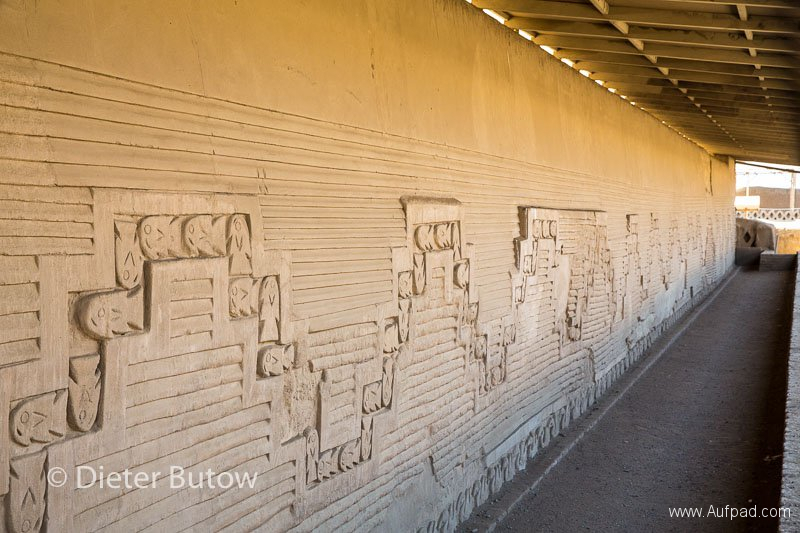 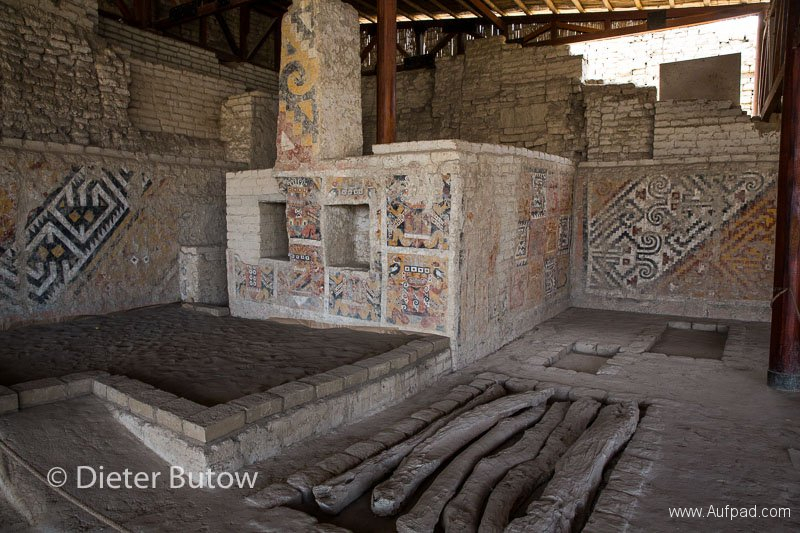 As we returned we had a glimpse of excavations dating back to the Nazca people and the entry points of the Cantalloc aquaducts built by the Nazca. 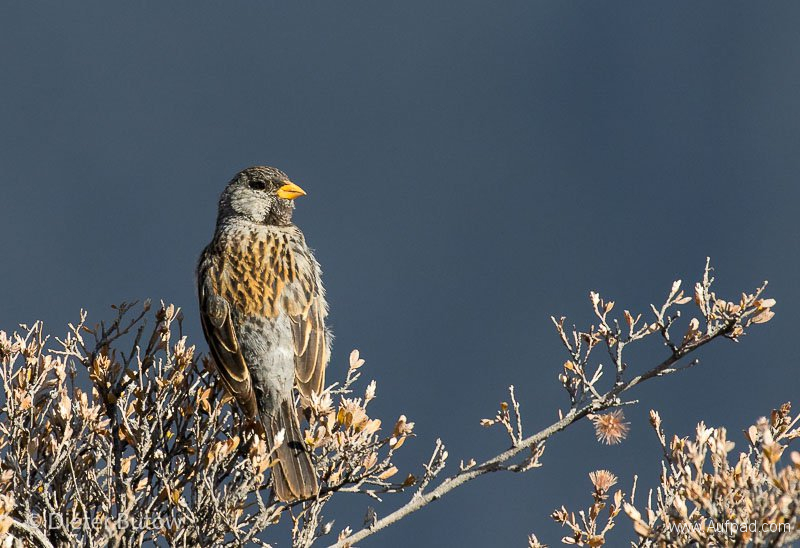 Note from the Editor: We have upgraded WordPress and suddenly all line breaks are omitted which makes the text difficult to read – we apologise for this inconvenience until we find a solution. . 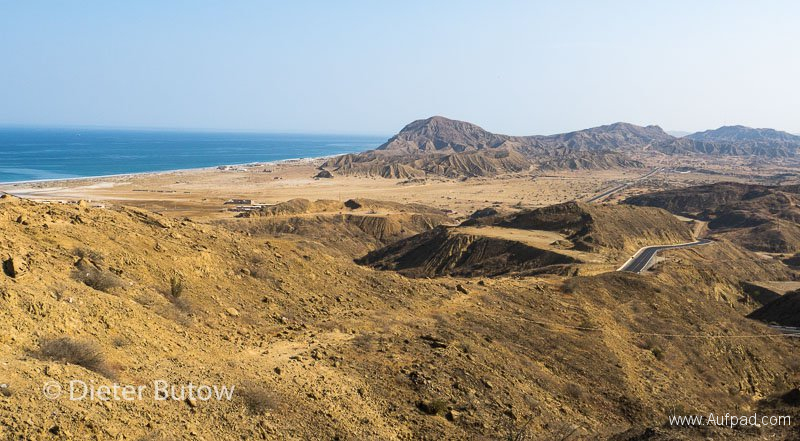 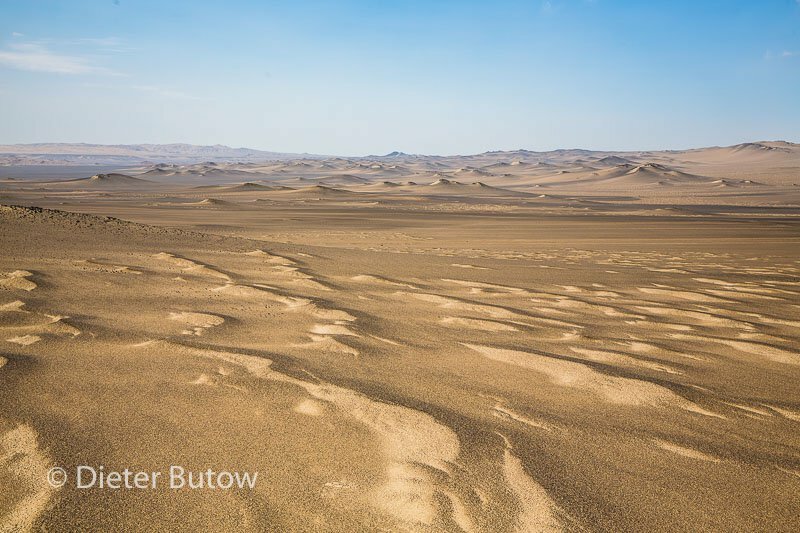 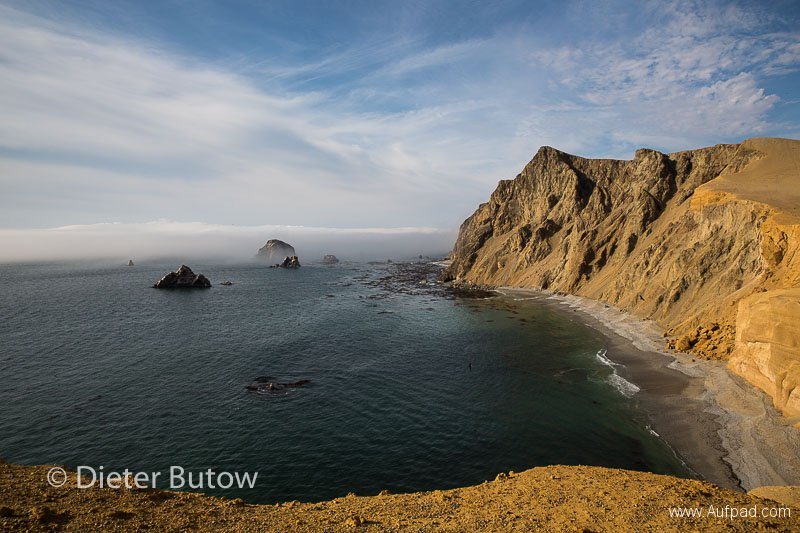 The northern coast of Peru is barren and mostly desert. 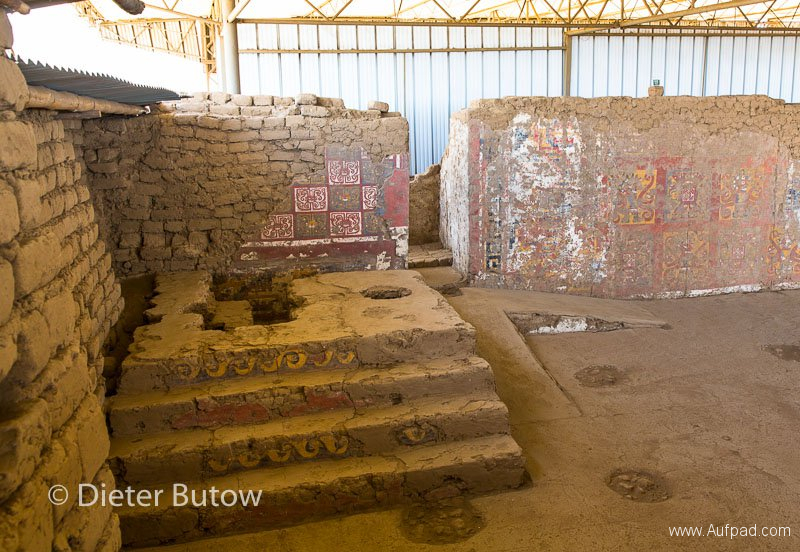 Nevertheless it offers much to see in the form of museums,pyramids, temples and adobe cities of past civilisations. 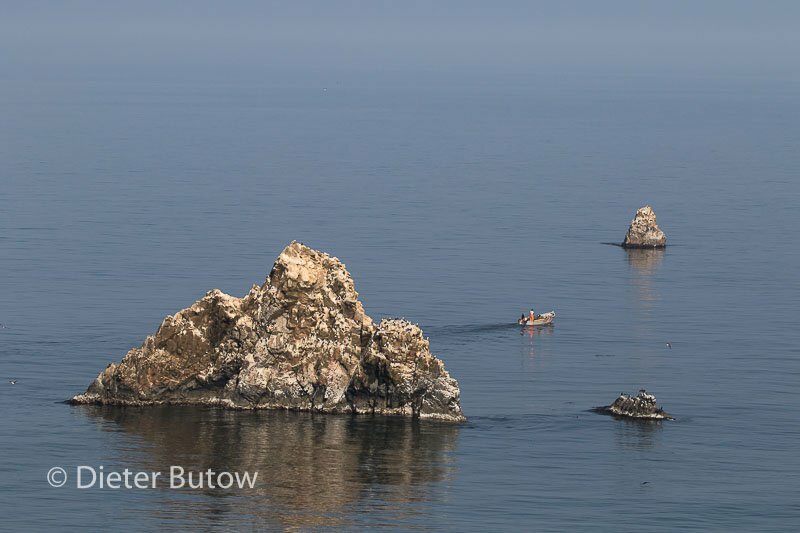 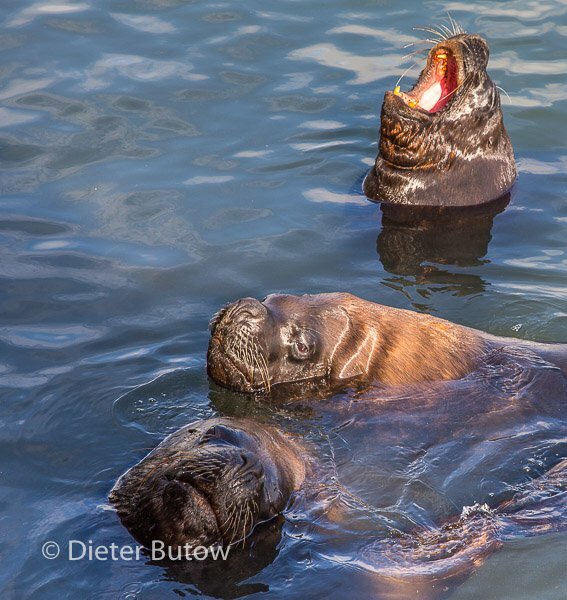 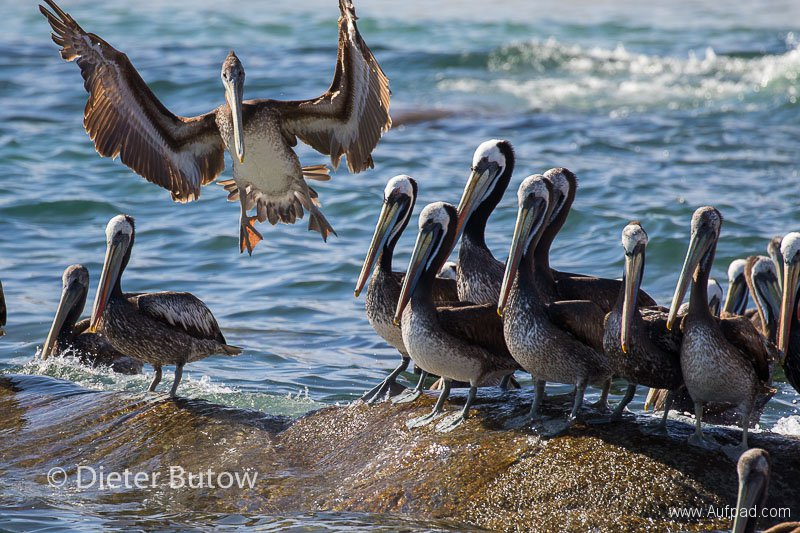 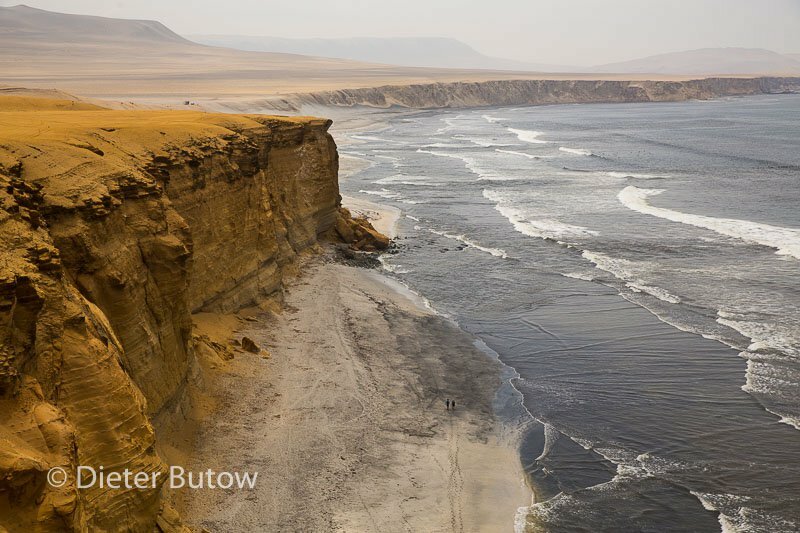 Die Nordküste Peru entlang des Pazifischen Oceans bietet viel Sehenswertes. 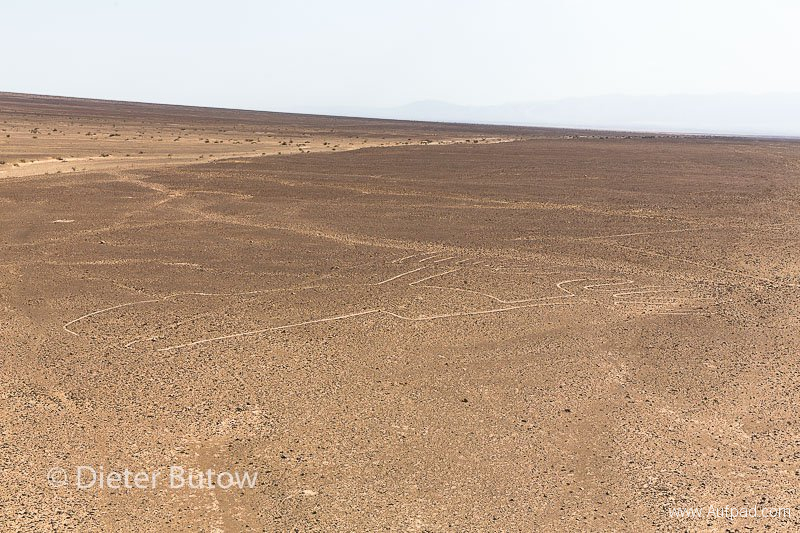 Überreste vergangener Zivilisationen zeugen von Besiedelungen weit vor den Inkas und Moche. We left our favourite camping site Swiss Wassi at Zorritos where I tried to solve my Apple-harddrive storage problem without much success but got my backup drive operational again. We drove through Mancora, did essential shopping in Sullana, then drove via Piura and the Desierto de Sechura, past Lambayeque and Chiclayo (in very strong winds-dust & sand everywhere) and decided to call it a day in Pacasmayo where we found camping at El Faro Adventure Resort -beautifully overlooking the ocean and known for its very good surfing and windsurfing conditions (one of the longest wind-surfable waves in the world). 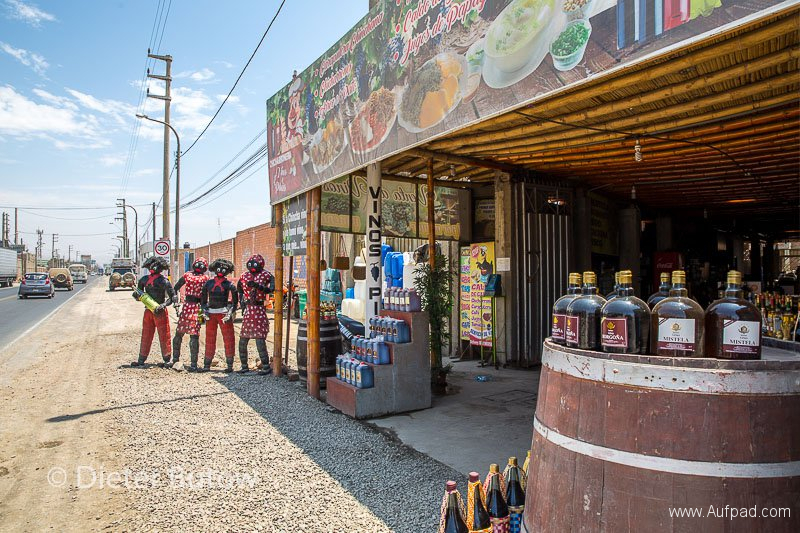 Jenny, the owner explains that it was started by her father and today her sons are also involved. For US$40 you could rent all windsurfer gear from Jaime, the instructor. 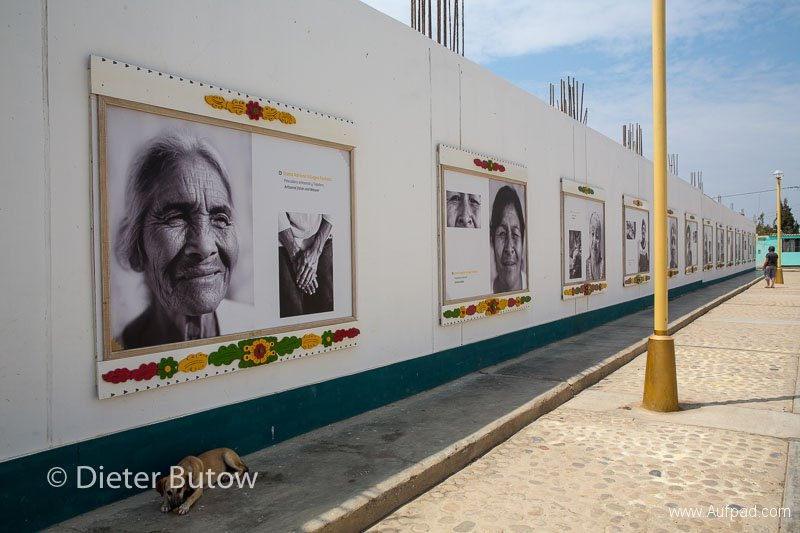 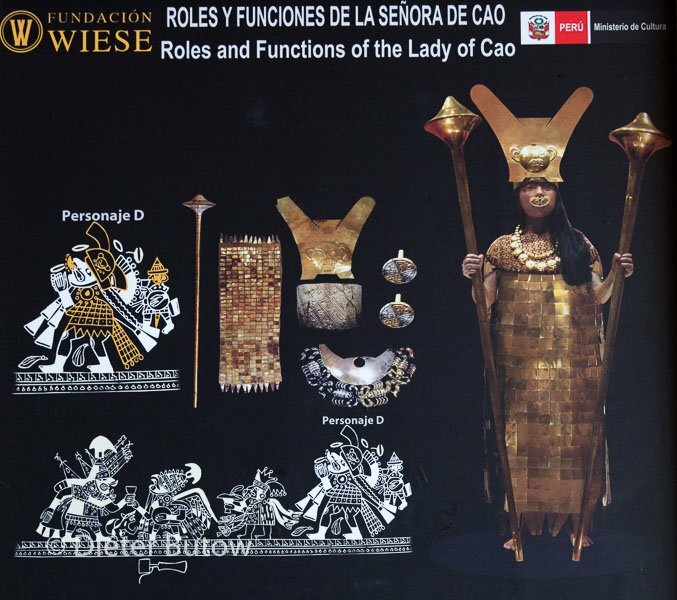 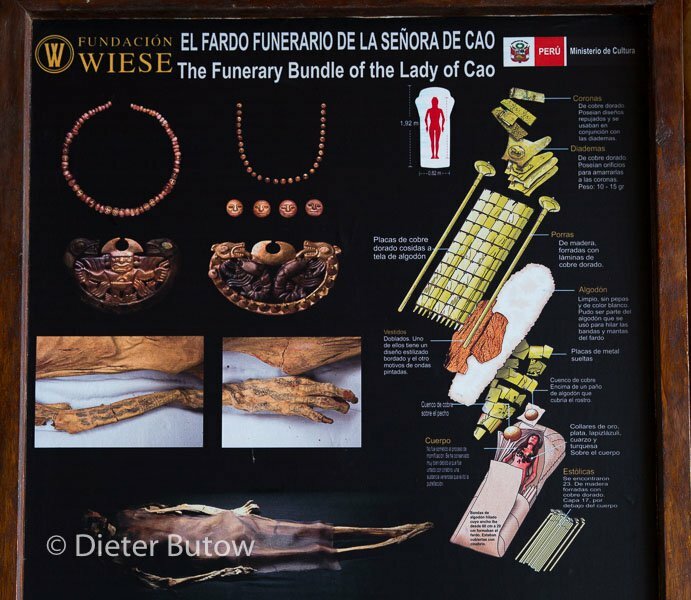 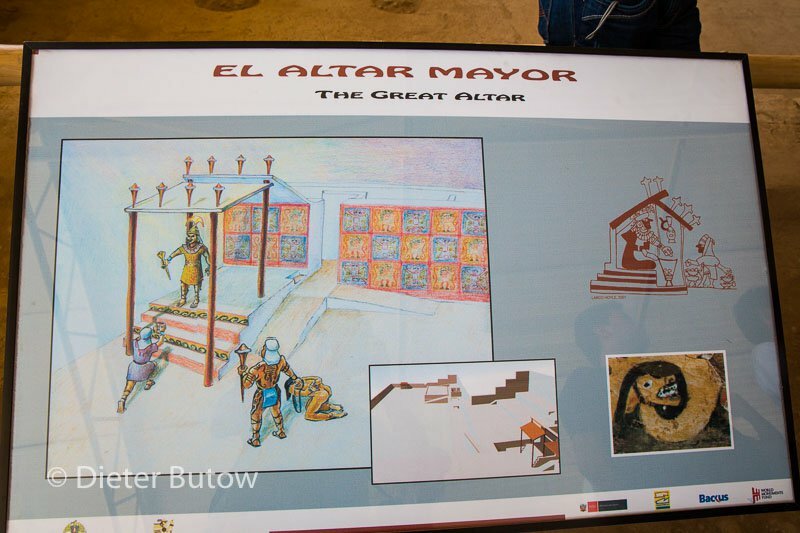 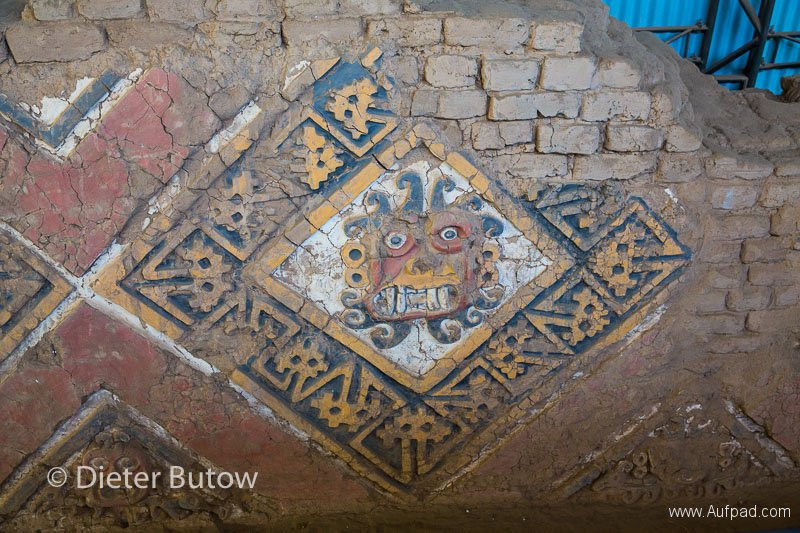 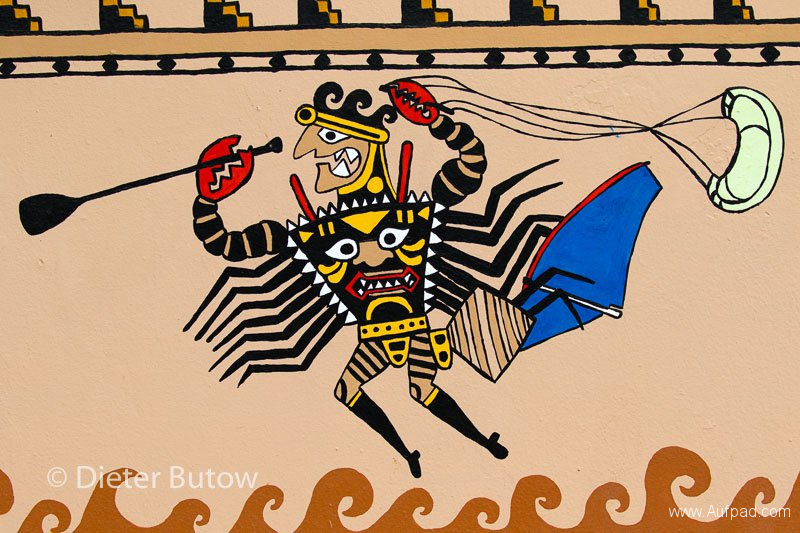 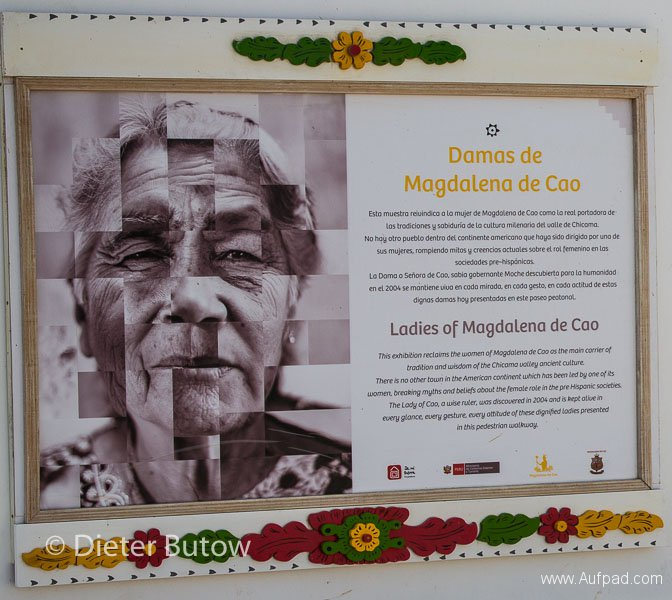 Next we made our way via the village of Magdalena de Cao, celebrated because of Señora de Cao – probably the only female queen of the Moche period and her grave was not plundered and the mummy intact. 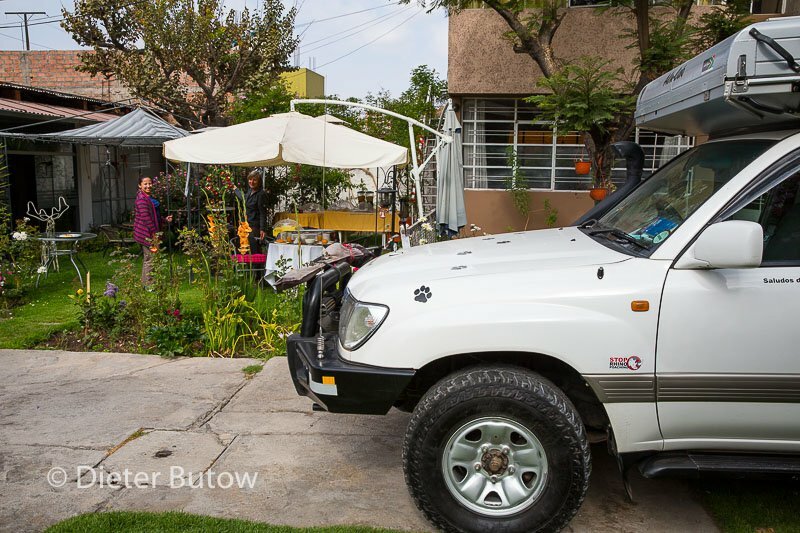 Meeting Willi & Gabi Cordes again -nicknamed the “bomberos”due to the fire red vehicle. 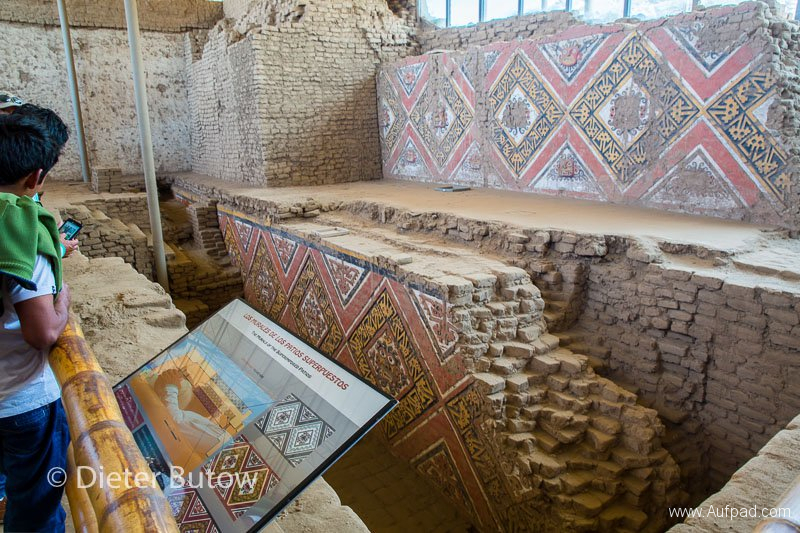 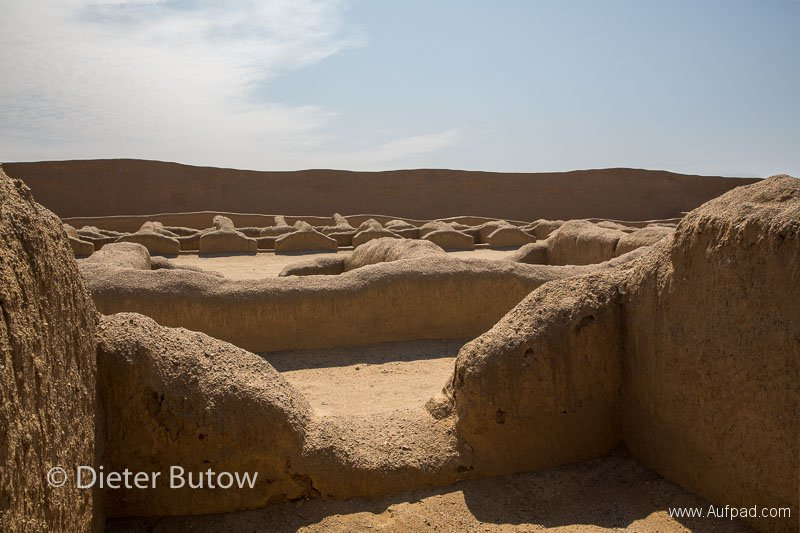 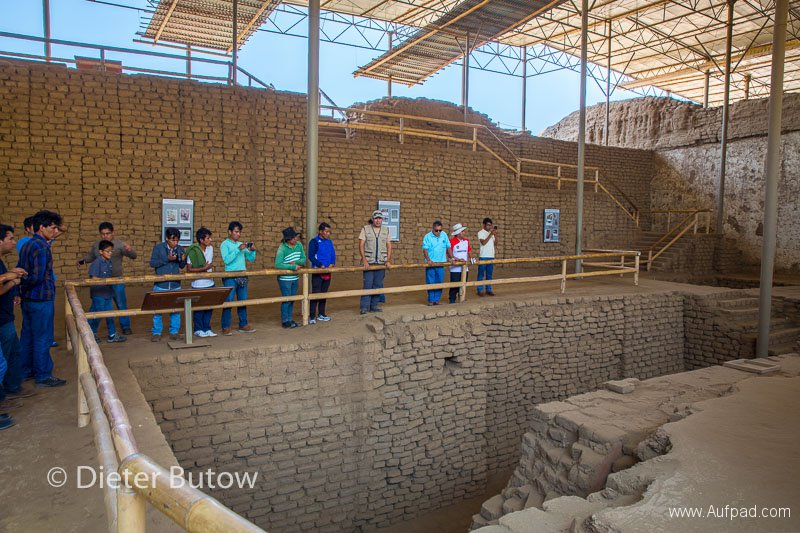 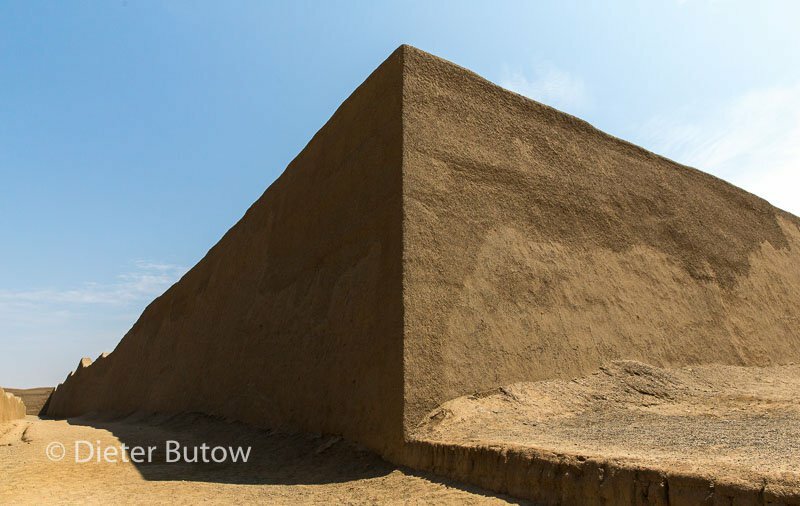 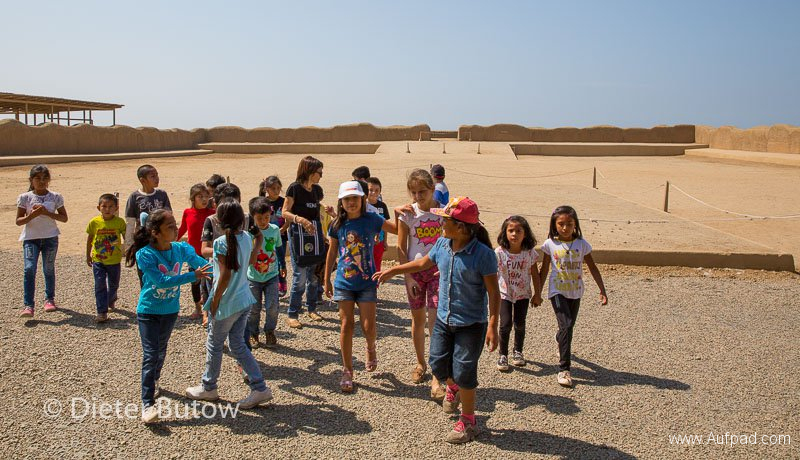 From here we explored Chan Chan – the biggest adobe city in the world where part of the mud walls are still preserved and it is possible to see the extend of this once flourishing city during the Chimú Kingdom period. 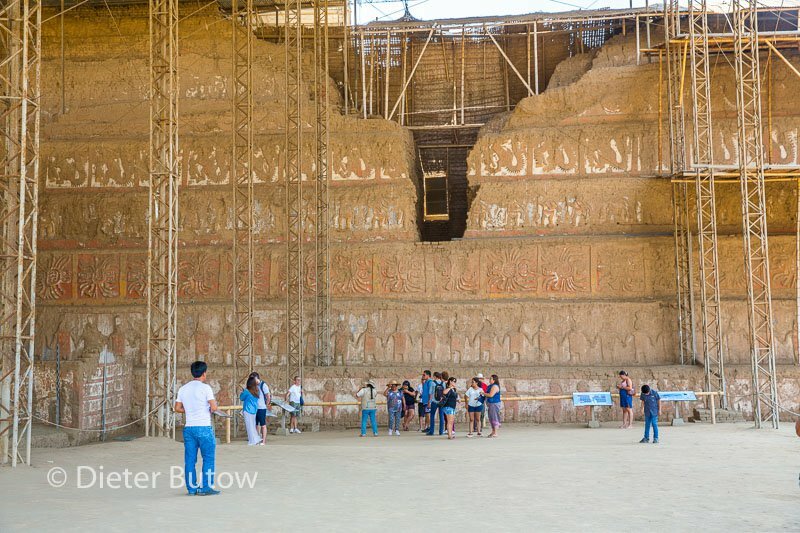 It is an Unesco Heritage site since 1986. This city was only captured by the Incas 1470 after they cut off the water supplies to the 100 000 inhabitants. South of Trujillo we visited the pyramids Huaca de Sol y Huaca de la Luna, the biggest adobe structures built in the Moche cultural period. 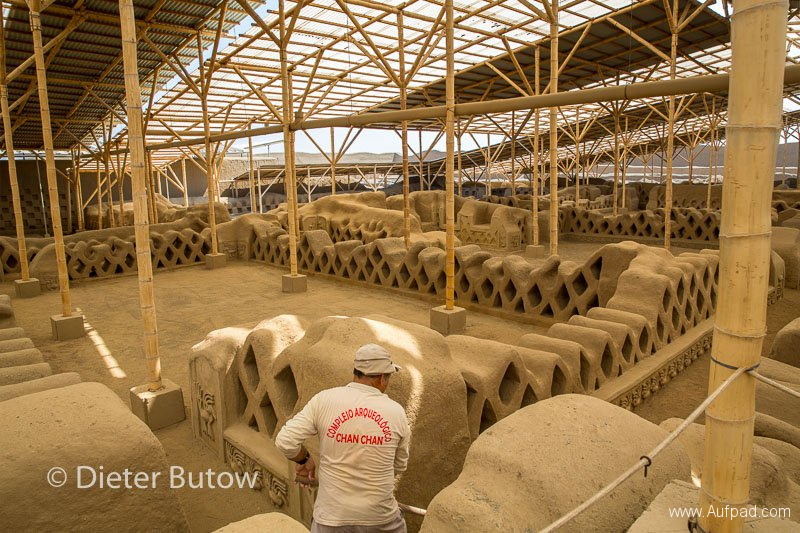 Approx 130 million adobe bricks were used, each with the signature of the provider in it. 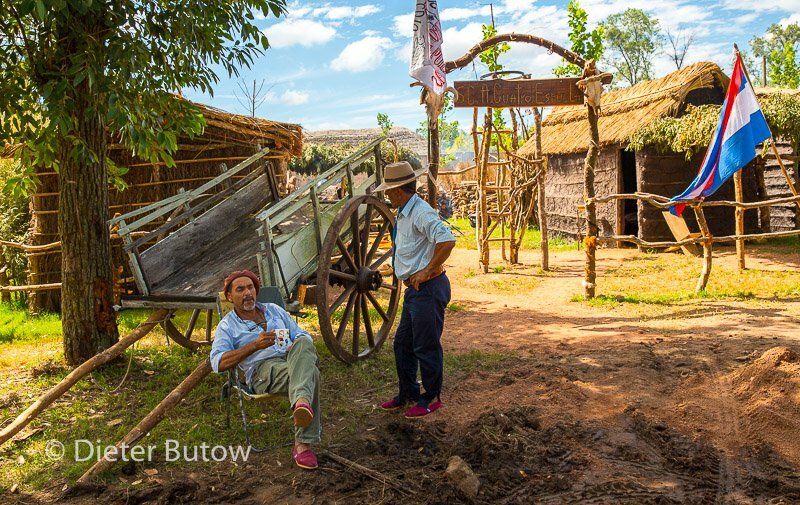 As with Chan Chan the years of very wet El Niño period wreaked havoc with the mud constructions, which are now under roof to a great extend while being excavated and partially restored. Research has revealed that these temples where used mainly for blood ceremonies where captured warriors blood was drunk by the high priests of the Moche. 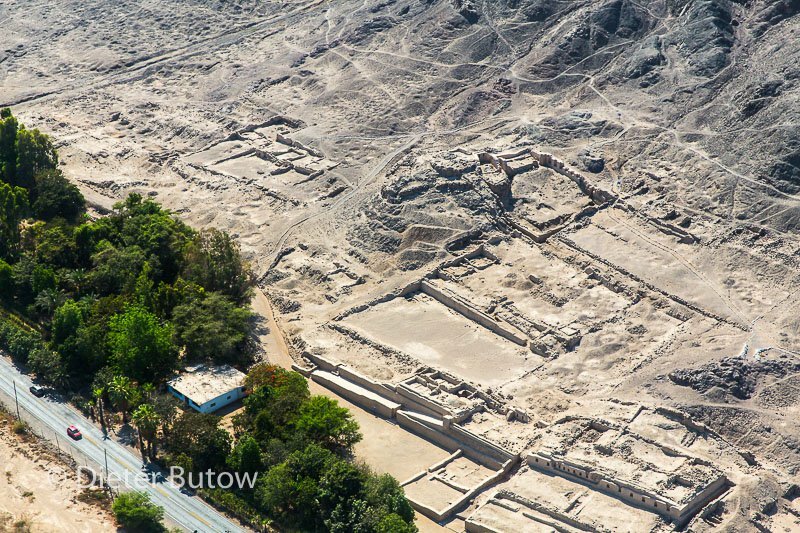 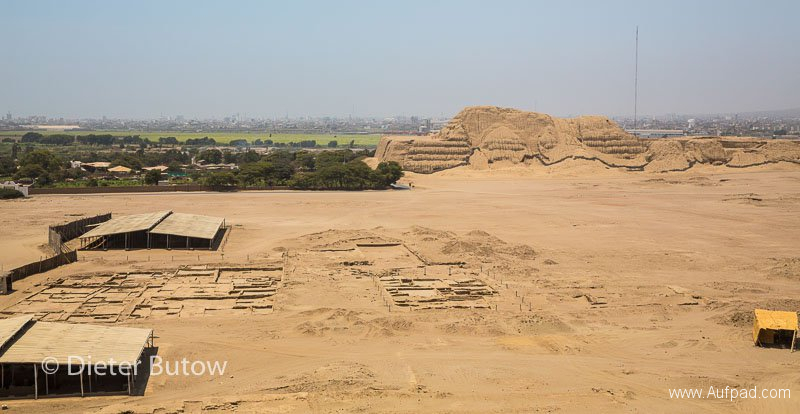 The ancient city in the area, Cerro Blanco, is named after the whitish vulcanic peak behind Huaca de la Luna. 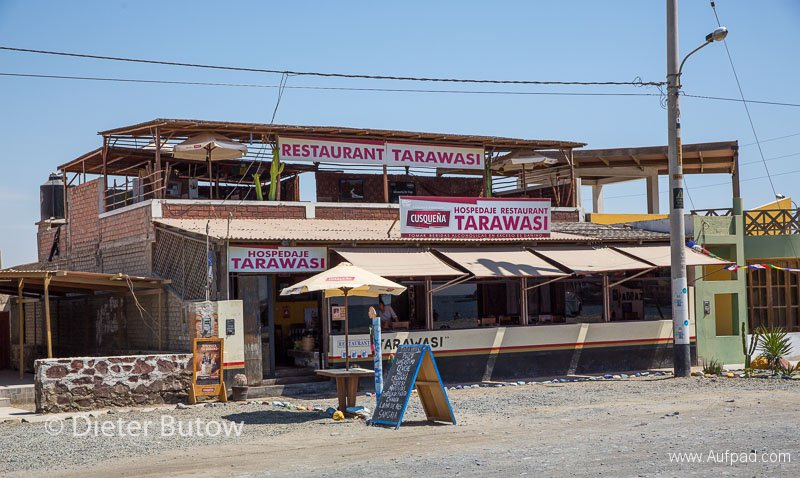 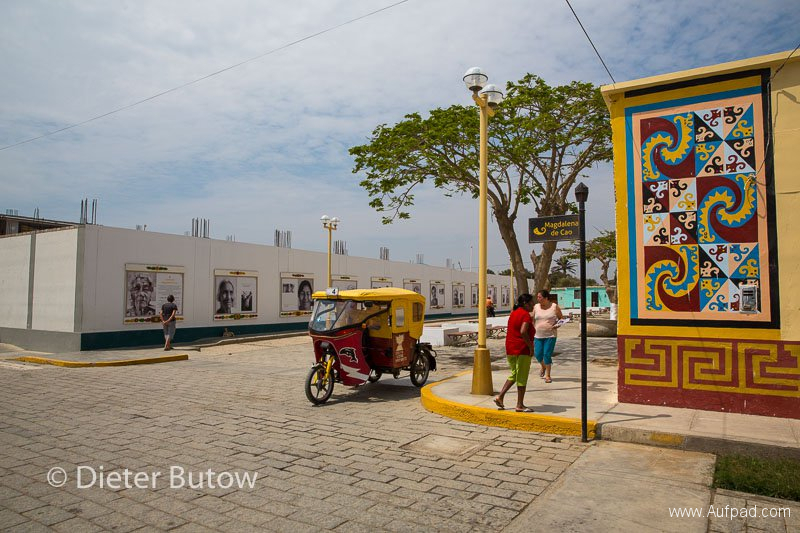 We carried on via Chimbote and to the coastal town of Tortugas, where we had a special lunch at Restaurant Tarawasi. Run by Julian, a Spaniard, and his Peruvian wife, they cooked up a tasty meal of seafoods. They have rooms to rent but unfortunately there is no camping, so we continued through Huarmey and stopped again on the coast,where we had previously camped at km228 before Barranca. The local fisherman welcomed us once more to his beach area. 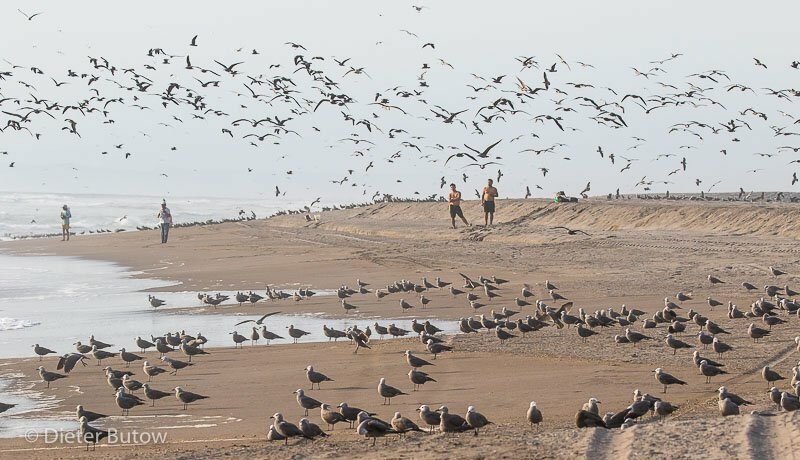 Scenic but a lot of litter spoils the setting – a manifestation of the world-wide problem of pollution of the oceans and with that the remote coastal areas. 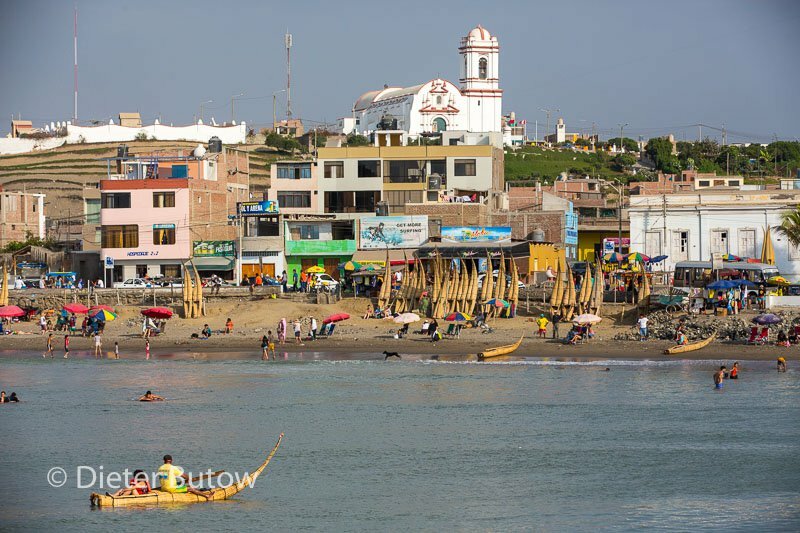 At 7am the fishermen launched their boats and we decided to push on to Lima – along the PanAm running along the dunes dropping straight down into the ocean. 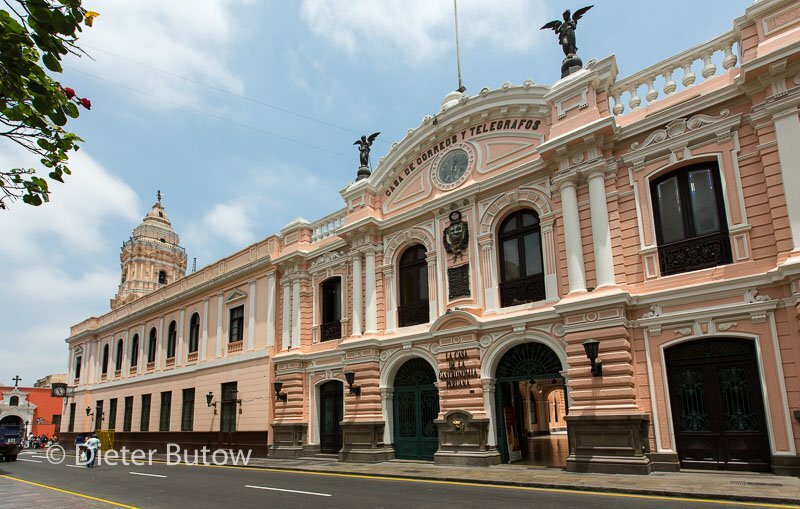 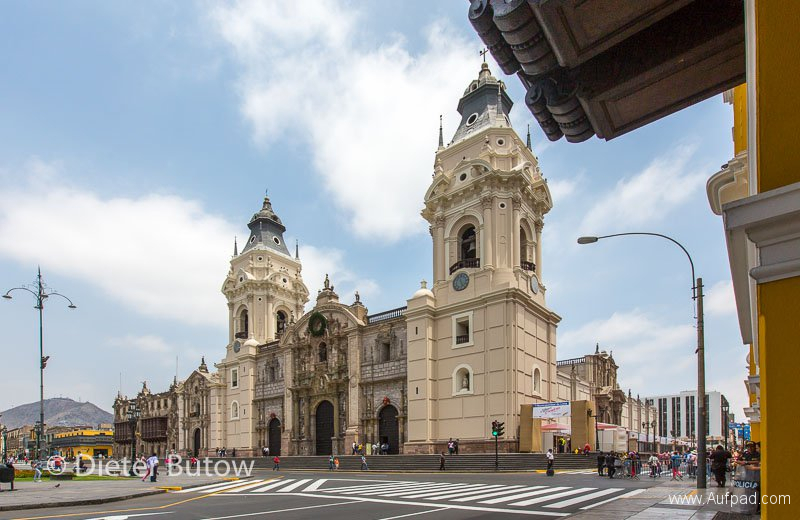 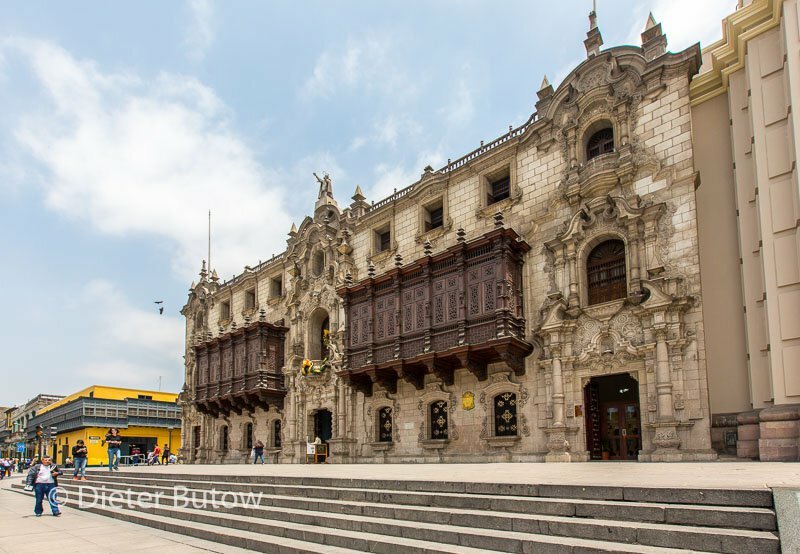 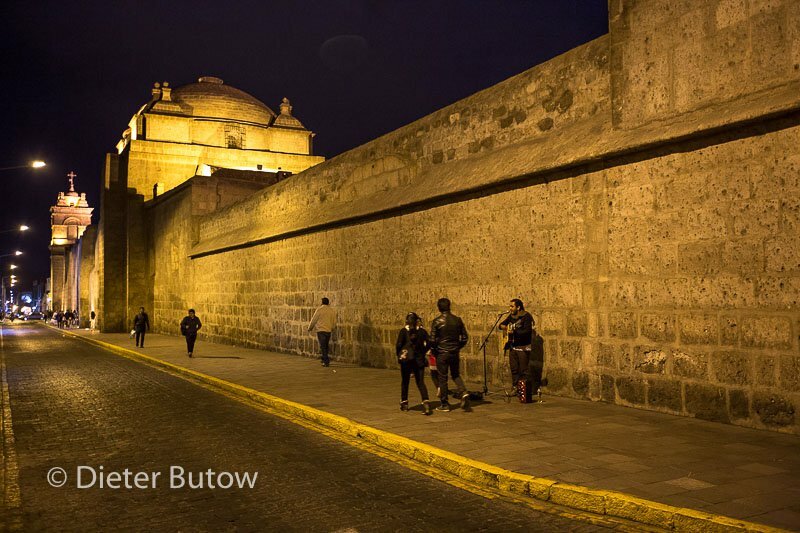 We were not looking forward to visit the 30mill inhabitants of Lima, but our entry into the city was smooth and with luck we found Llantas Heintz without too much of a problem – here we hoped to find the same Coopers tires to replace the burst one. 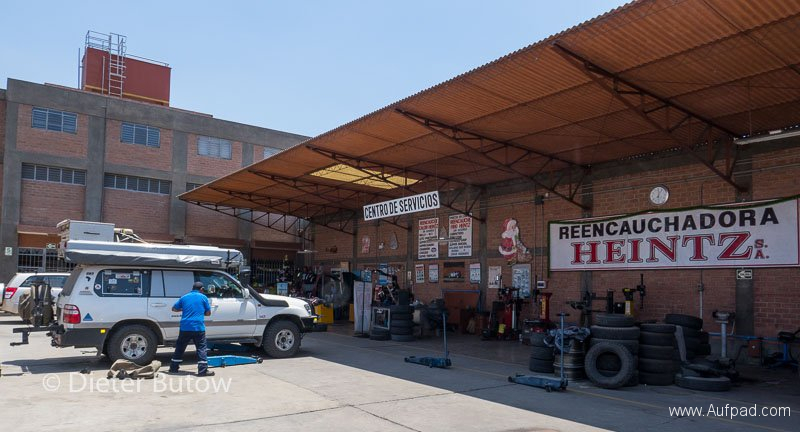 We were not disappointed: an absolutely professionally run operation, third generation Japanese owned operation and within 2 hours we left with 2 new Coopers tires, wheels balanced and rotated. 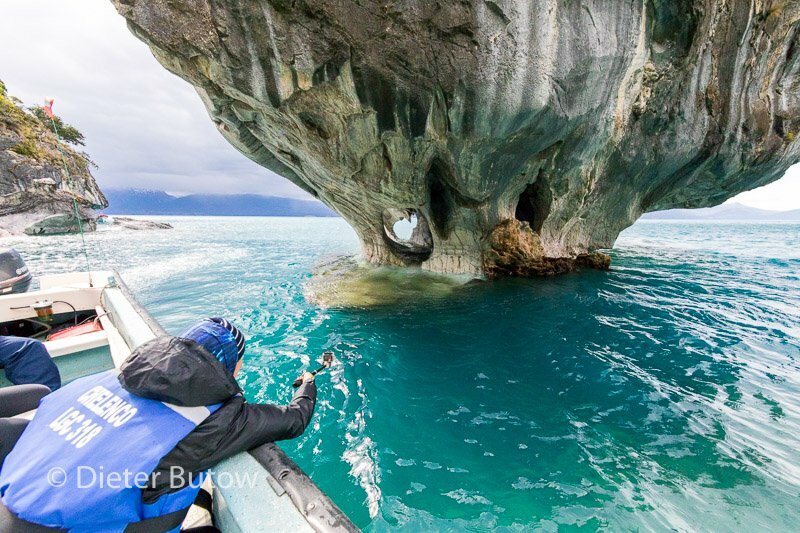 If ever you have a need for new rubbers -try them. 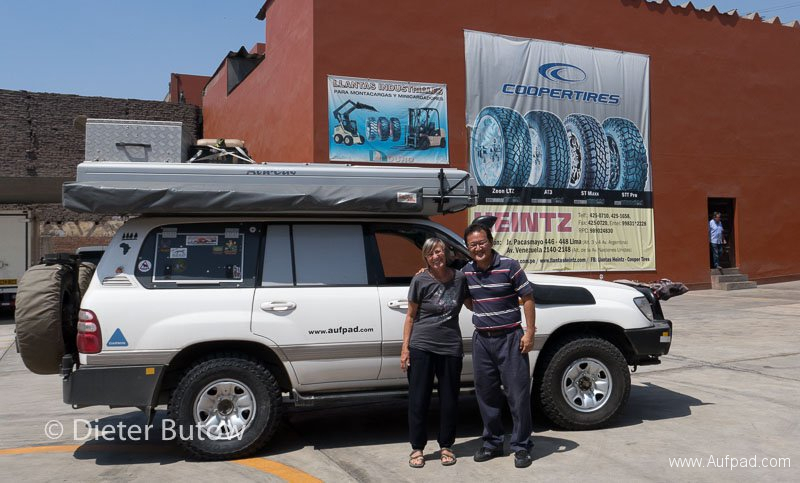 After successfully getting new wheels we proceeded to the suburb of Miraflores where we camped in the parking space of the Hitchhikers and Backpackers Hostal . 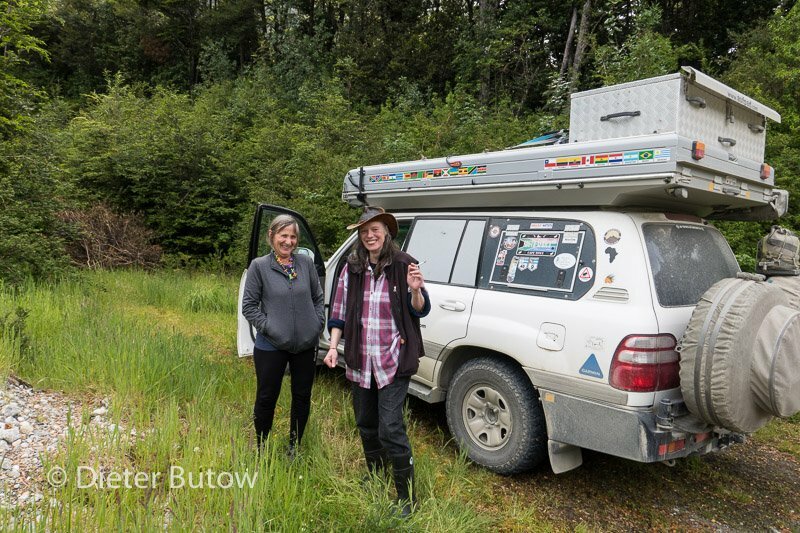 We parked and slept in our vehicle – only annoying part was that each person entering has to ring the bell -which goes virtually right through the night and is next to the vehicles – we had quieter nights on our trip. 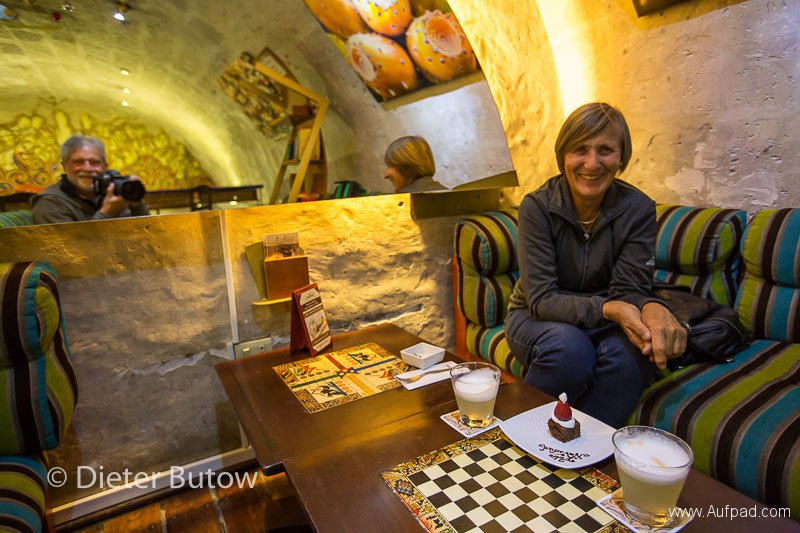 Bonus: very close by was an excellent Sushi place (Edo Sushi) and we really enjoyed having something different to eat after 8 months on the road. 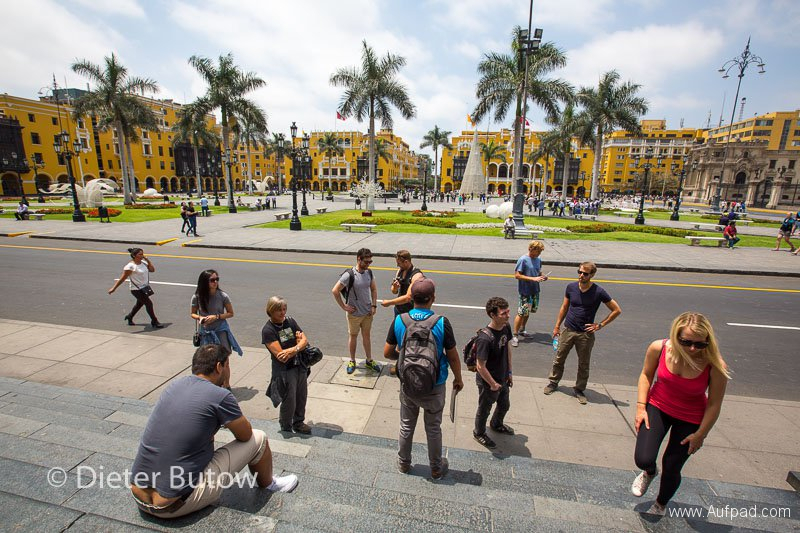 On the following day we decided to do a walking tour with one of the walking tours organisations starting at Kennedy Plaza, Free Walking Tours – it is a service which is tip based and you decide how much it was worth to you. 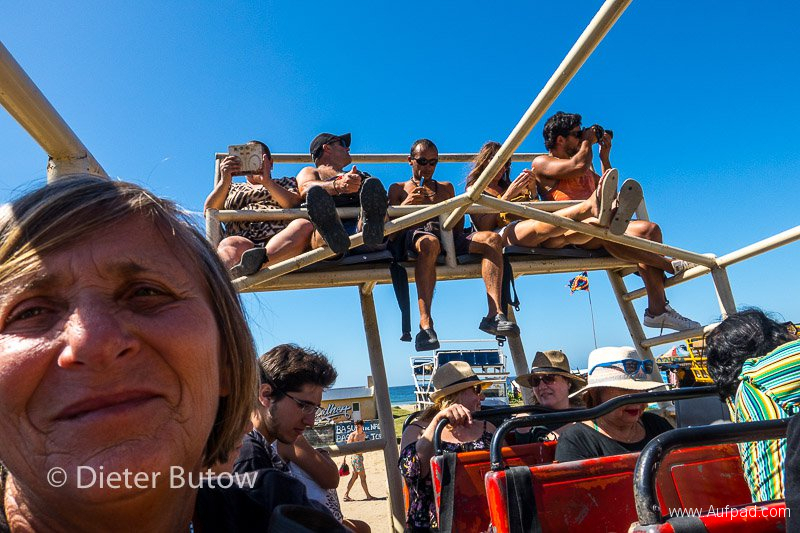 The walkabout was most interesting, well organised and professional -worth doing. We visited the central Plaza where the presidents palace is, did some Pisco tastings and sampled different chocolates. 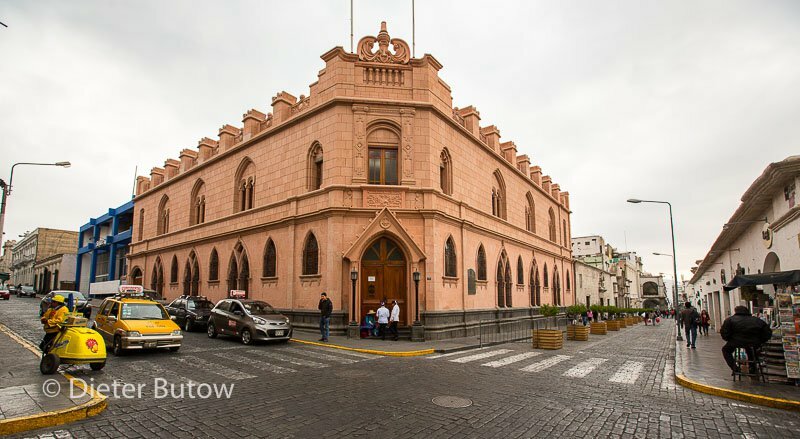 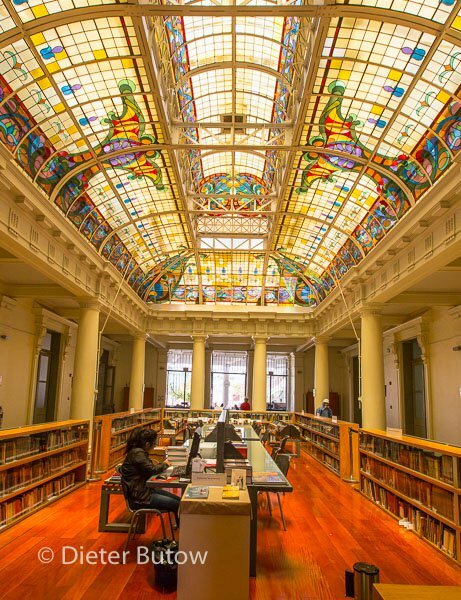 We visited the Mario Vargas library, the old post office and railway station as well as churches in the area. 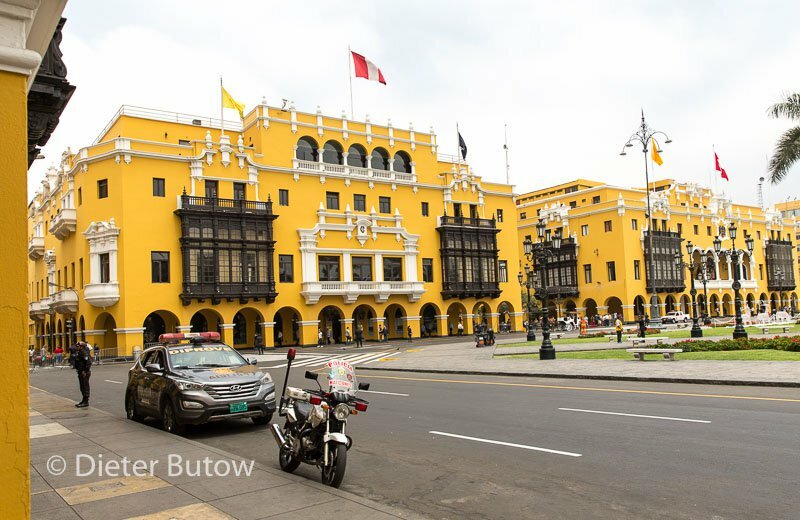 Before we departed, we visited the 3-storey computer centre close to Kennedy Plaza and finally got some advice of how to fix my Apple-external harddrive problem. 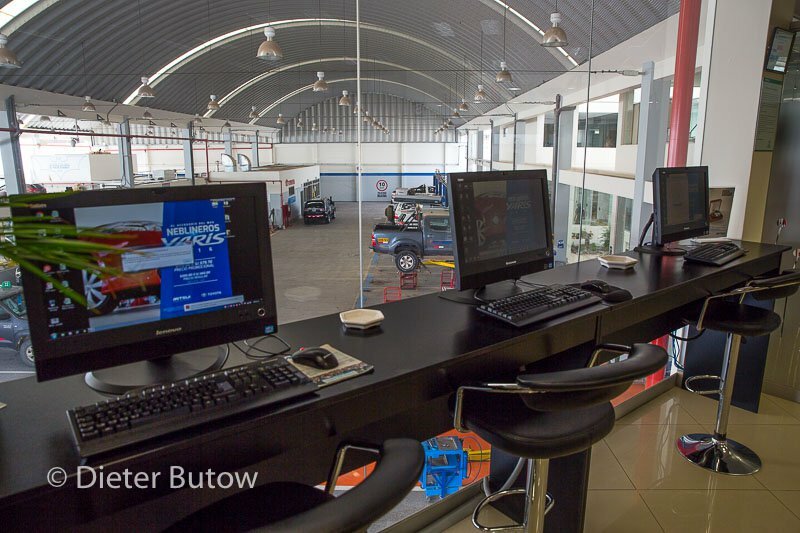 About 100 shops offer all you need in computer and communications at this centre. 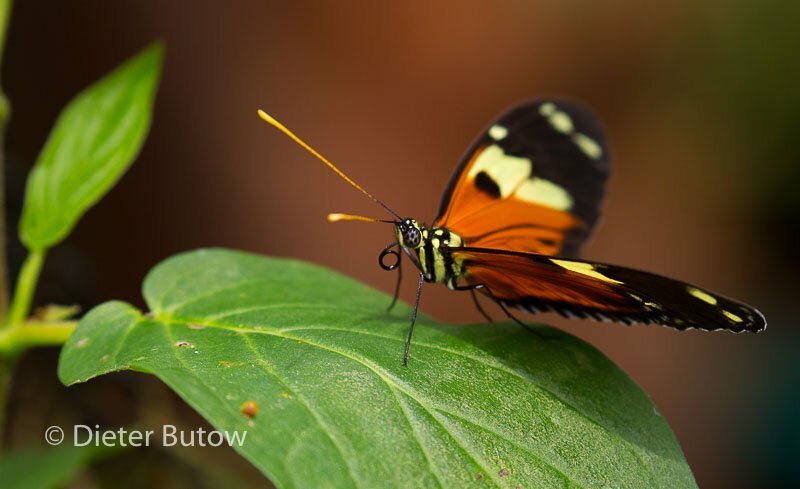 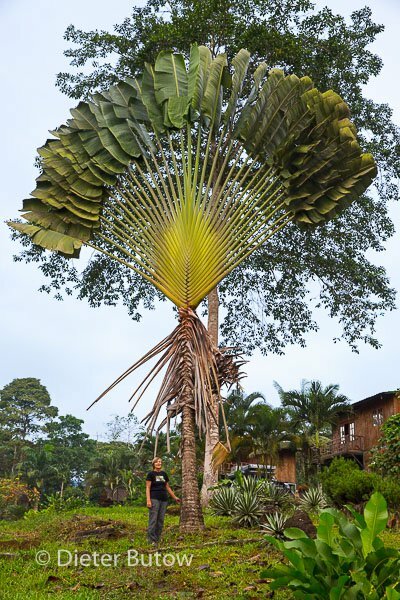 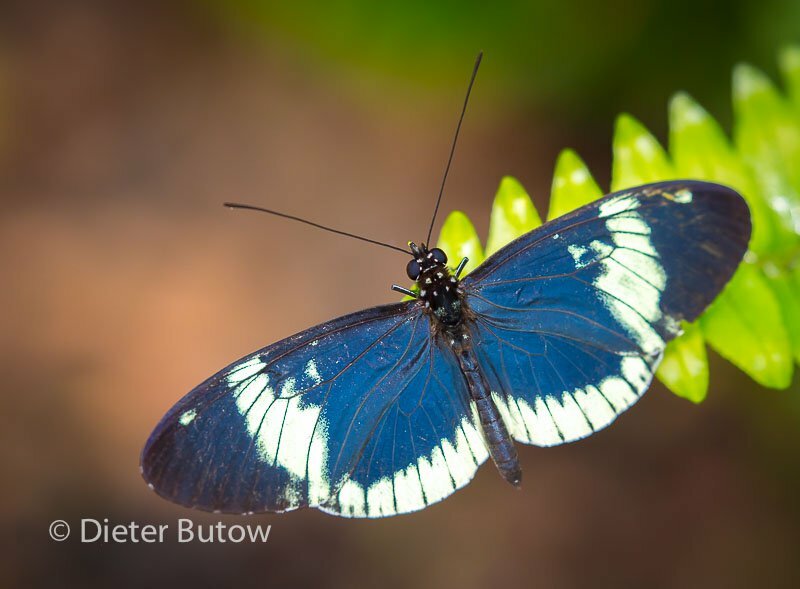 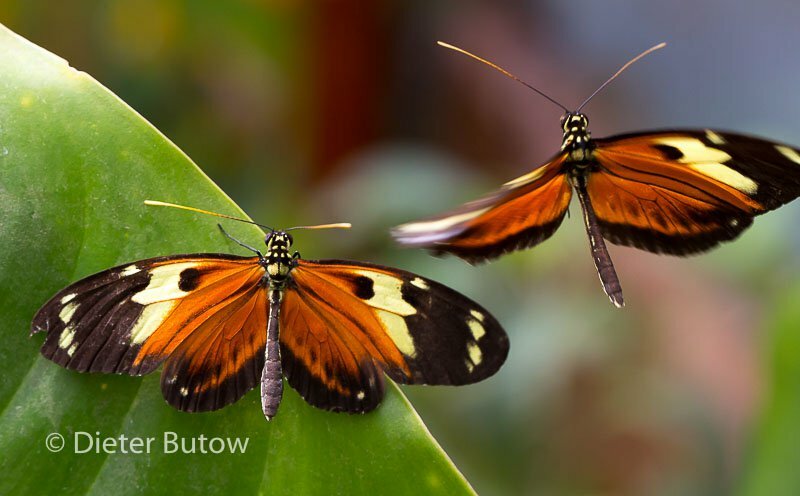 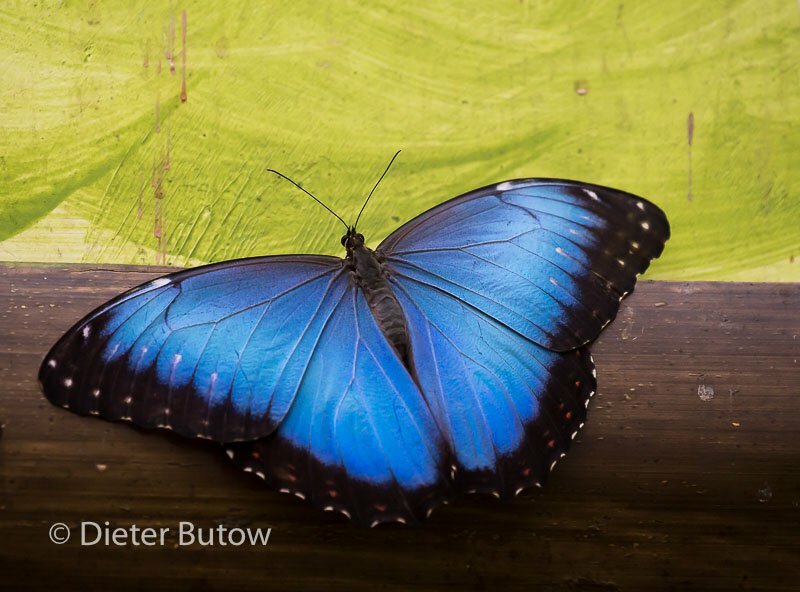 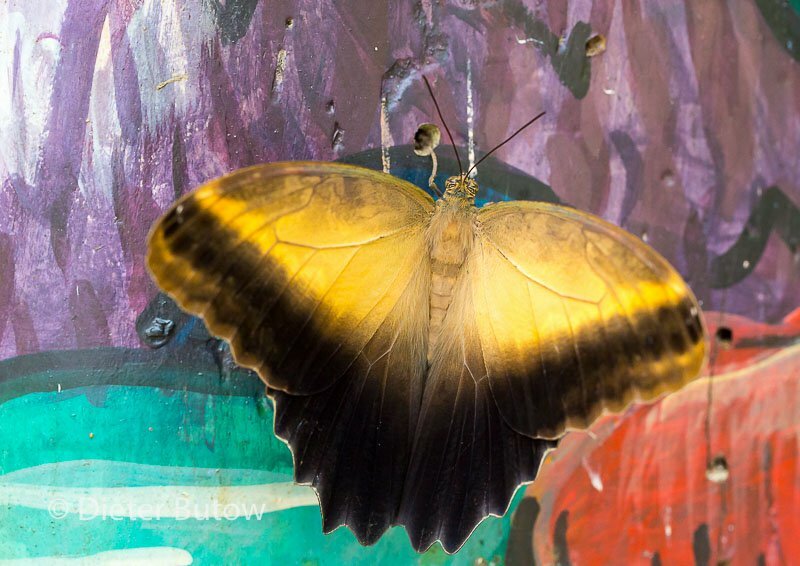 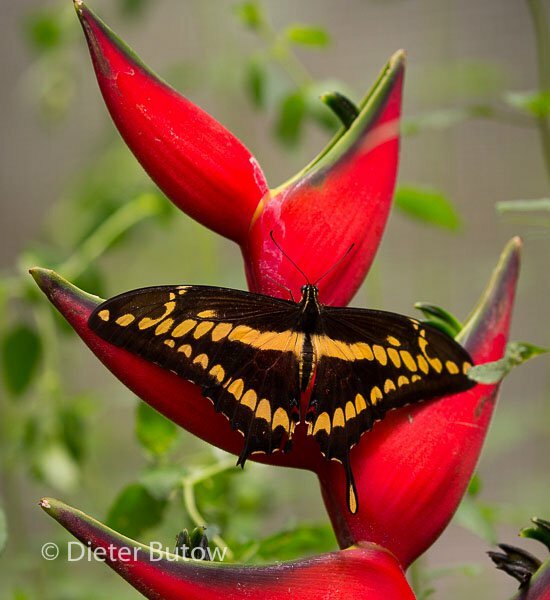 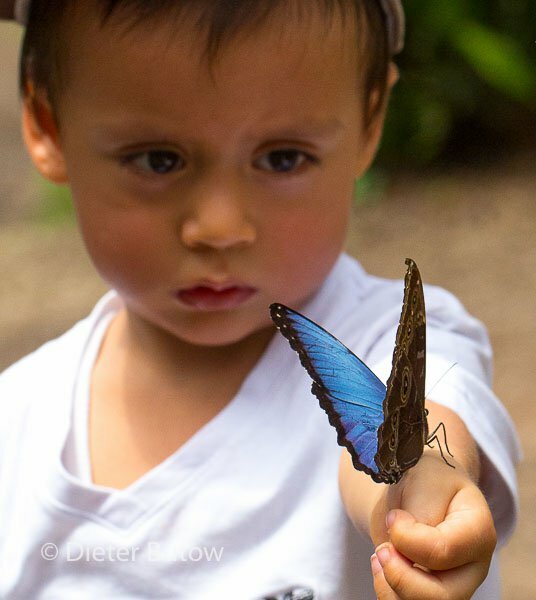 Mindo also offers an excellent opportunity to see many of the butterflies of Ecuador. 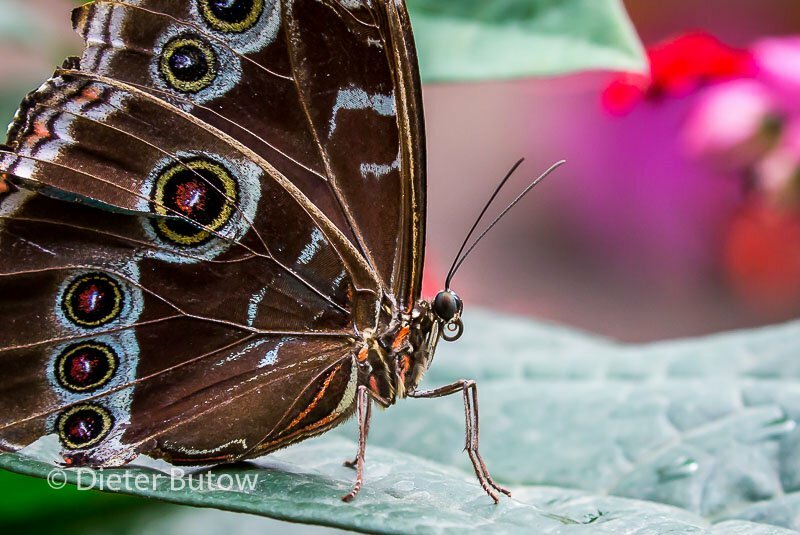 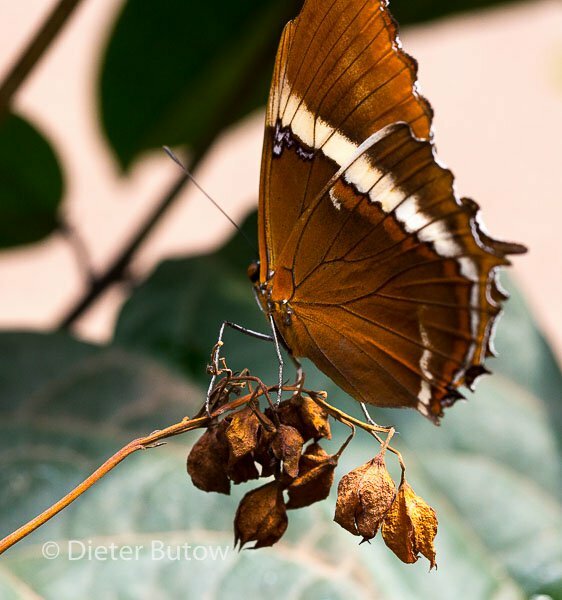 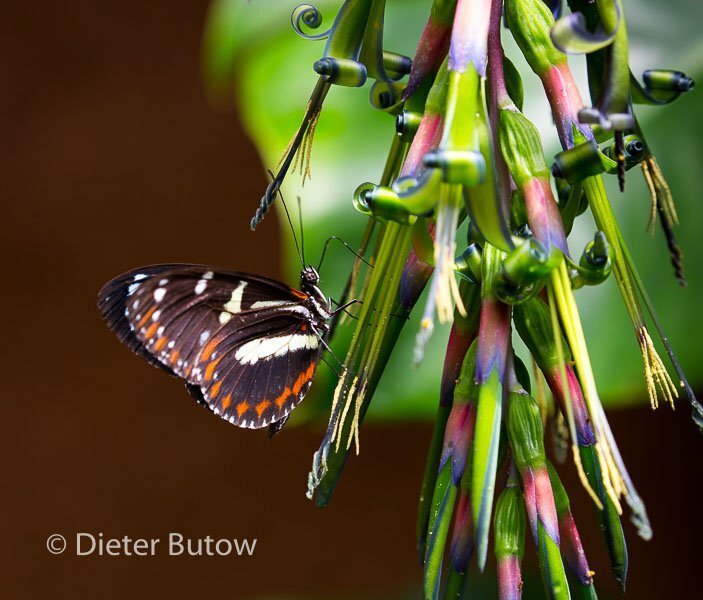 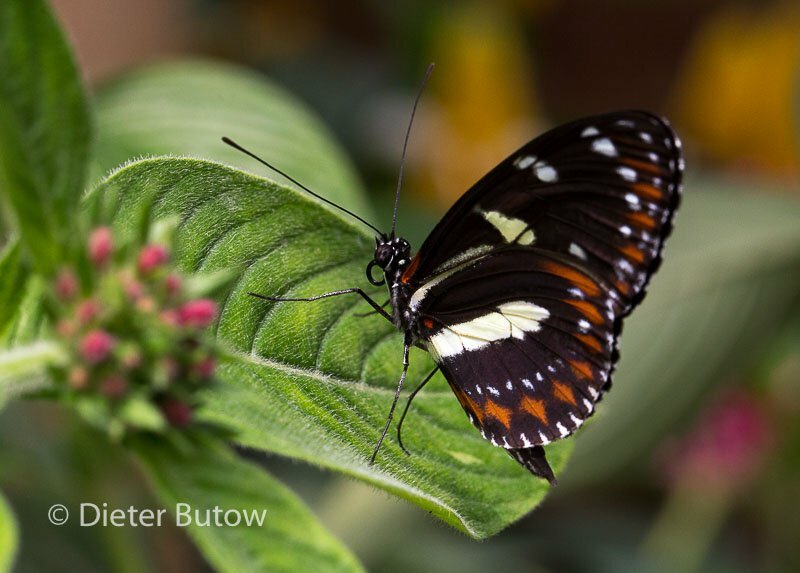 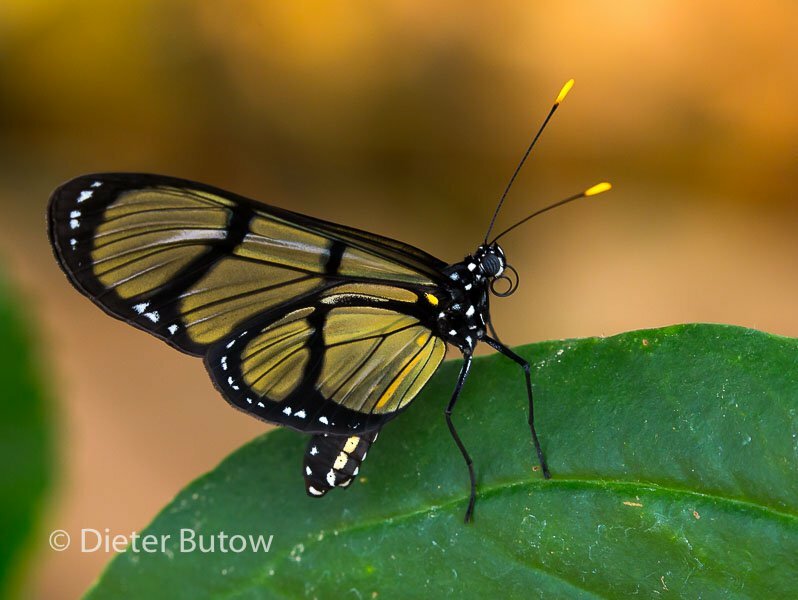 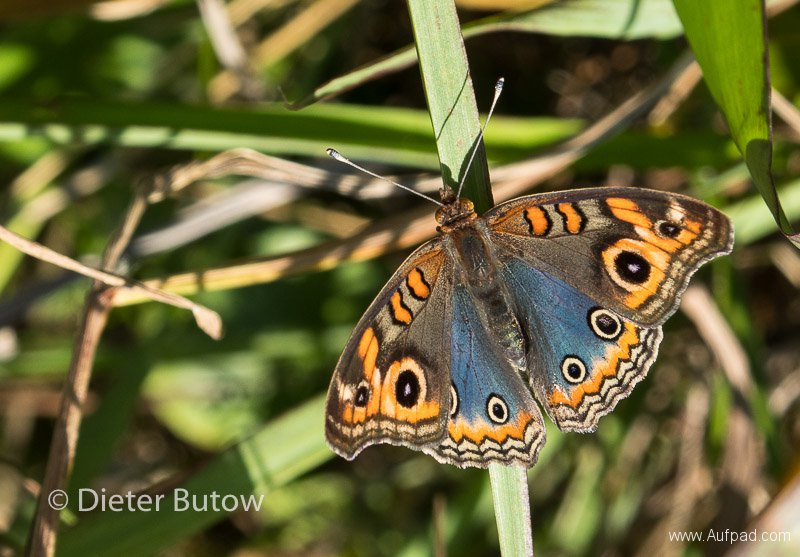 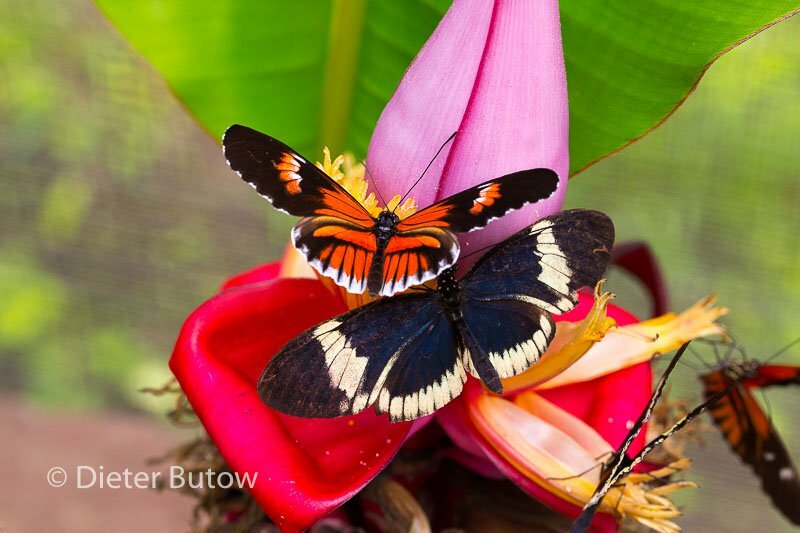 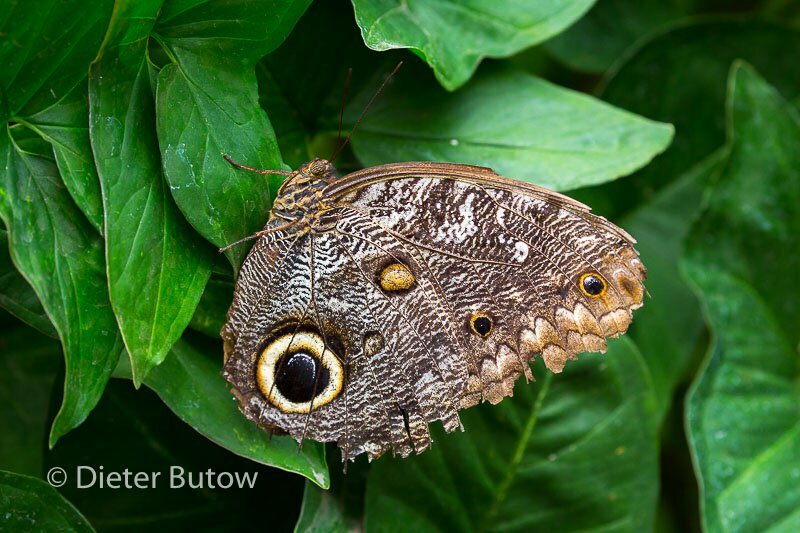 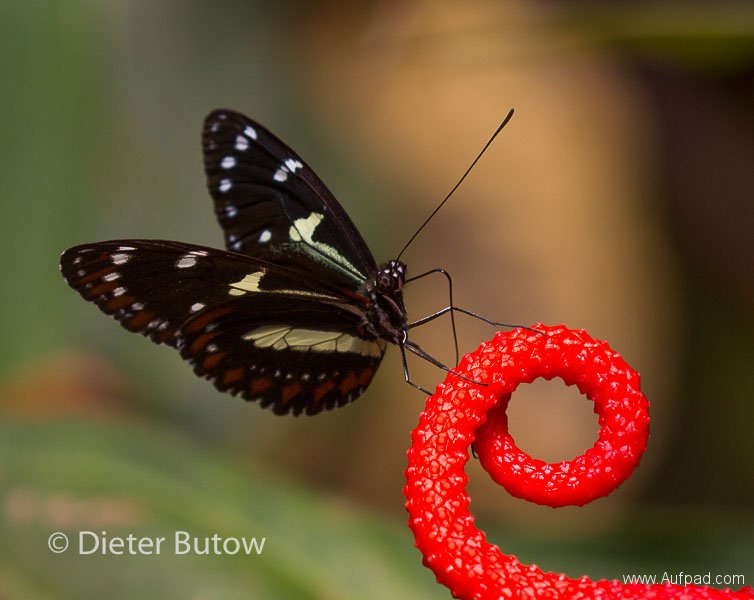 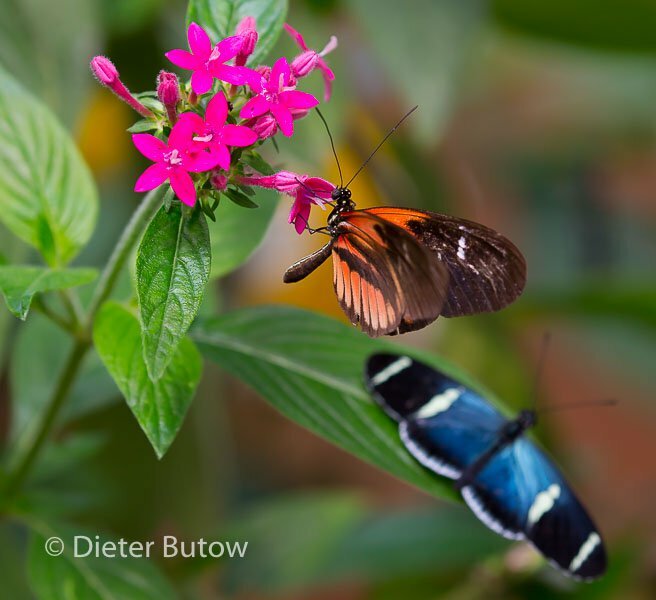 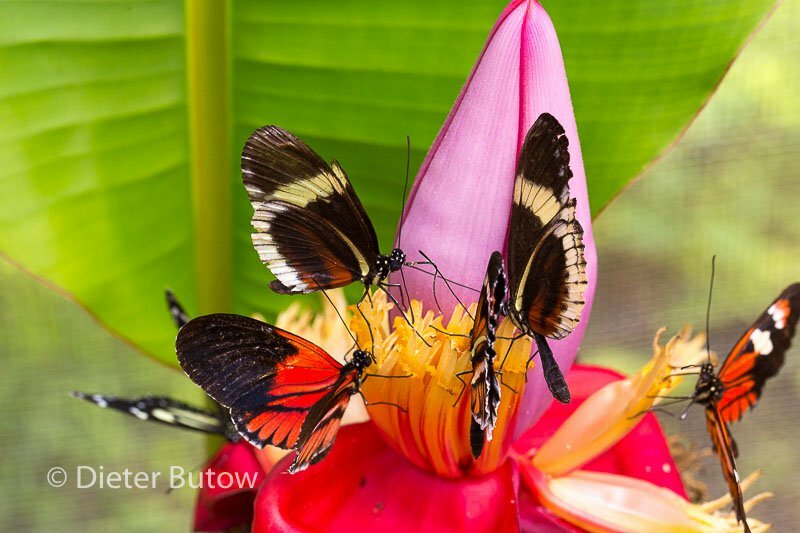 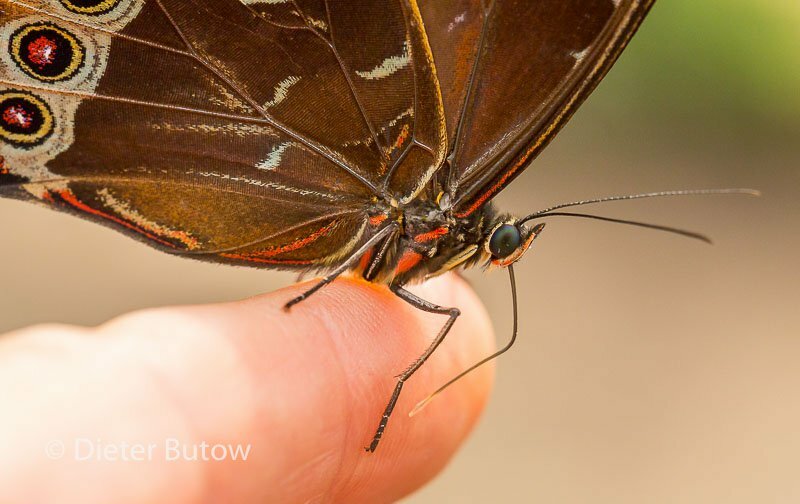 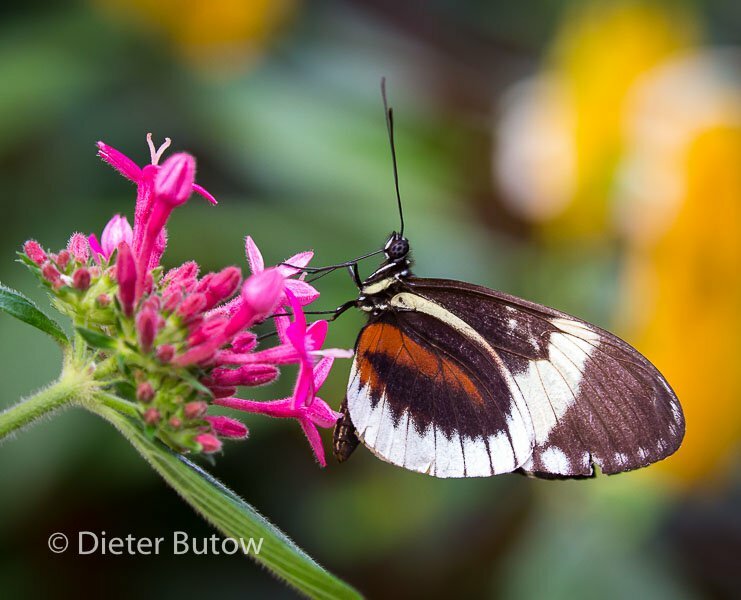 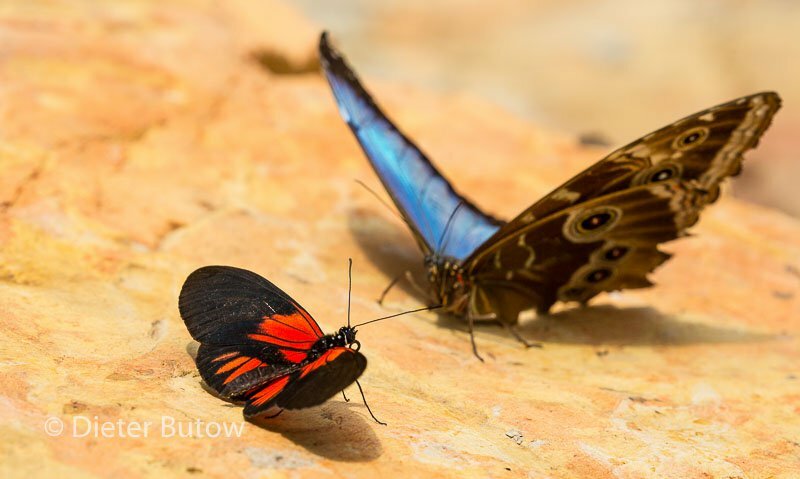 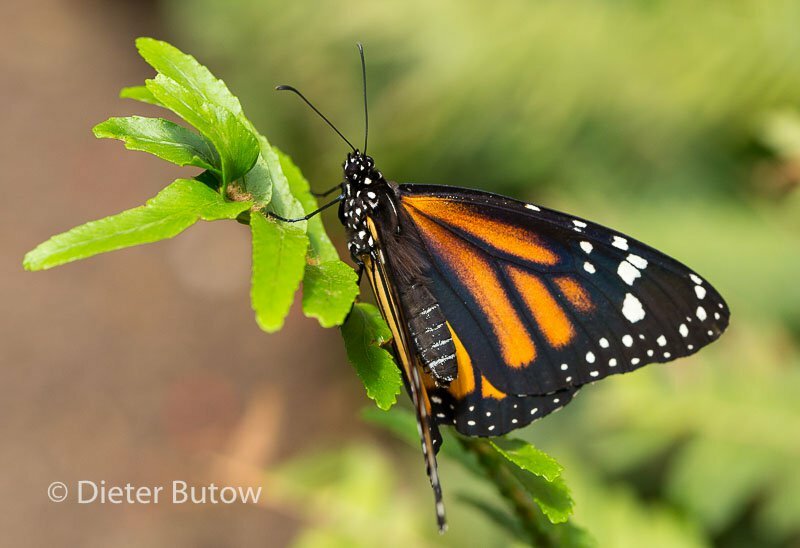 A good place to start is at the local mariposarium (Butterfly Garden). 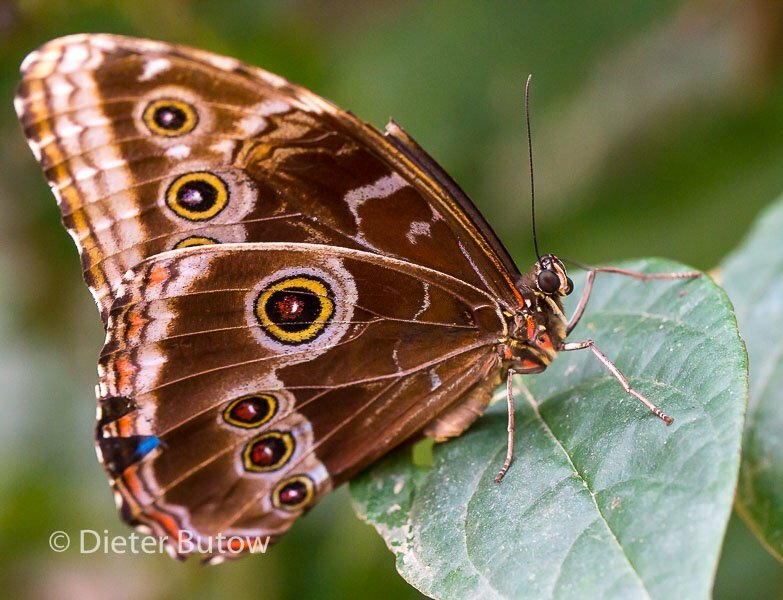 Südamerika’s Schmetterlinge sind prachtvoll. 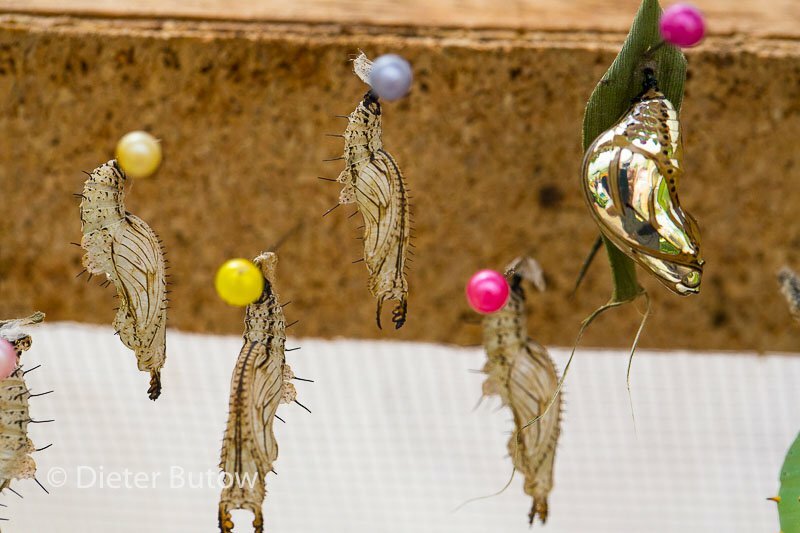 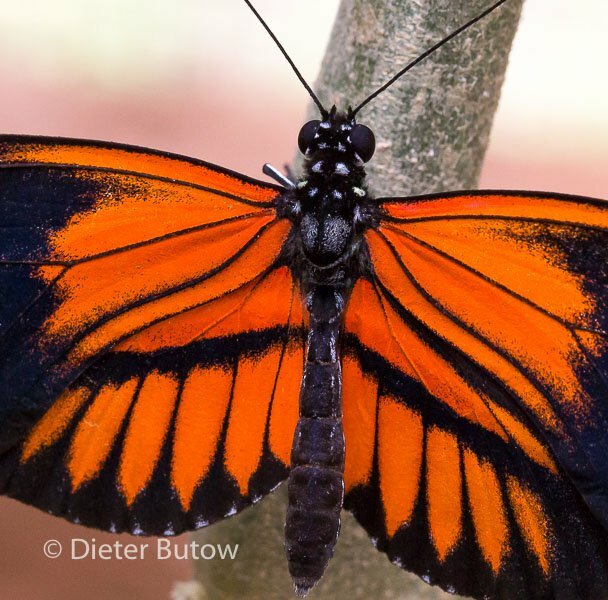 Mindo bietet dafür eine gute Gelegenheit im Schmetterlingspark, welcher etwa 2km ausserhalb des Dorfes liegt und auch per Fuss zu erreichen ist. 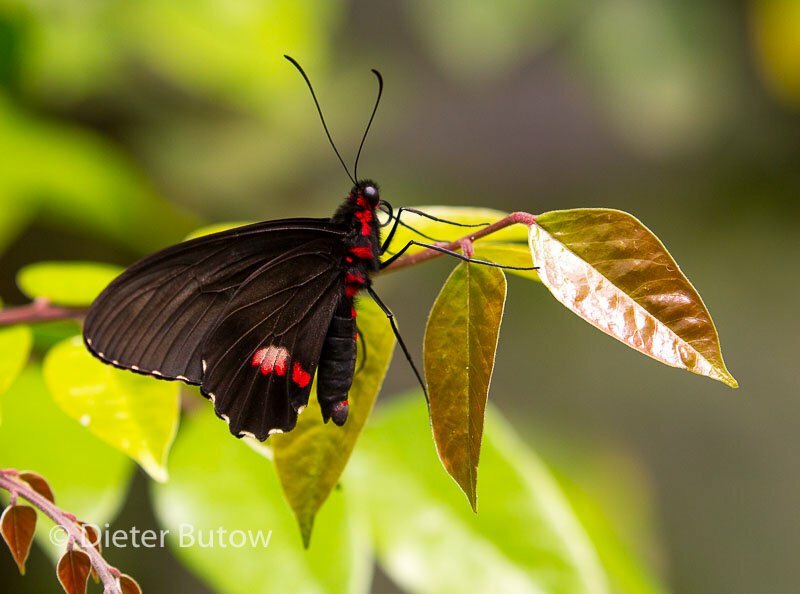 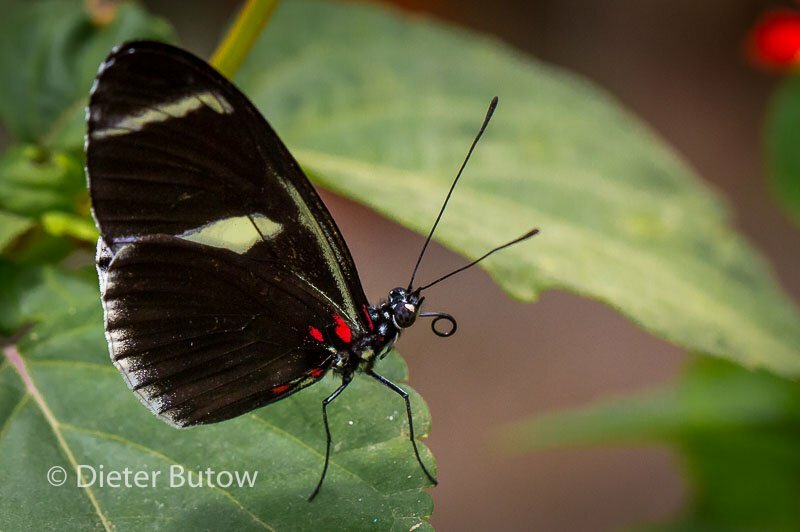 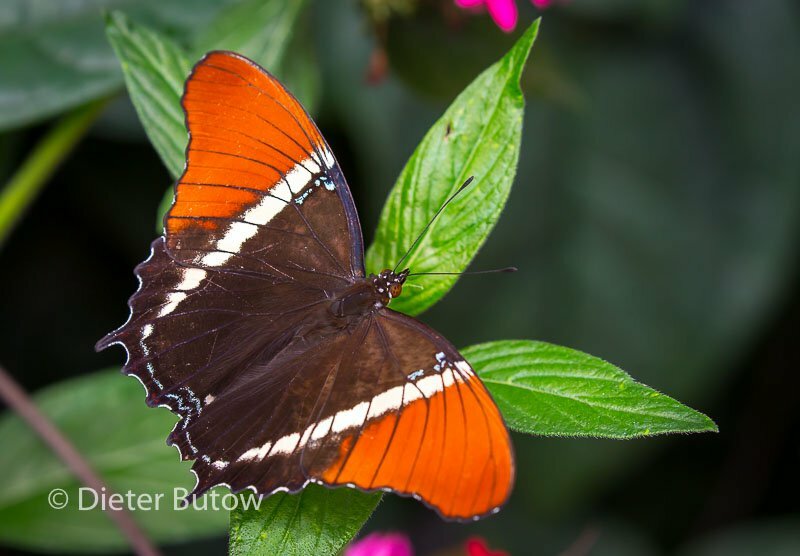 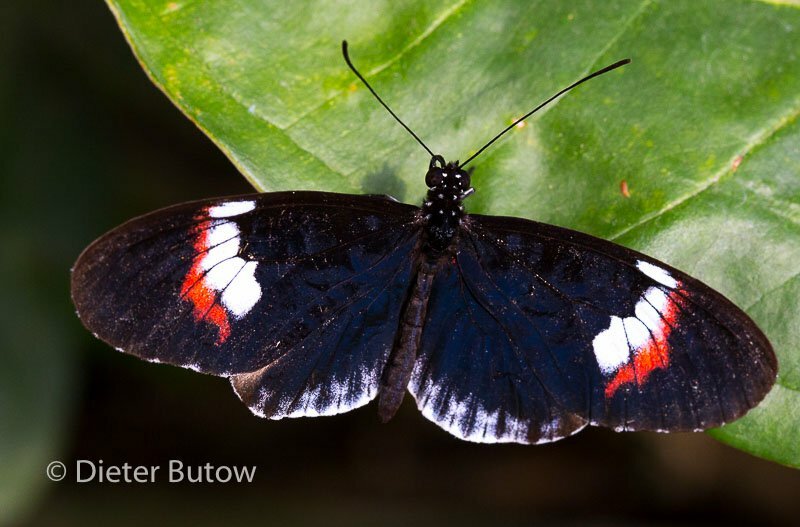 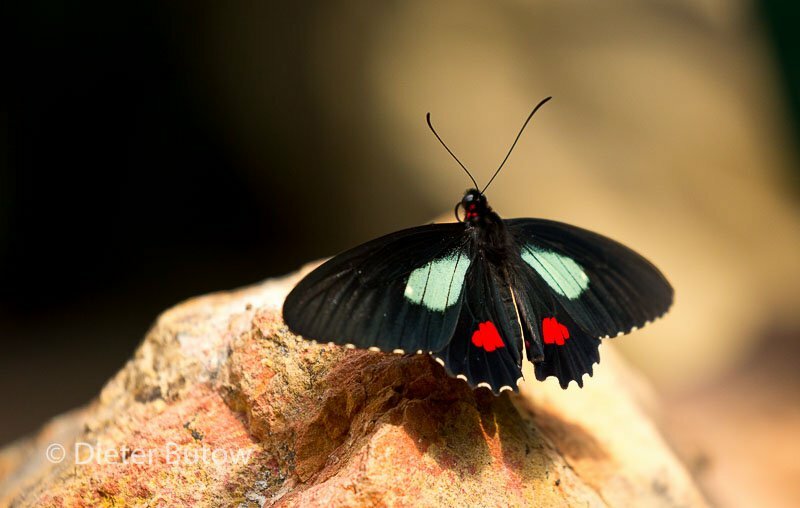 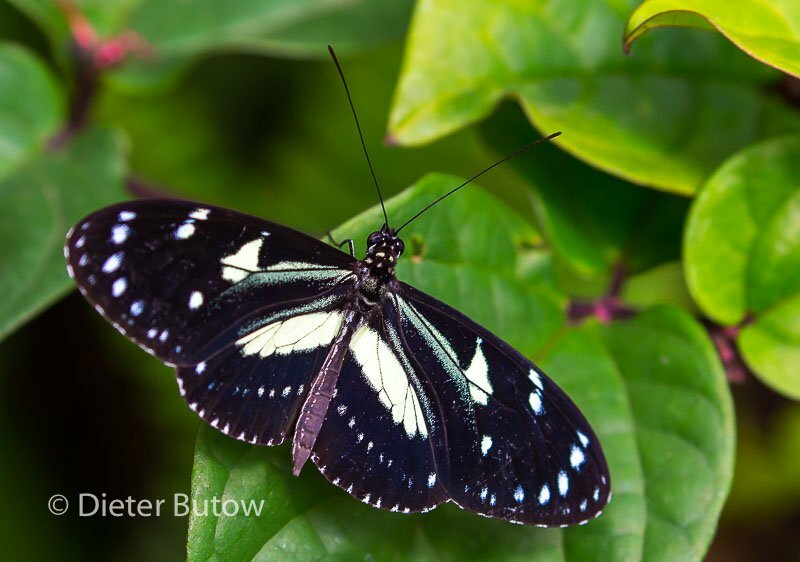 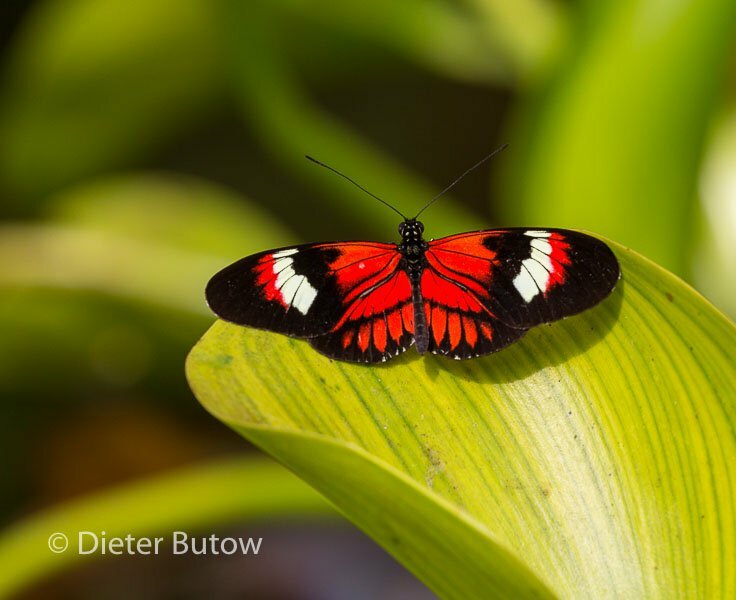 At the butterfly sanctuary we saw, amongst others,Papilio thoas, Owl butterflies on a tree trunk, Morpho elenor,Celtinas with their transparent wings,the red and black Heliconius melpomene toma. 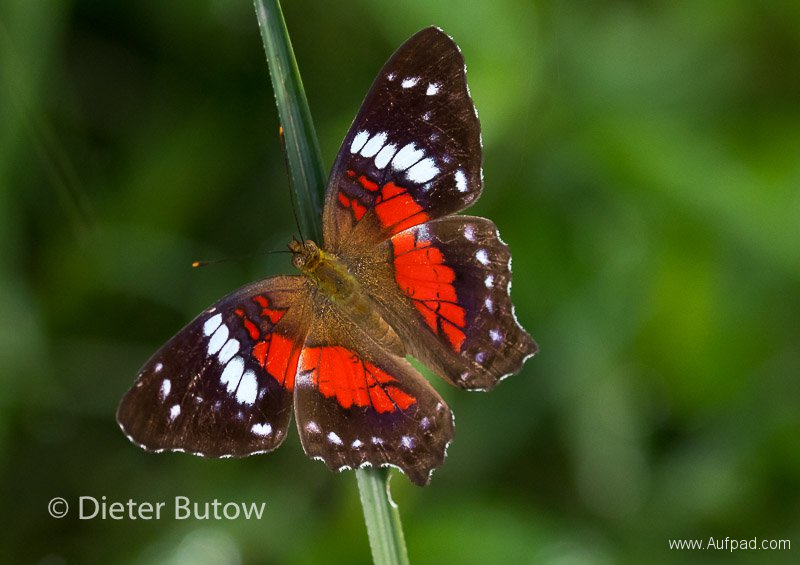 Following our visit to the butterfly sanctuary, we departed and drove from Mindo via Santo Domingo de los Colorados to Quevedo, where we found a parking spot inside the security area of Hotel Presidente owned and run by Señor Wellington and his wife Sunet. 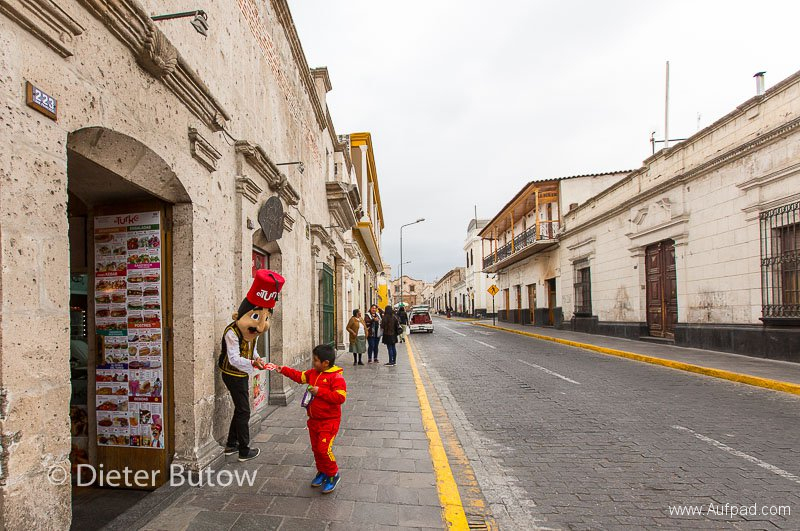 Pictures on the wall testified of better times when even presidents of Ecuador stayed over here. 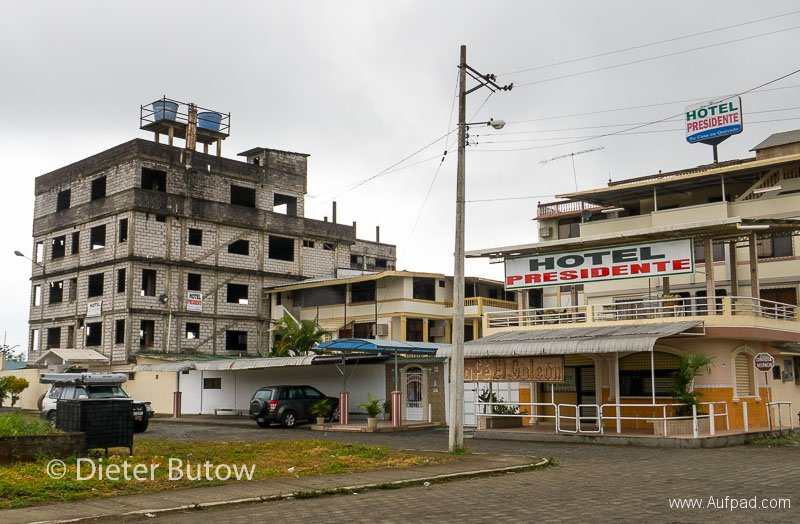 Today it is no longer in the class for presidents, but we were happy to camp in the yard and use a room’s bathroom, all for US$8 for the night. 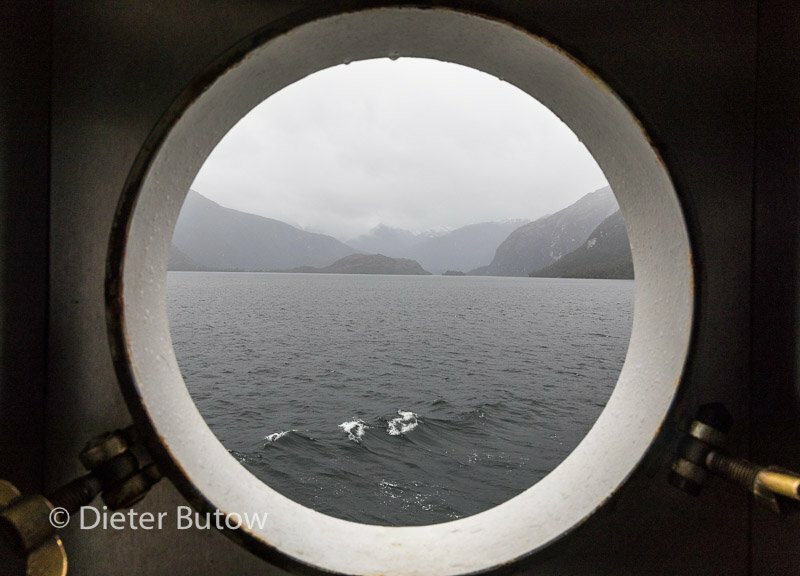 It was quiet and safe. 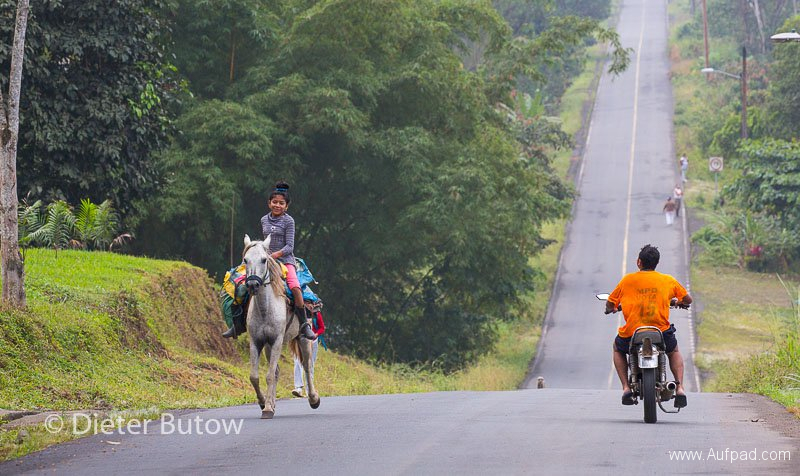 Next day we travelled from Quevedo to Babahoyo, then on to Milagro (past Guayaquil). 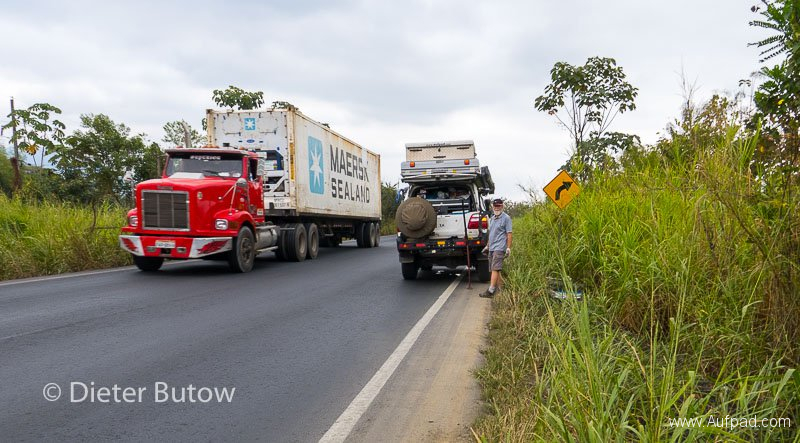 On the way on a very busy single lane road a rear tyre burst and we were somewhat nervous while changing the wheel due to the traffic of heavy vehicles. 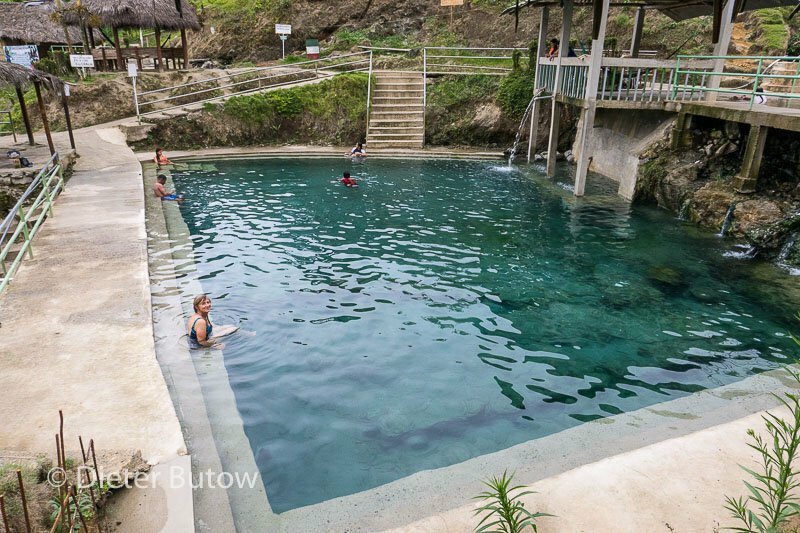 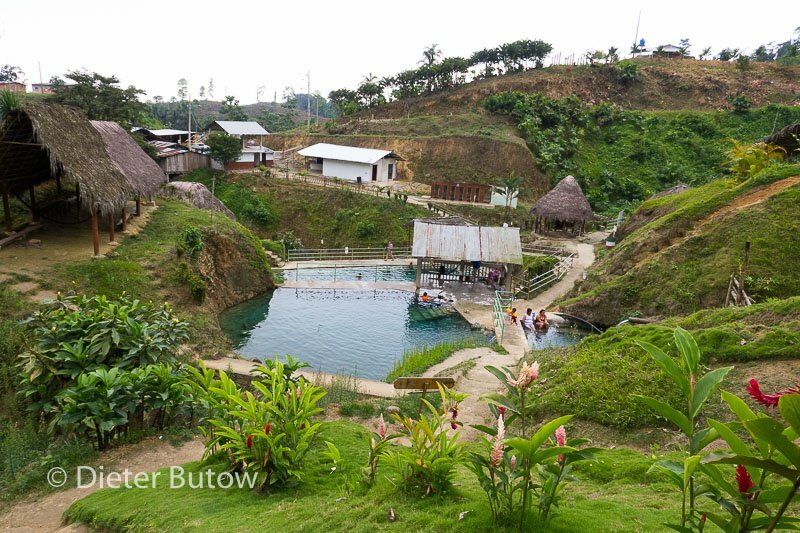 Our next stop was past Naranjal where we camped at Kaluz Hosteria and Spa with the hot Balneario de Aguas Termales in walking distance, which were run by the local Shuar people in the village. 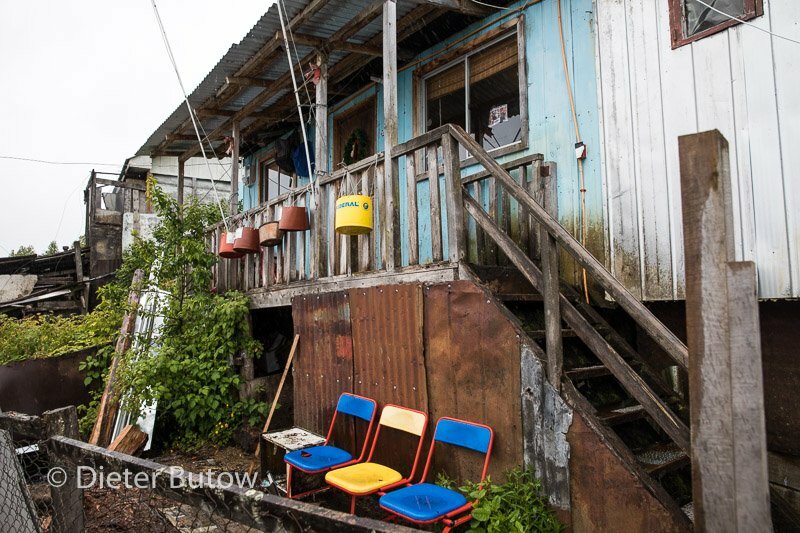 Breakfast was included in the tariff at Kaluz and we were permitted to use the clean bathroom of a vacant cabaña. 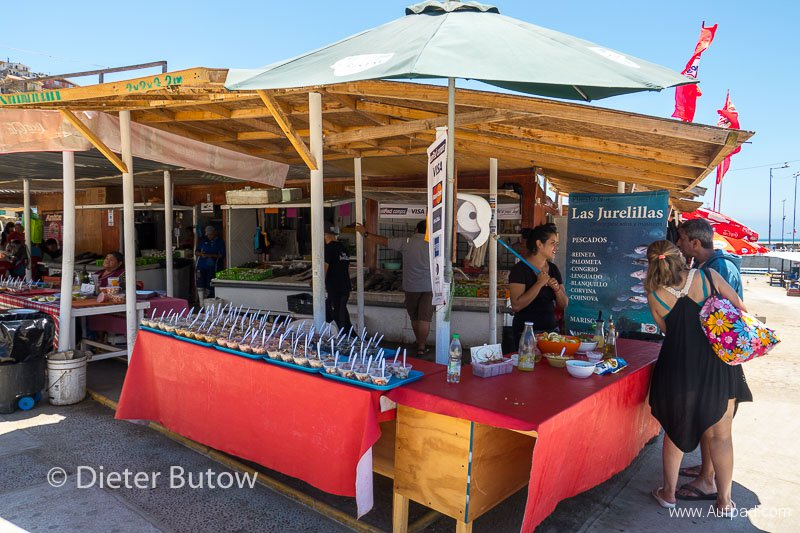 The breakfast consisted of a piece of indescript queso (cheese) and deep-fried platanas, a bland and fairly tasteless banana – not quite what we would normally have ordered if there had been a choice. 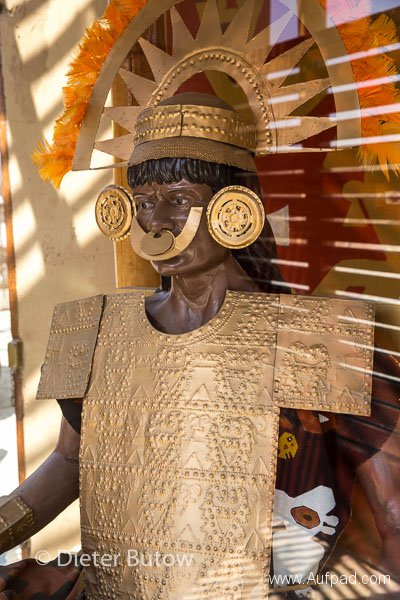 The Shuar are part of the Jivaro tribe, known for the shrunken head trophies which were only outlawed in modern times by the Ecuadorian and Peruvian governments. 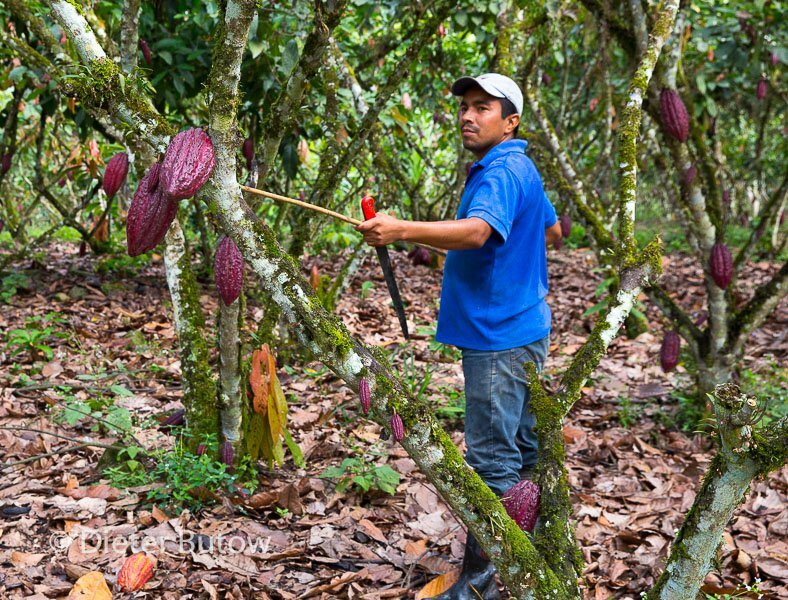 From Kaluz camp our route took us back to the trunk road and on the way we spoke to Shuar farmers harvesting the large red cacao fruits. 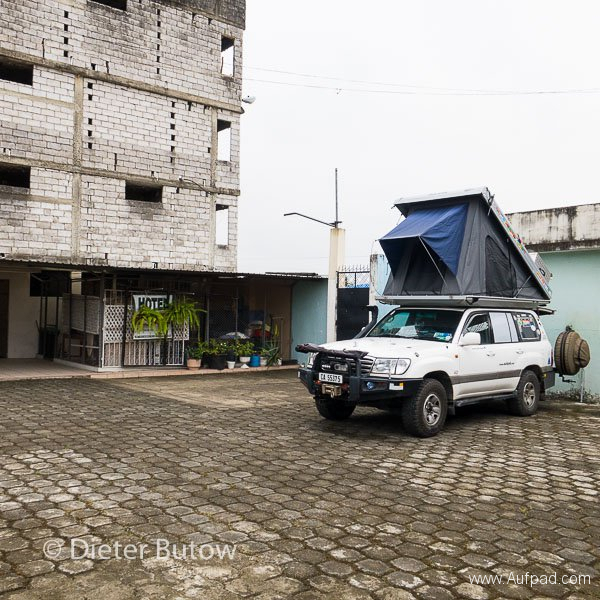 Then on to Santa Rosa, from there to Arenillas and ultimately to the border at Huaquillas from where we aimed to get to Zorritos in Peru for the night, knowing that a pleasant campsite awaited us. Border formalities were without any hitches although it took approximately 2 hours.